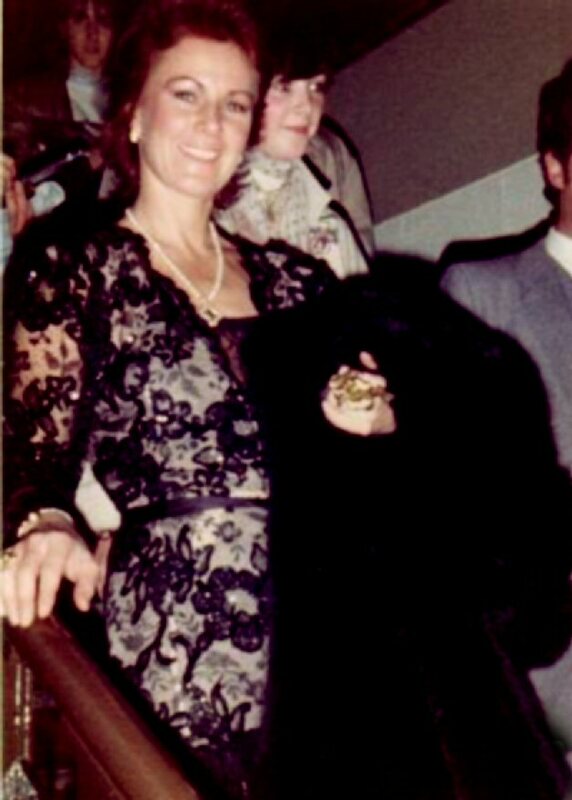 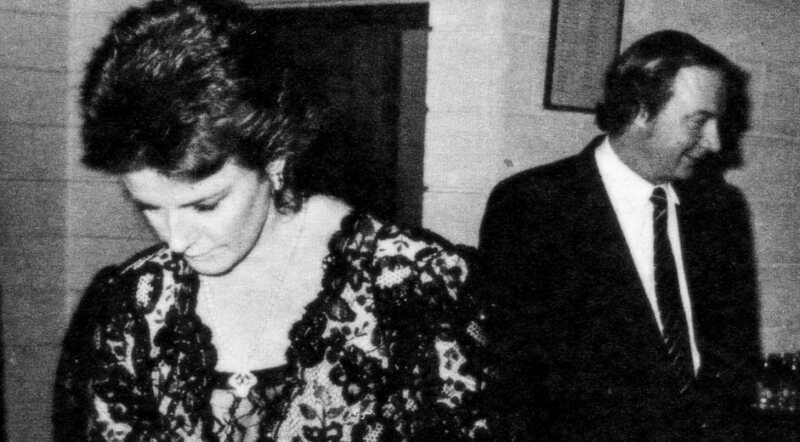 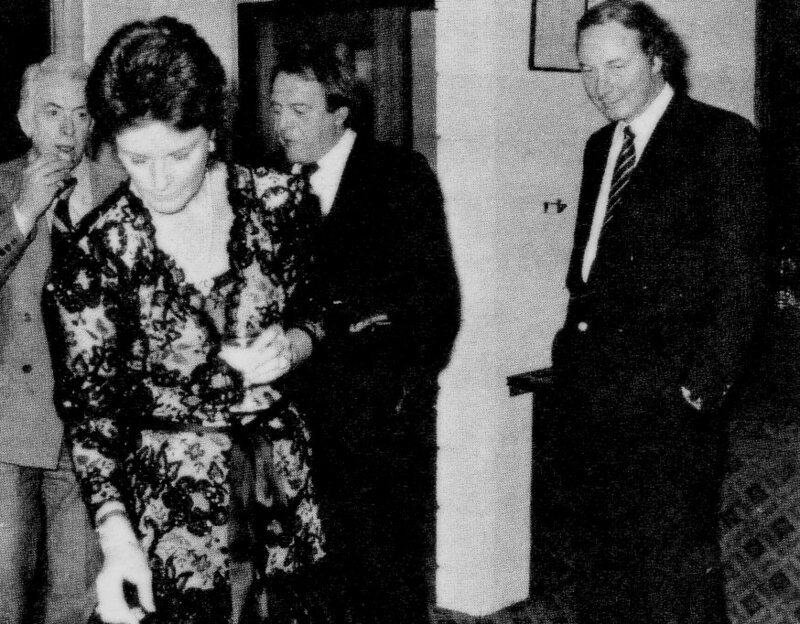 The 40-years party at the Grand Hotel in Saltsjöbaden on January 9th, 1982. 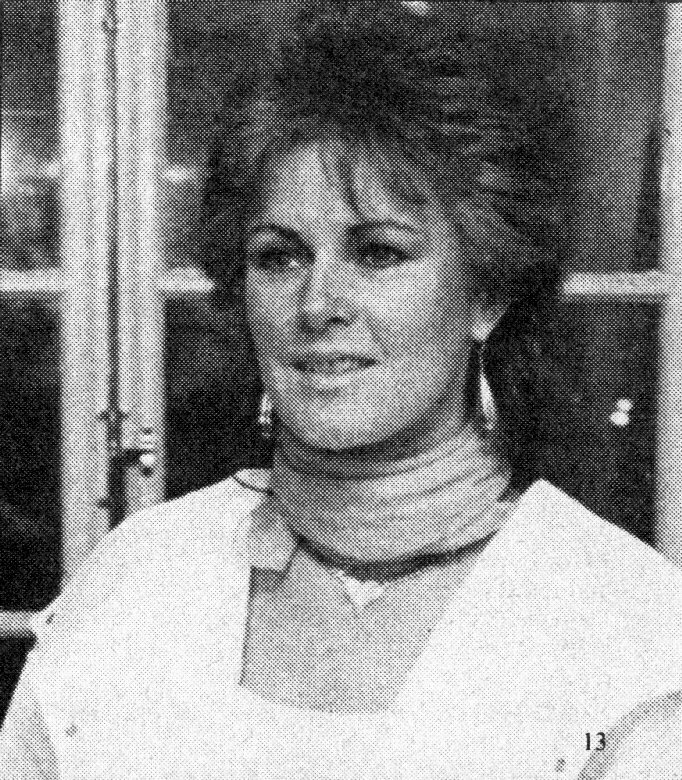 Frida could be seen at the party together with Teddie af Burén. 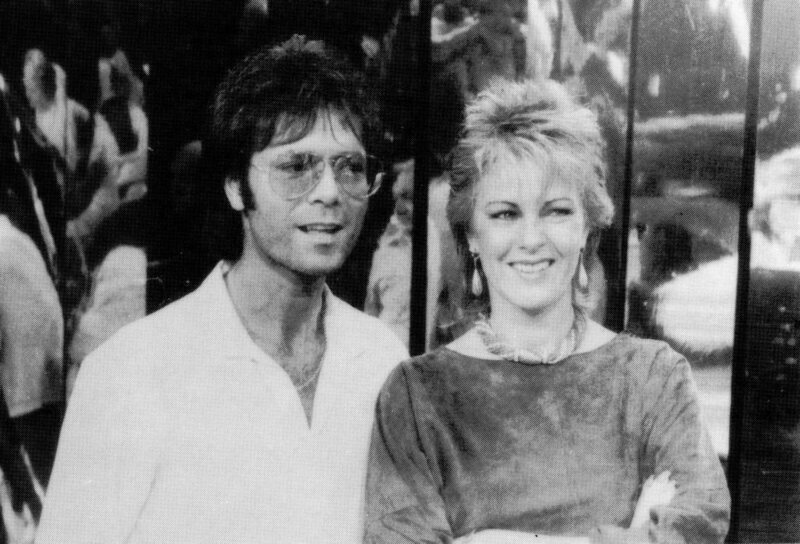 The press started of course speculations about a possible romance. 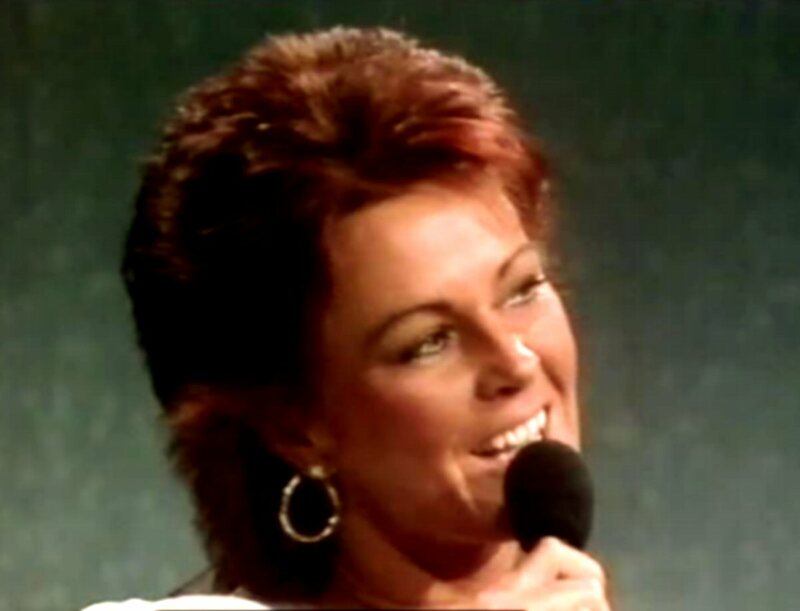 Those rumours were though contradicted by Annifrid both in the press and on the TV special "Gäster hos Hagge" one year later. 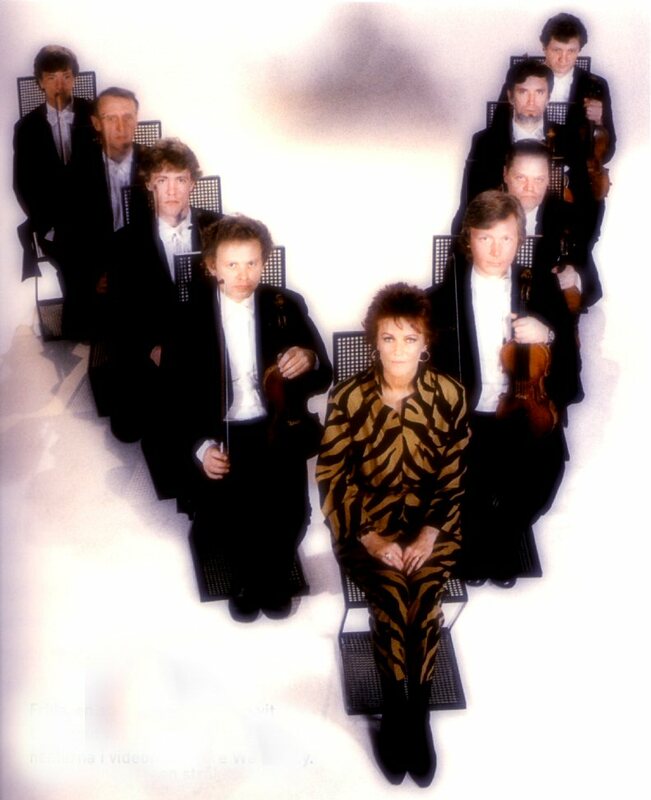 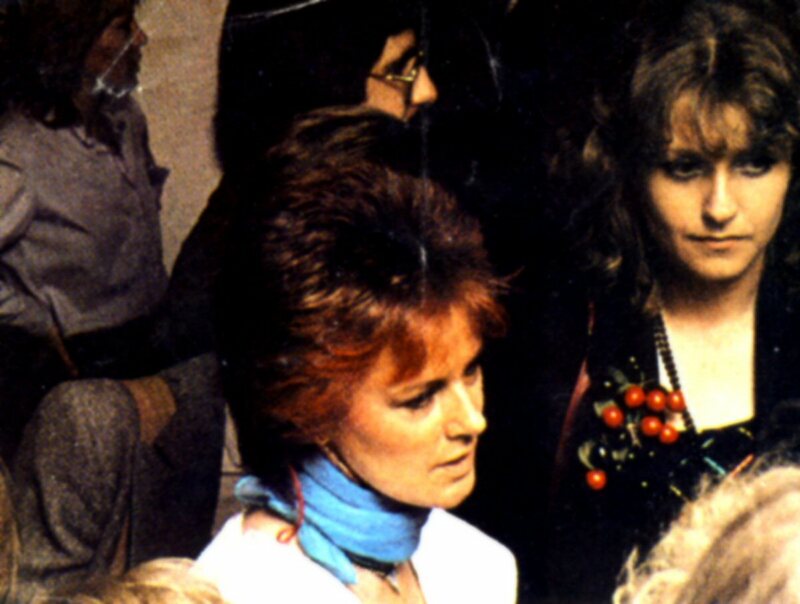 Frida attended Electric Light Orchester's concert in Stockholm on February 6th, 1982 at the Johanneshovs Isstadion. 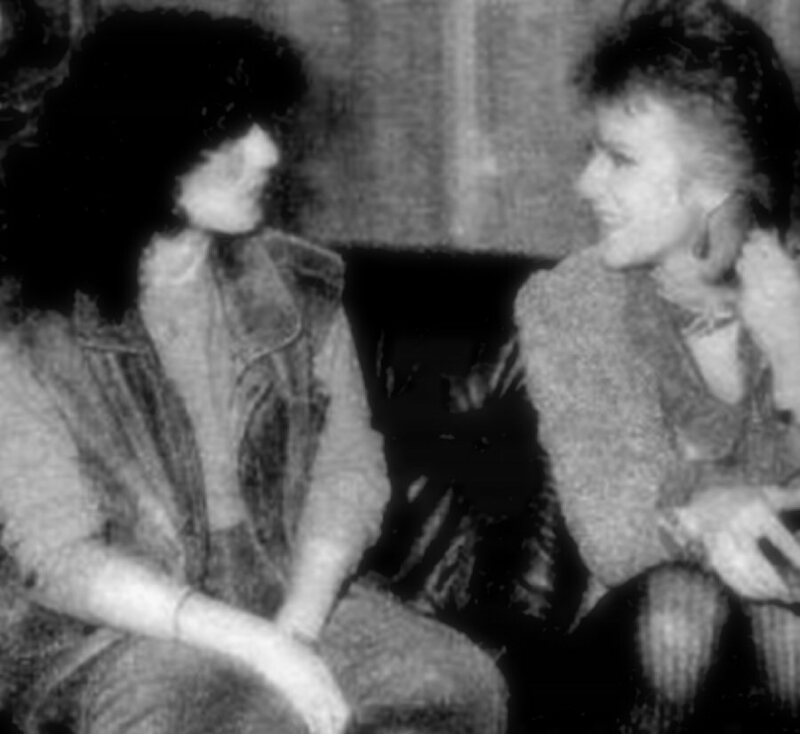 She met ELO's members after the show. 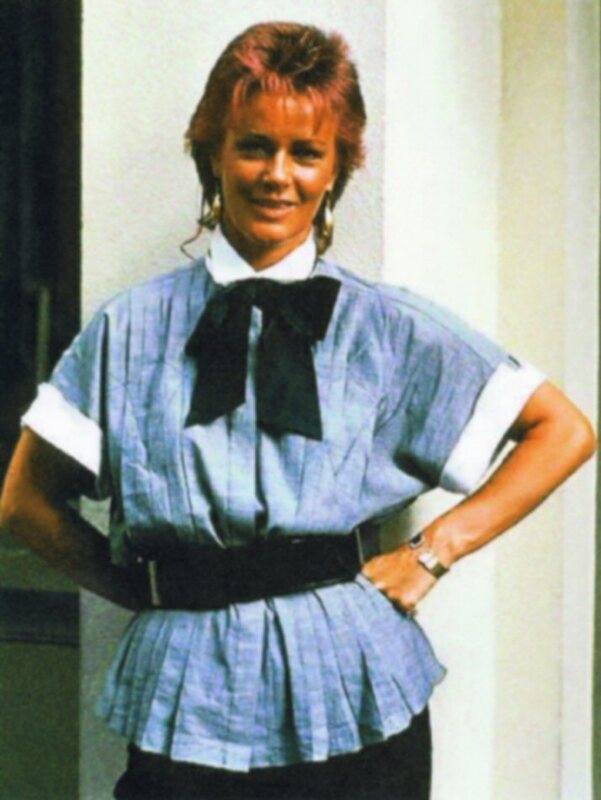 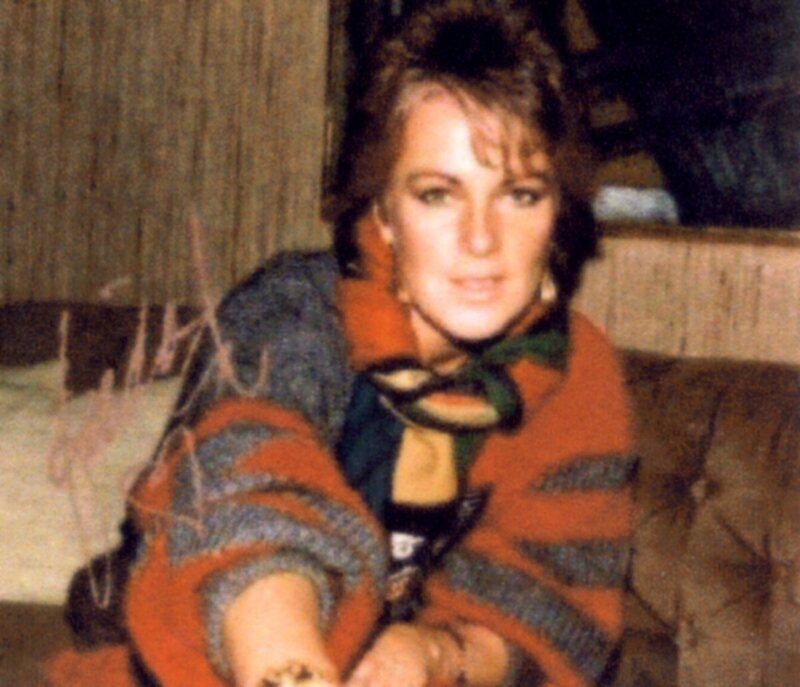 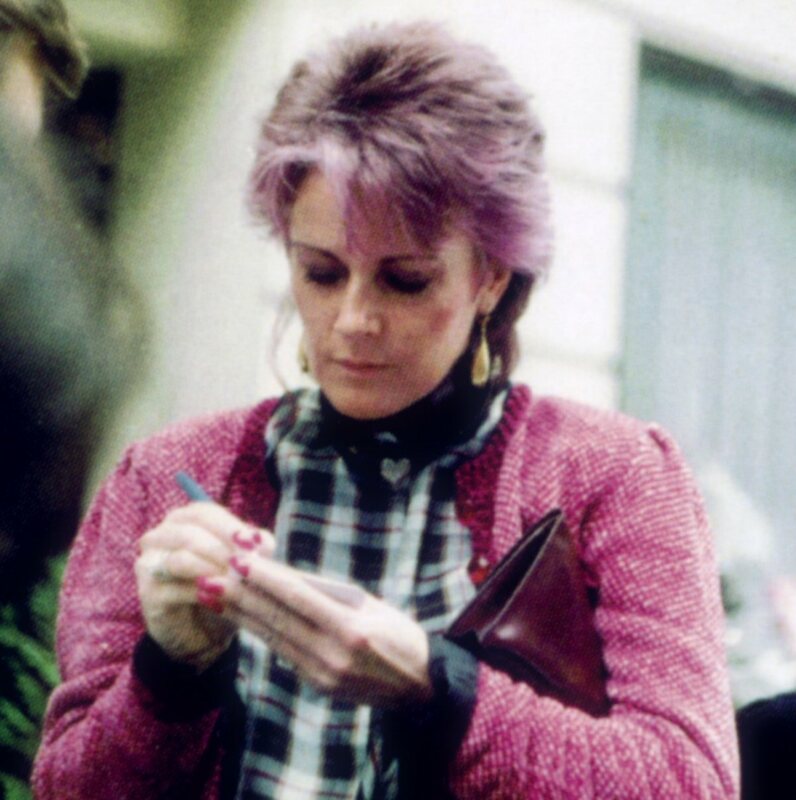 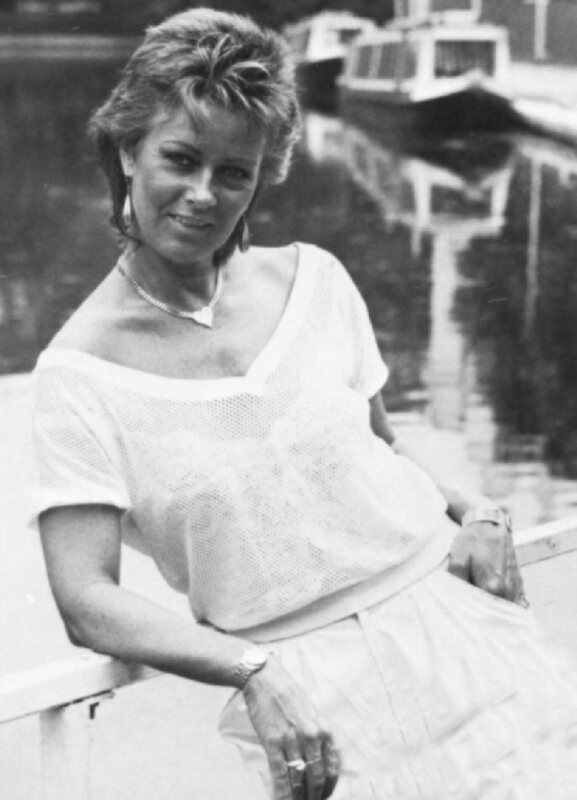 Frida started her "post-ABBA" period already one year before ABBA definitely split up. 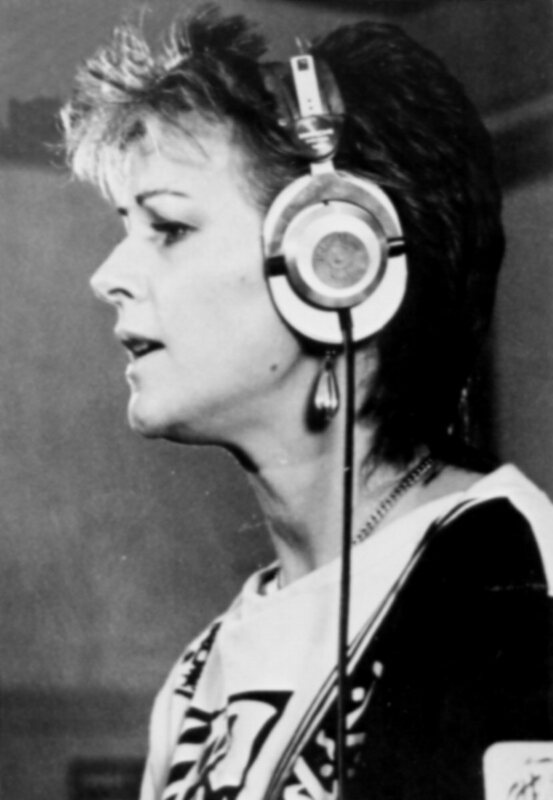 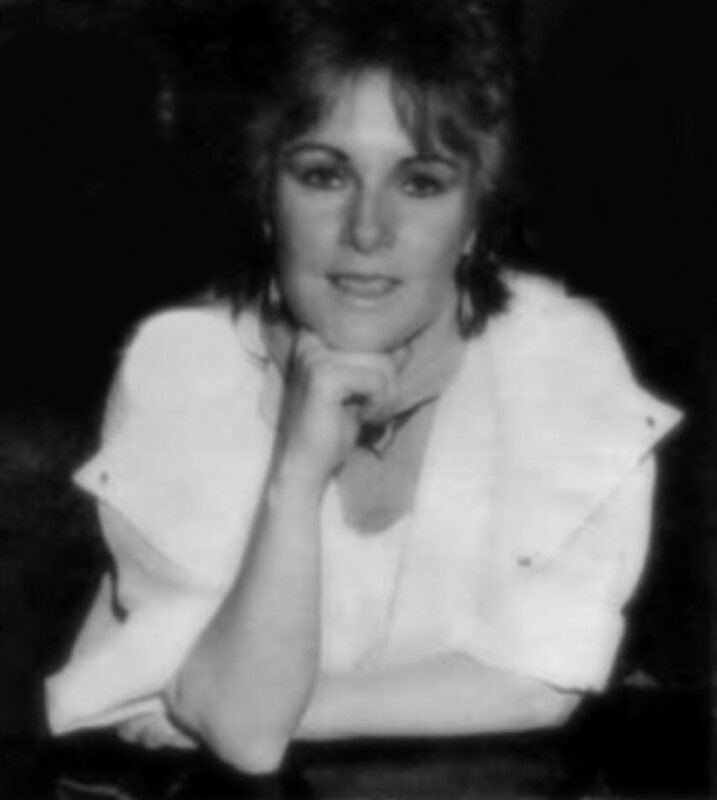 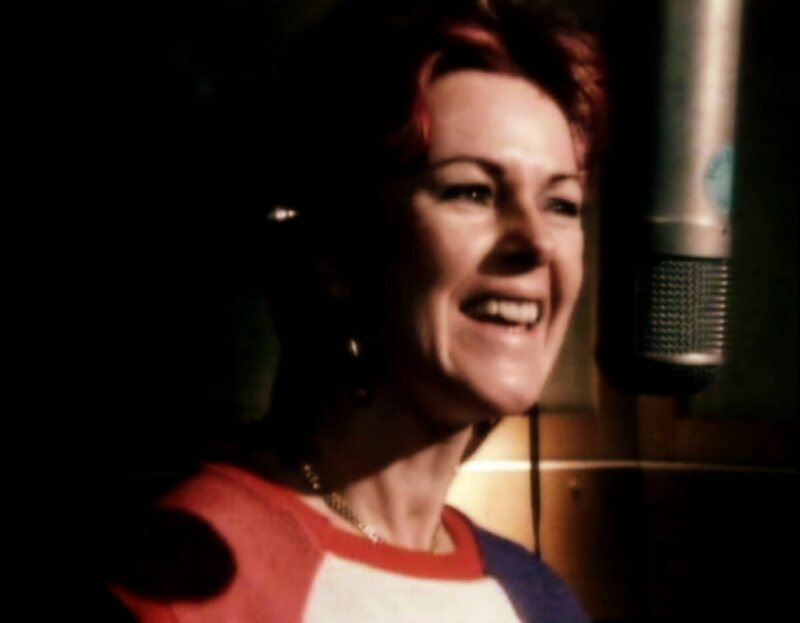 She started to work with her first solo project since the album "Ensam" in 1975, on 15 February 1982. 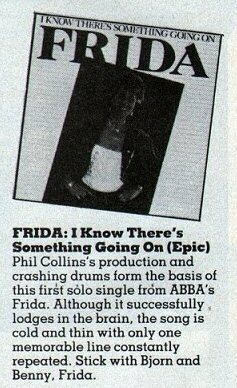 Frida's wish was that Phil Collins would produce the album and she got as she wanted. 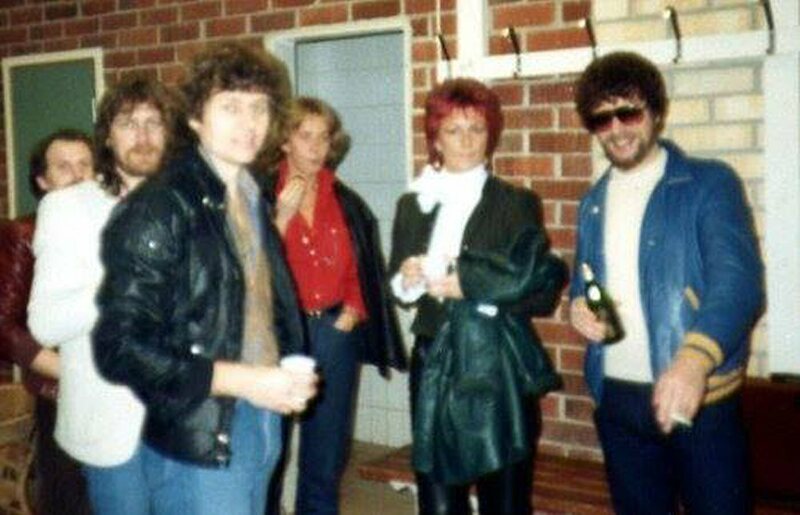 Collins schedule was not so tight by that time and he came to Stockholm together with his musicians. 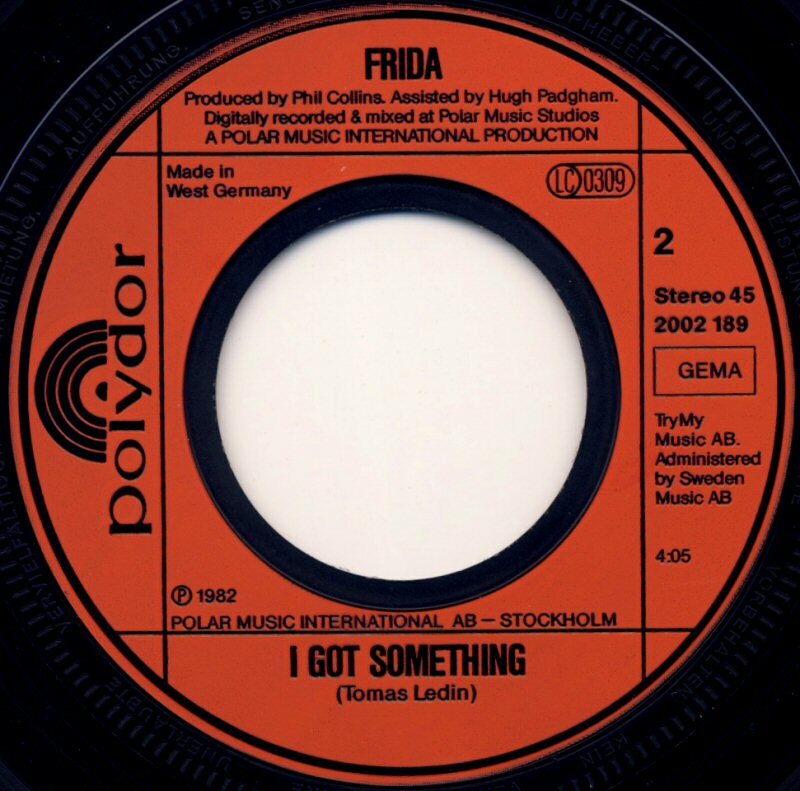 Collins' group Genesis and Lyngstad's group ABBA had not so much in common musically and maybe that's why Frida chose Collins as a producer. 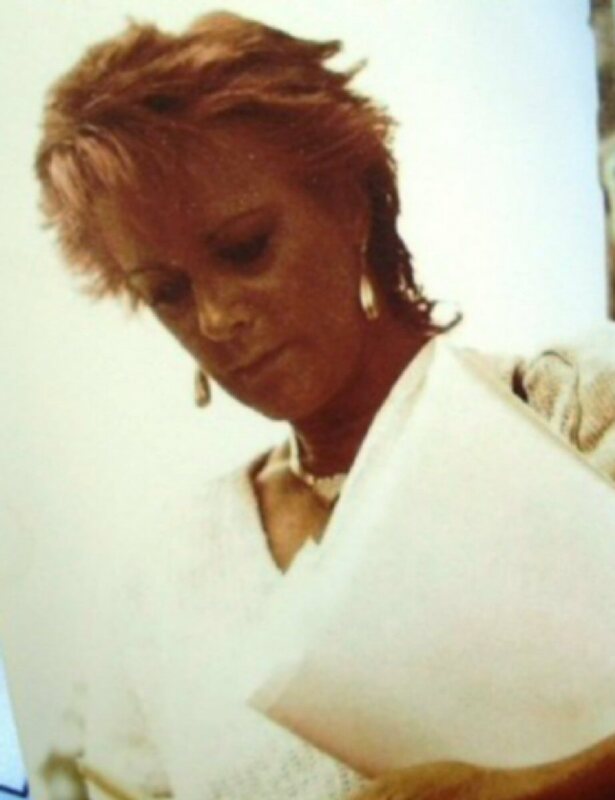 She wanted to do something new and completely different. 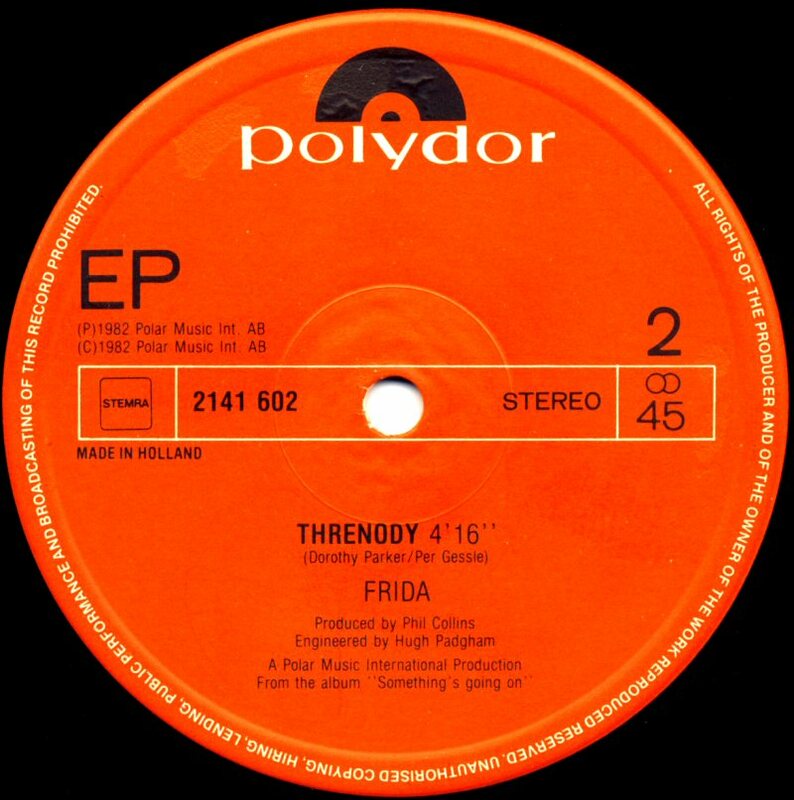 Frida had chosen 11 songs for her new album. 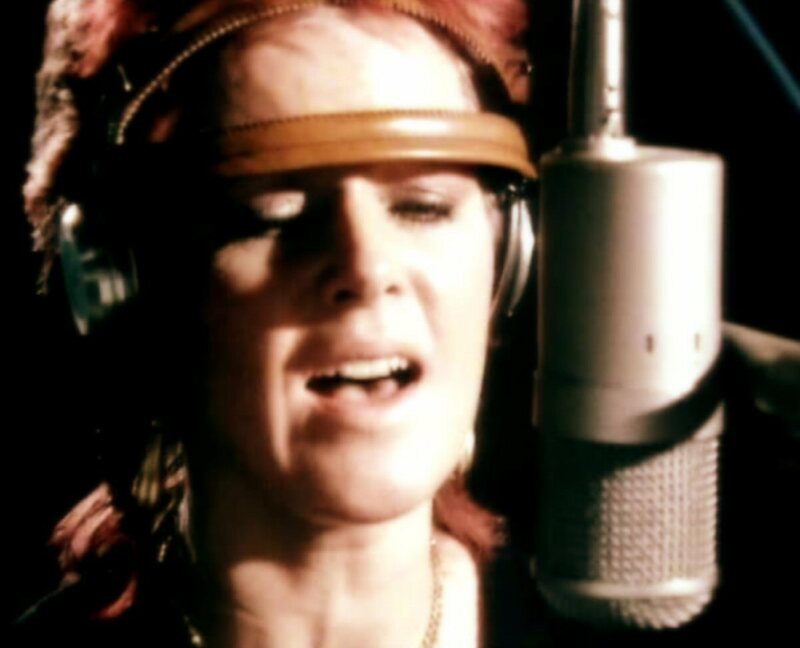 They were written by well-known international composers as Stephen Bishop, Bryan Ferry, Phil Collins as well as her Swedish friends: Tomas Ledin and Per Gessle (of Roxette). 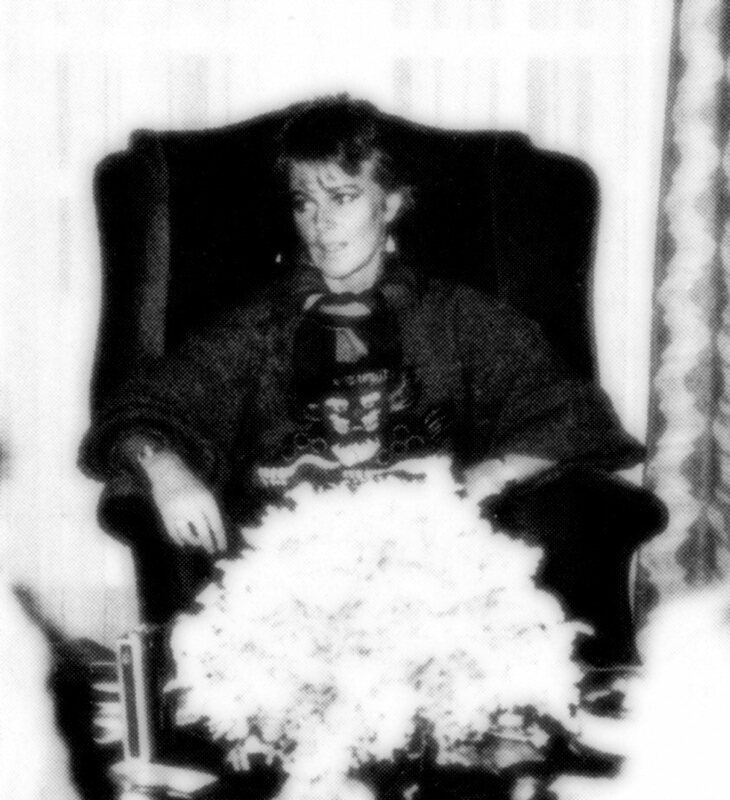 The official press conference was held in Stockholm on 29 March 1982. 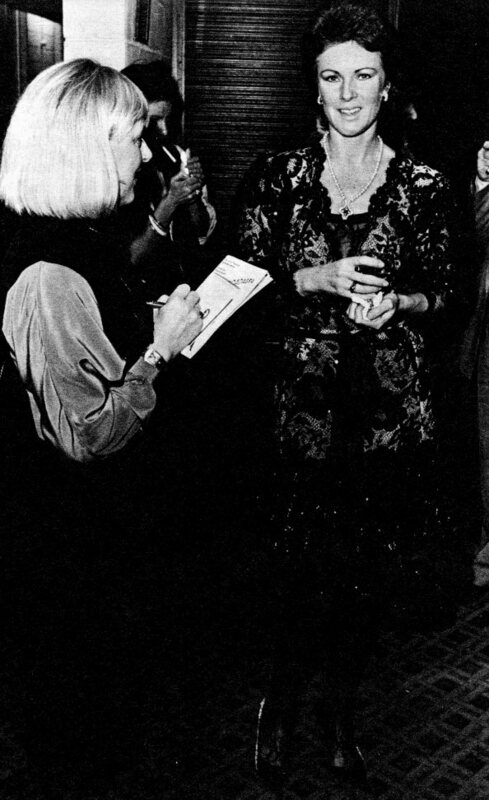 At the beginning of April 1982 Sammy Davis had a concert at Börsen in Stockholm. 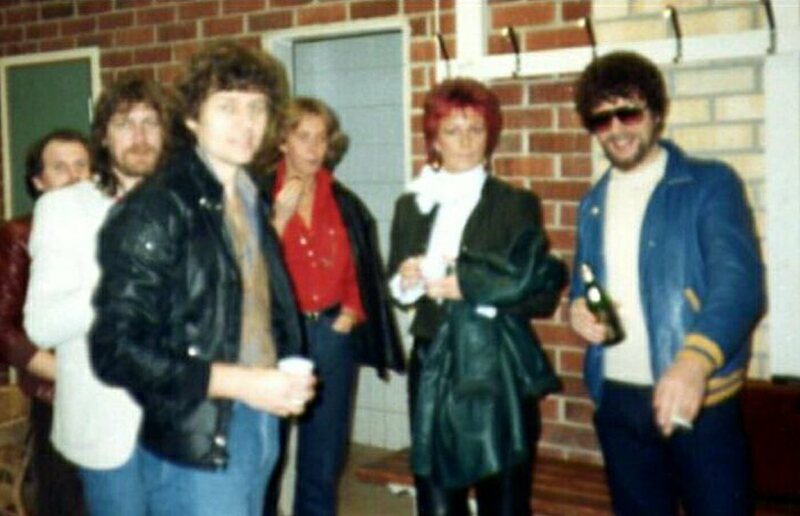 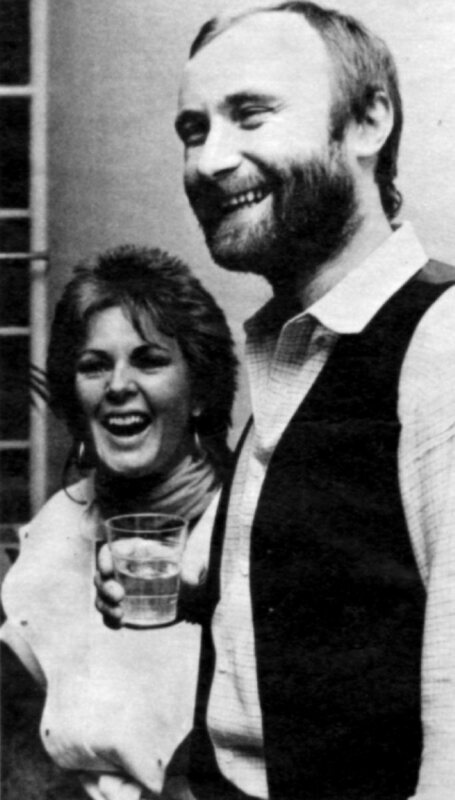 Frida attended the concert together with ABBA tour manager Thomas Johansson. 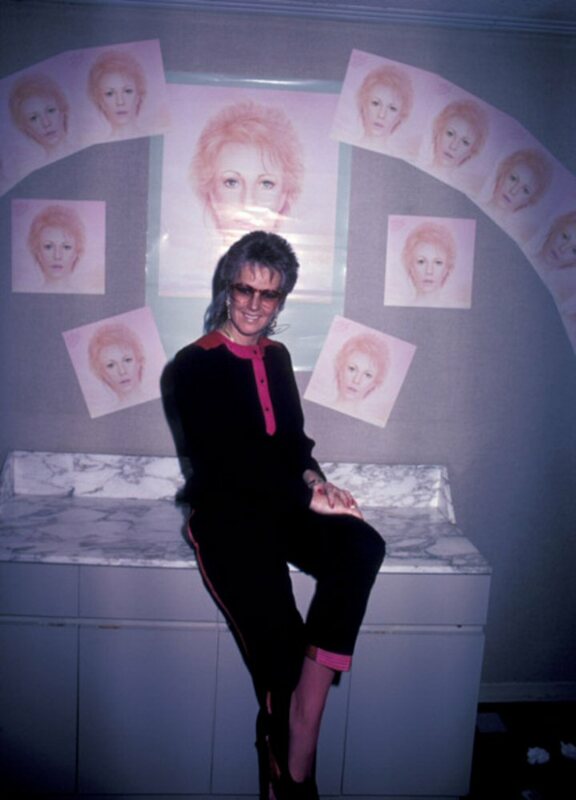 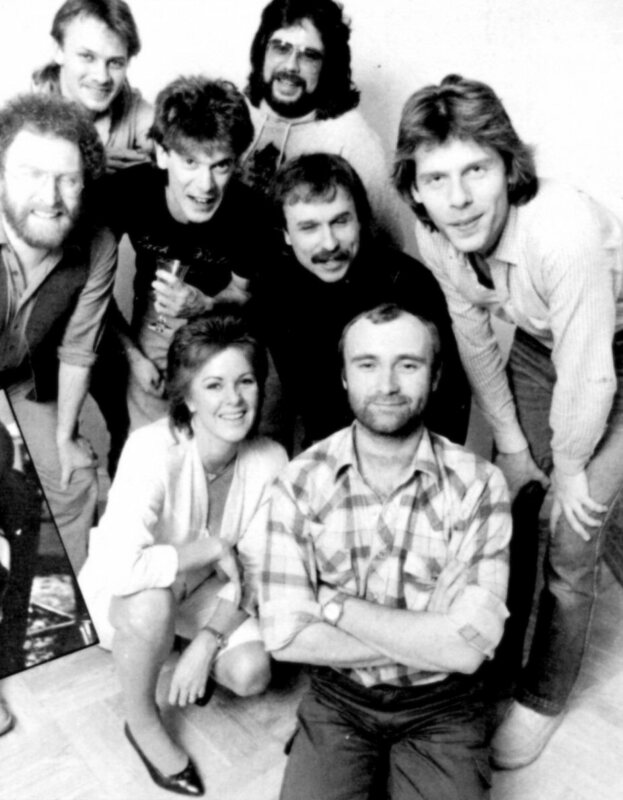 Anders Hanser arranged a photo session for the forthcoming album in May 1982. 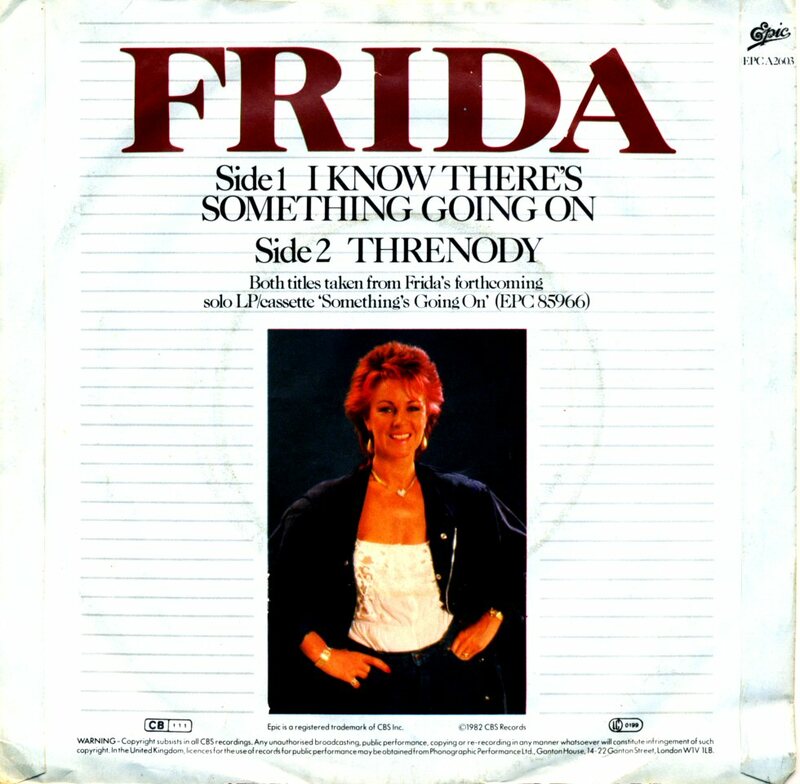 The first single was "I Know There's Something Going On" with "Threnody" on the B-side. 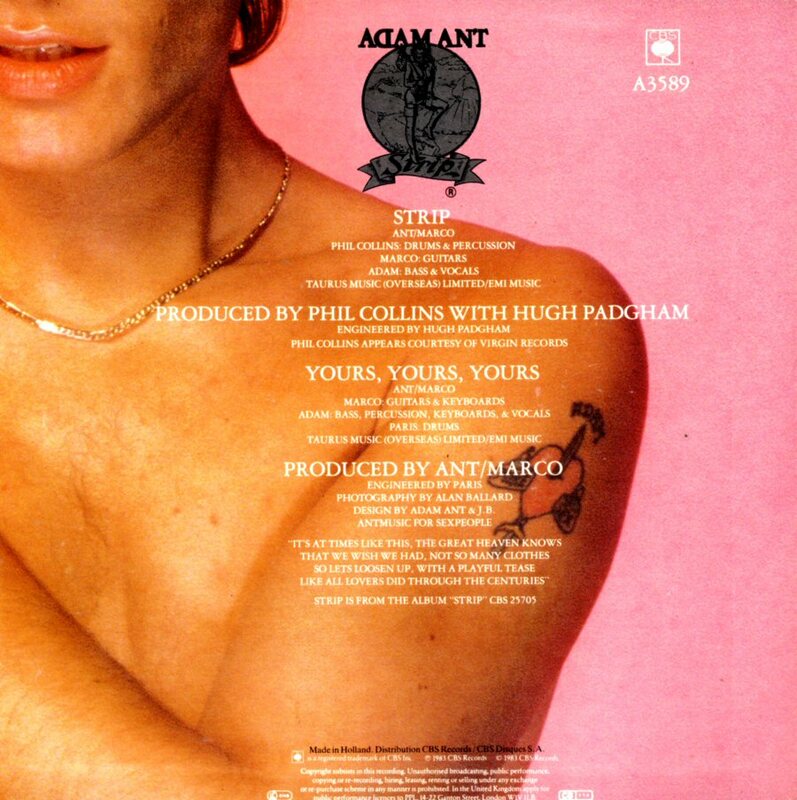 The single was released in the late summer 1982 and became a big hit all over the world. 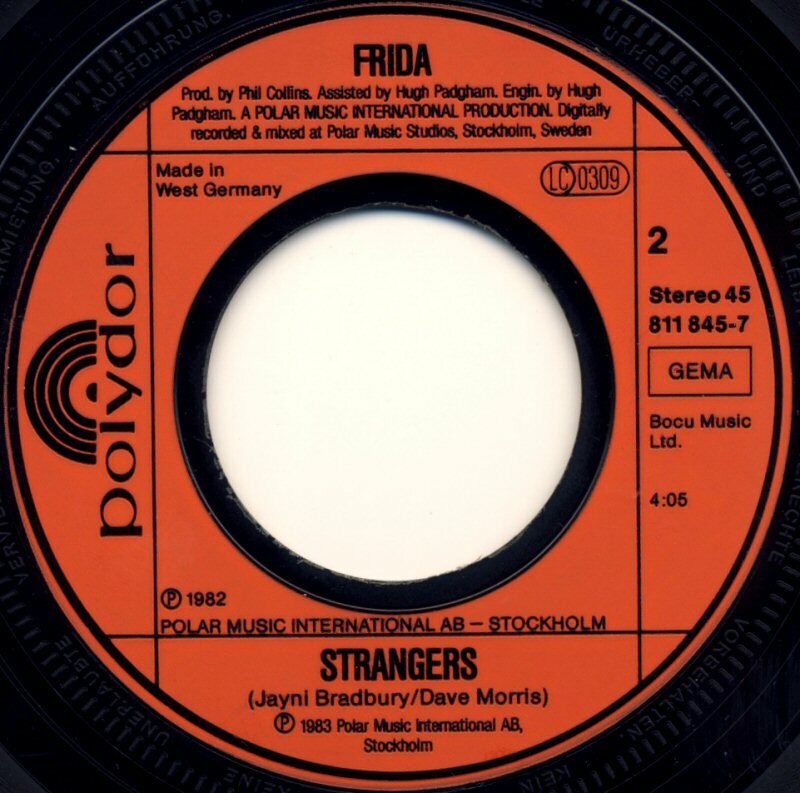 In Sweden the single entered the chart on August 31st, 1982 and stayed there for 18 weeks reaching #3. 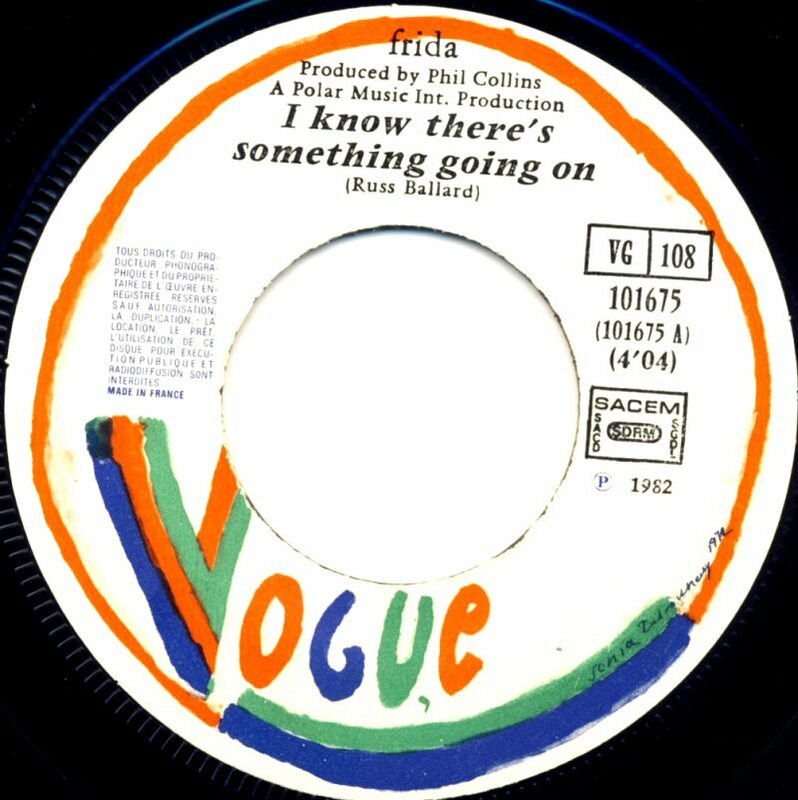 The single version of "I Know There's Something Going On" was an edited shorter version of the song with length of 4.07. 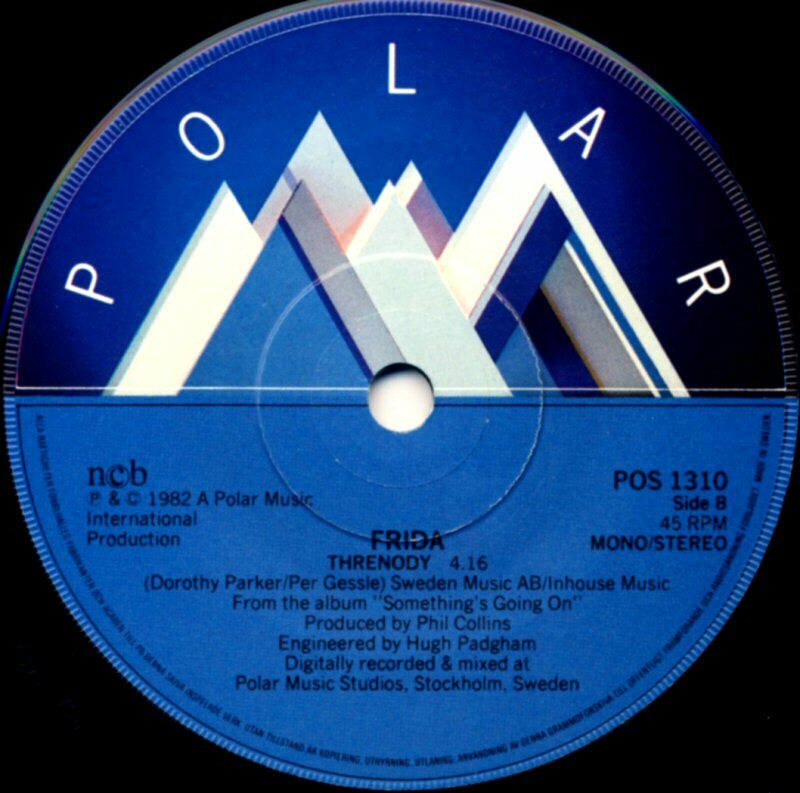 In West Germany it entered the chart on September 6th and it stayed for 21 weeks peaking at #5. 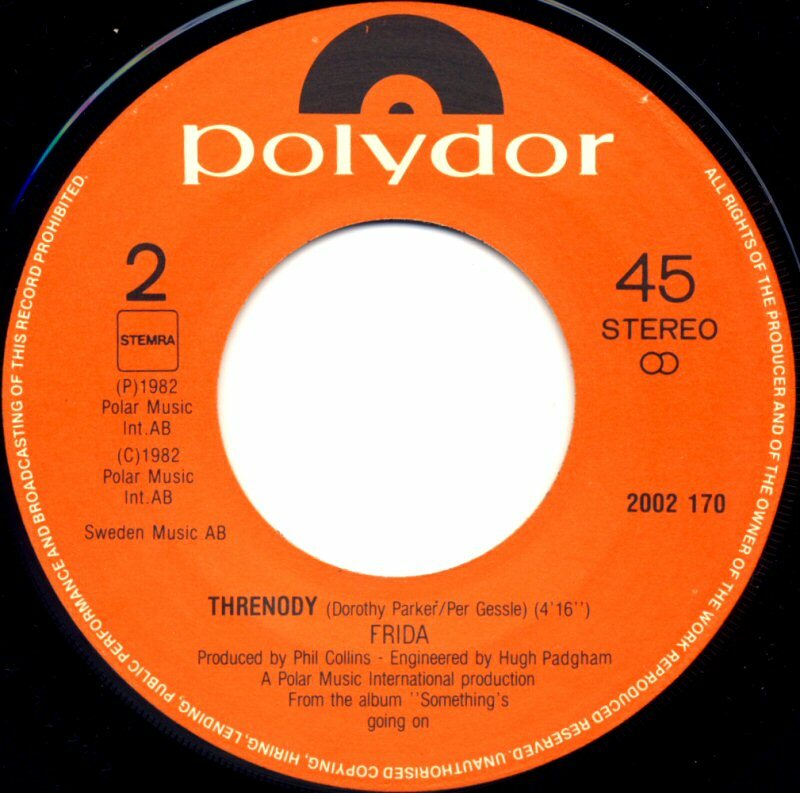 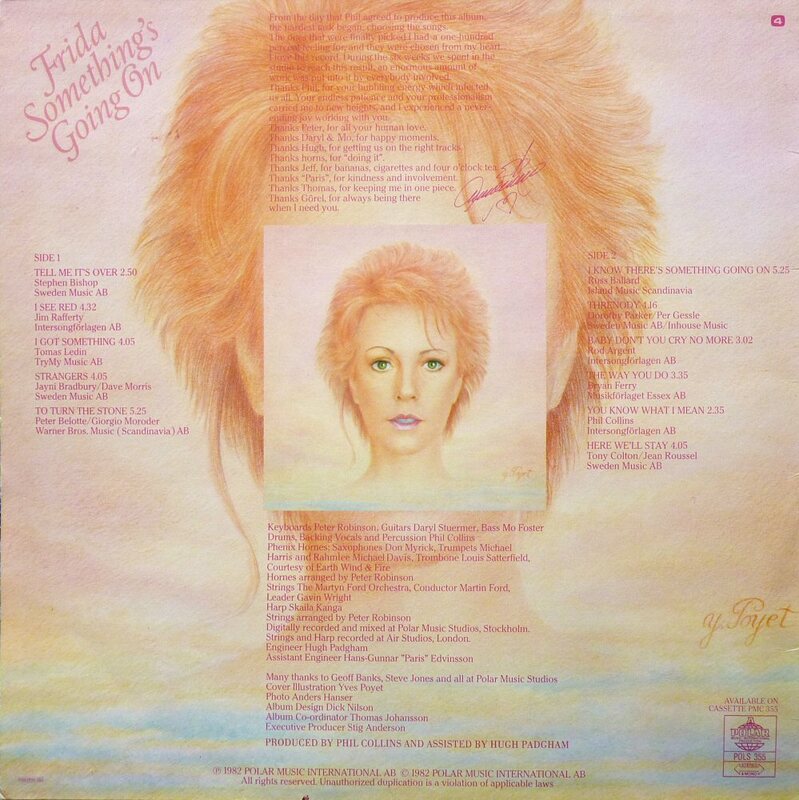 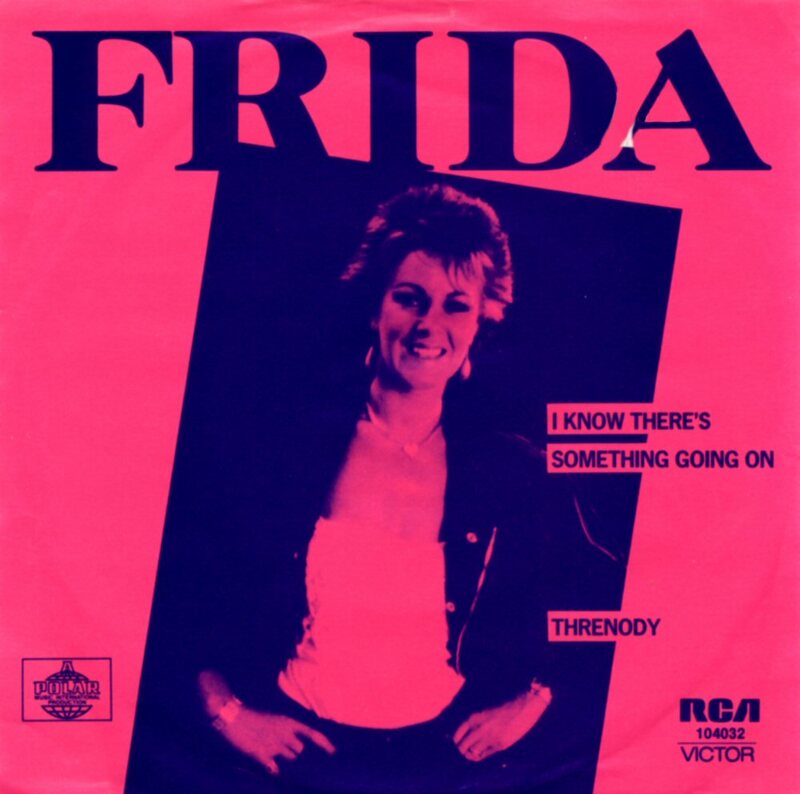 The maxi single released by Polydor contained a full length version of "I Know There's Something Going On" and "Threnody" on the B-side. 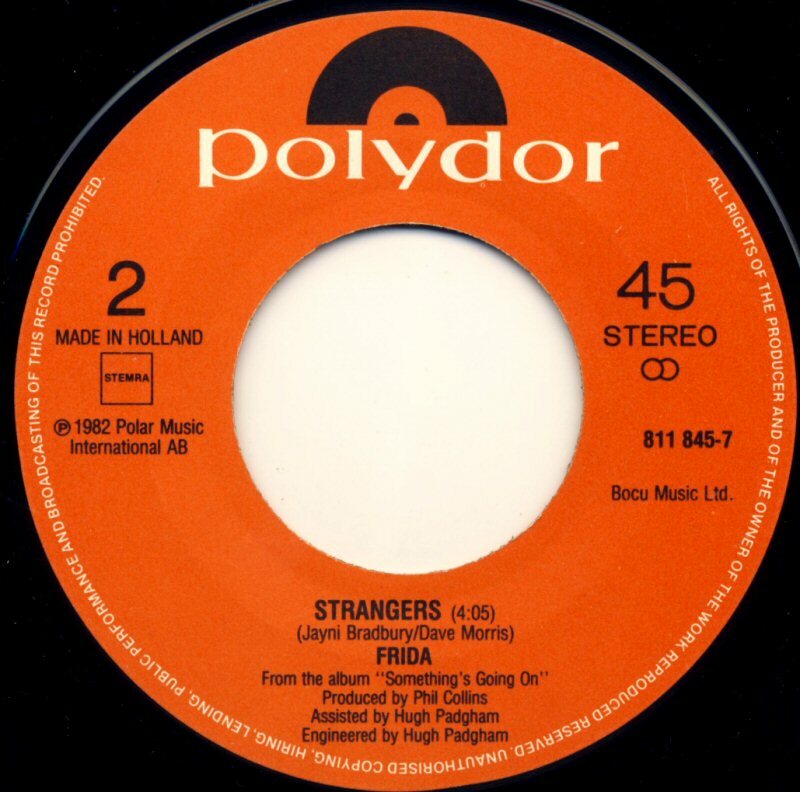 In Holland the single entered the chart on August 21st, 1982 and stayed there for 8 weeks peaking at #3. 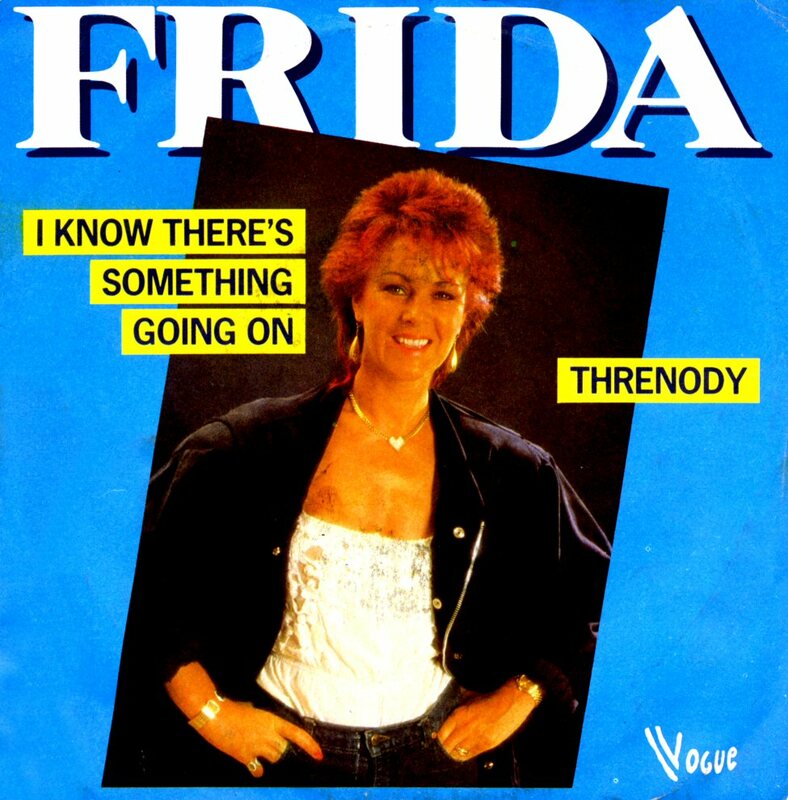 The single was released even as a maxi single (EP) with the full-length version of "I Know There's Something Going On" (5.25) and "Threnody" on the flipside. 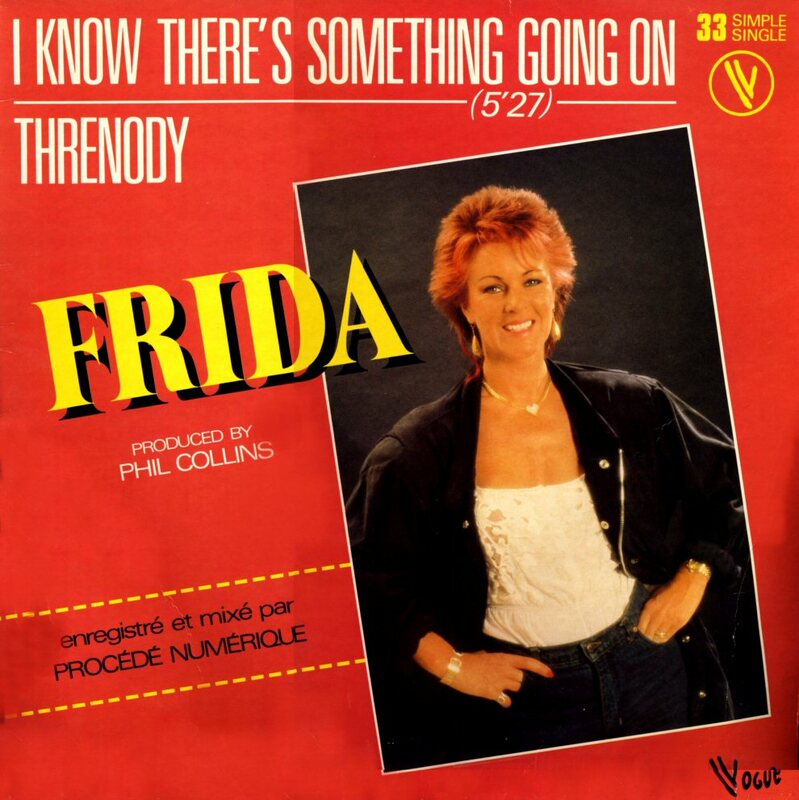 "I Know There's Something Going On" reached the top in Belgium and Switzerland. 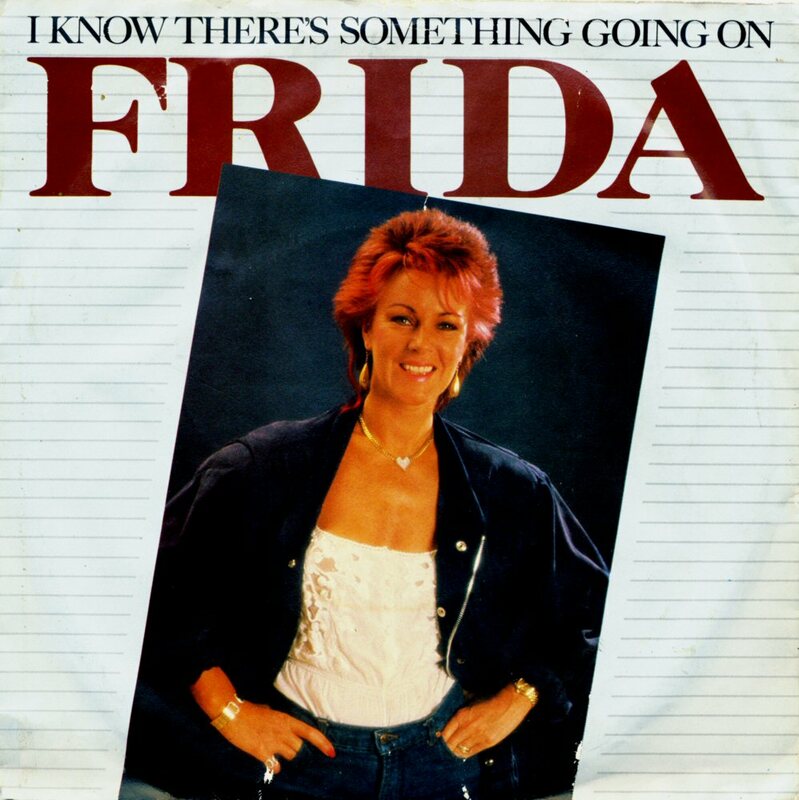 In Australia the single entered the chart on September 20th, 1982 and stayed there for 16 weeks peaking at #5. 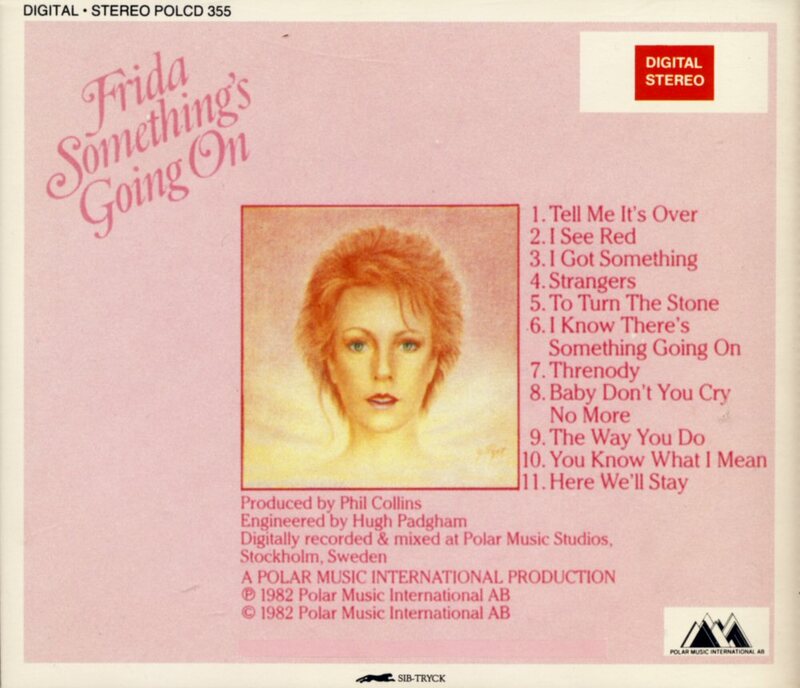 It reached #5 even in Holland, Austria, Norway. 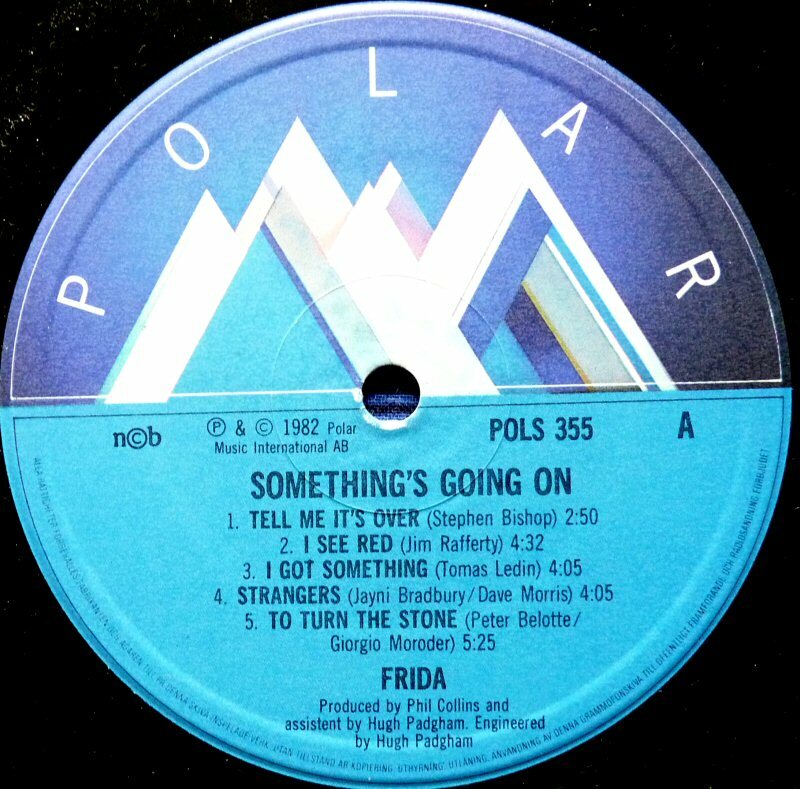 In Poland "I Know There's Something Going On" entered the power play chart on September 25th, 1982 at #9 and stayed there for 9 weeks. 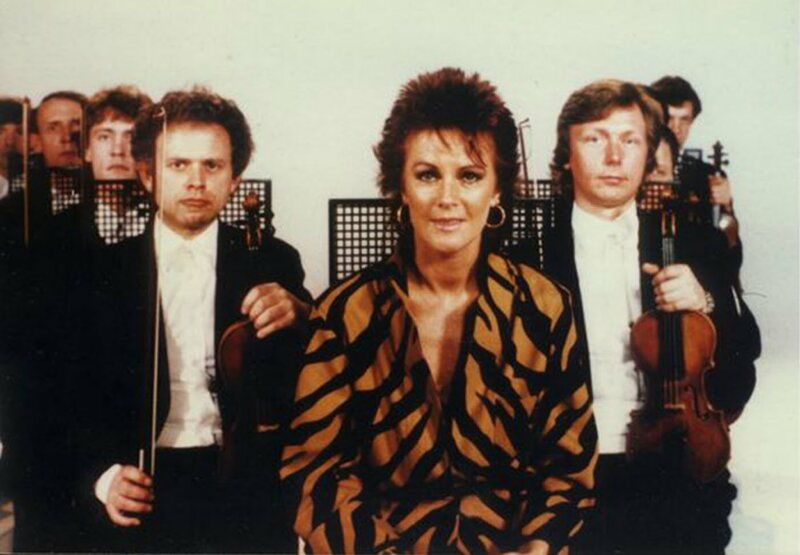 The Polish chart history: Oct 2: #3, Oct 9: #3, Oct 16: #3, Oct 23: #3, Oct 30: #12, Nov 6: #10, Nov 13: #11, Nov 20: #12. 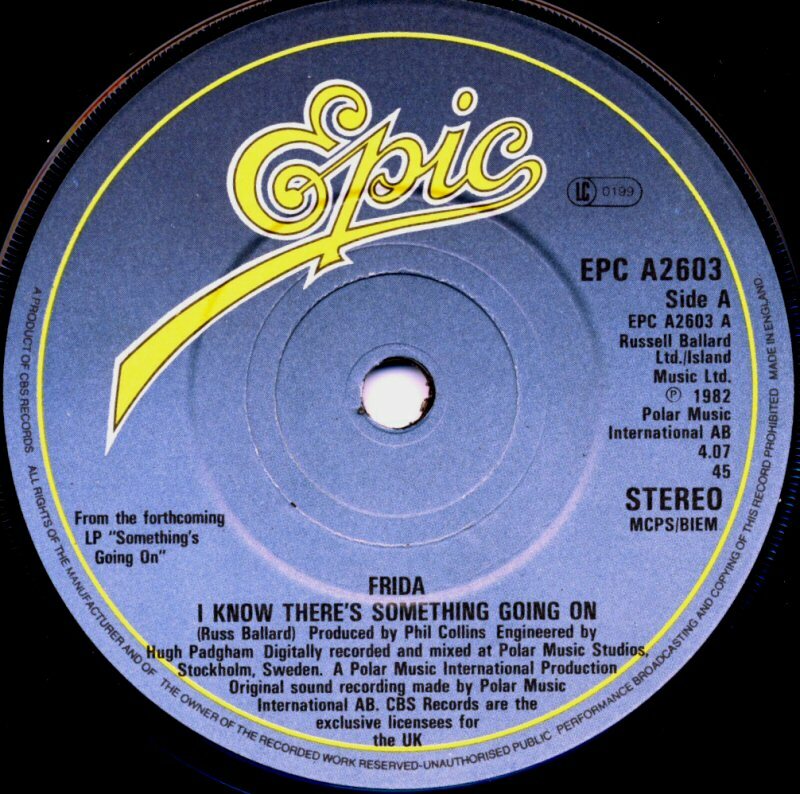 In Great Britain "I Know There's Something Going On" entered the chart on August 21st and stayed there for 7 weeks reaching number 43. The single "I Know There's Something Going On" was released in France in September 1982 and it became a smash success staying on the single chart for 17 weeks reaching #1. 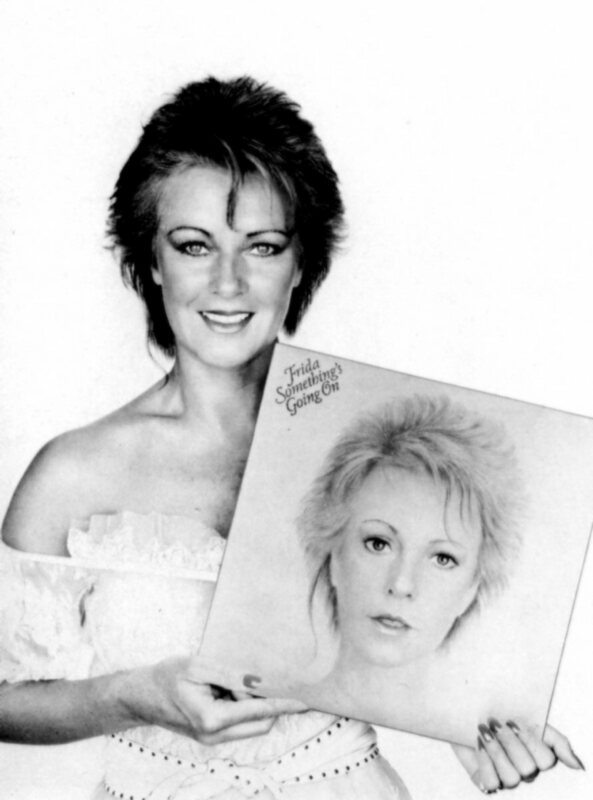 The single was released with two different picture sleeves. 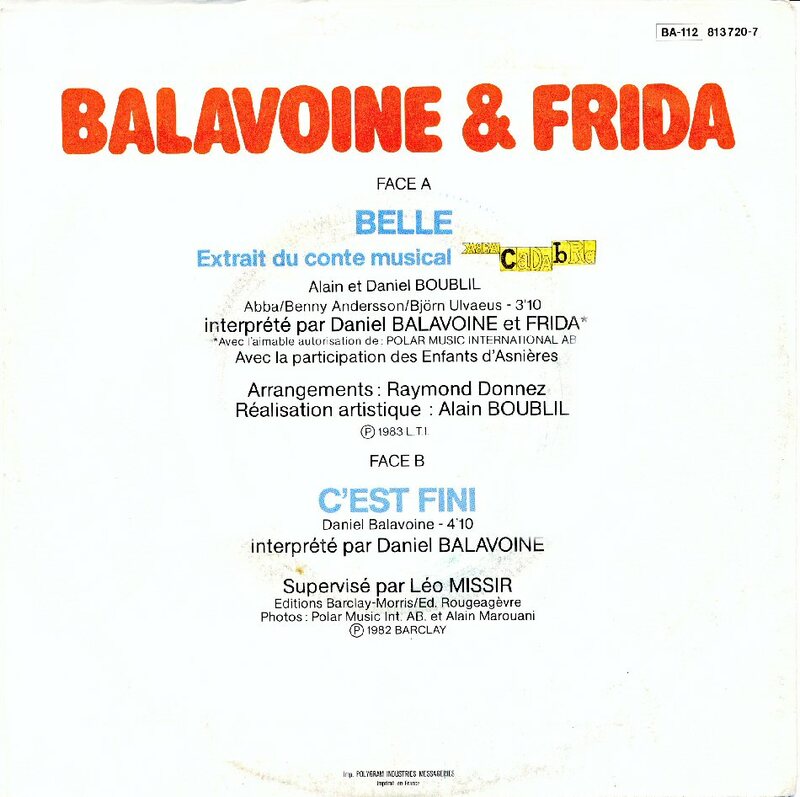 Even a maxi single was released at the same time. 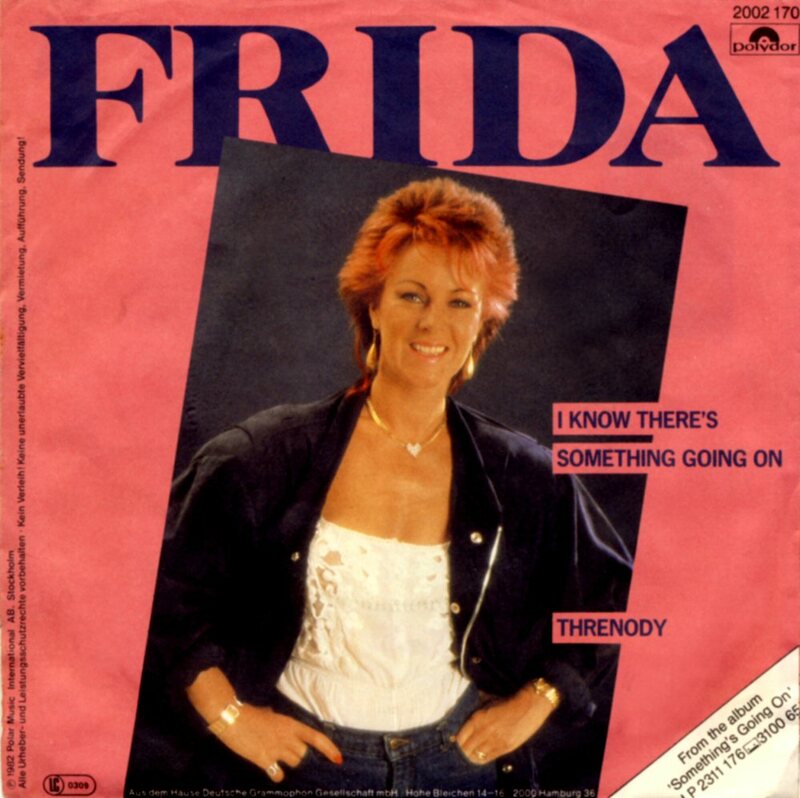 The single entered the US chart on November 6th, 1982 where it stayed for 29 weeks reaching no 13. 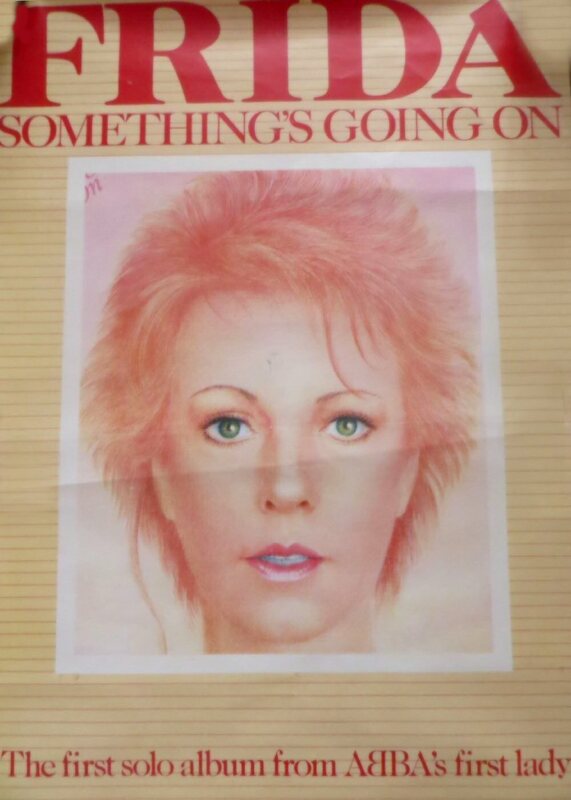 The album "Something's Going On" was released at the end of the summer 1982. 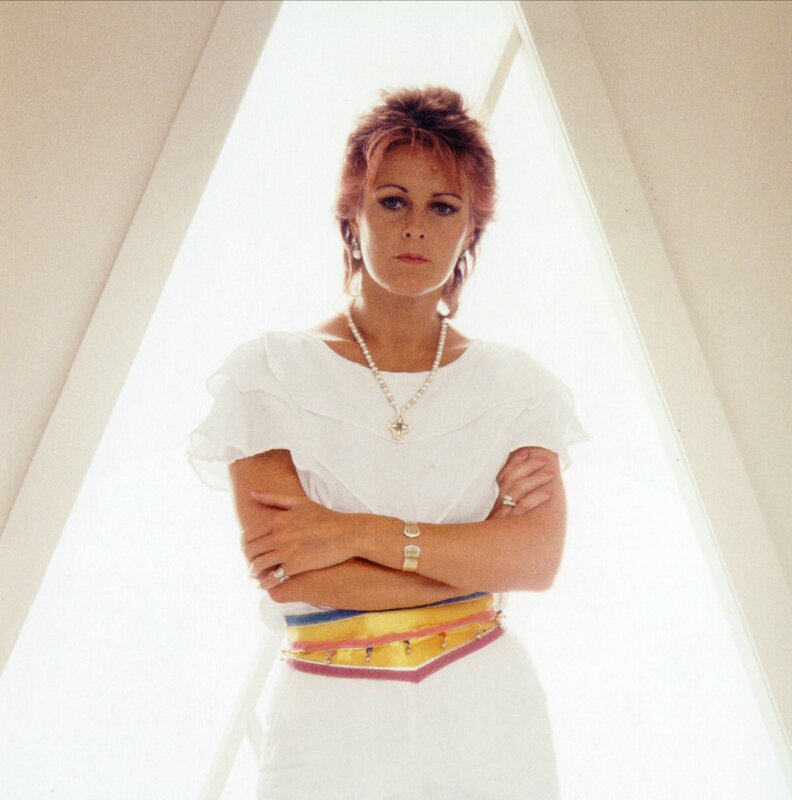 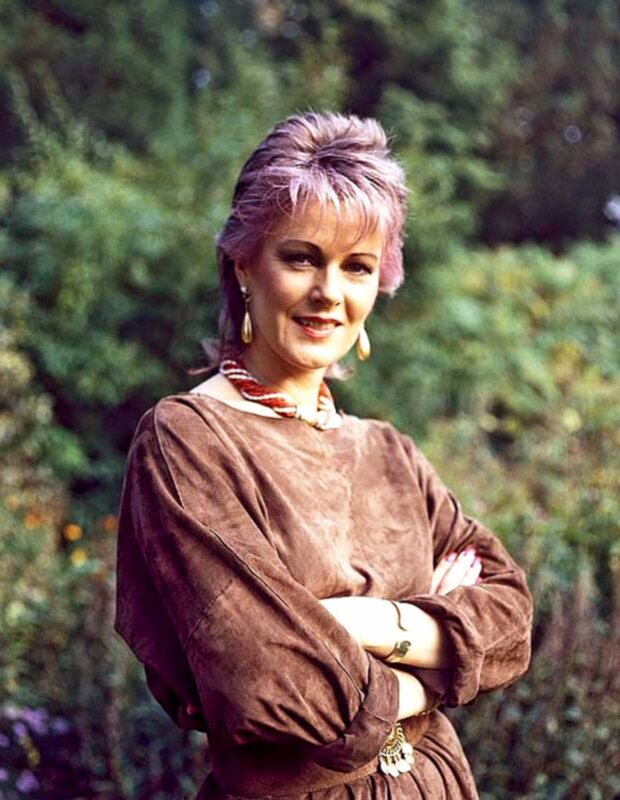 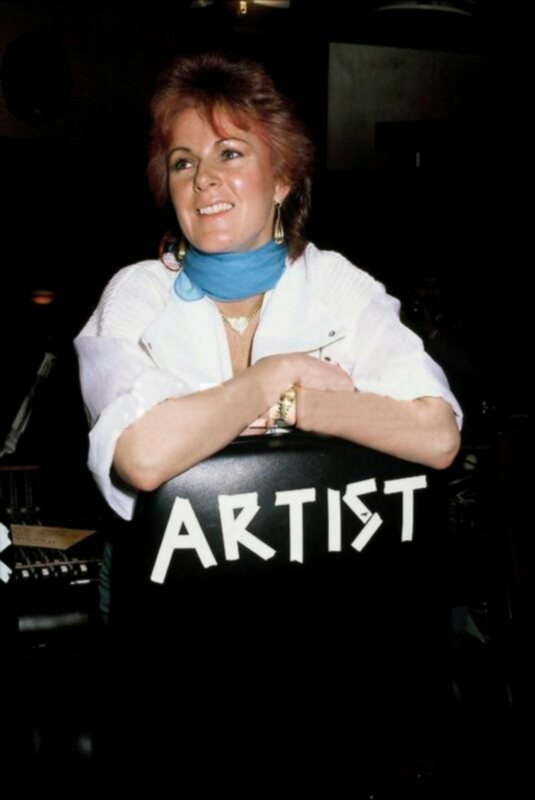 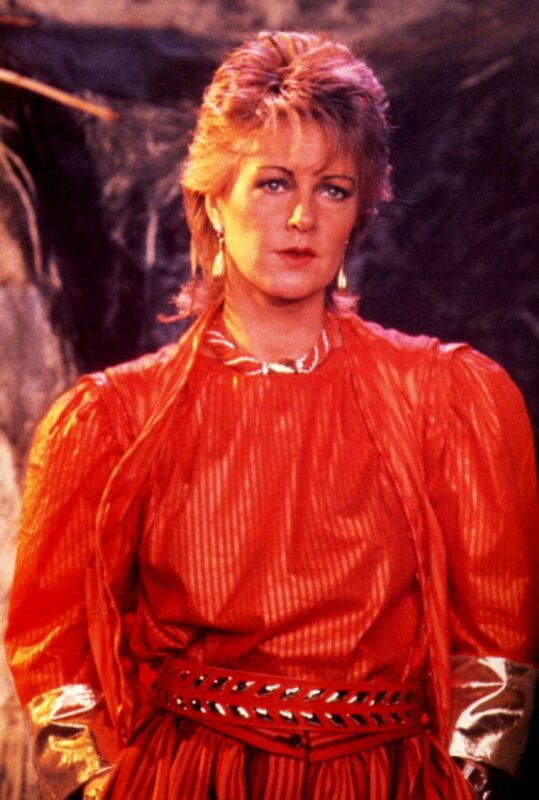 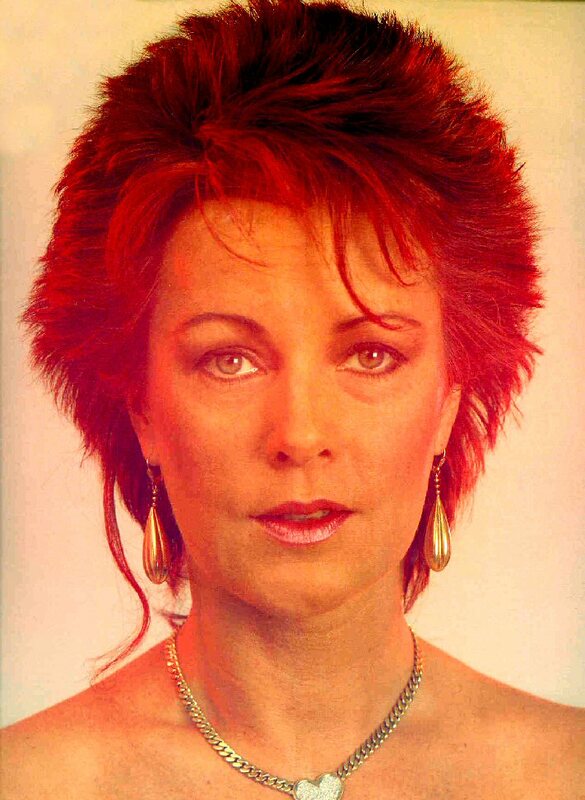 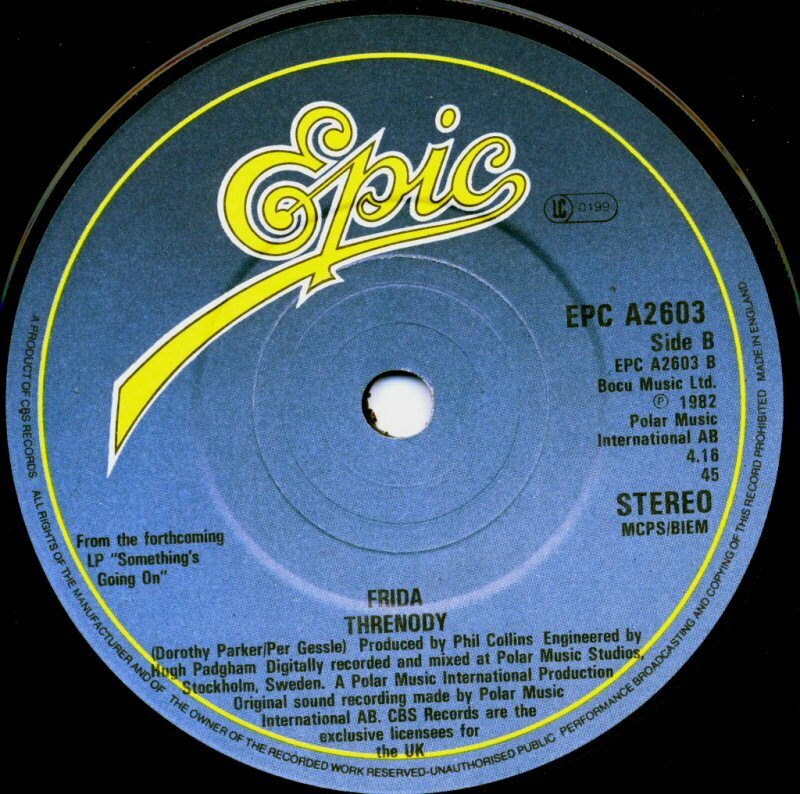 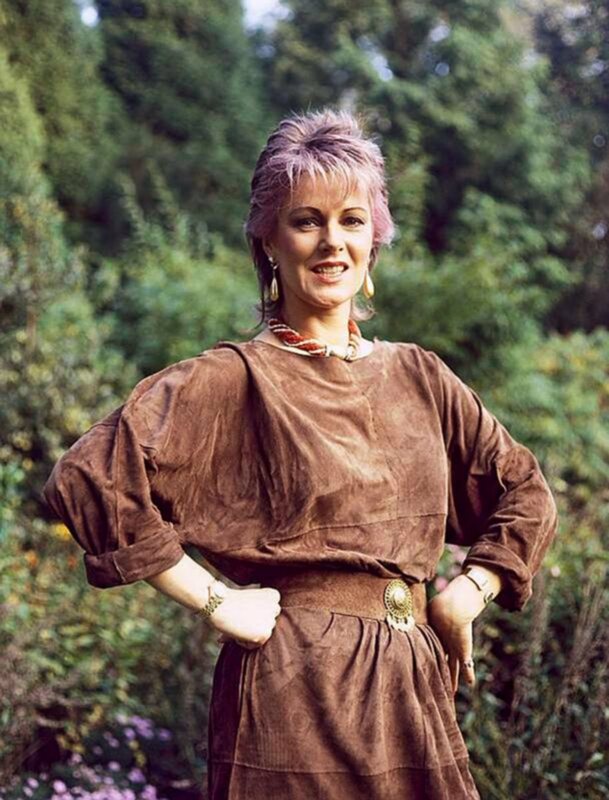 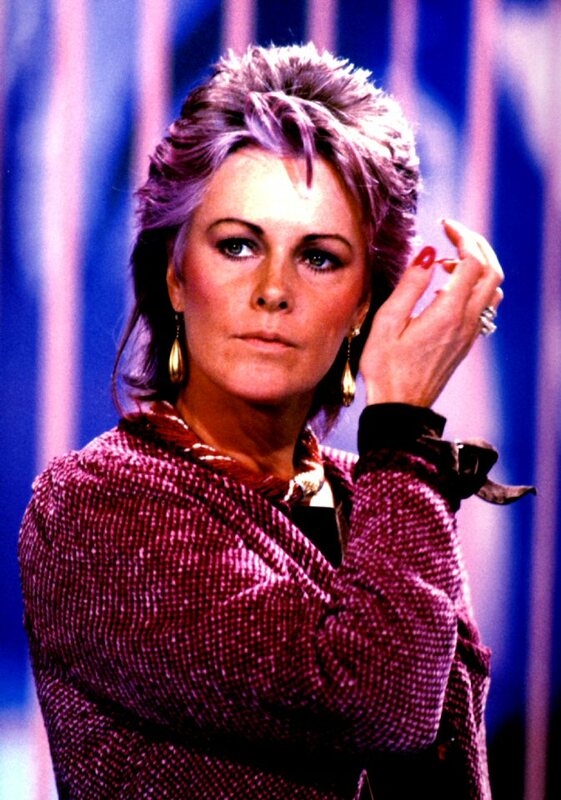 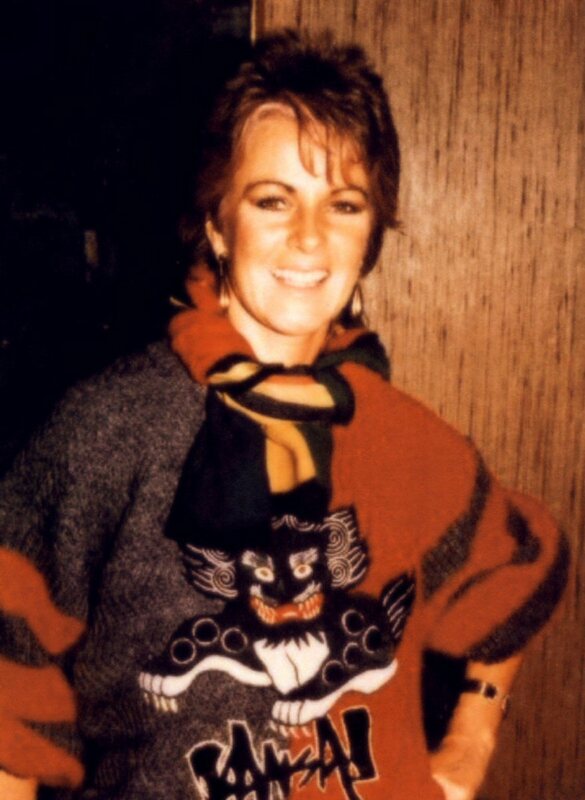 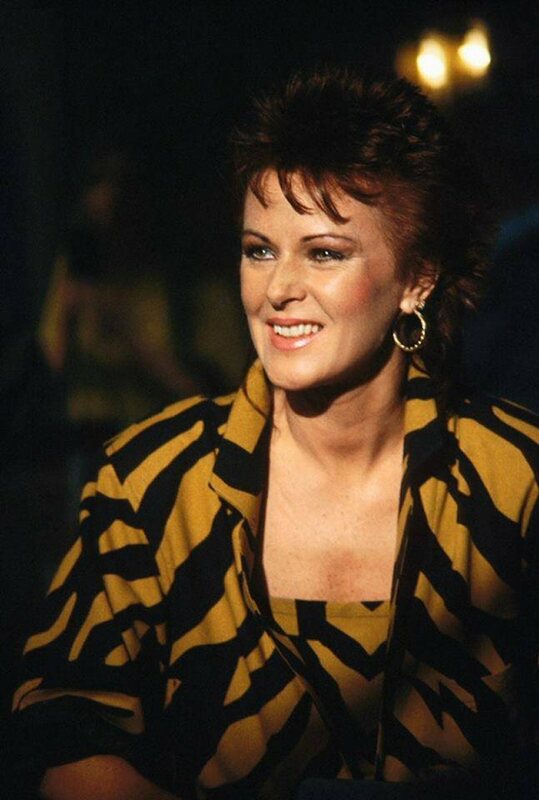 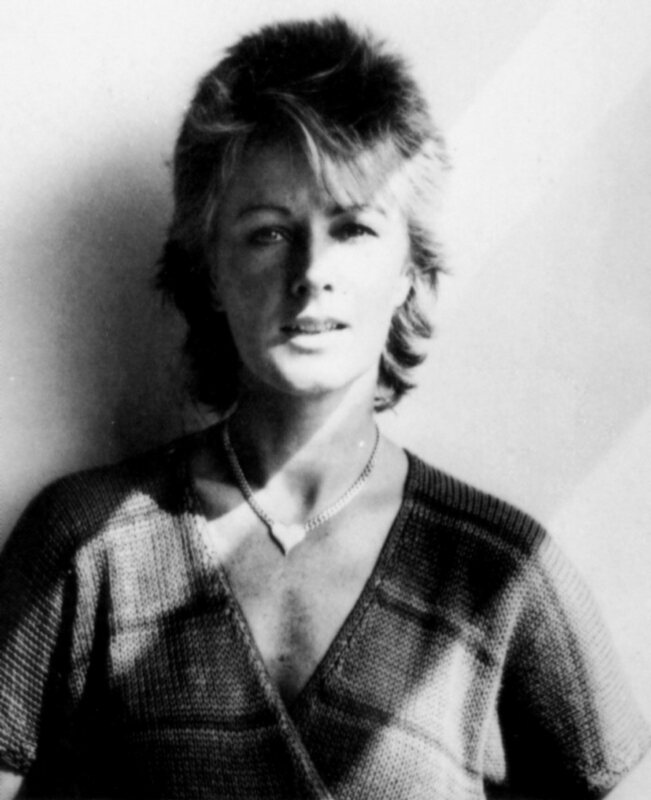 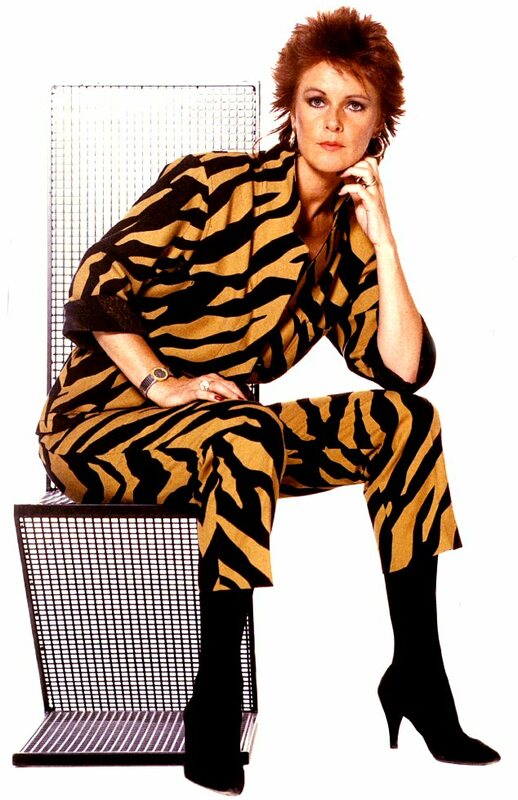 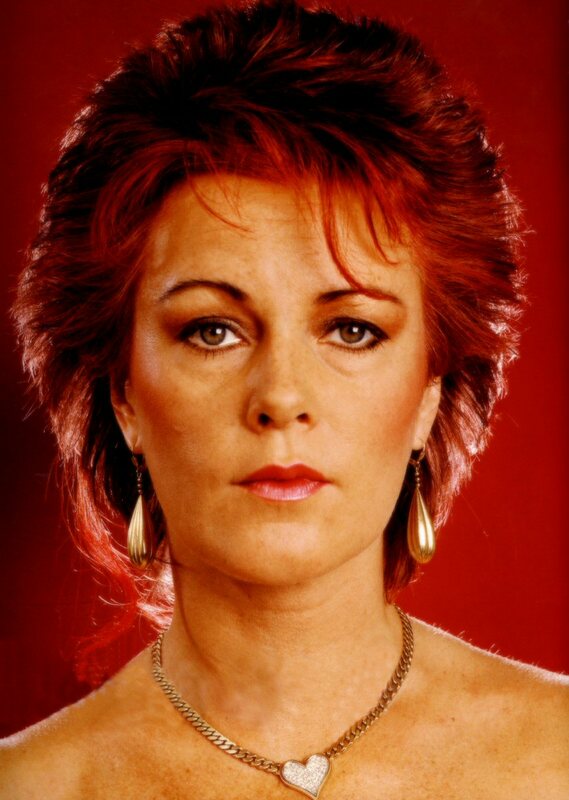 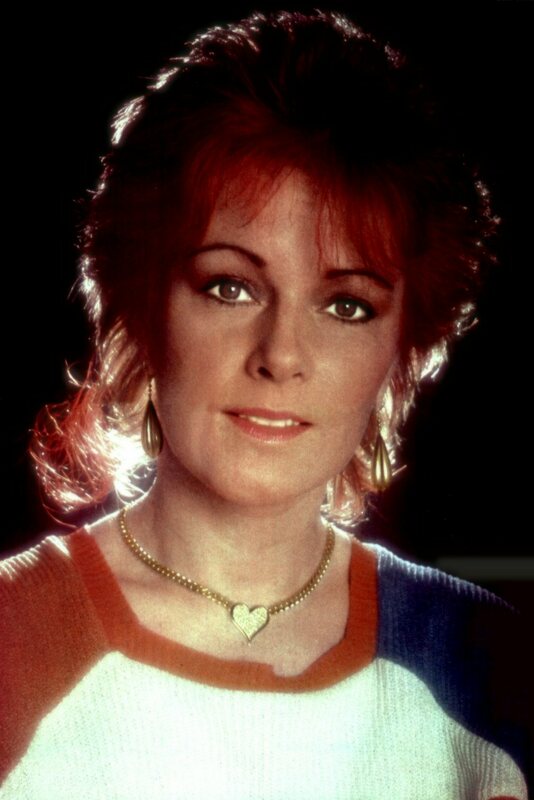 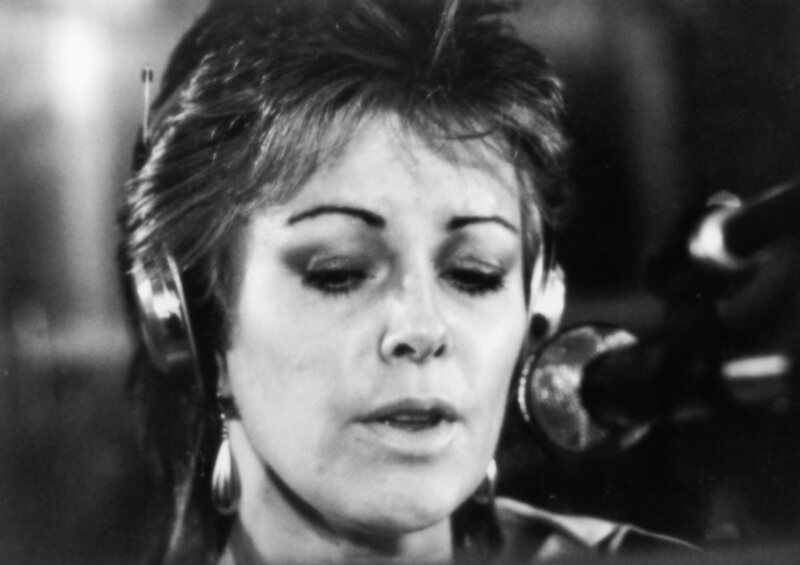 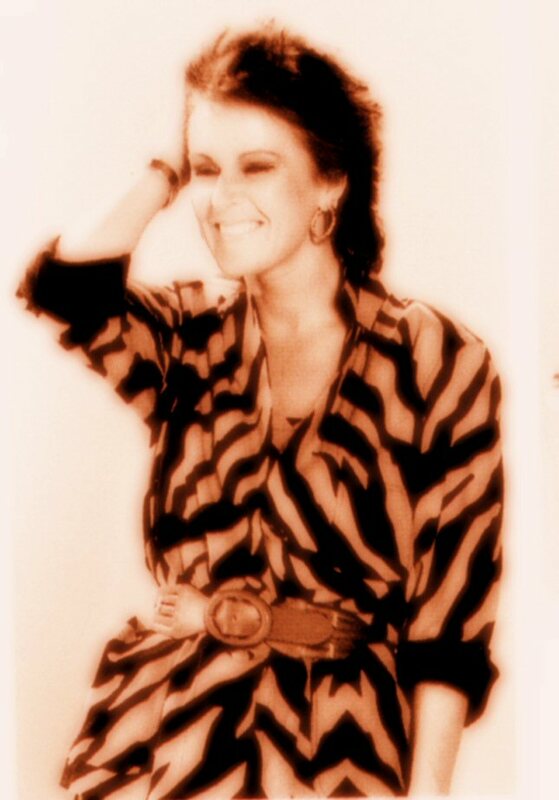 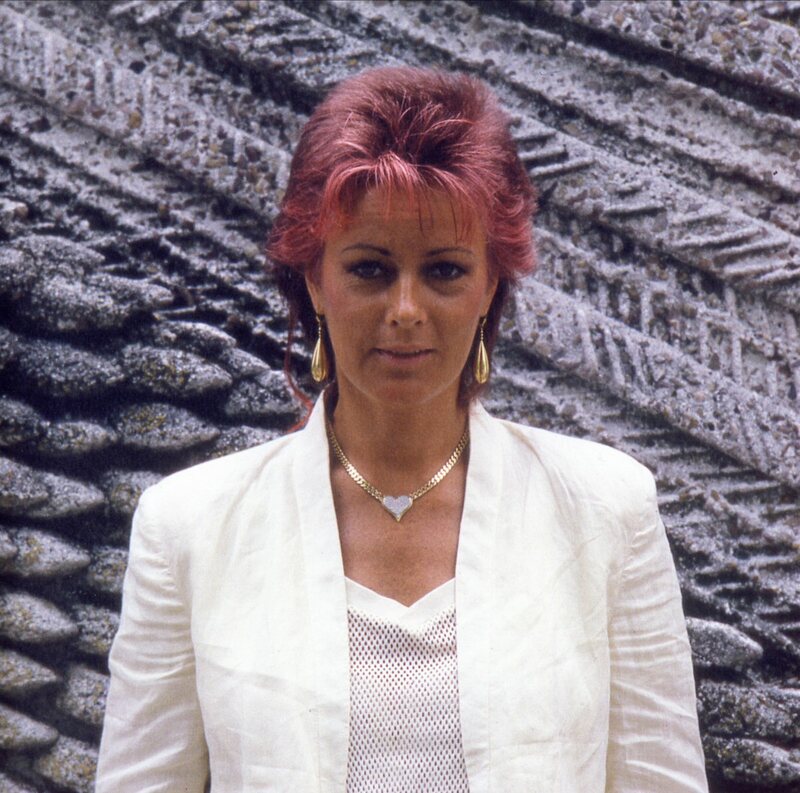 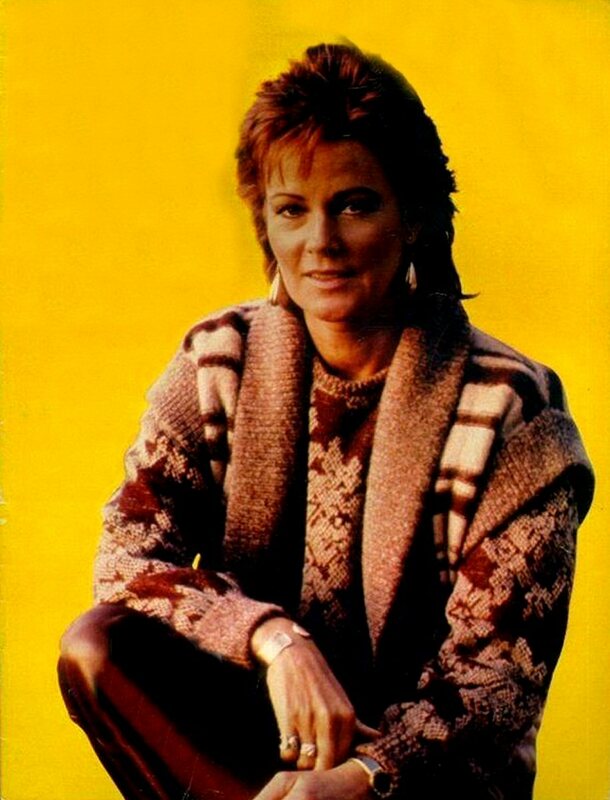 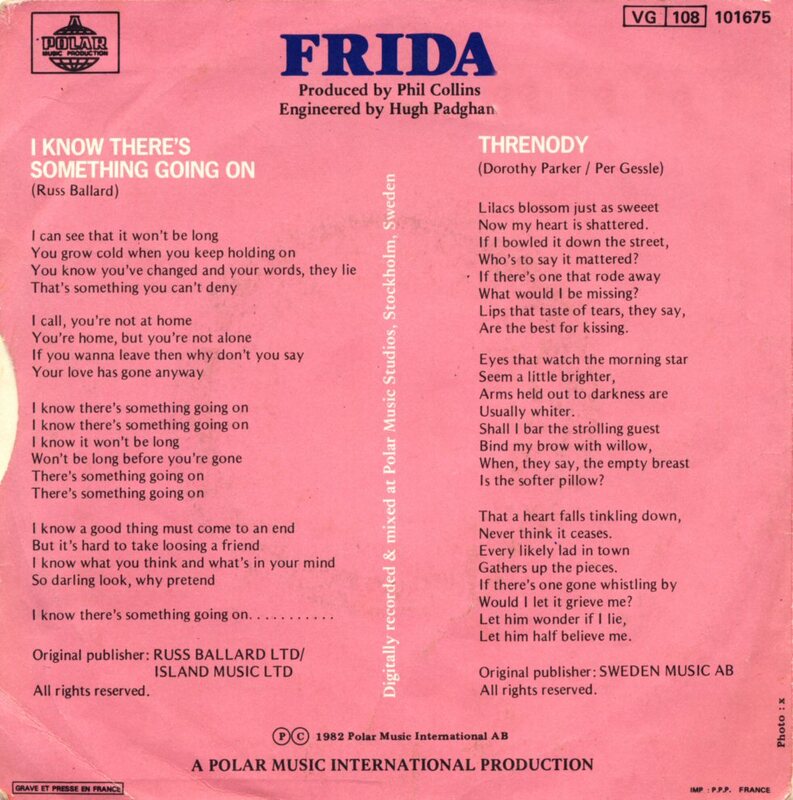 Frida's first English language album was the very first solo project of an ABBA member which was released world-wide. 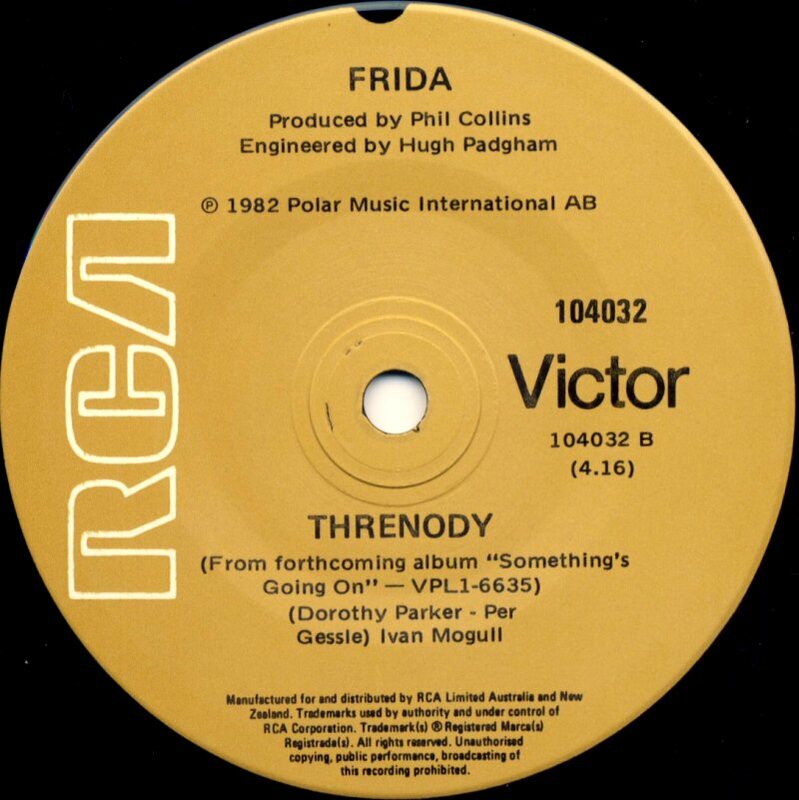 Lots of publicity around the production of this album and of course the star cooperation Frida-Phil made all fans extremely curious about the result. 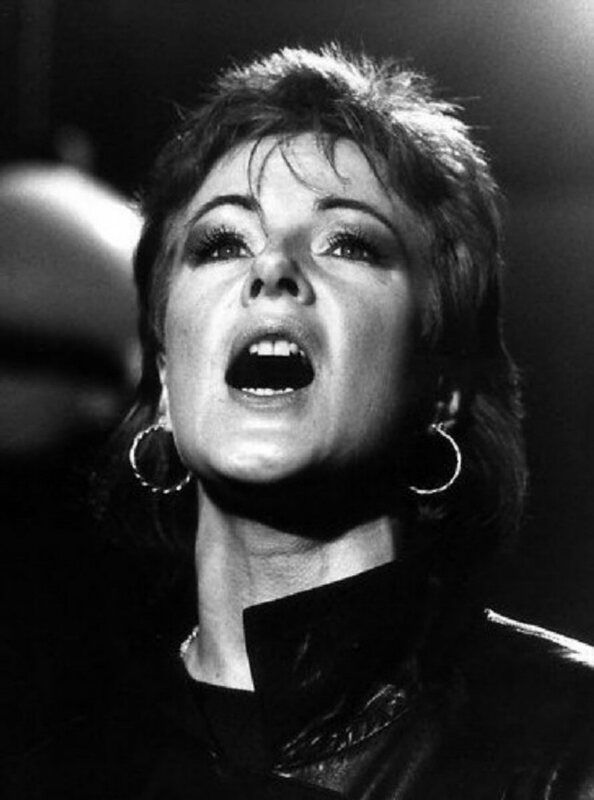 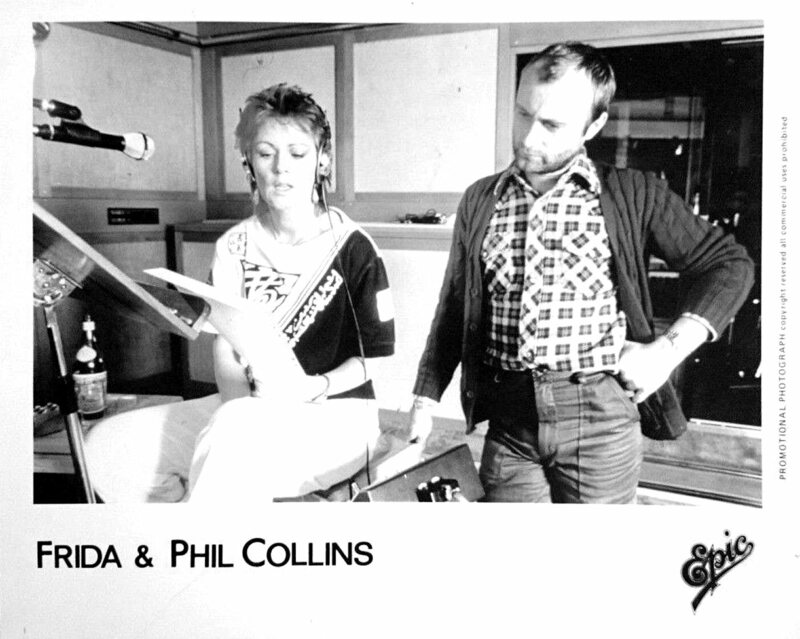 The album had a very special sound which was a mixture of Collins, Earth Wind and Fire and of course Frida's voice. It contained 11 tracks but it was quite difficult to find songs for single releases which according to several ABBA biographers made co-producer Stikkan Anderson worried about commercial future of the album. 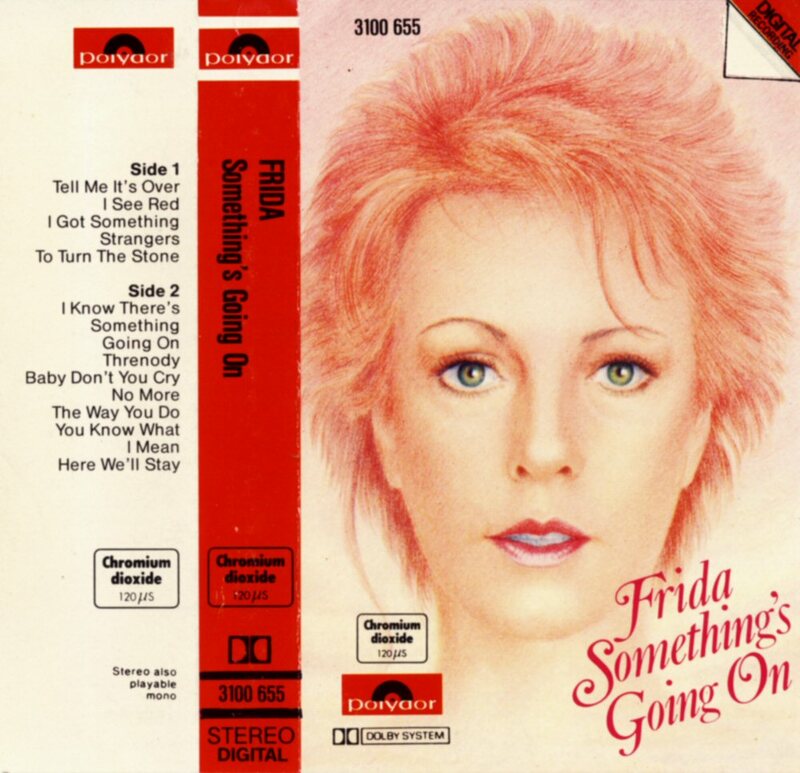 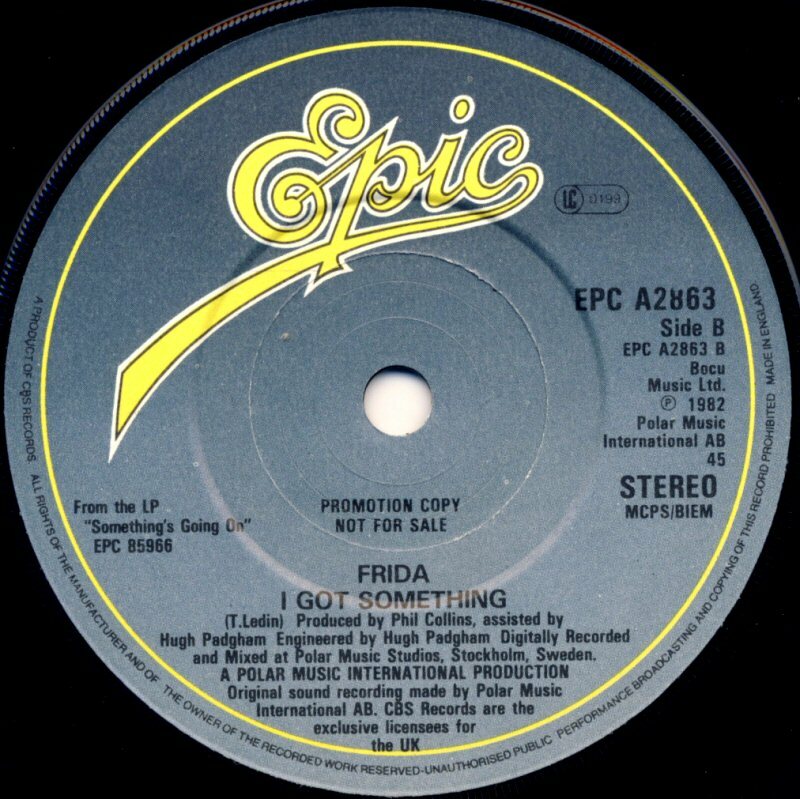 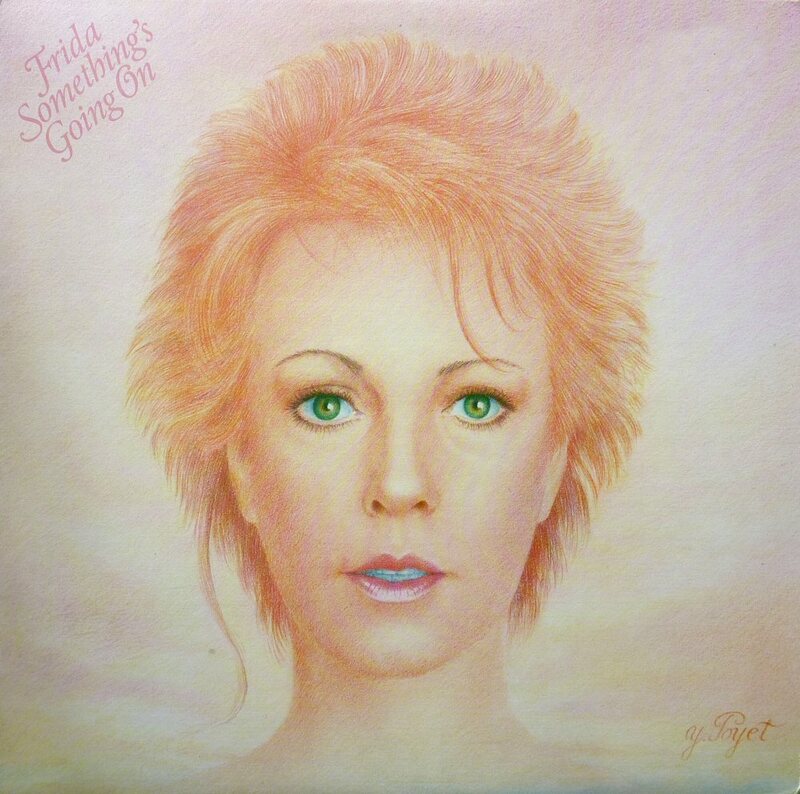 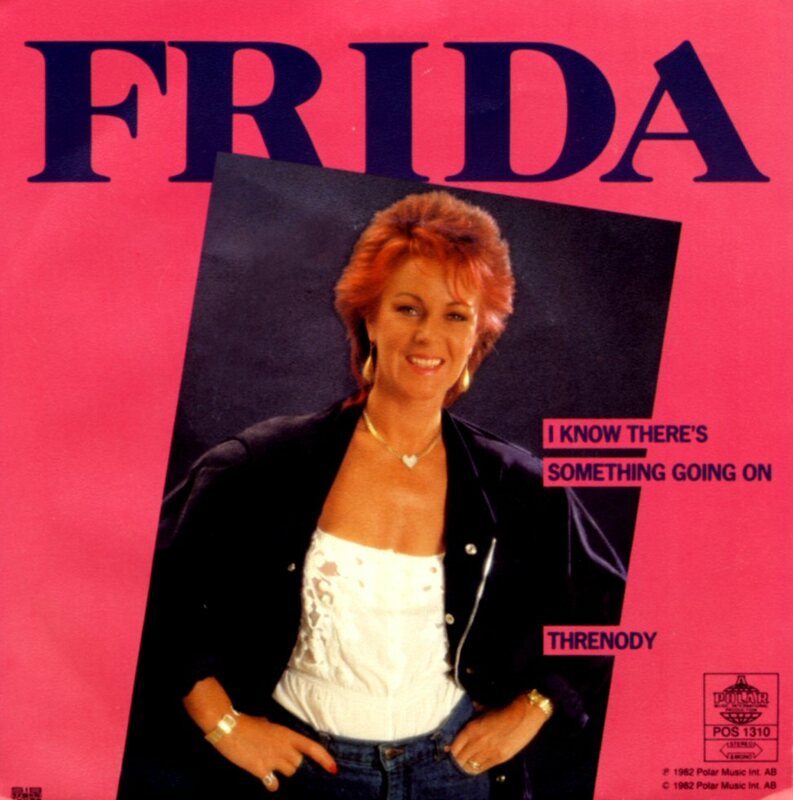 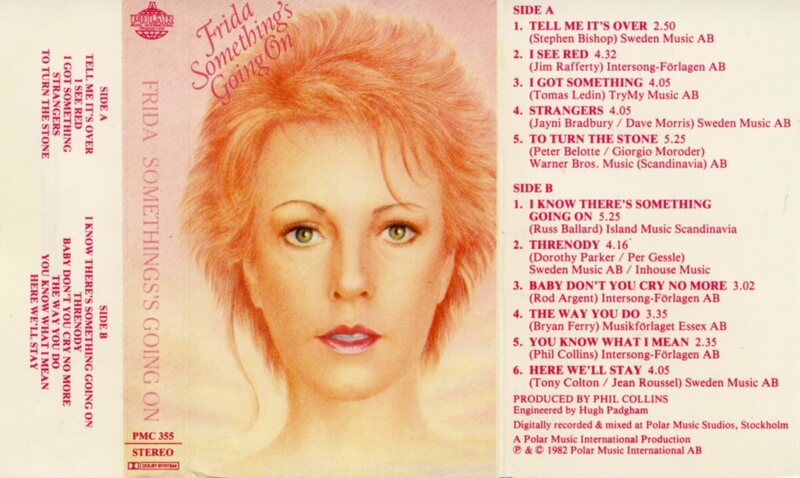 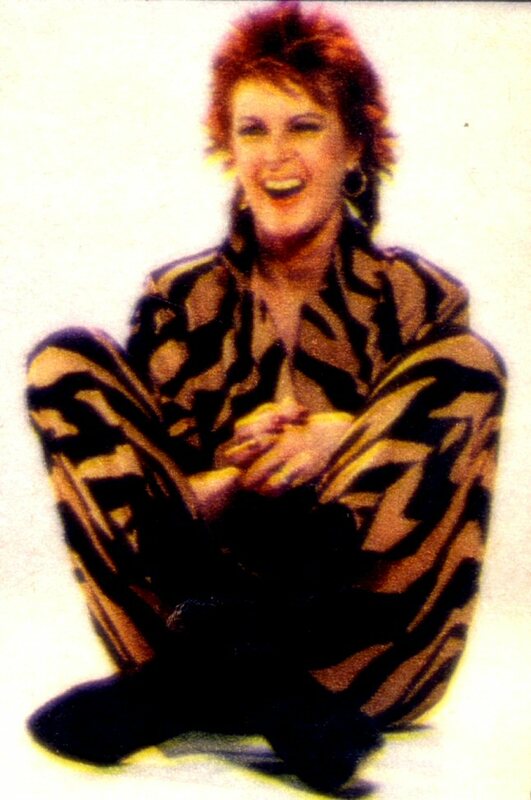 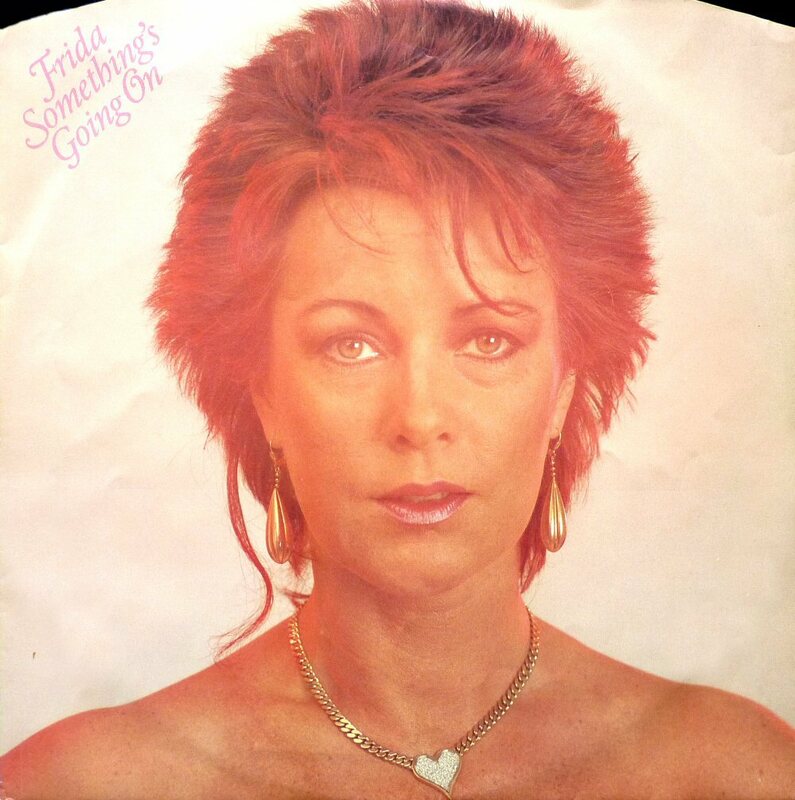 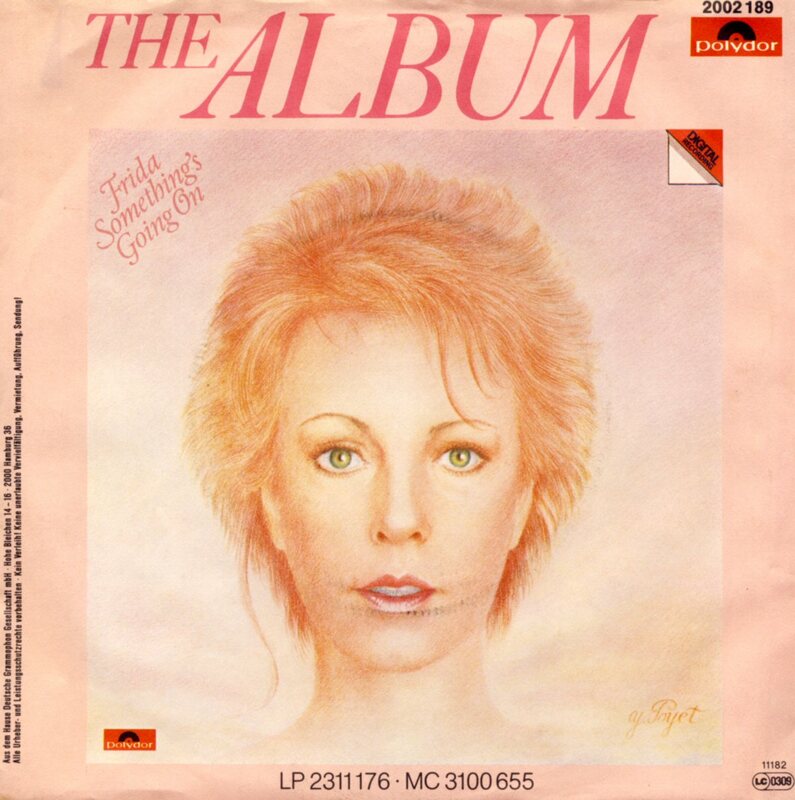 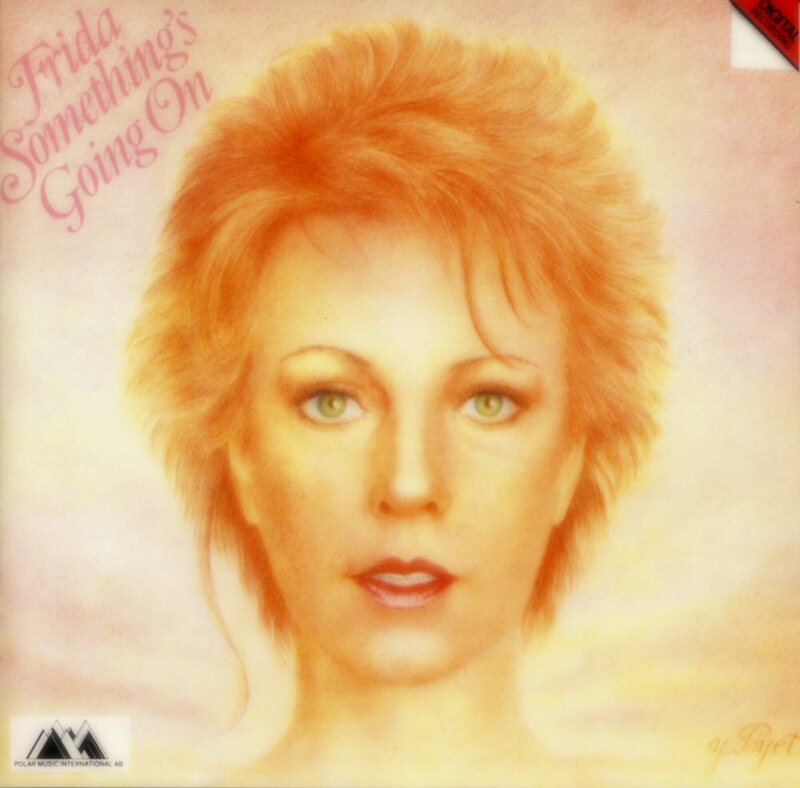 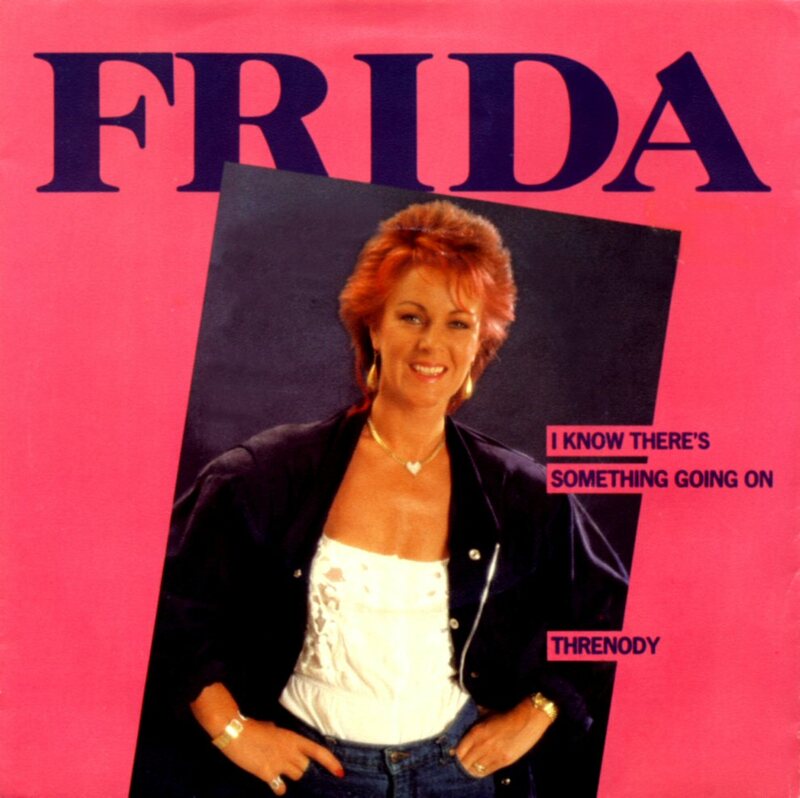 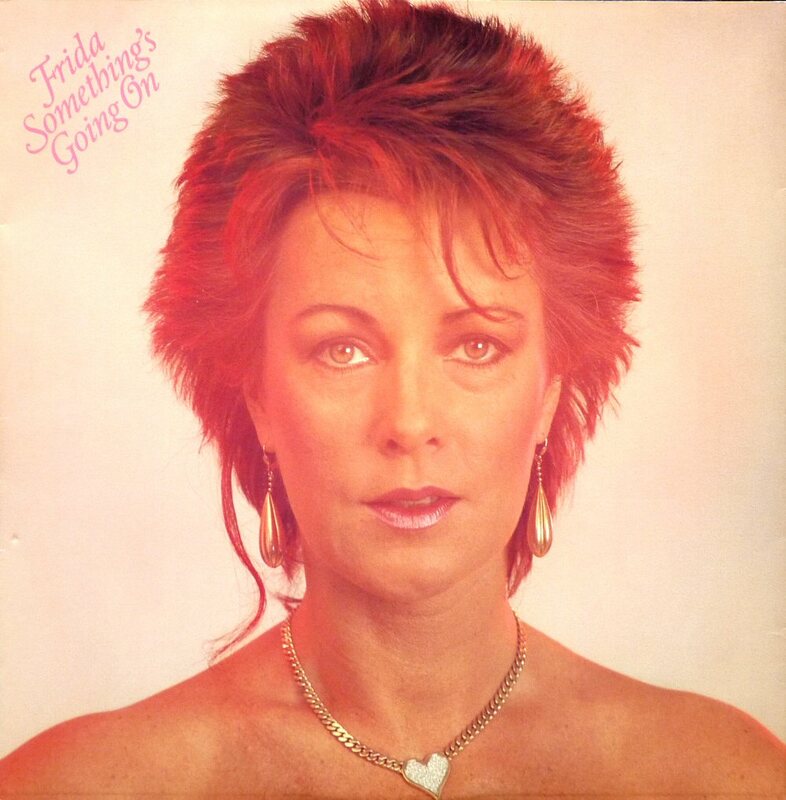 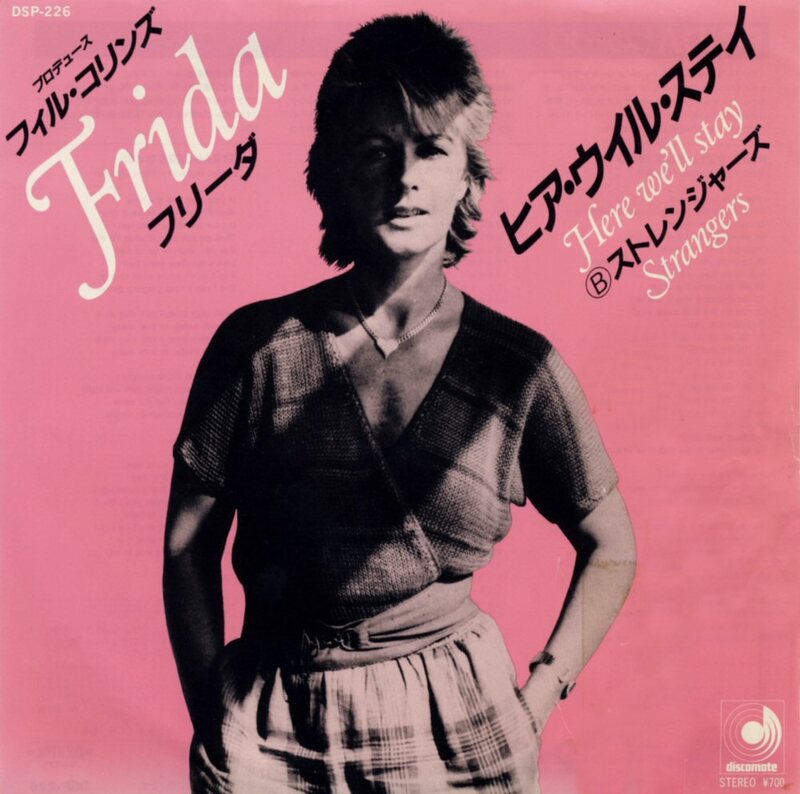 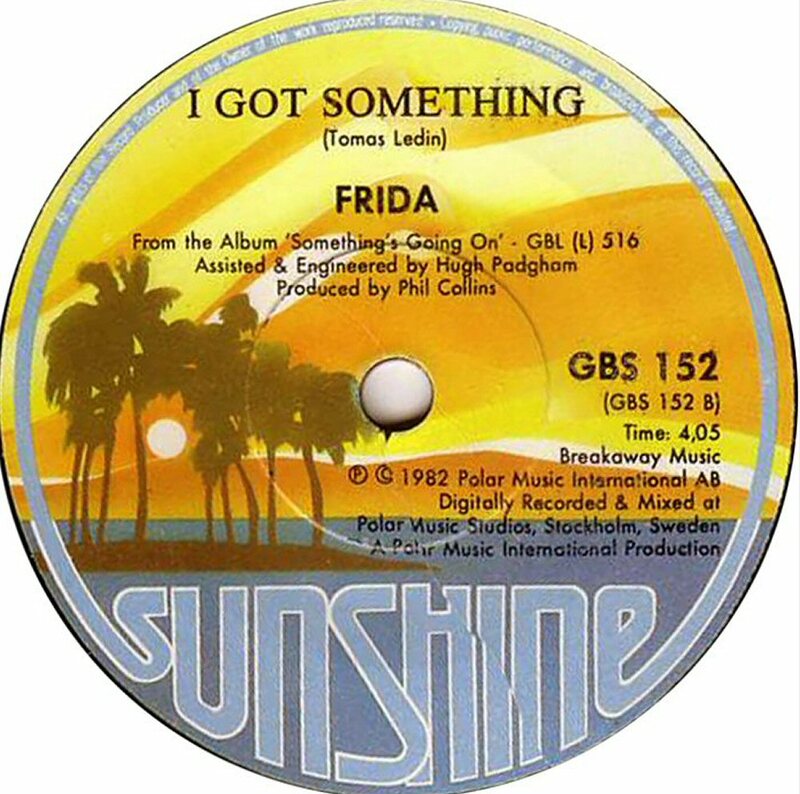 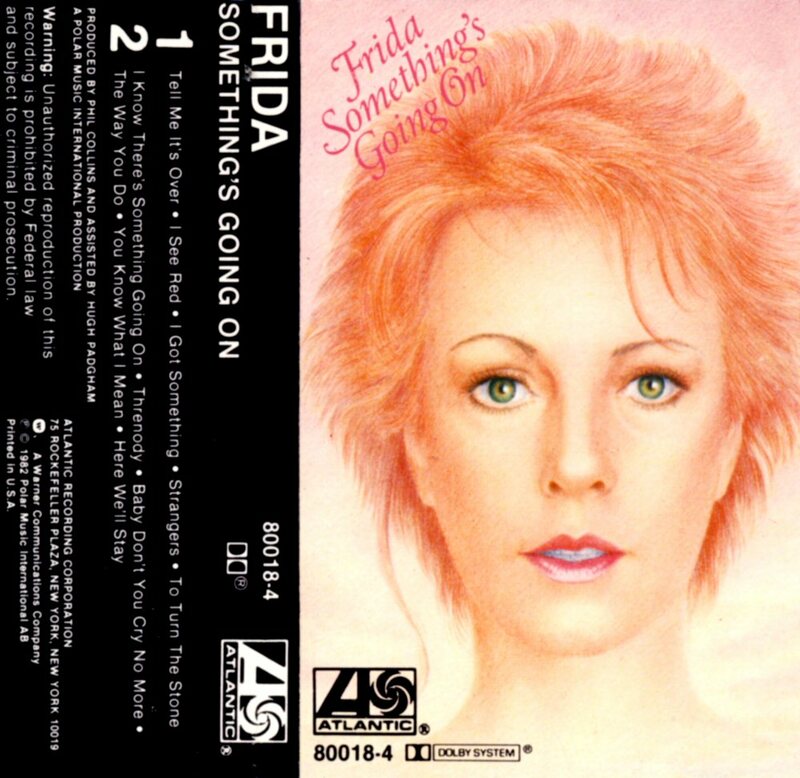 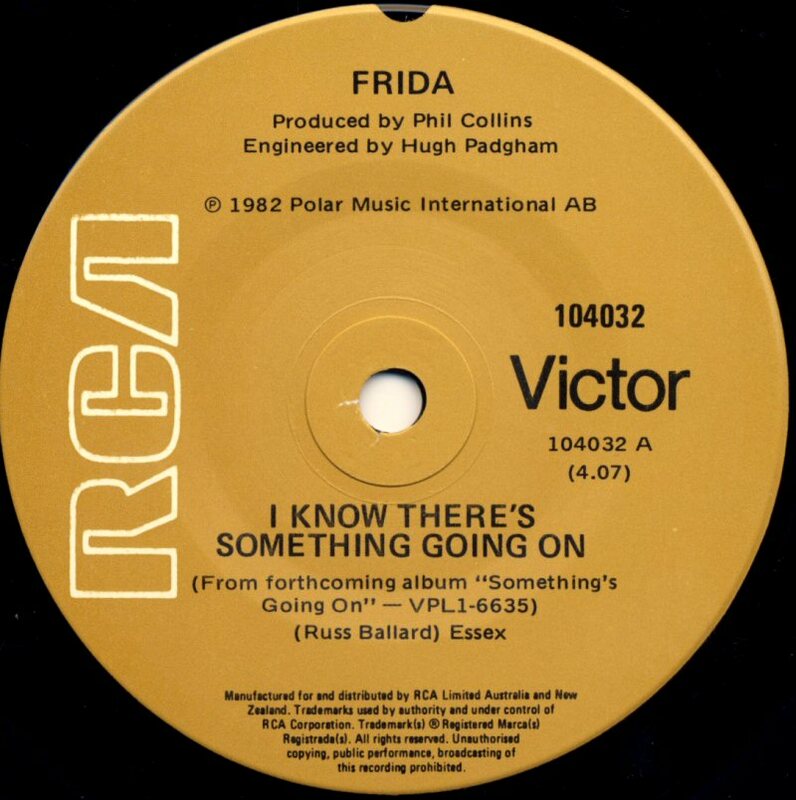 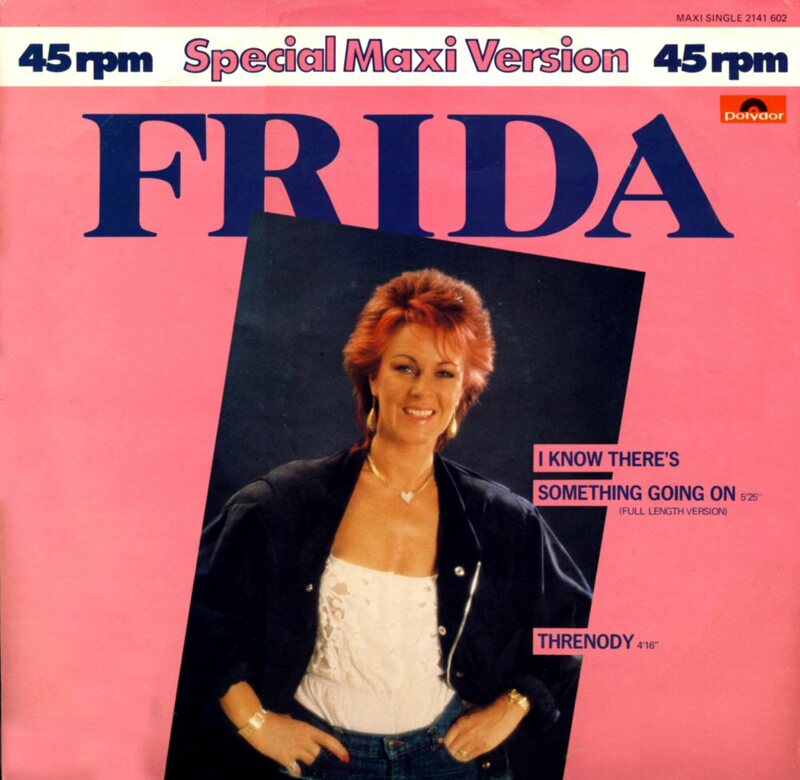 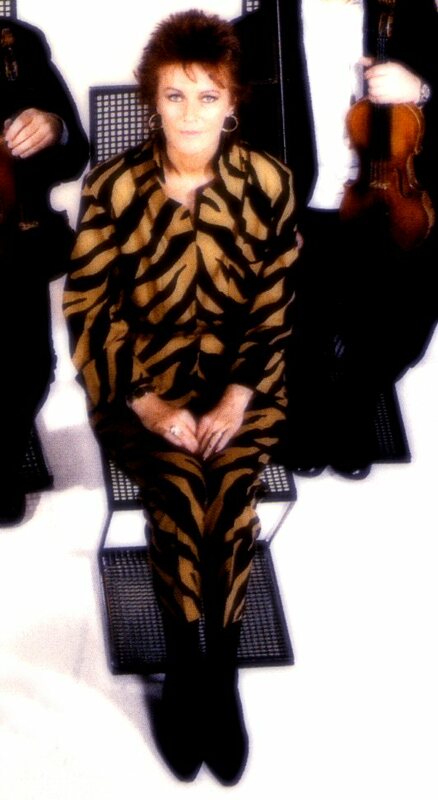 The first single "I Know there's something going on" became though a big success for Frida both in Europe and USA. In Sweden the album entered the chart on September 28th, 1982 where it stayed for 20 weeks reaching #1 (for 4 weeks). 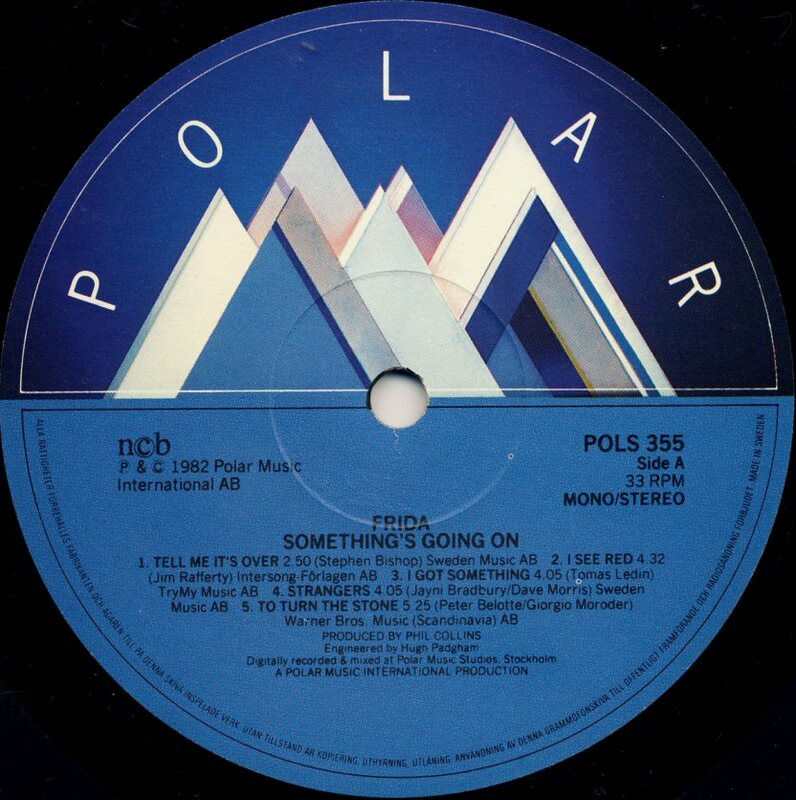 In Norway "SGO" entered the chart on September 16th, 1982 and stayed there for 16 weeks peaking at #2. 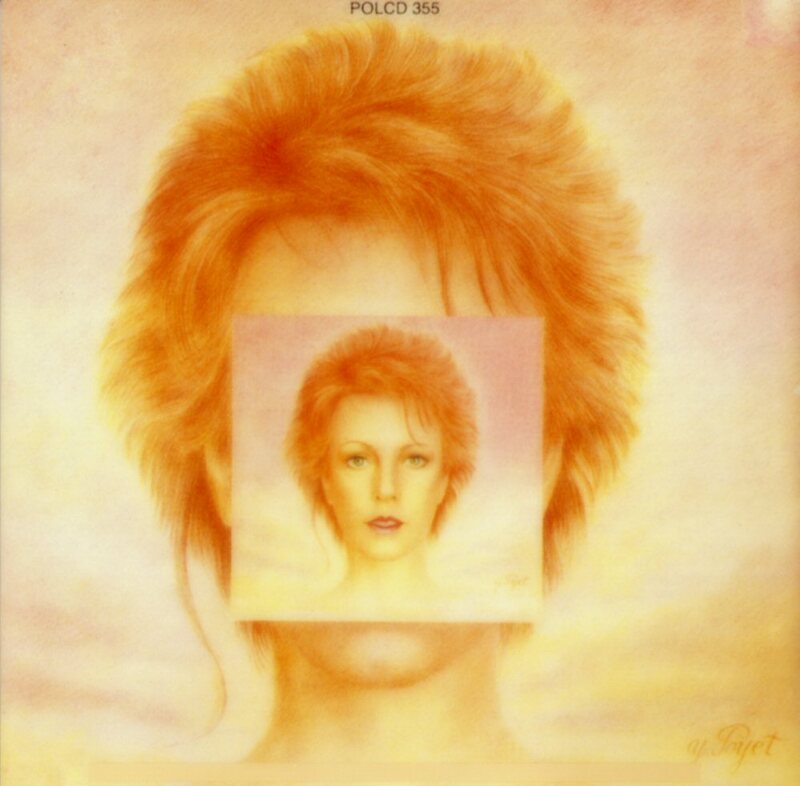 In the UK the album entered the chart on September 18th, 1982 and it stayed for 7 weeks reaching #18. 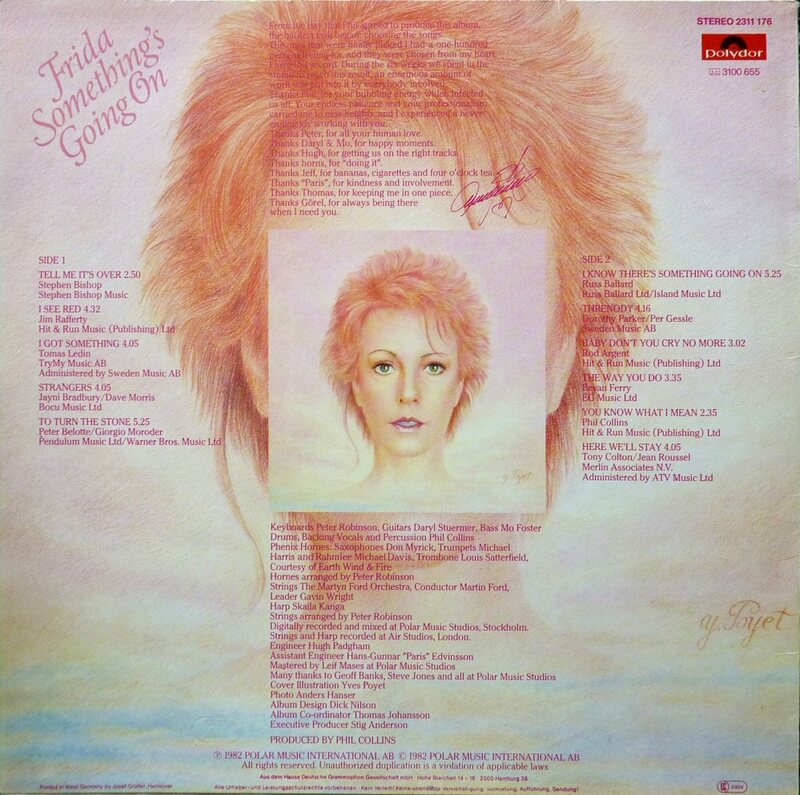 In West Germany the album "SGO" stayed on the chart for 16 weeks peaking at #12. I was very honoured when Frida wrote a personal dedication to me on the Polydor release of the album just before her appearance on German TV. 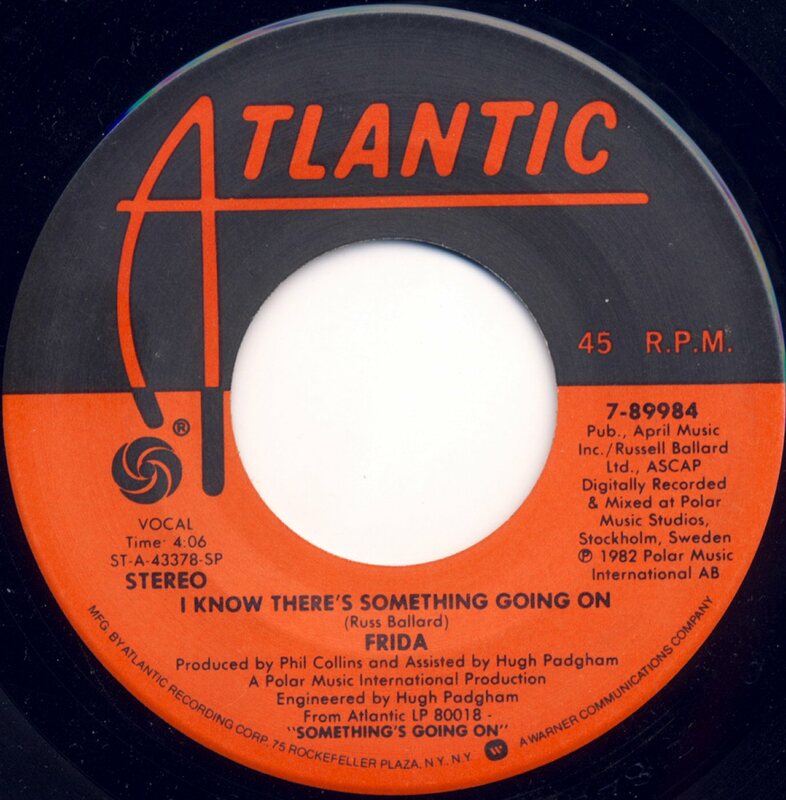 The single "I Know there's Something Going On" became huge in USA and even the album became a big hit in the States staying on the chart for 28 weeks peaking at #41. 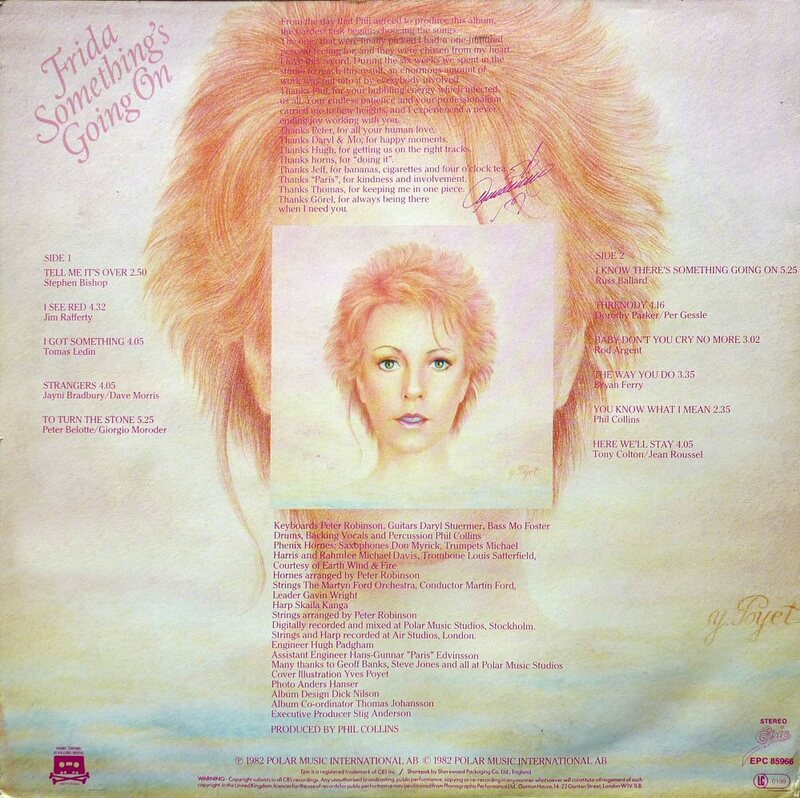 The album was not so popular in Canada as in USA but the Canadian release was very nice with a real thick cover and innercover on a glossy paper. 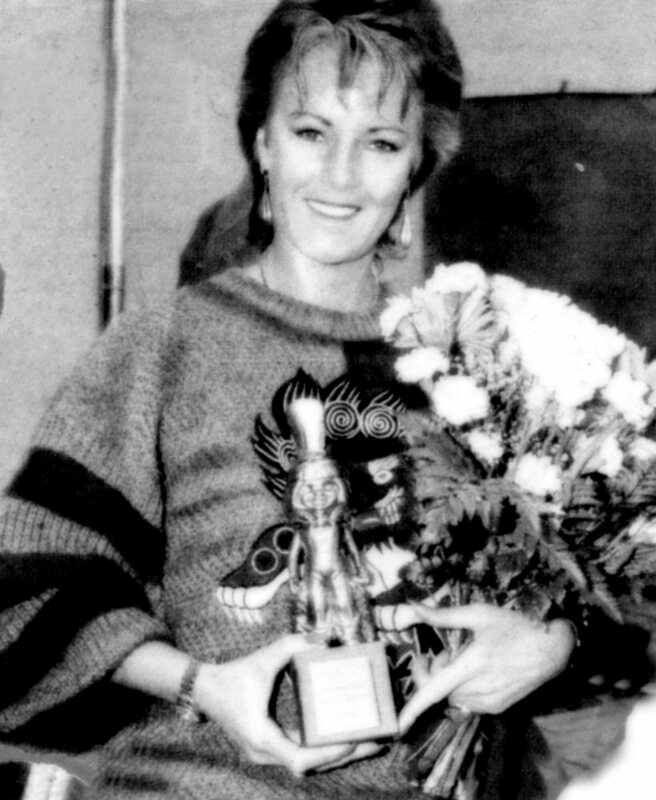 Frida as a solo artist enjoyed a big success in Poland. 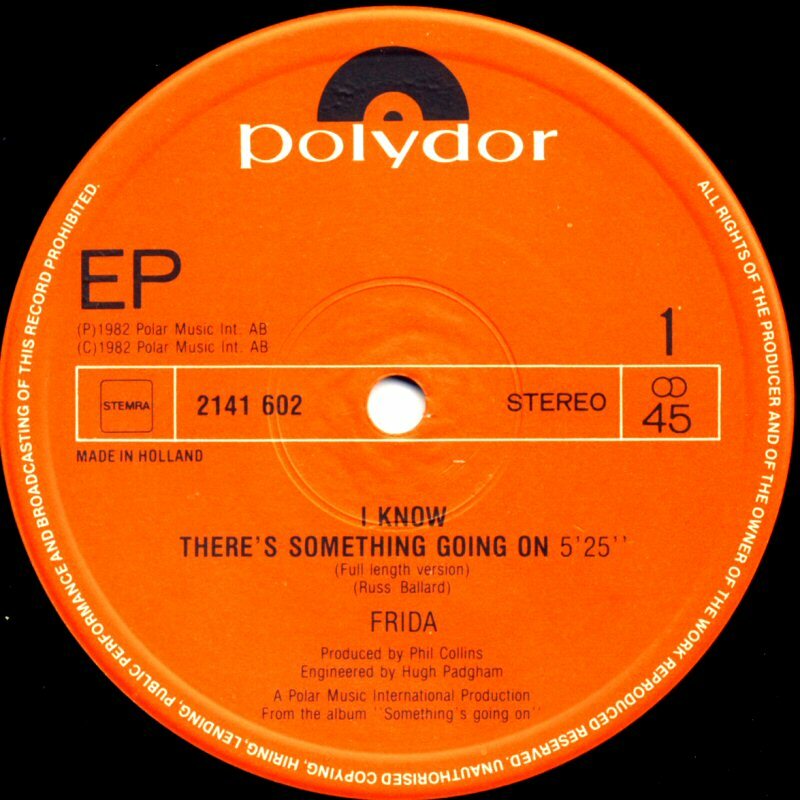 "I Know There's Something Going On" entered the Polish Power Play chart on 25 September 1982 directly in the Top Ten on #9. 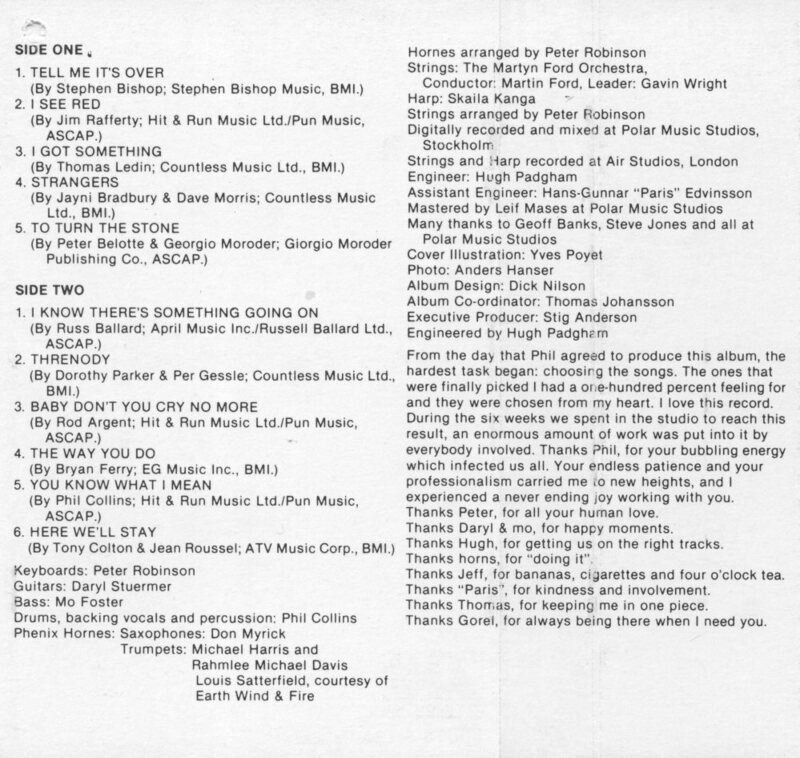 One week later it reached #3 where it stayed for 4 weeks. 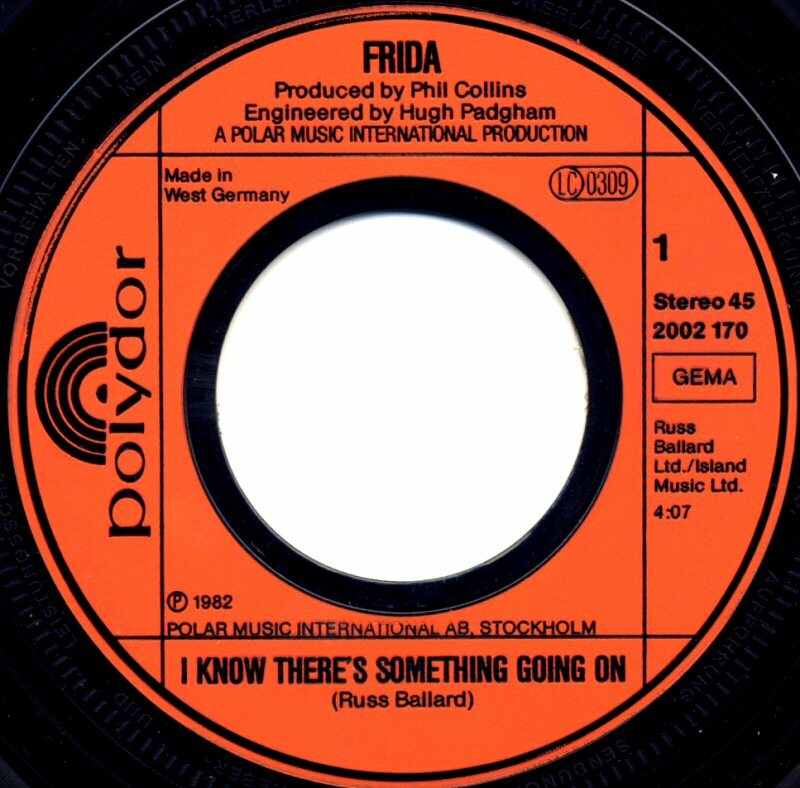 Totally "I Know There's Something Going On" stayed on the Polish chart 9 weeks. Polish record company "Poljazz" released the album "Something's Going On" in Poland. 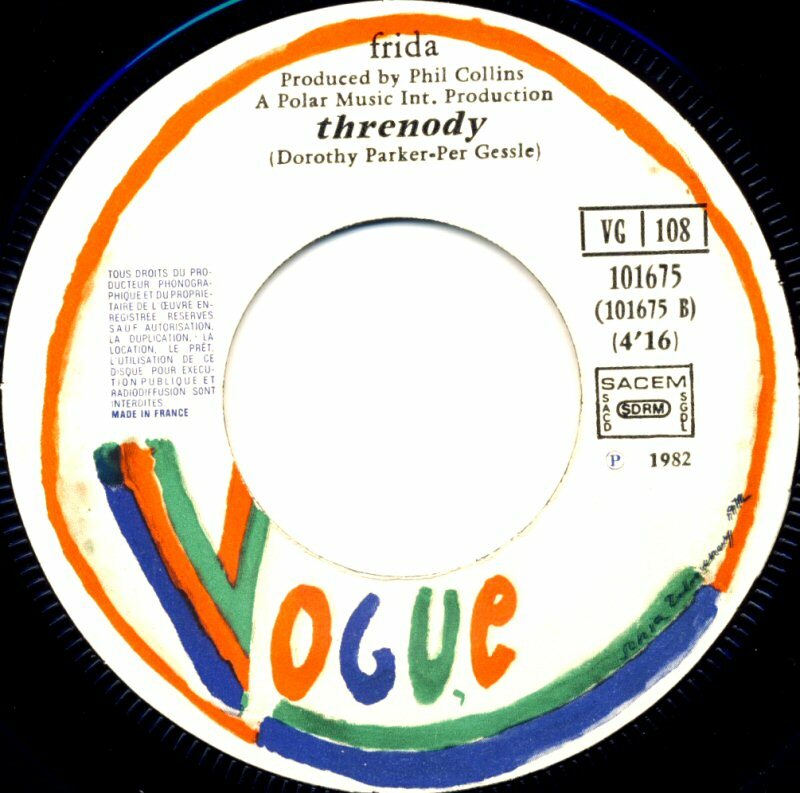 The album's cover was different to the all international releases. 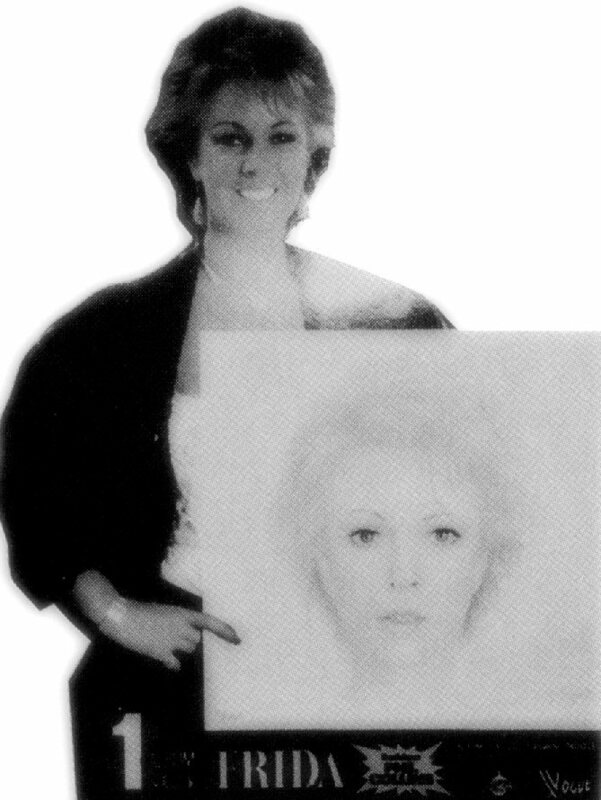 It featured the real picture of Frida and not the painting of Y. Poyet. 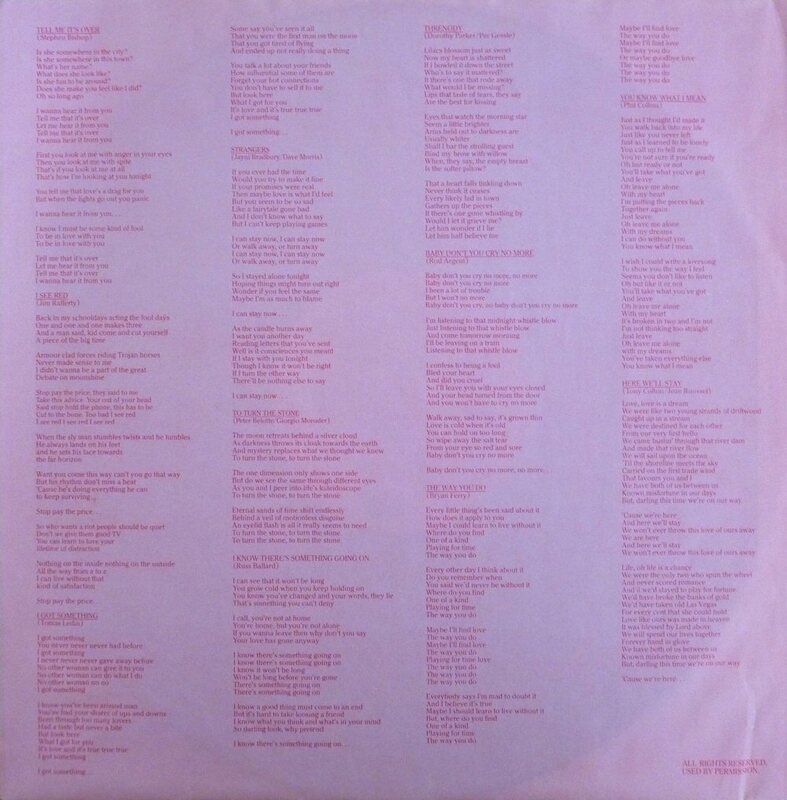 Even the lay-out on the back sleeve was slightly different comparing with the international releases. 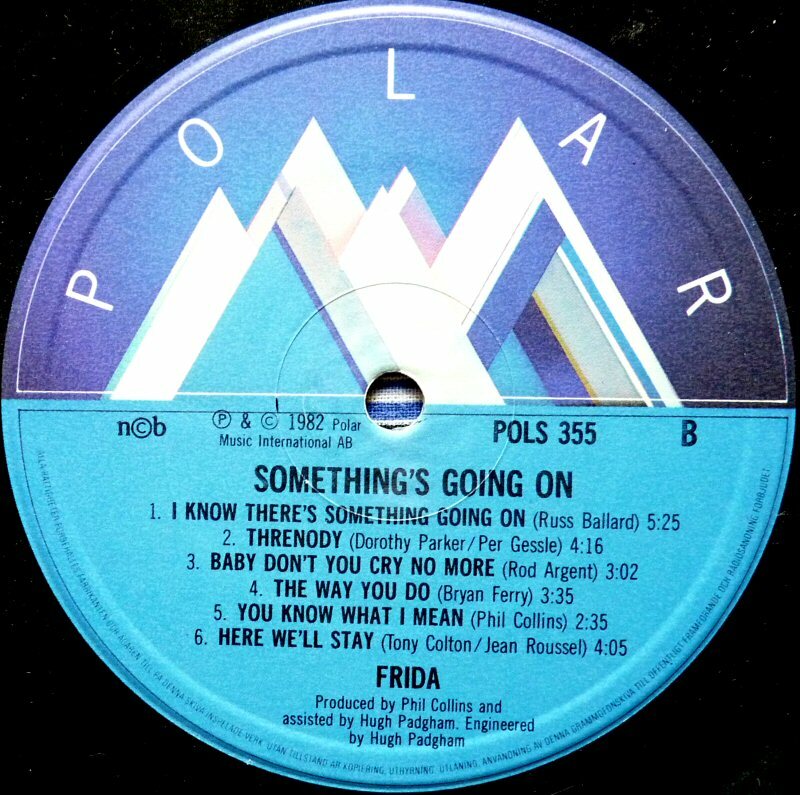 "Something's Going On" was released even in South America and in Asia. 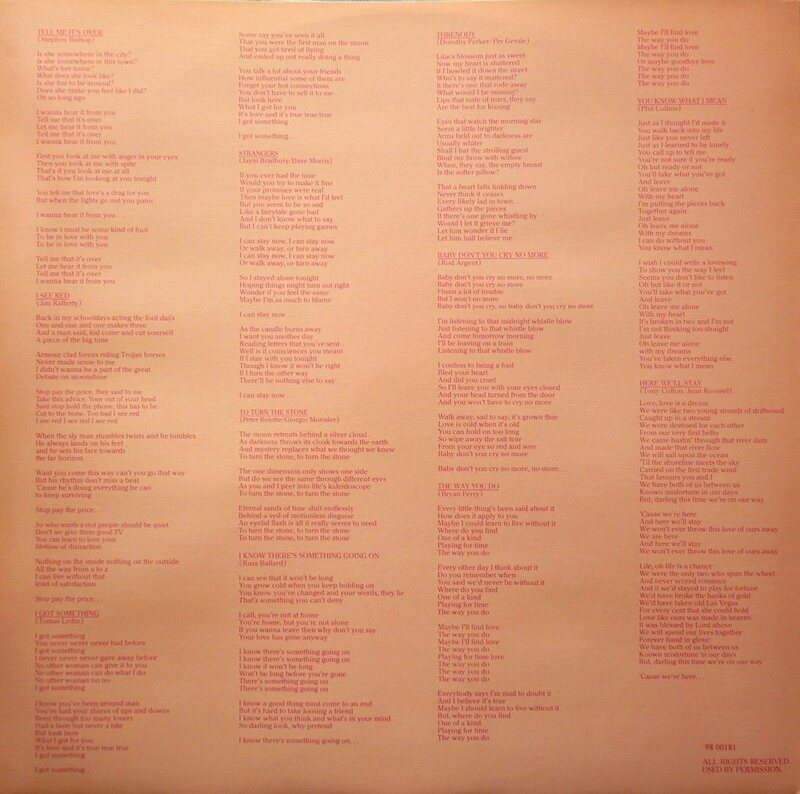 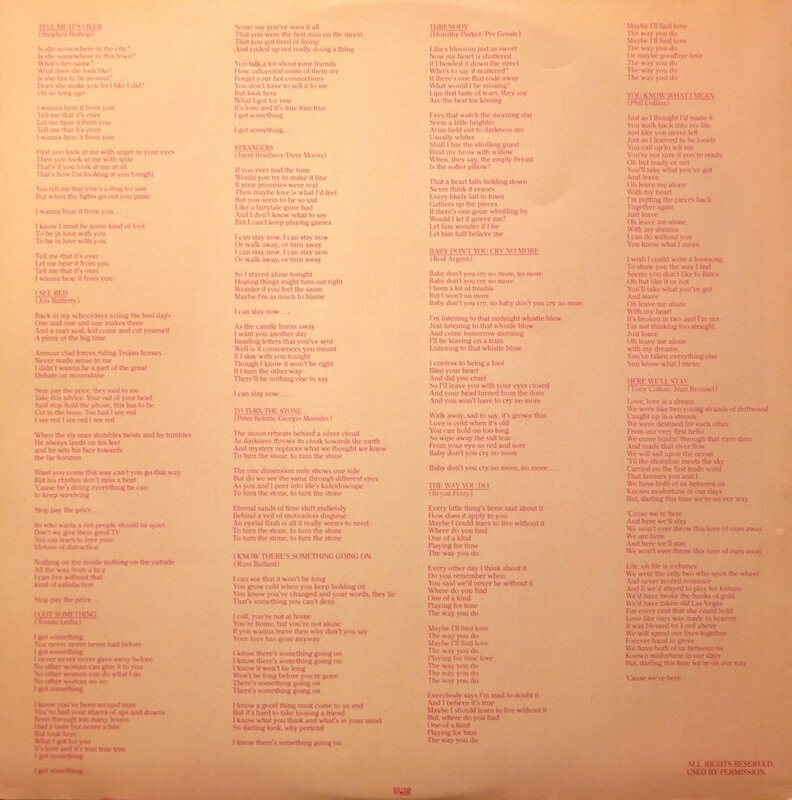 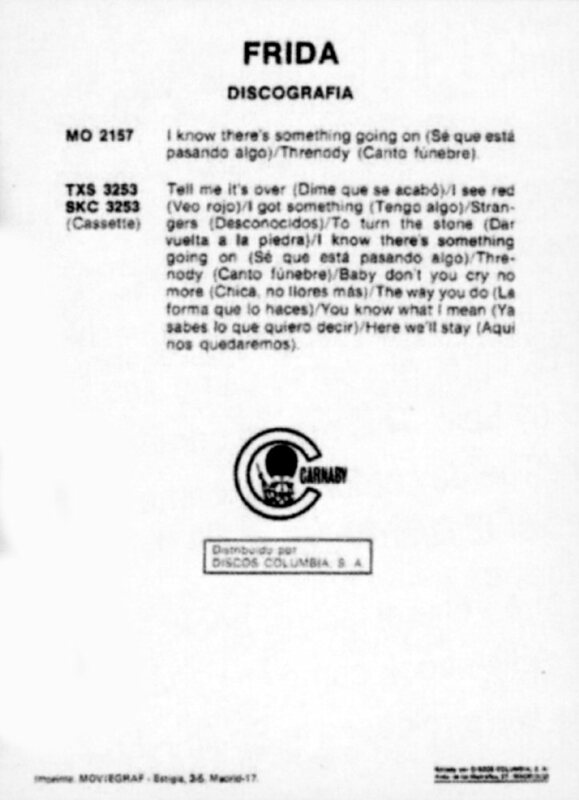 The Mexican release featured slightly changed backcover with different colour tone and all songs titles translated into Spanish. 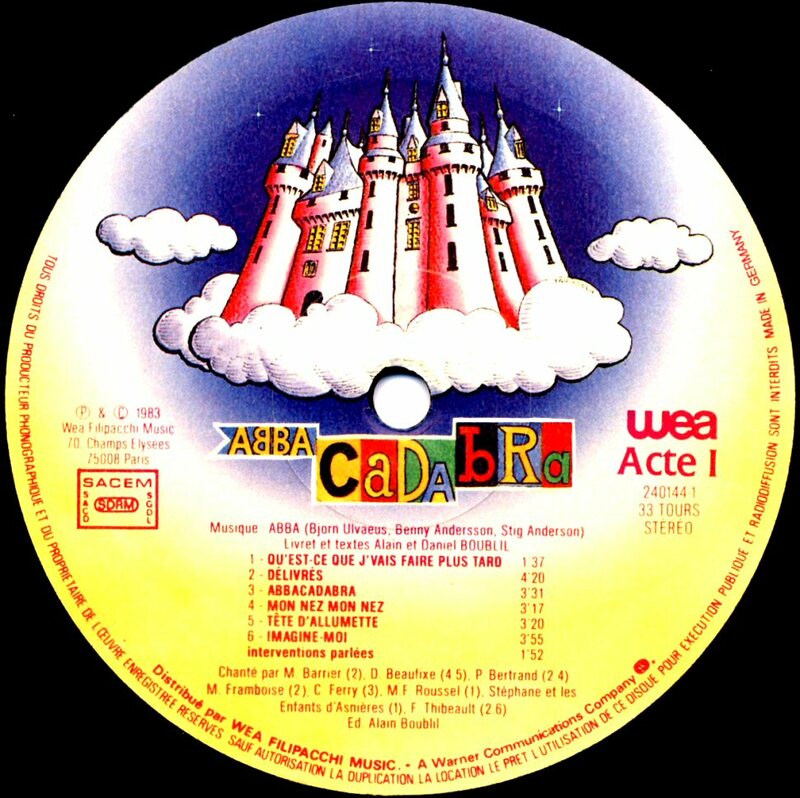 The Asian cassette had different track listing and two additional tracks taken from the ABBA album "Arrival": Why Did It Have To Be Me and Dum Dum Diddle. 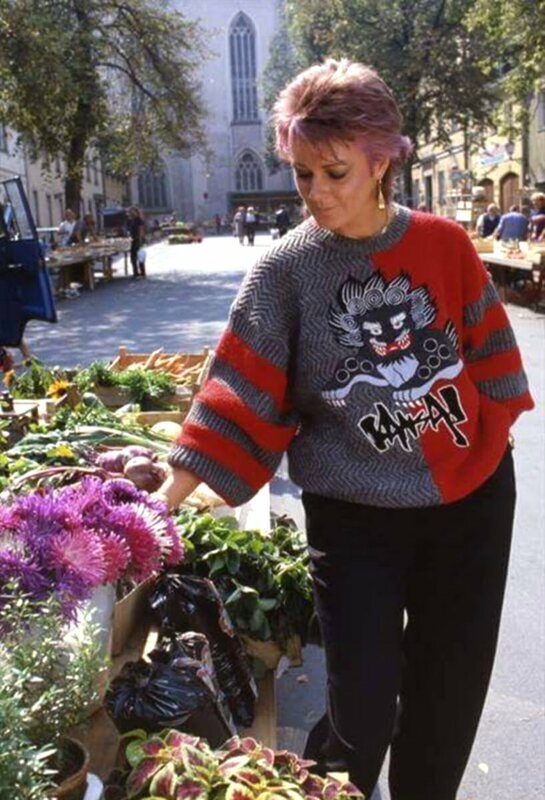 Frida did an enormous promotional work. 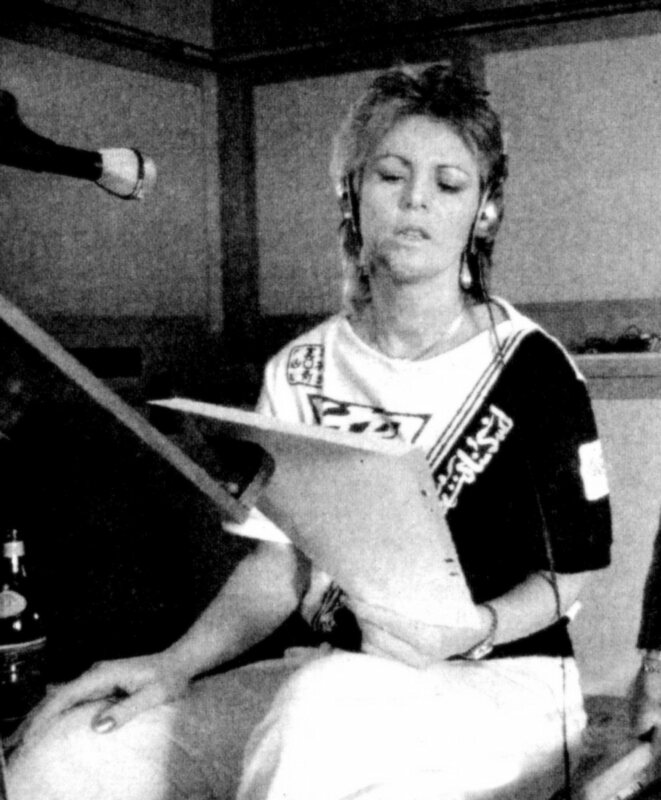 She traveled all over the world and it still seems strange that she had time over to do November-December promotion for the ABBA compilation album "The Singles - The First Ten Years". 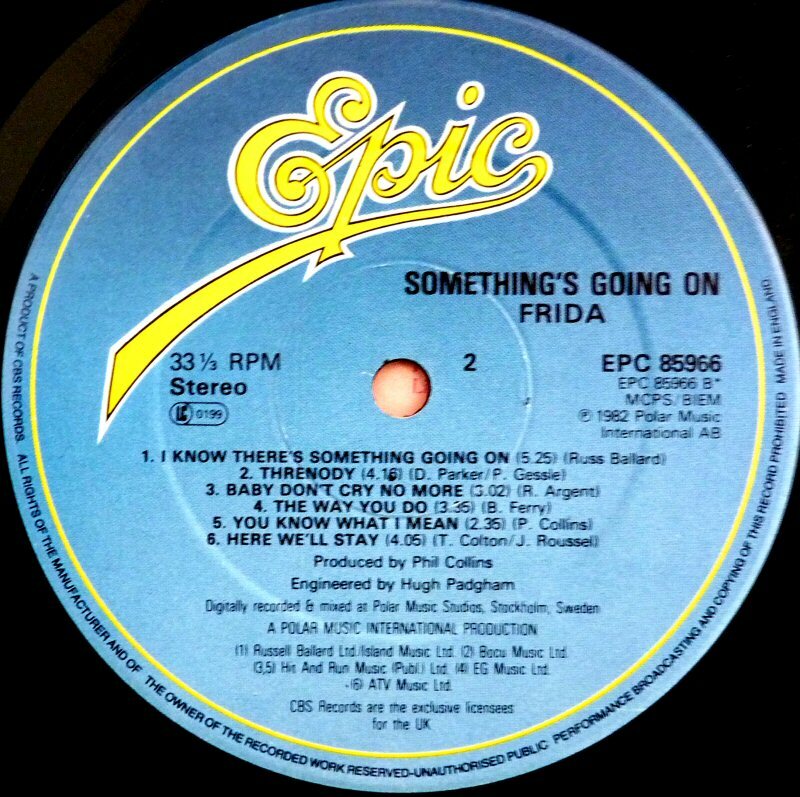 "Something's Going On" was released on CD in 1983 and the re-mastered version with bonus tracks in 2005. 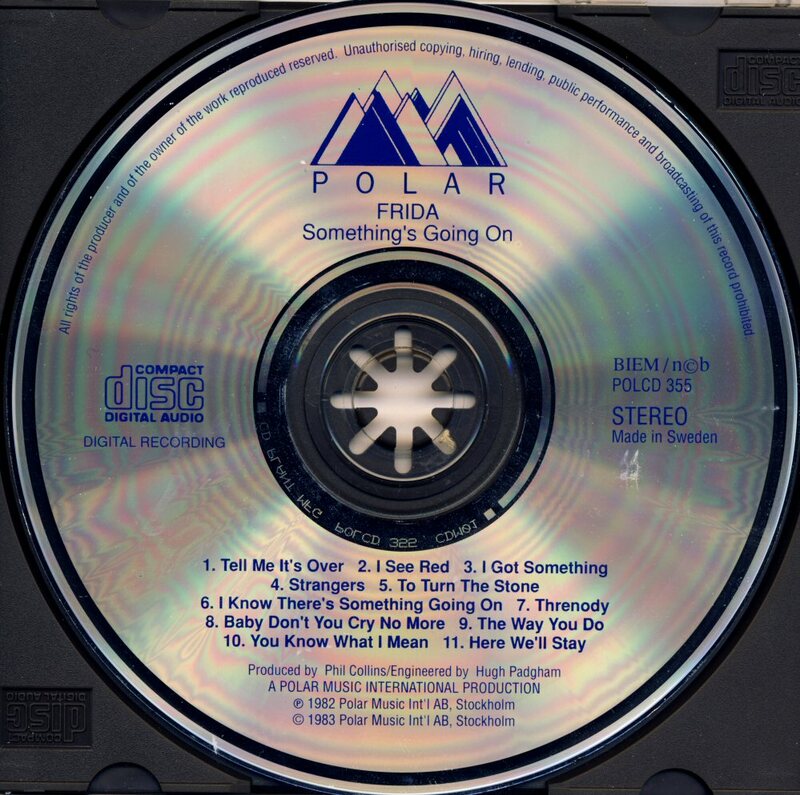 Traditionally Polar Music AB released promotional stuff as stickers, buttons, budges and postcards. 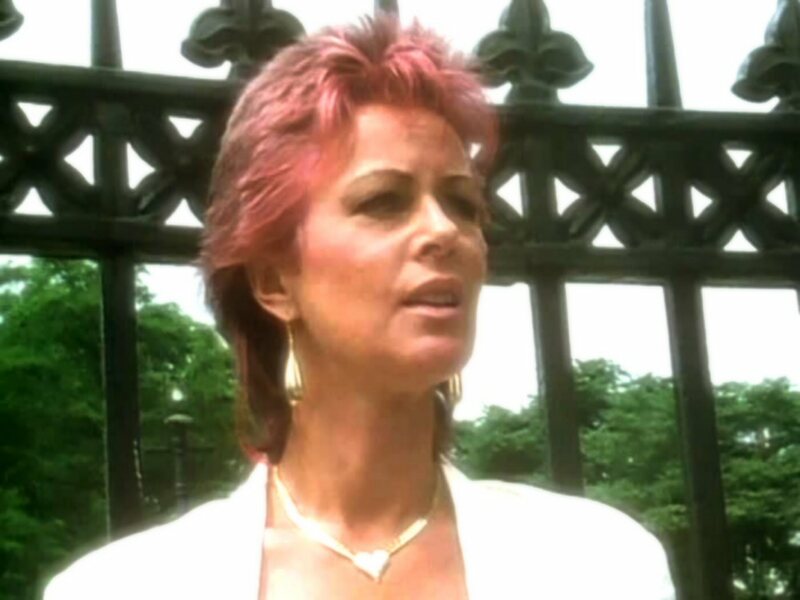 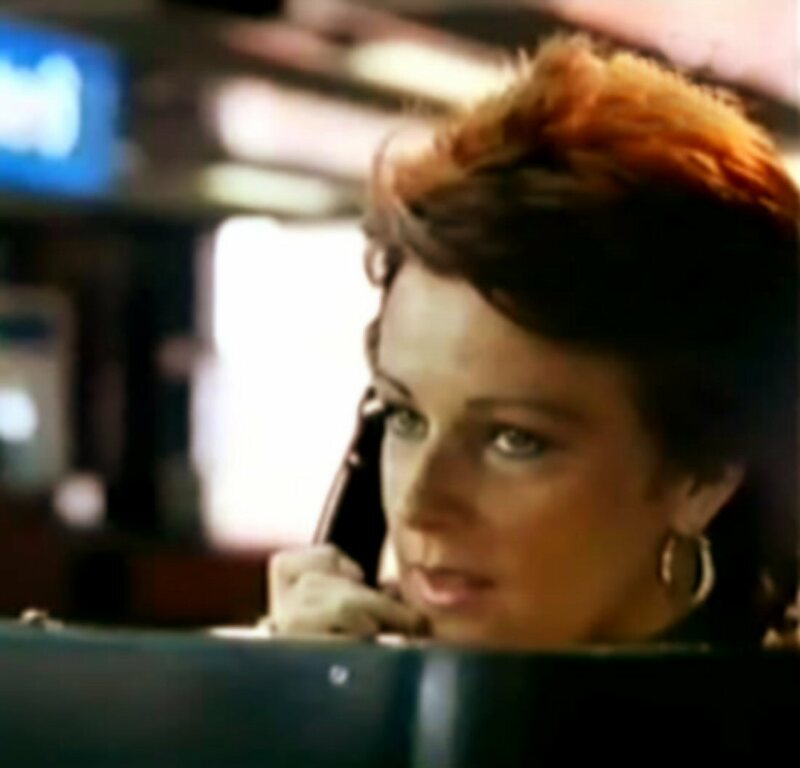 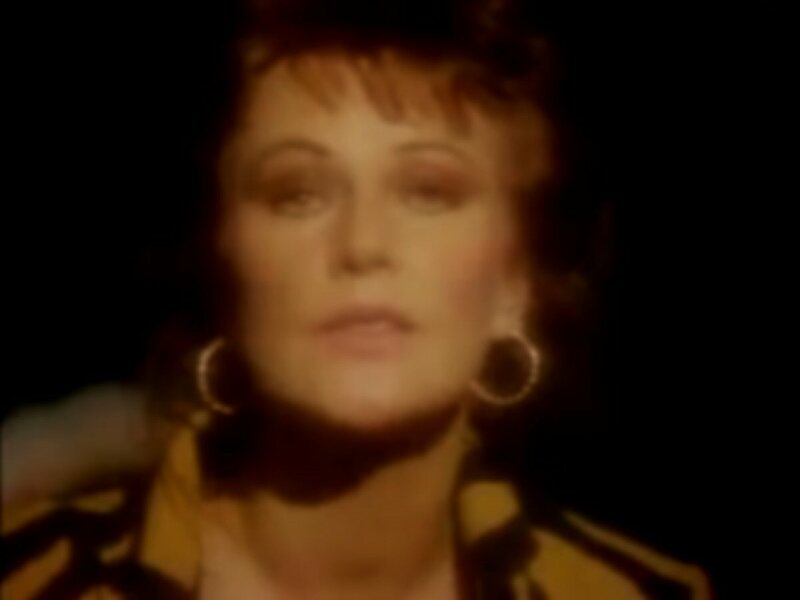 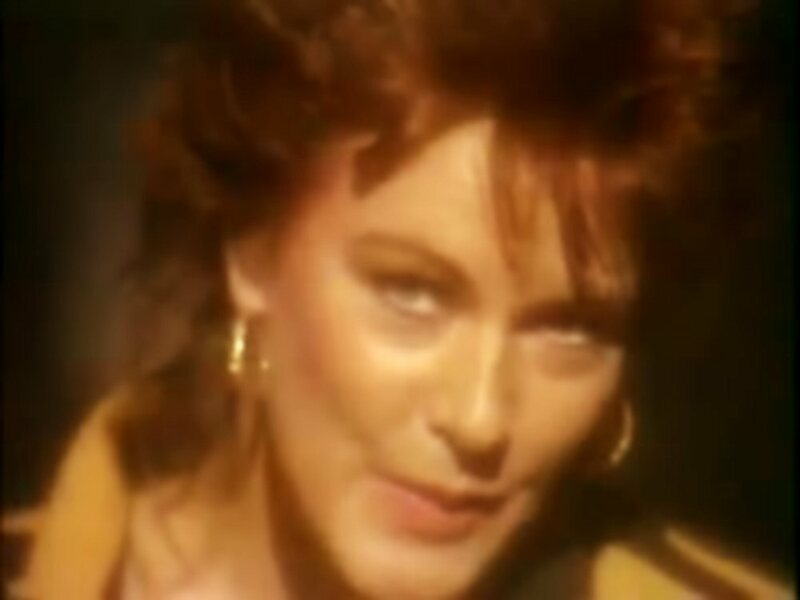 The first video promoting "I Know There's Something Going On" was filmed in London in the spring 1982. 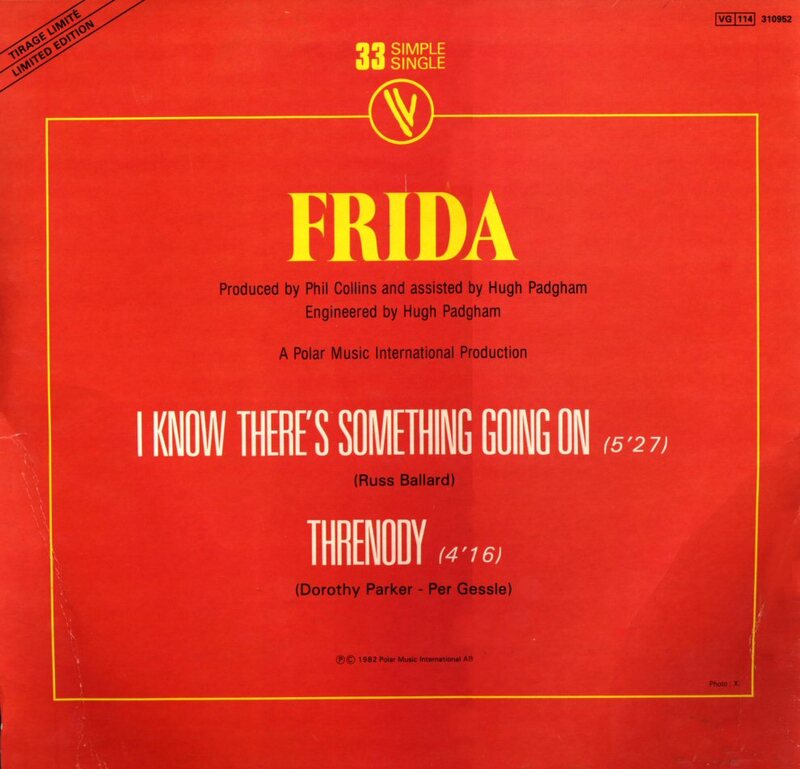 Frida played a woman who was cheated by her husband/boyfriend with another woman. 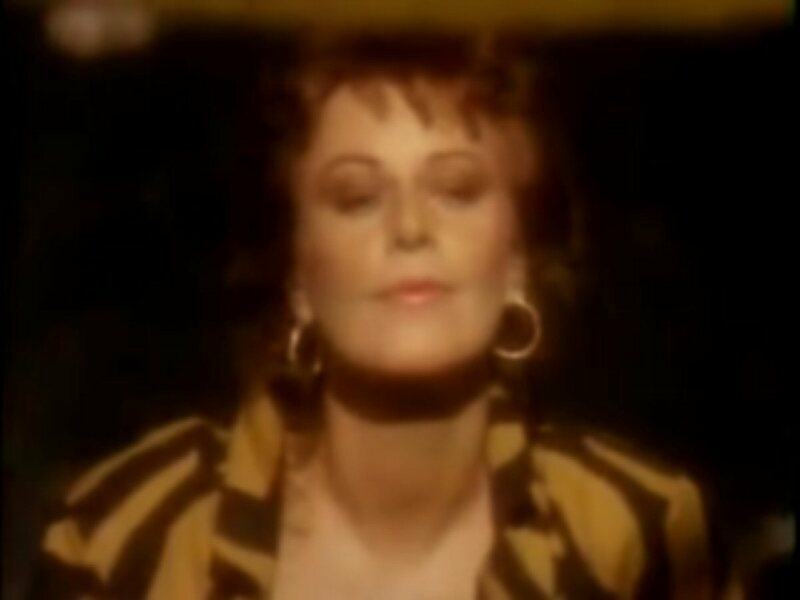 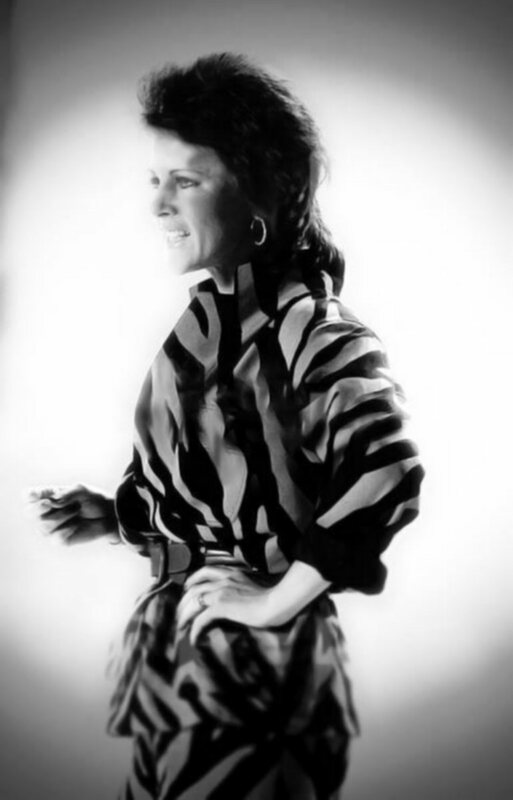 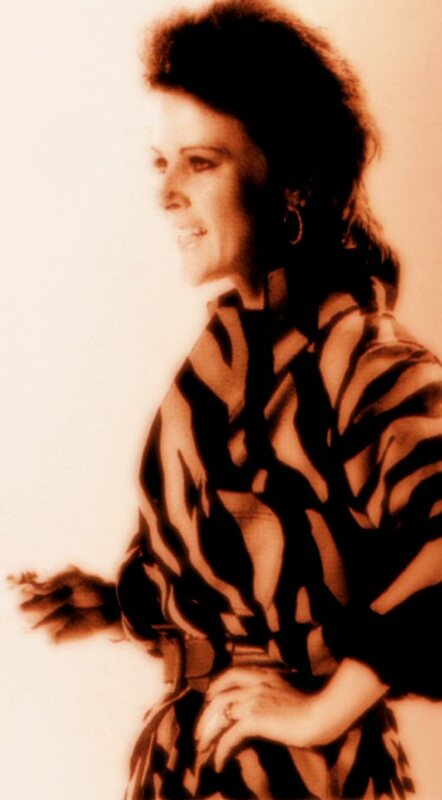 The video was filmed on following locations (in sequence order): Primrose Hill Photographic Studios, "Stringfellows Discotheque", Fulham Film Studios (bedroom set), Little Venice and Covent Garden. 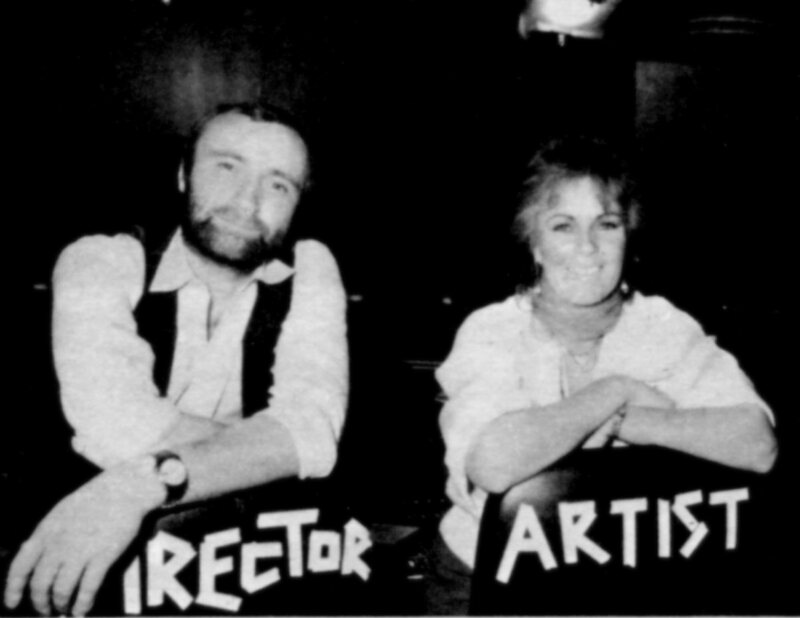 The director was Stuart Orme. 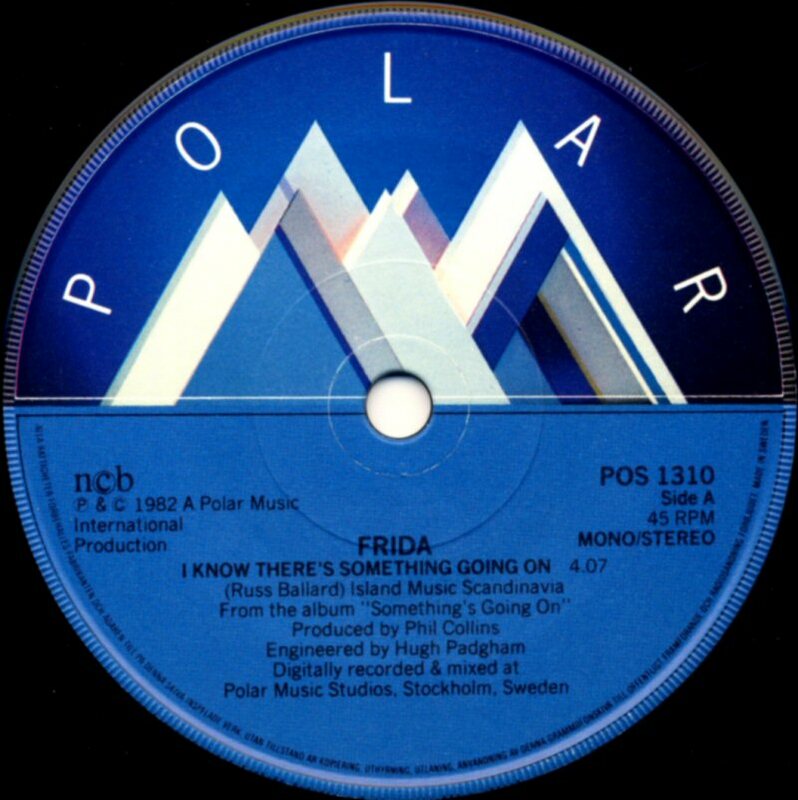 After the release of both the album and the single, Frida embarked on an intensive promotional tour around Europe and to Northern America. 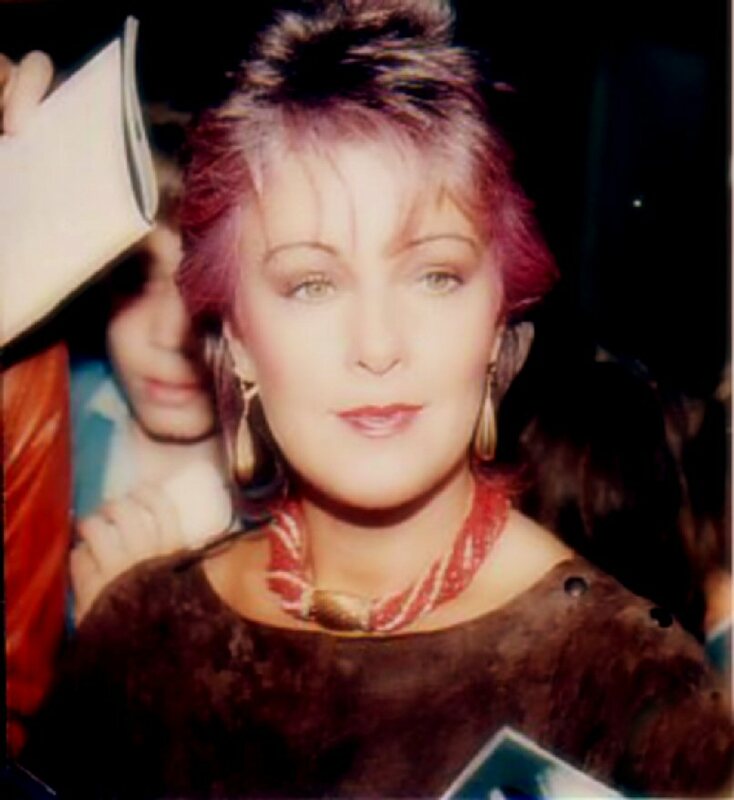 She met press and performed on TV in England, Germany, France, Austria, Holland, Denmark, Finland, Switzerland and Sweden. 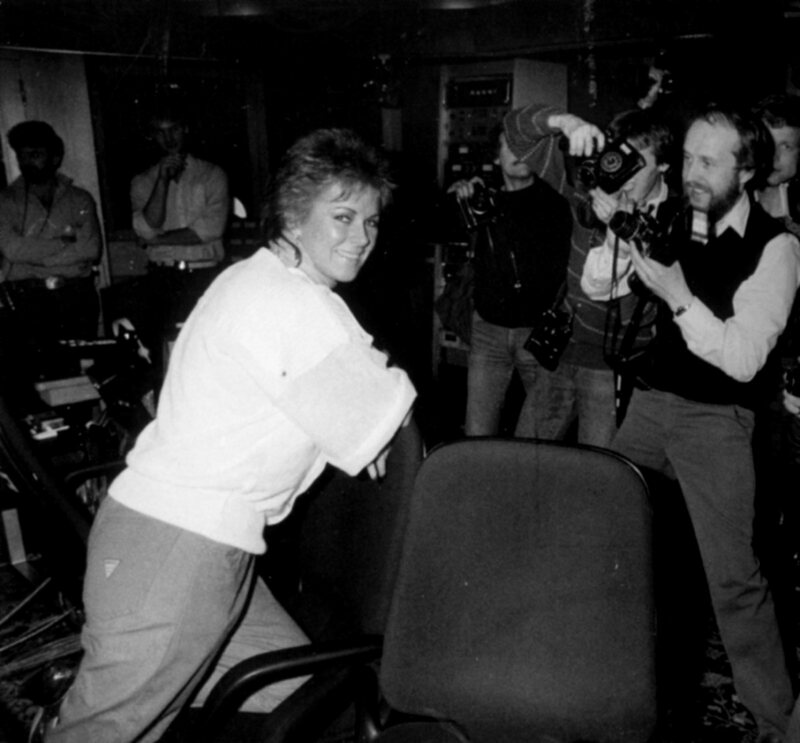 On September 7th, she paid a four-hour visit in Norway where she was interviewed by Norwegian TV at the Globetrotter hotel at the airport Fornebu in Oslo. 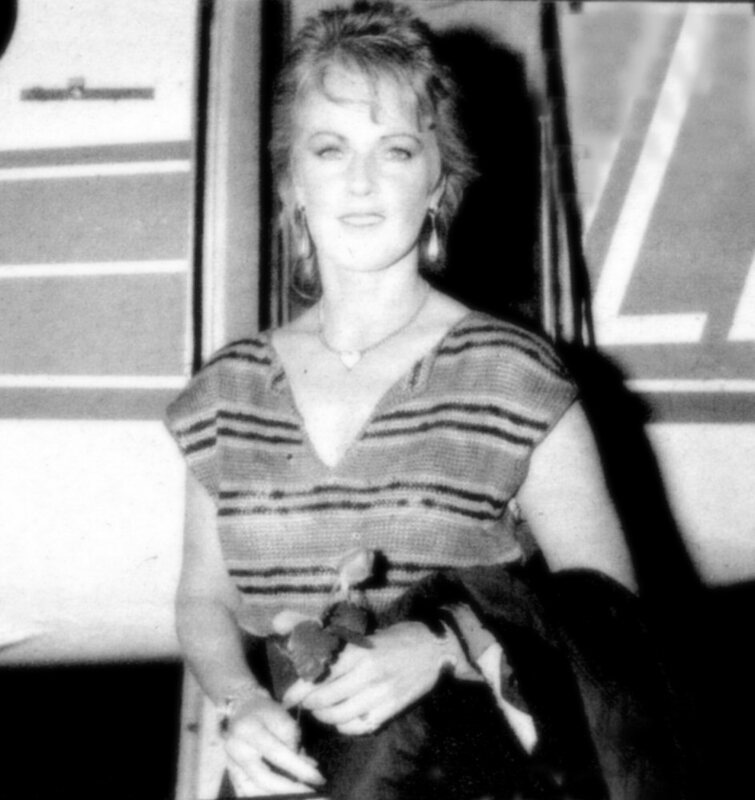 Some hours later she arrived in Hamburg (flight at 5 pm). 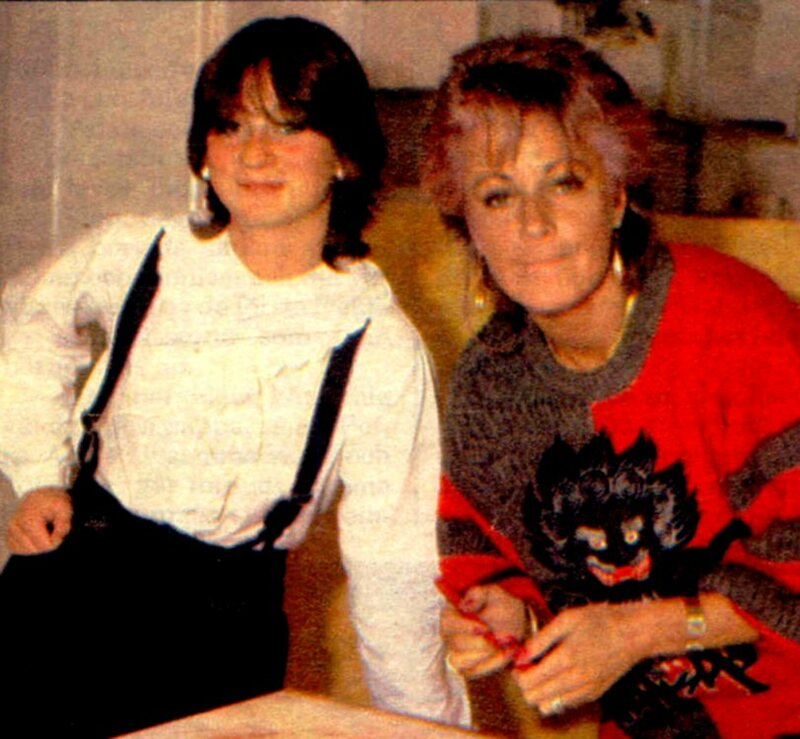 On September 9th, she appeared in "Show Express" and "Tele-illustrierte" in West Germany. 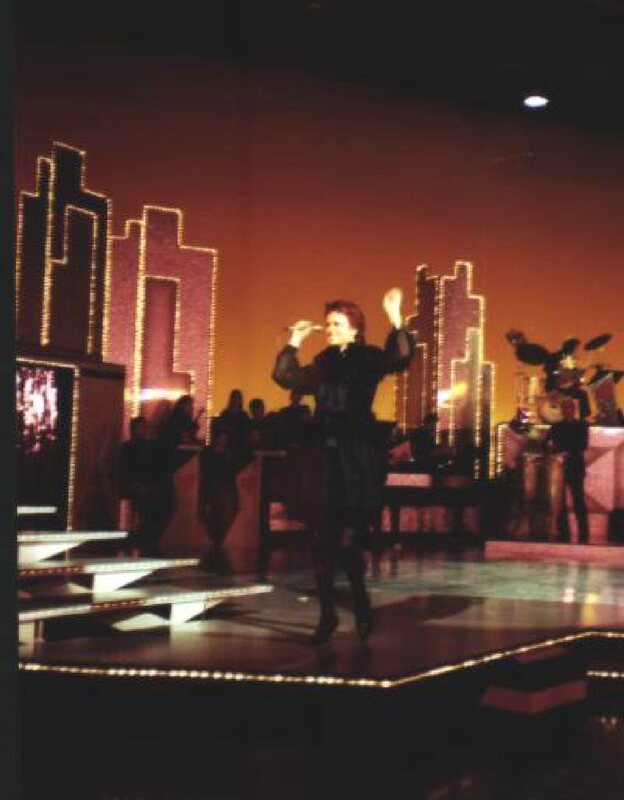 In "Show Express" she performed "I Know There's Something Going On" and "Baby Don't You Cry No More". 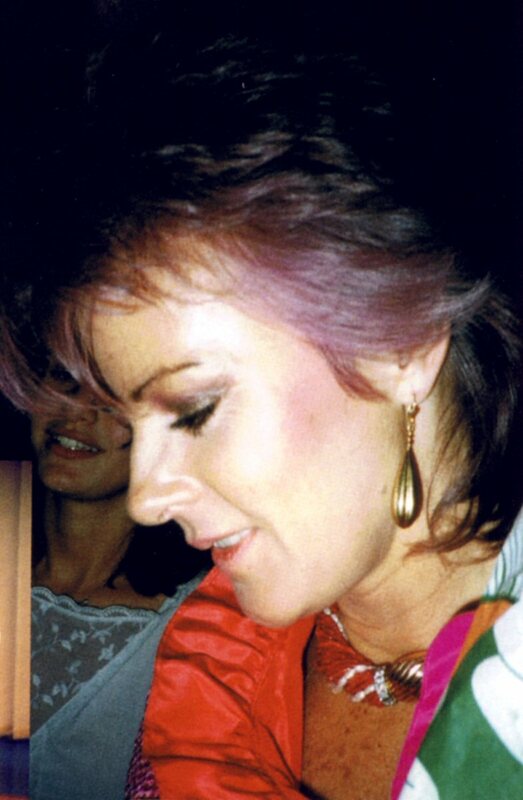 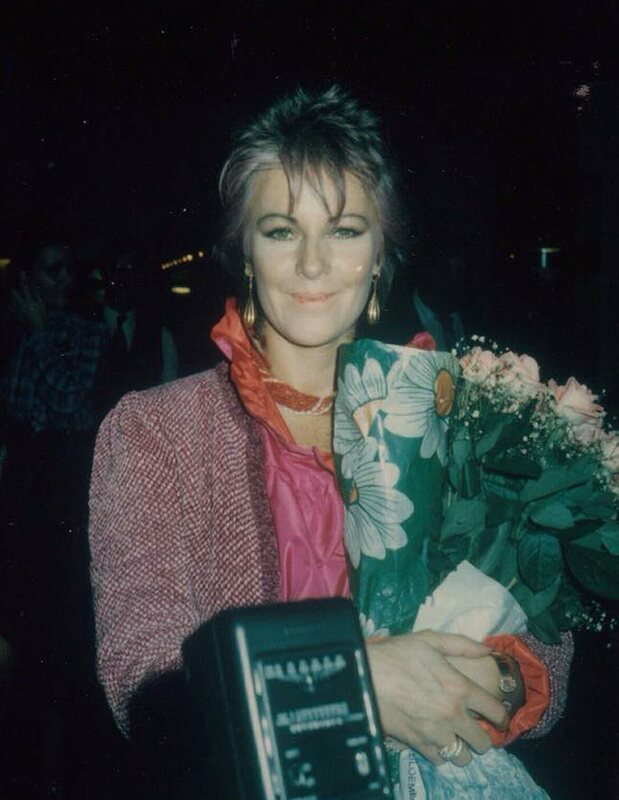 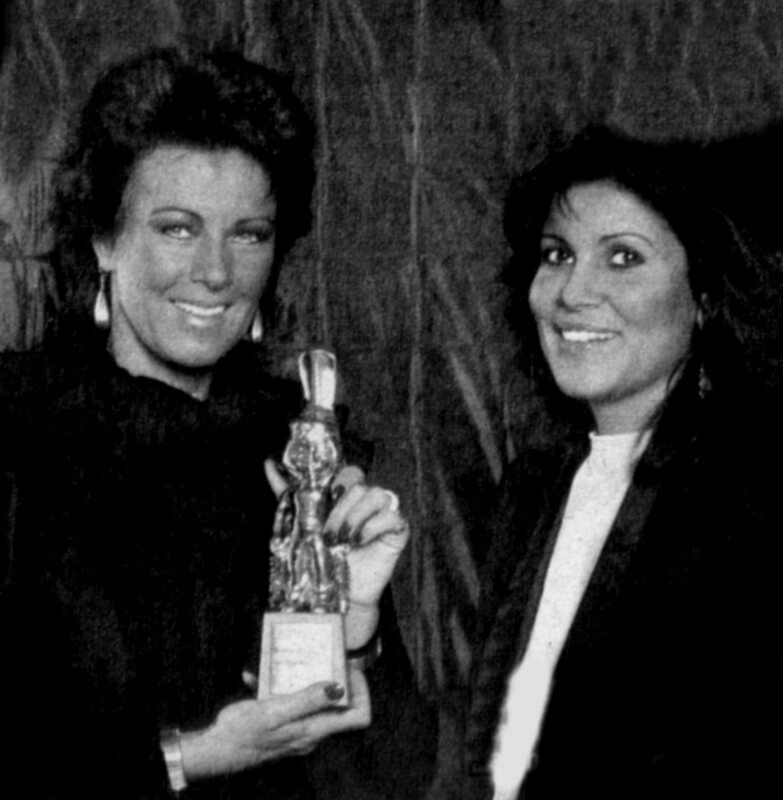 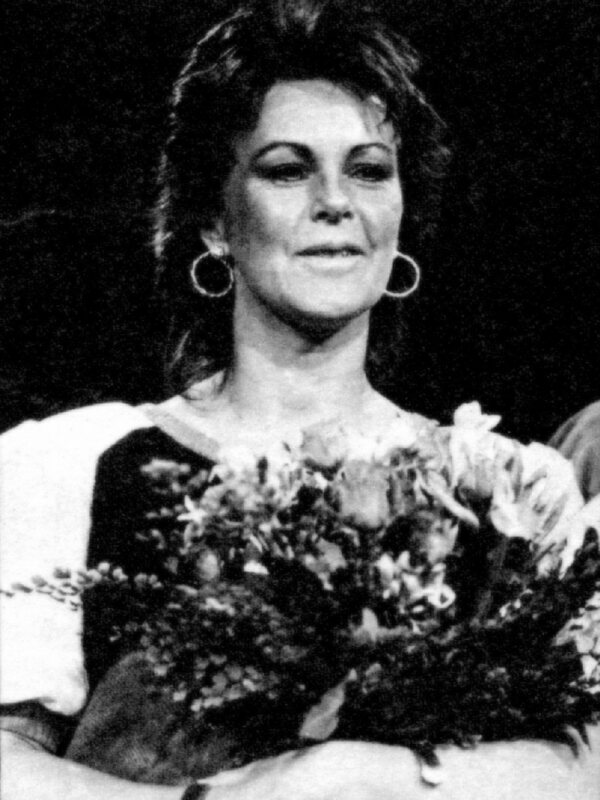 After the show Frida received the third Otto-prize for ABBA as the third best group in West Germany in 1981. 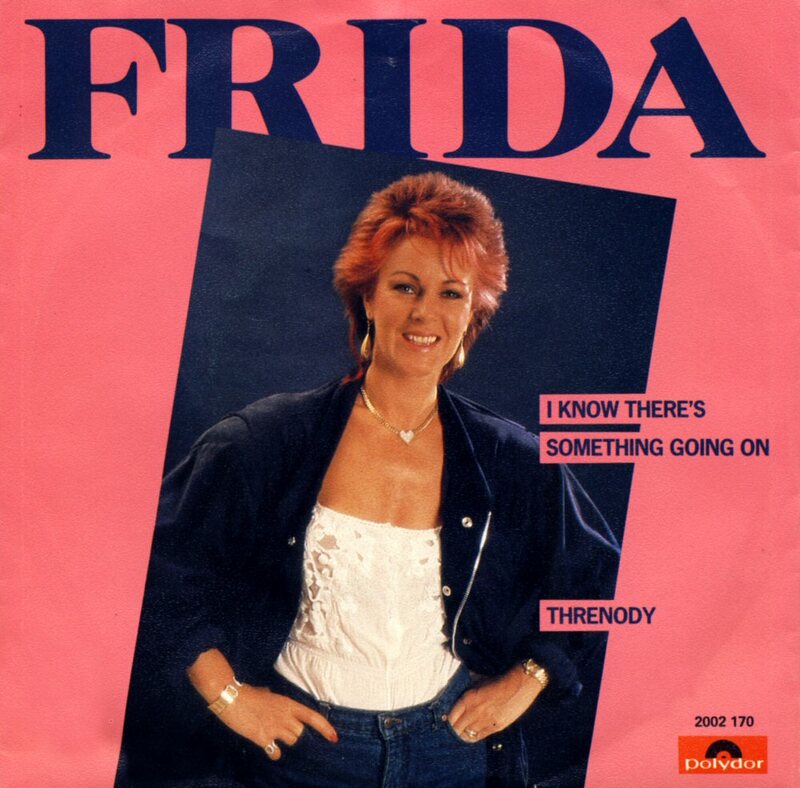 In "Tele-illustrierte Frida performed "I Know There's Something Going On". 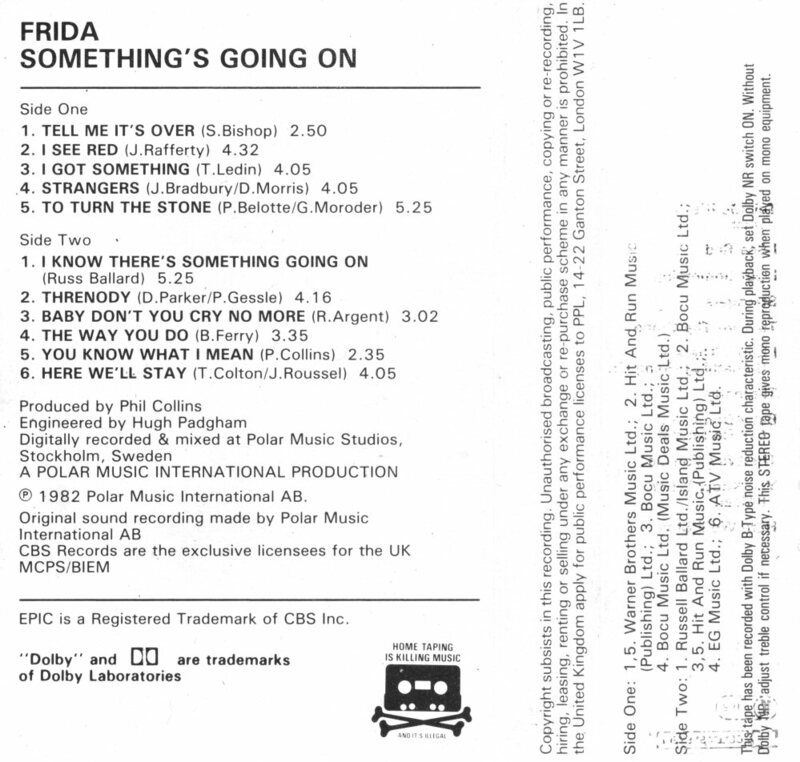 Frida were in London on September 13-16. 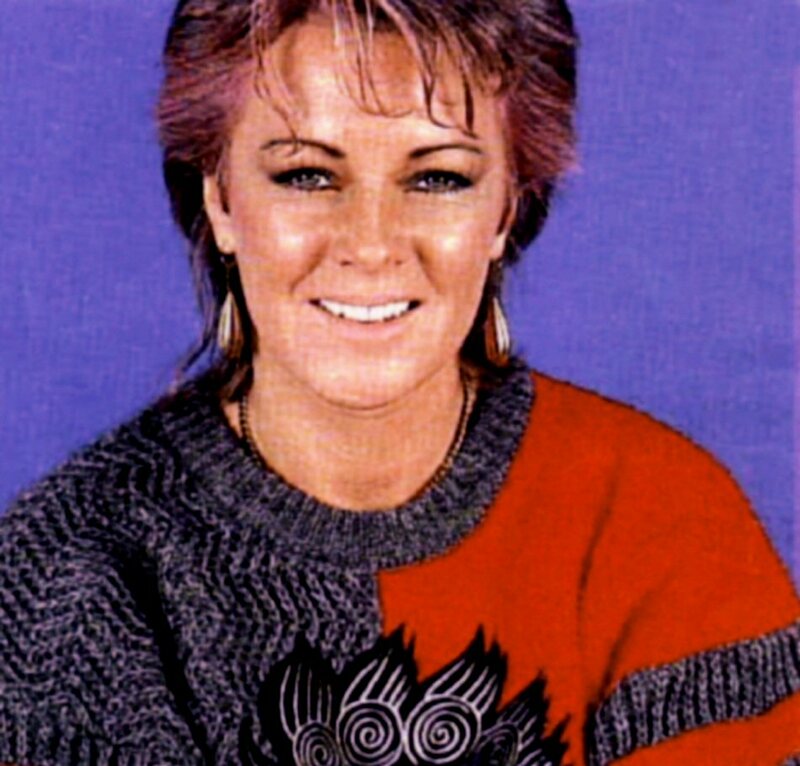 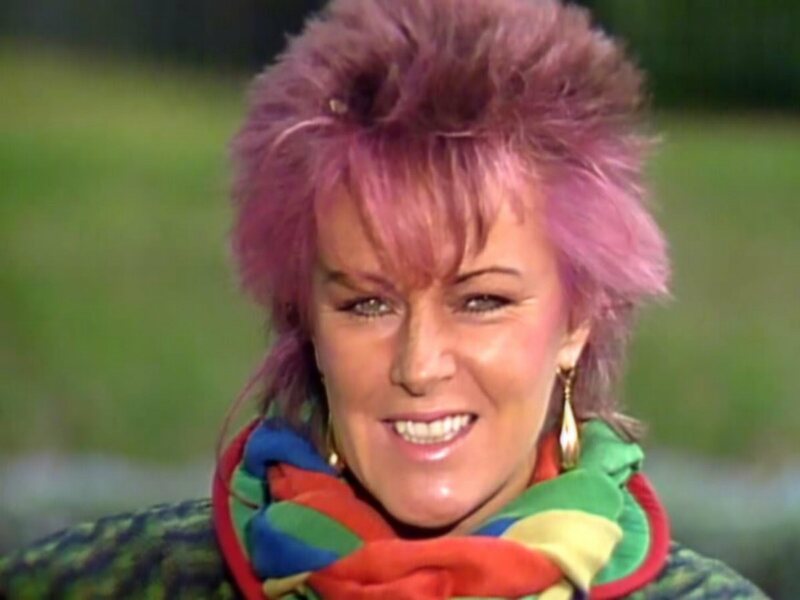 She gave several interviews and participated in the TV shows Nationswide and Top of The Pops. 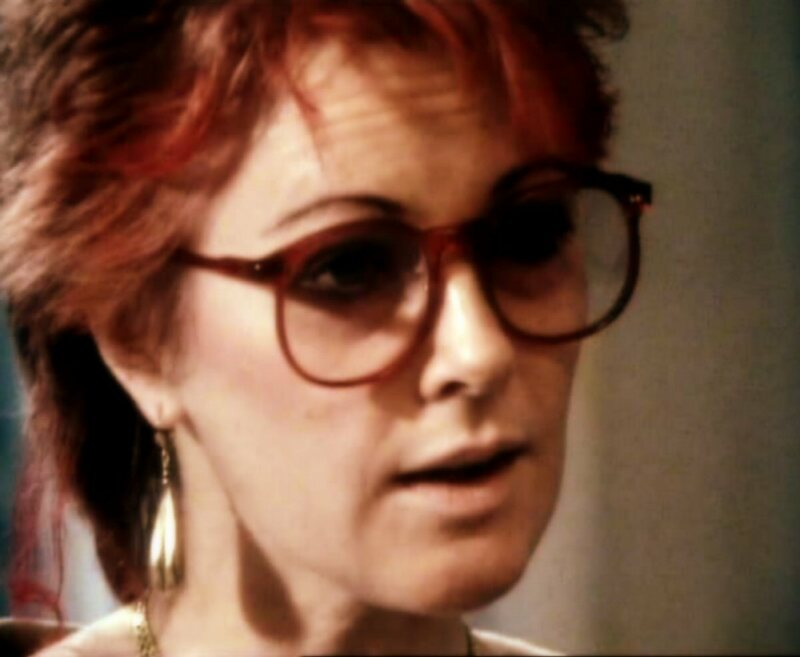 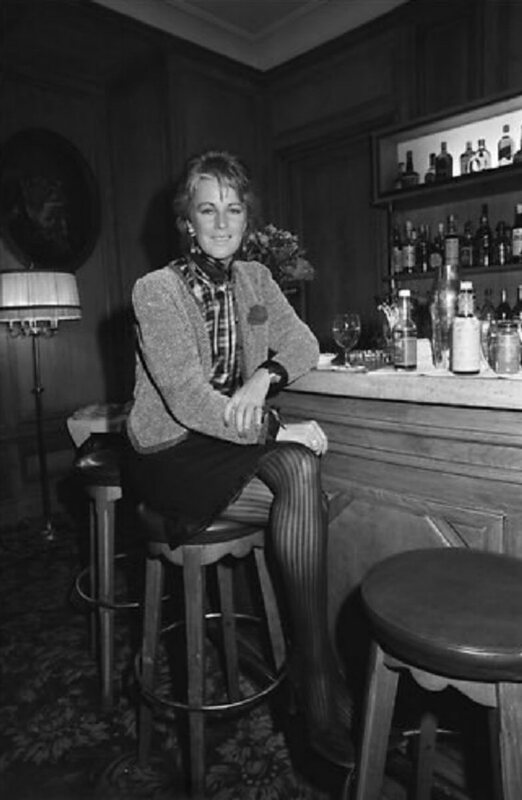 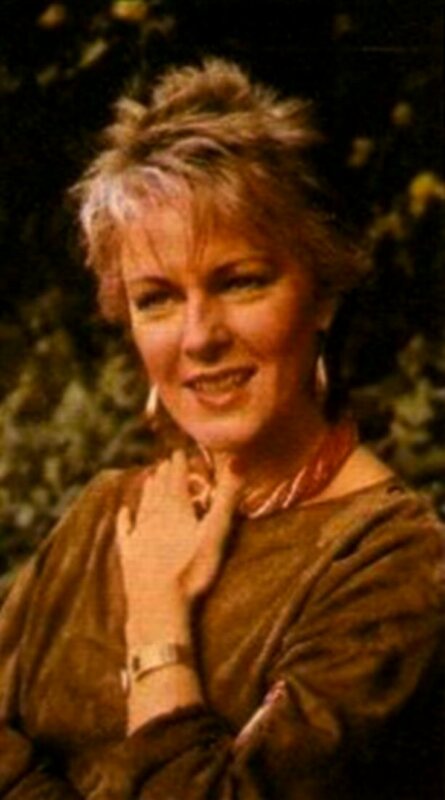 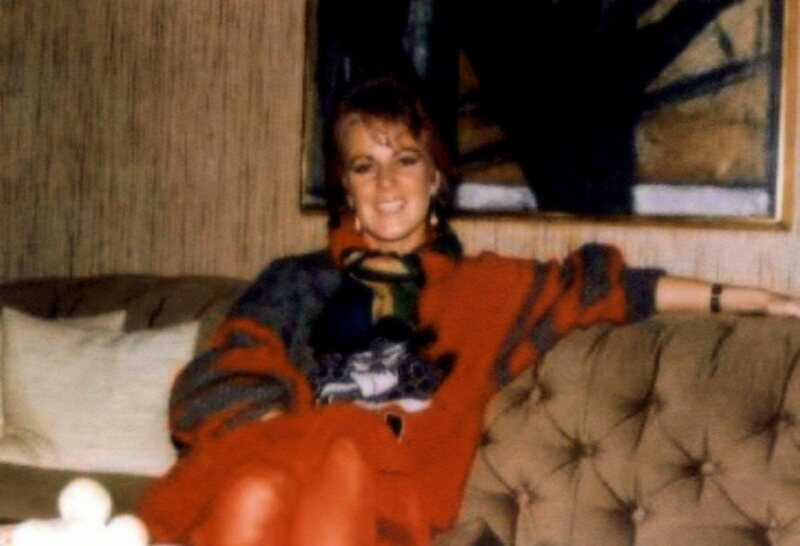 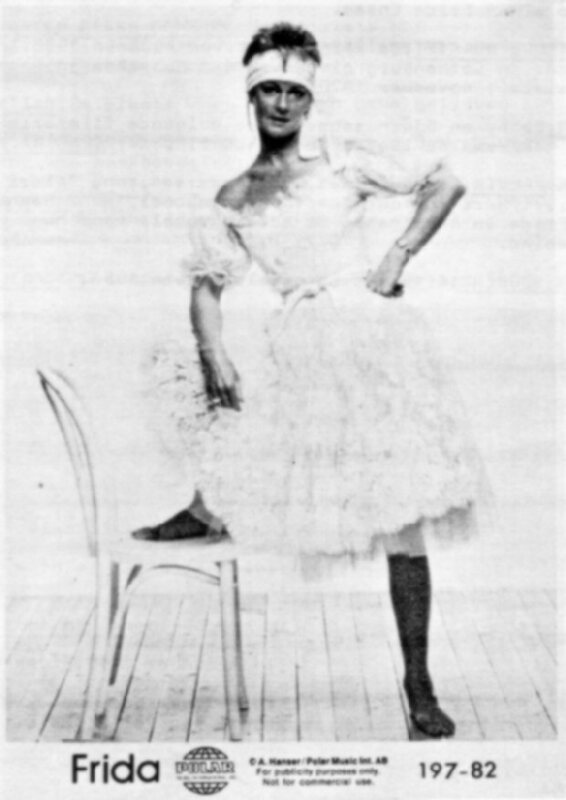 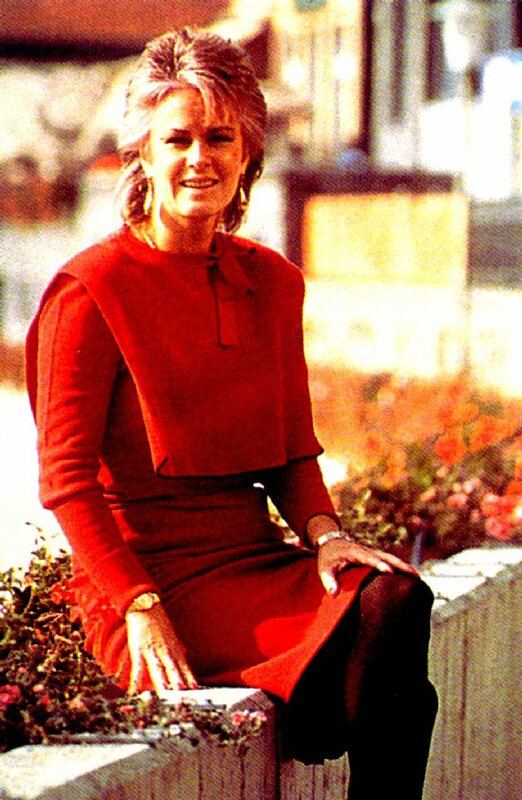 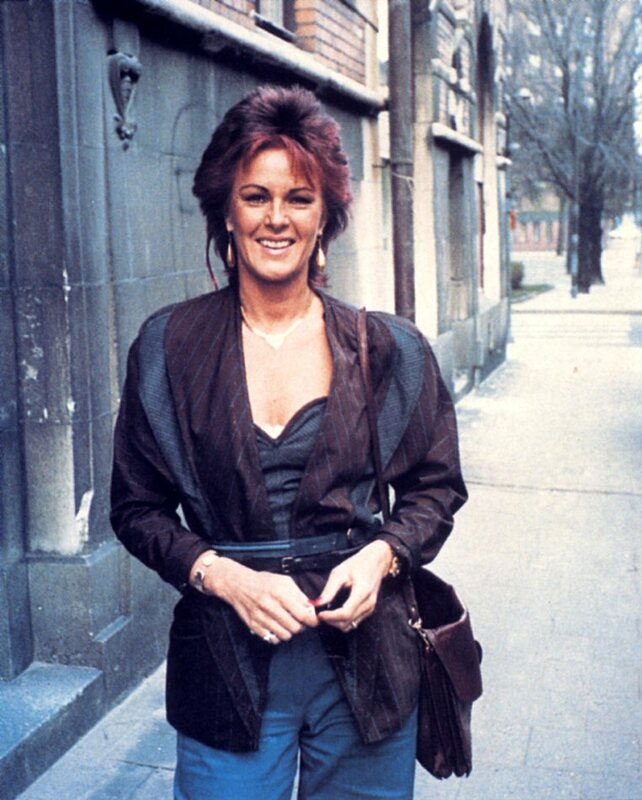 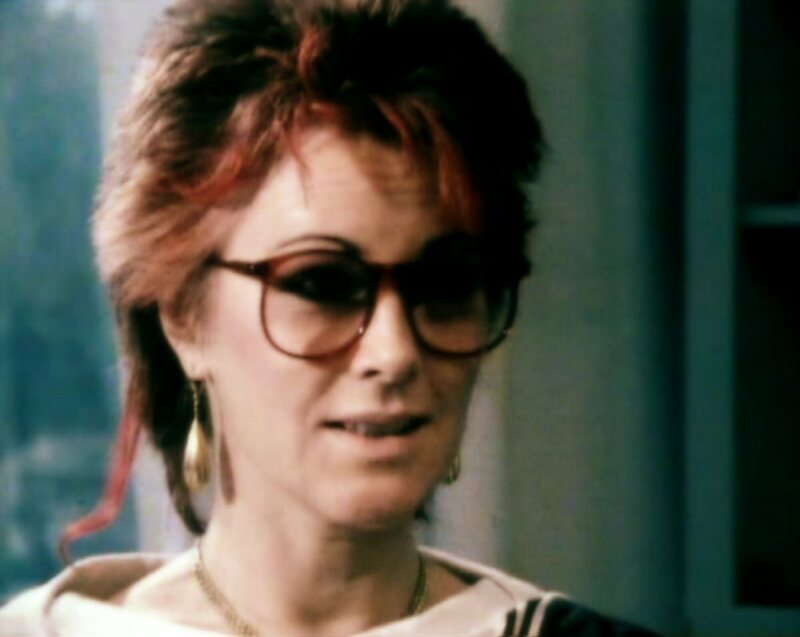 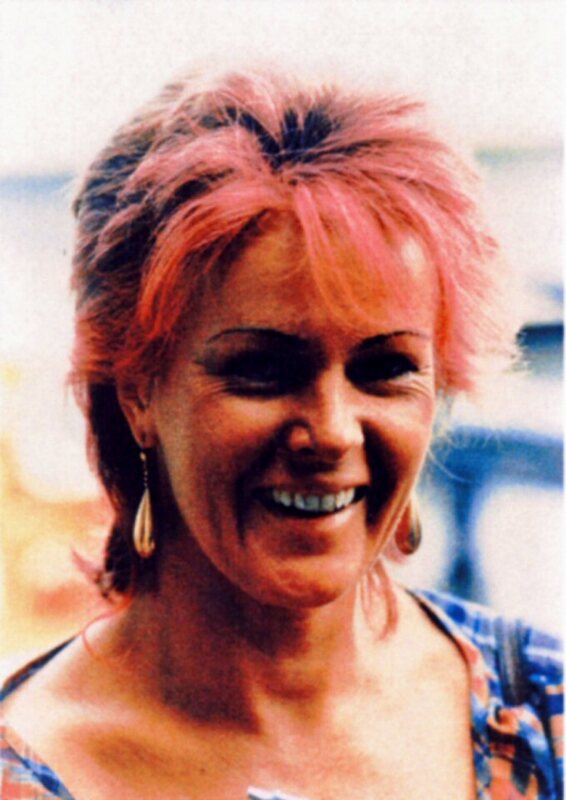 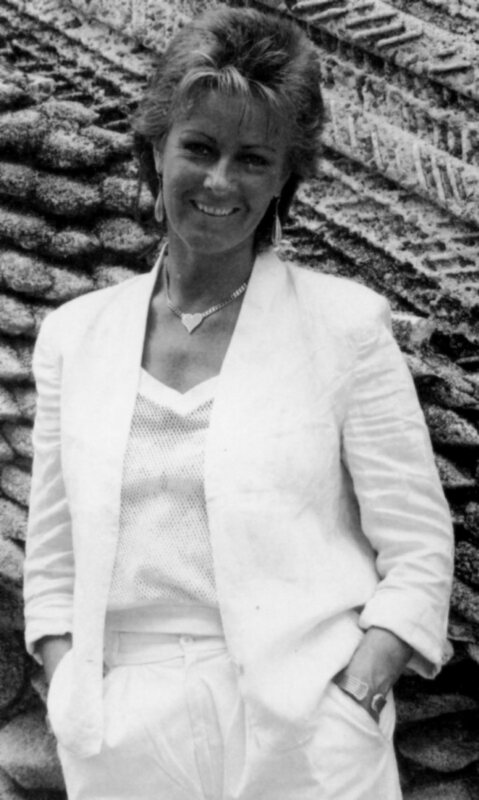 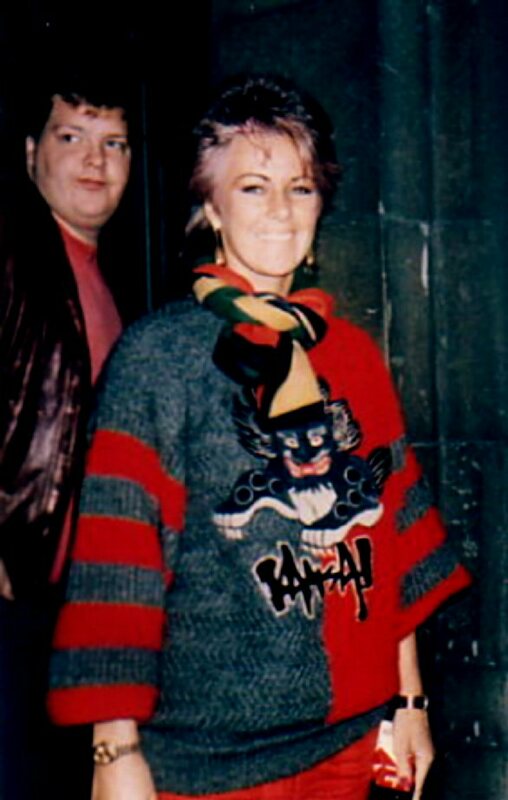 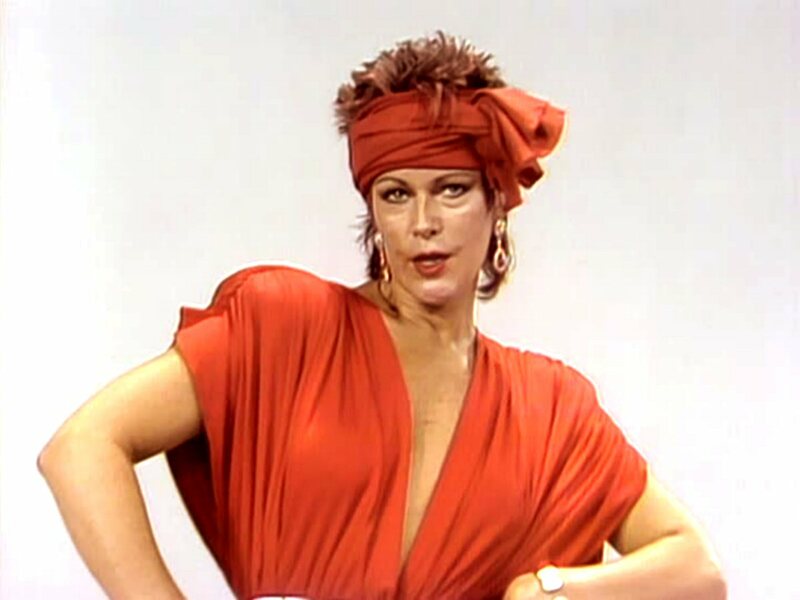 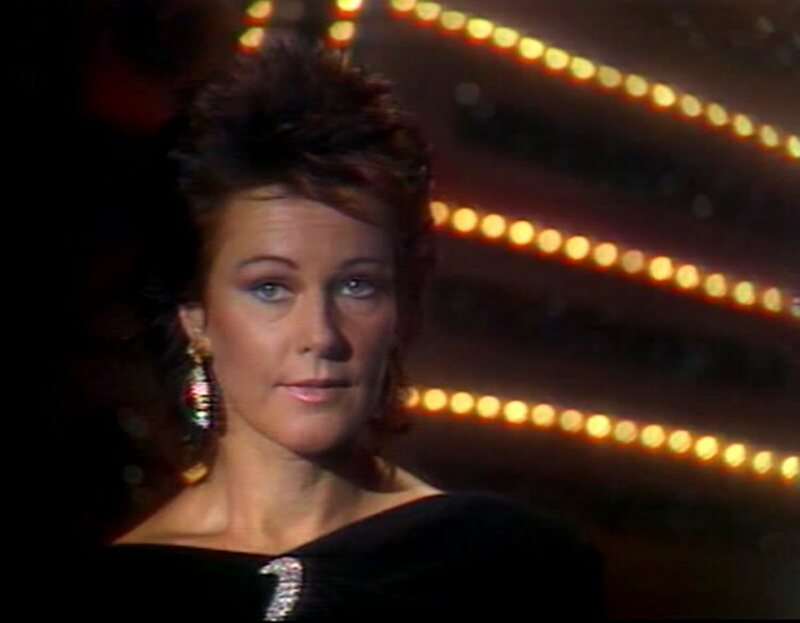 Frida was in Copenhagen on September 17 and 18, 1982 and appeared on Danish TV in the Eddy Skoller Show. 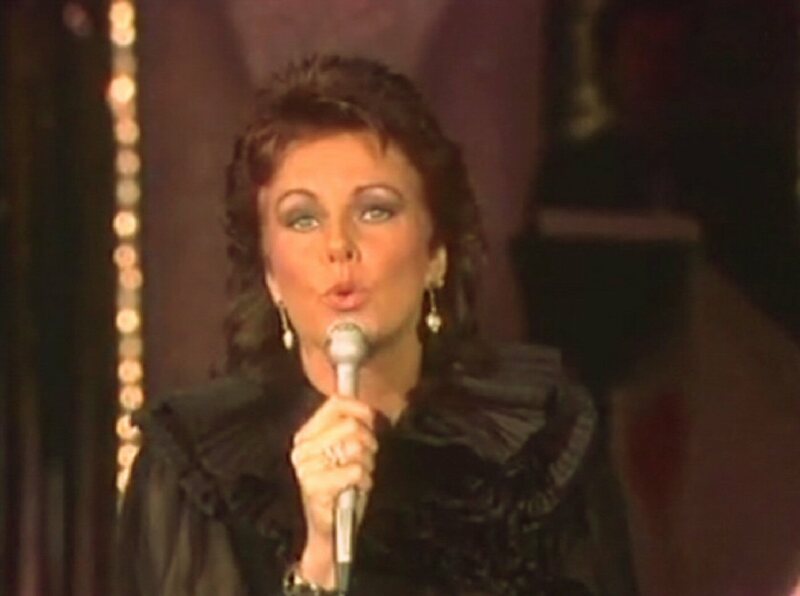 She performed songs from the new album: "I Know there's Something Going On" and "Baby Don't You Cry No More". 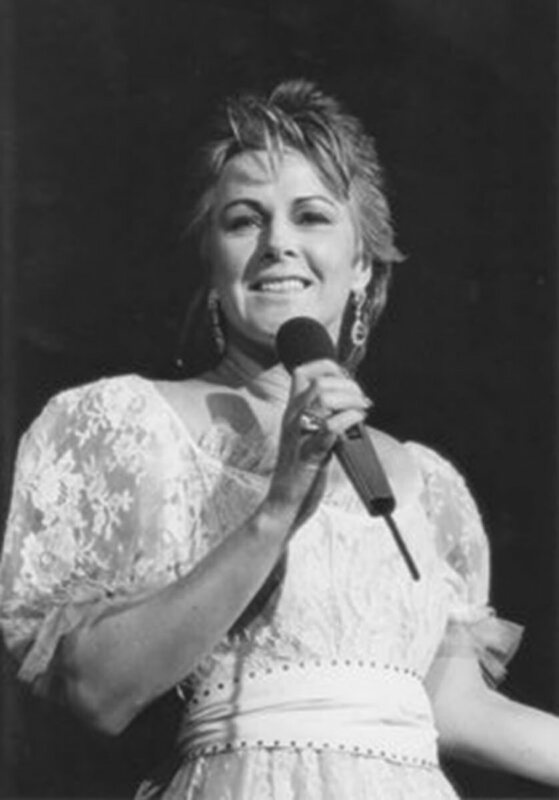 She even sang two songs in Danish/Swedish together with the show host and a well-known Norwegian comedian called Fleksnes. 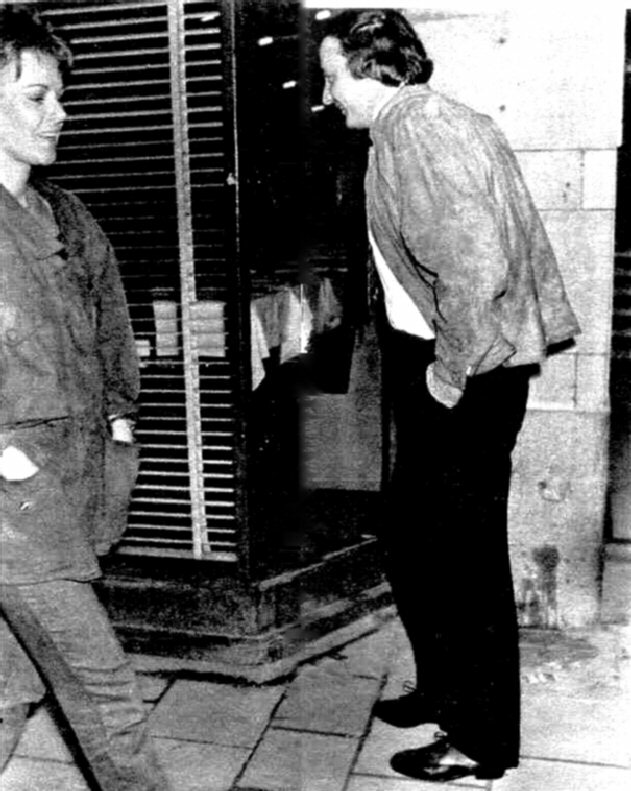 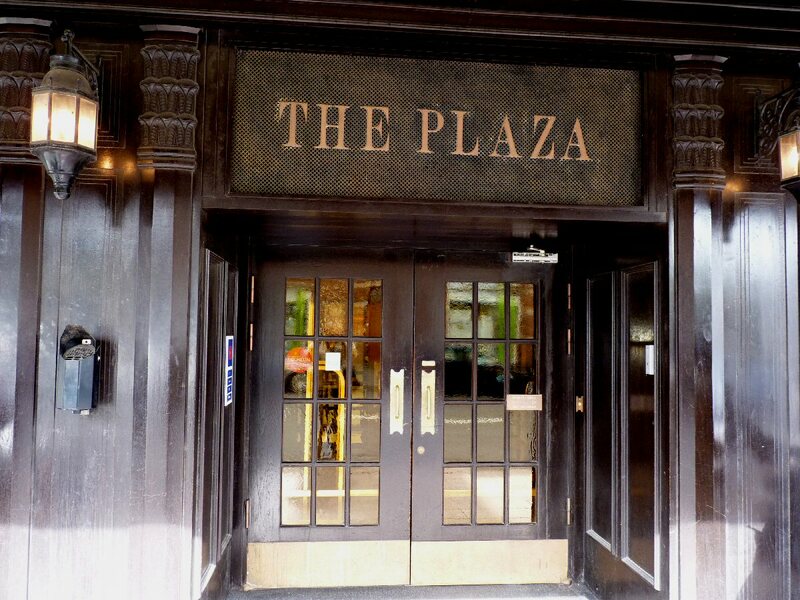 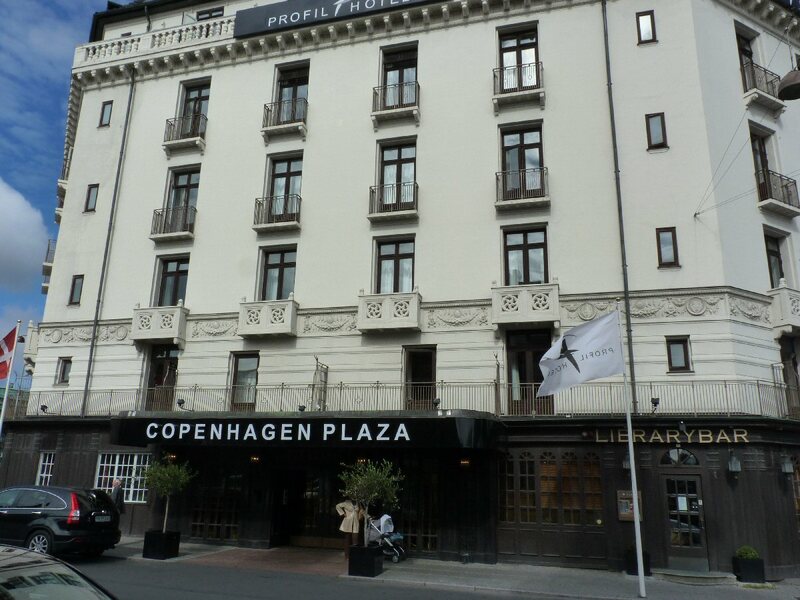 Frida stayed at the hotel "Copenhagen Plaza" near the central railway station and Tivoli. 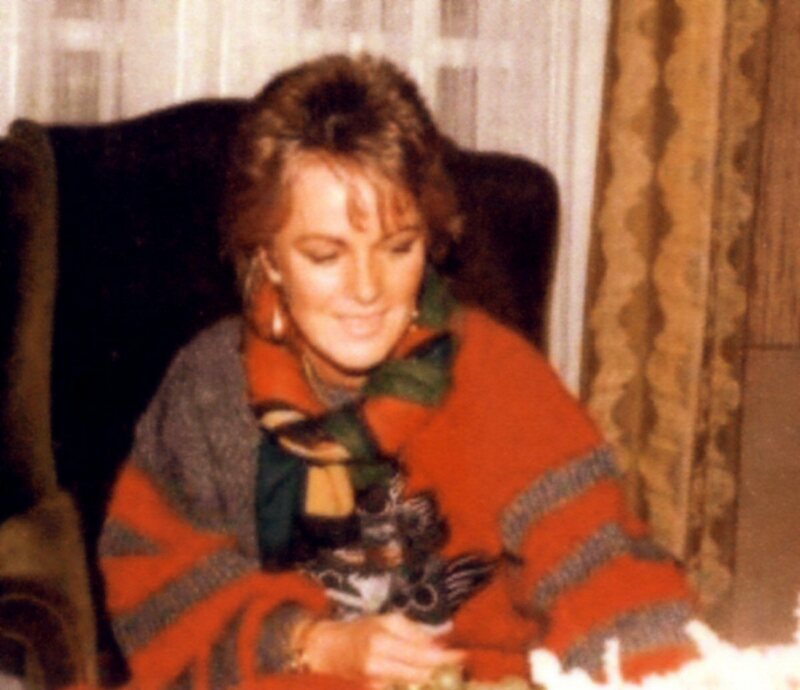 She met the journalists at the hotel. 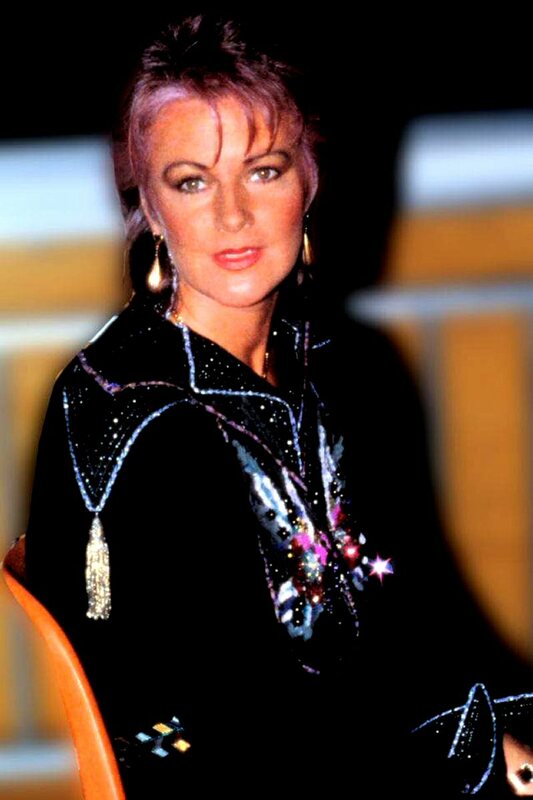 The promotional trip continued and on September 18th Frida arrived in Austria where she stayed for two days. 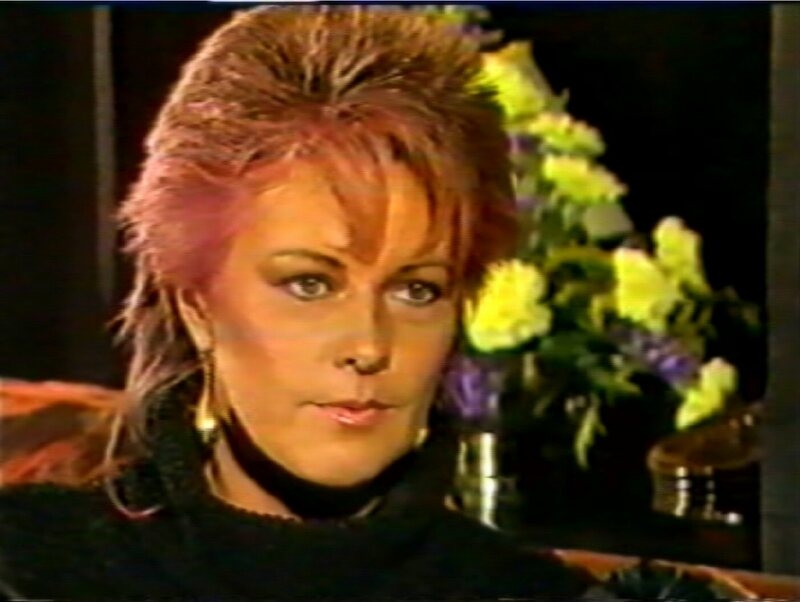 She met the media and did an interview for the TV show "Okay". 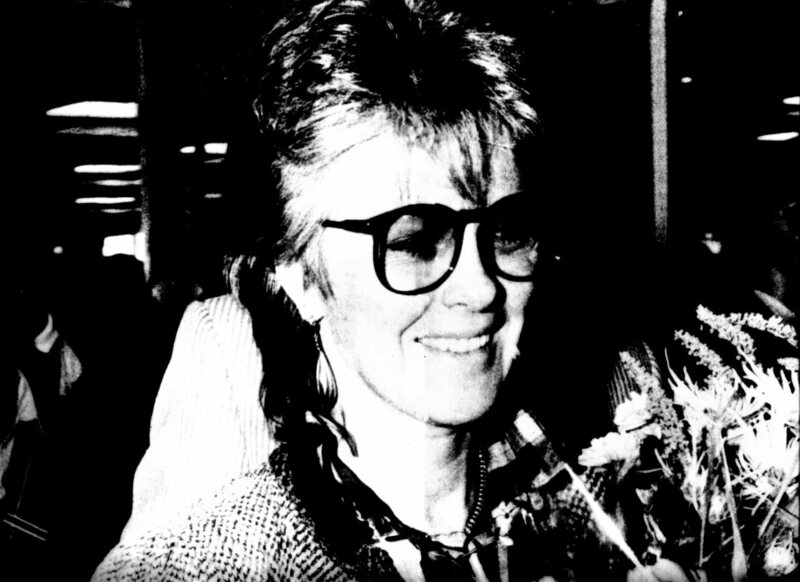 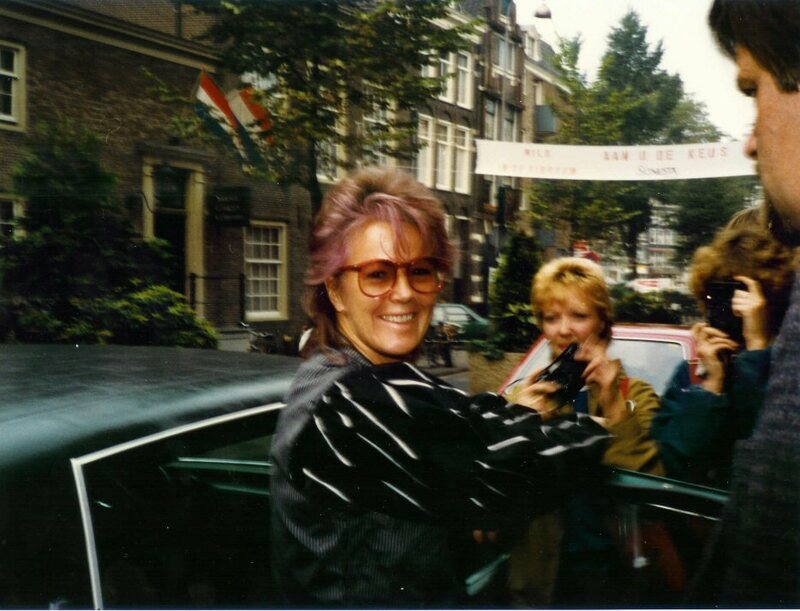 Frida arrived in Holland on October 1st, 1982. 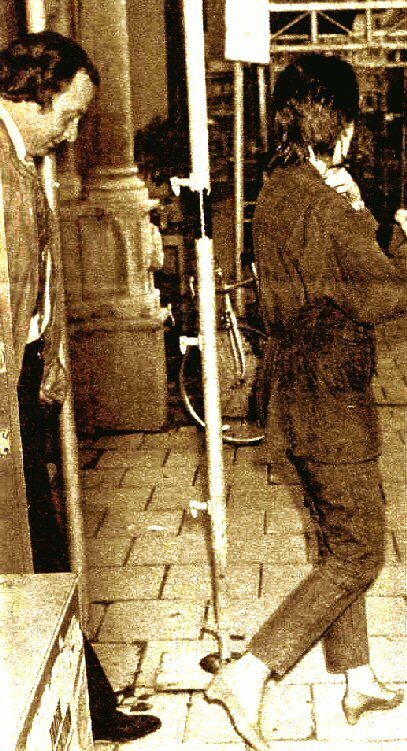 Some rare pictures were taken on the airport Schiphol in Amsterdam. 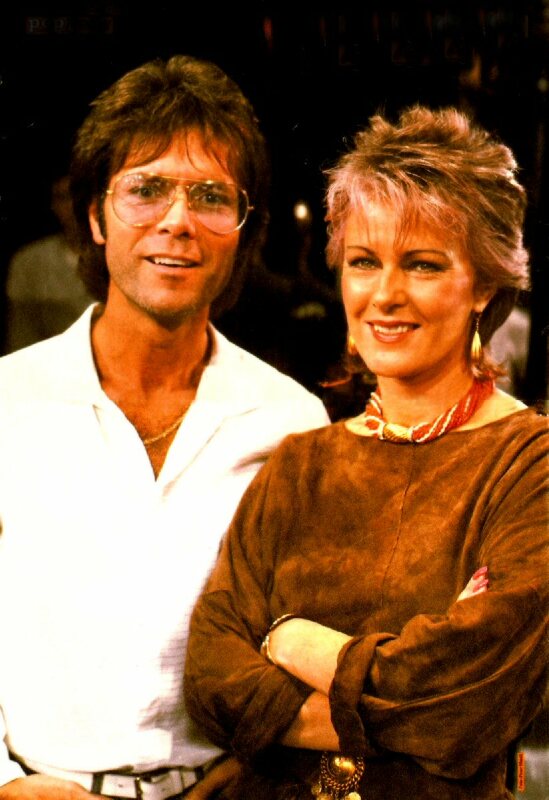 (thanks Maurits) She appeared in the TV show "Mjes" together with Cliff Richard. 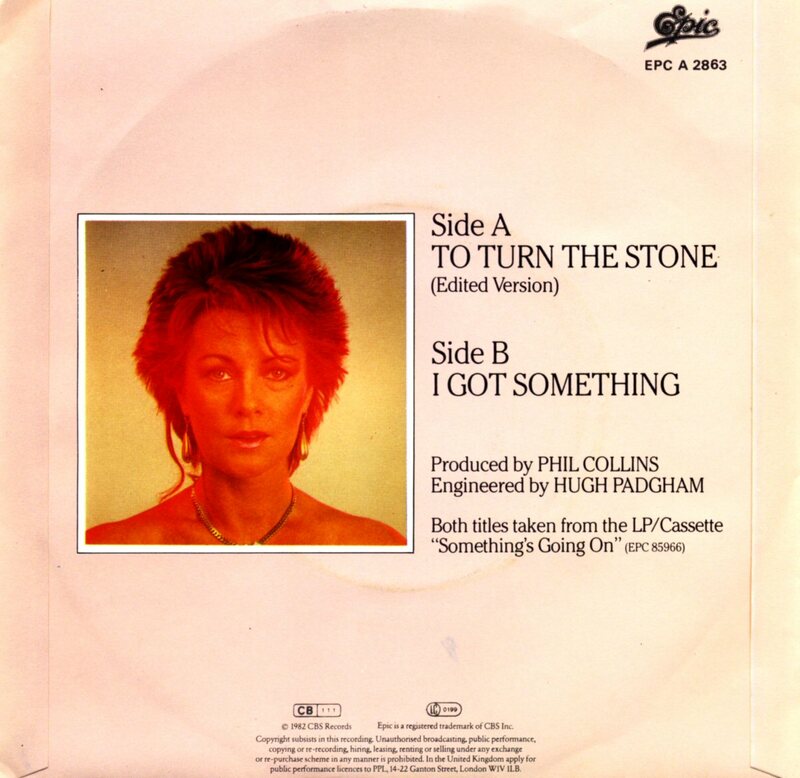 After a short interview she performed "To Turn The Stone". 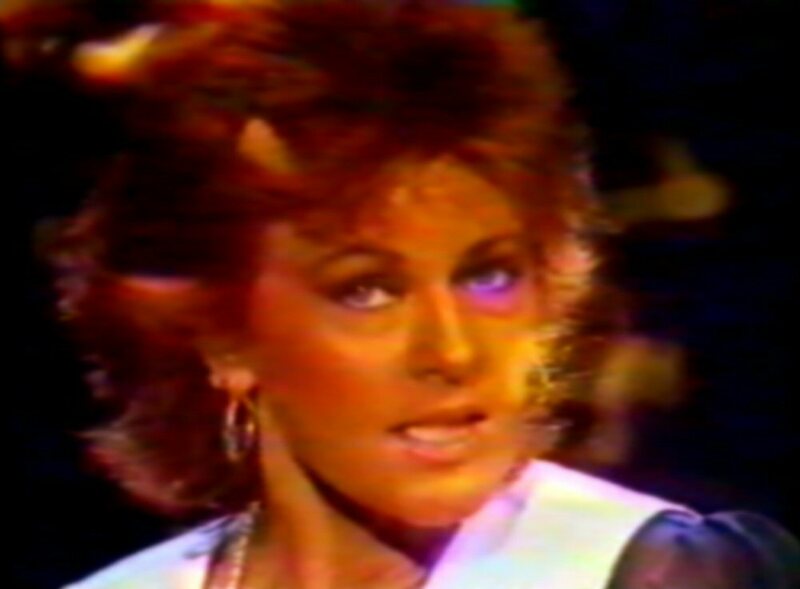 She appeared even in the show Top-pop where she gave a short interview and performed "To Turn The Stone". 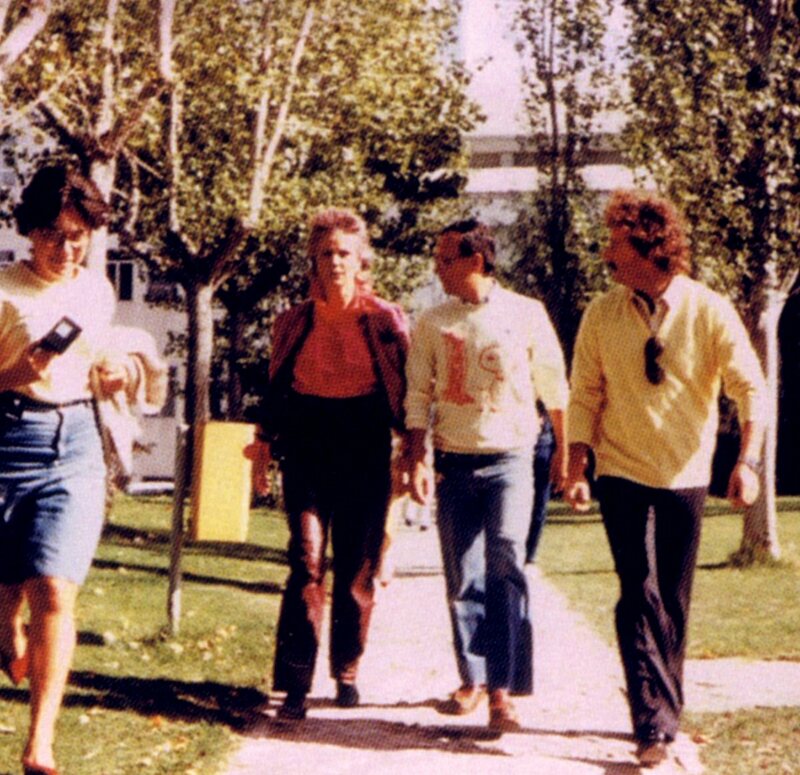 Frida came to Madrid on September 3rd and stayed until September 5th. 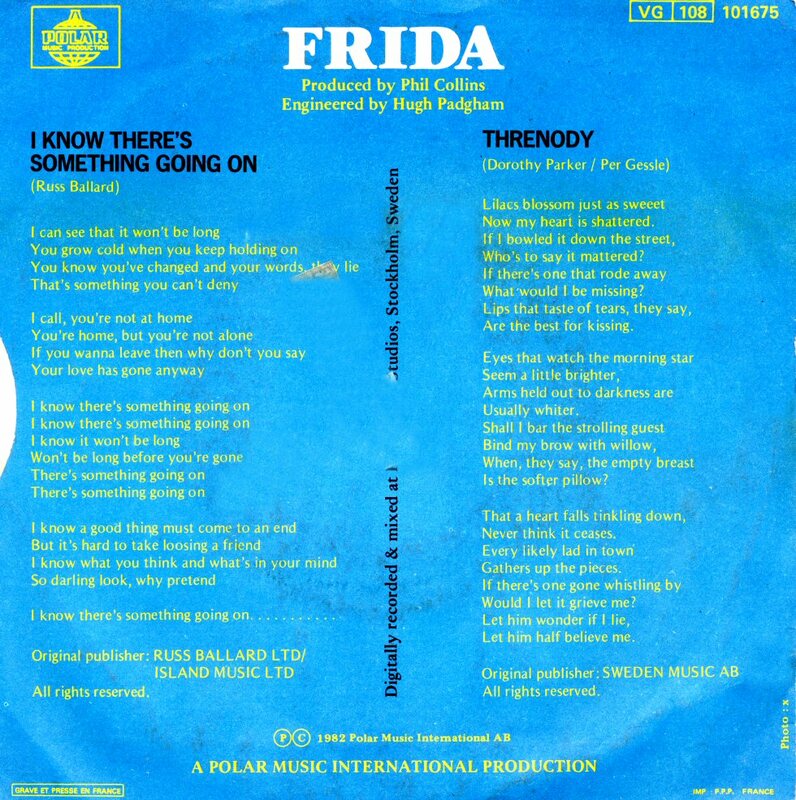 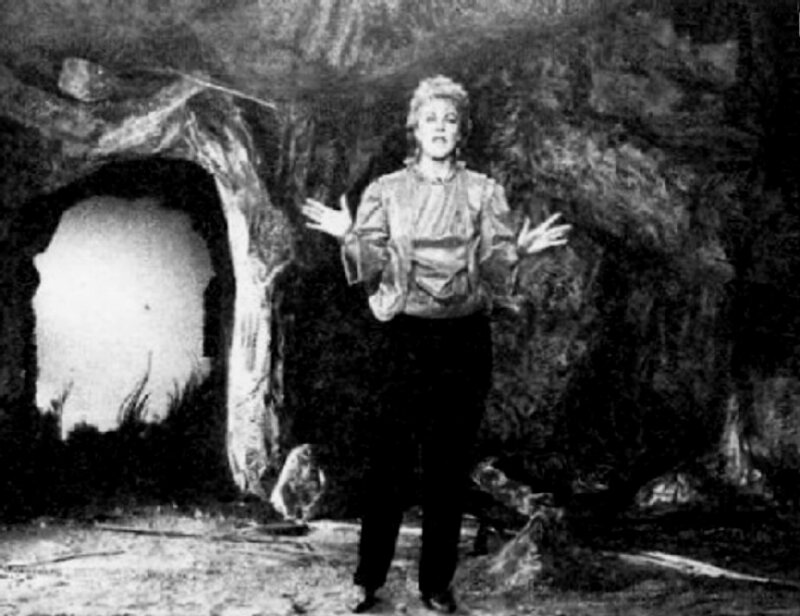 Frida participated in the show "Applauso" where she performed three songs: "To Turn The Stone", "Tell Me It's Over" and "I Know There's Something Going On". 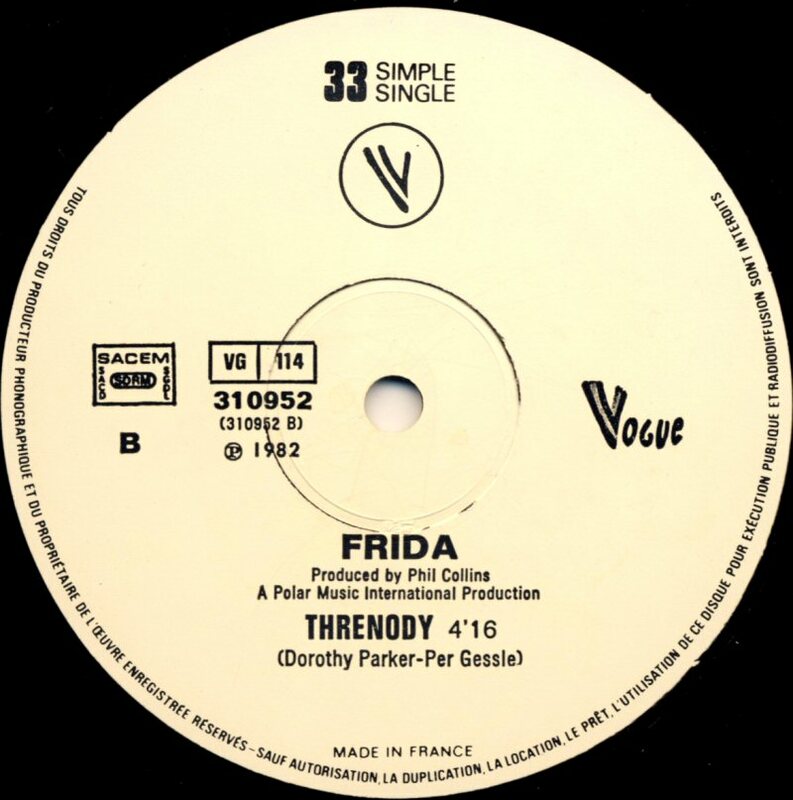 Frida came to France on October 5th and stayed 3 days. 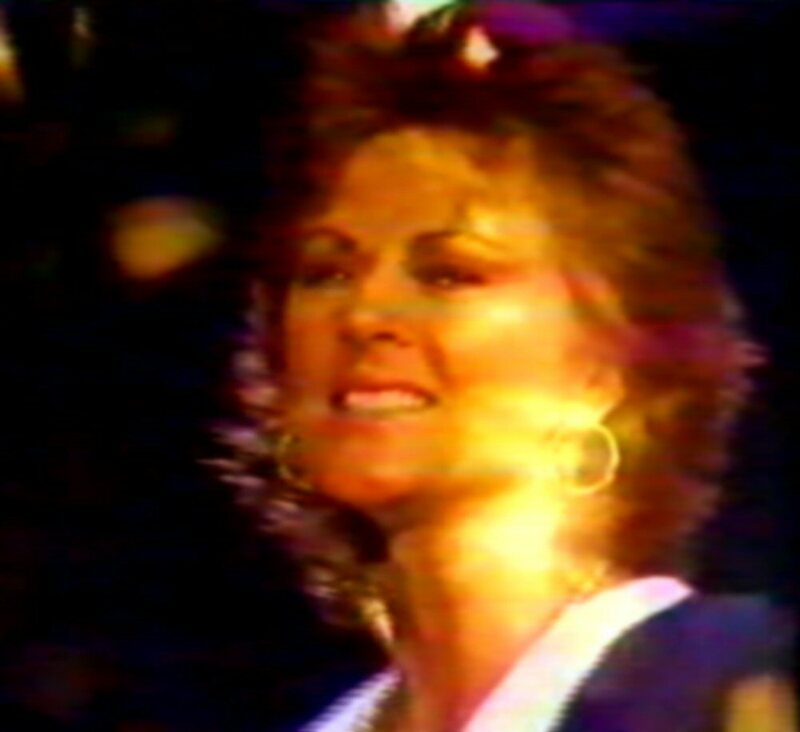 She performed on TV, gave interviews and met fans. 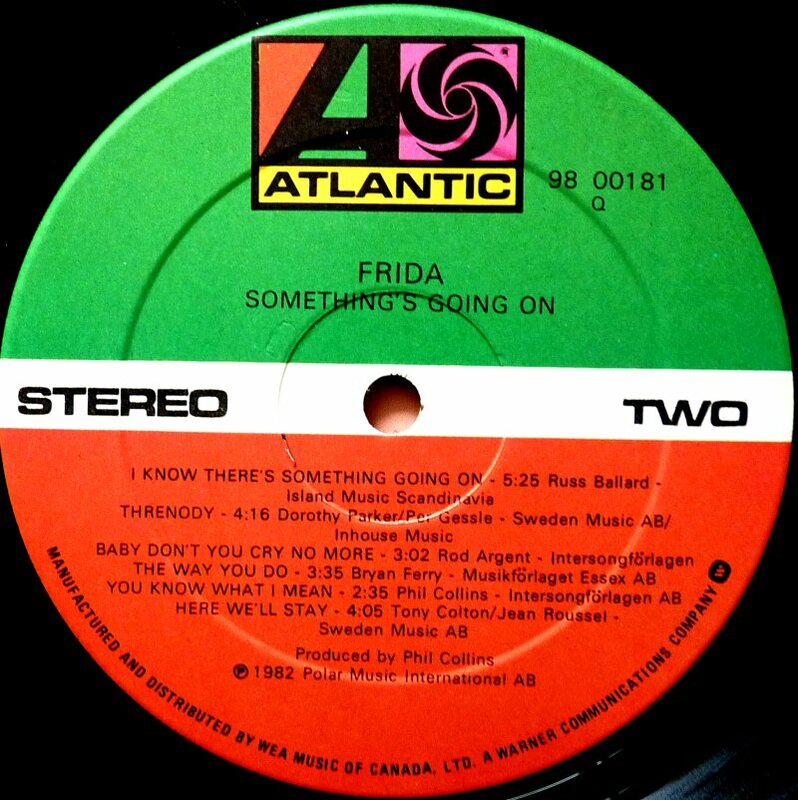 Frida said: "I've been waiting for the right moment to do this solo LP. 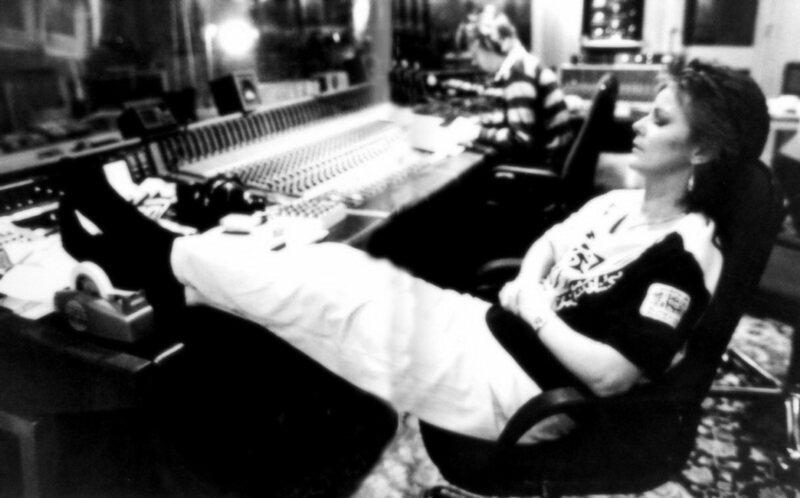 I was given 500 songs, and I had to choose the best eleven/.../. 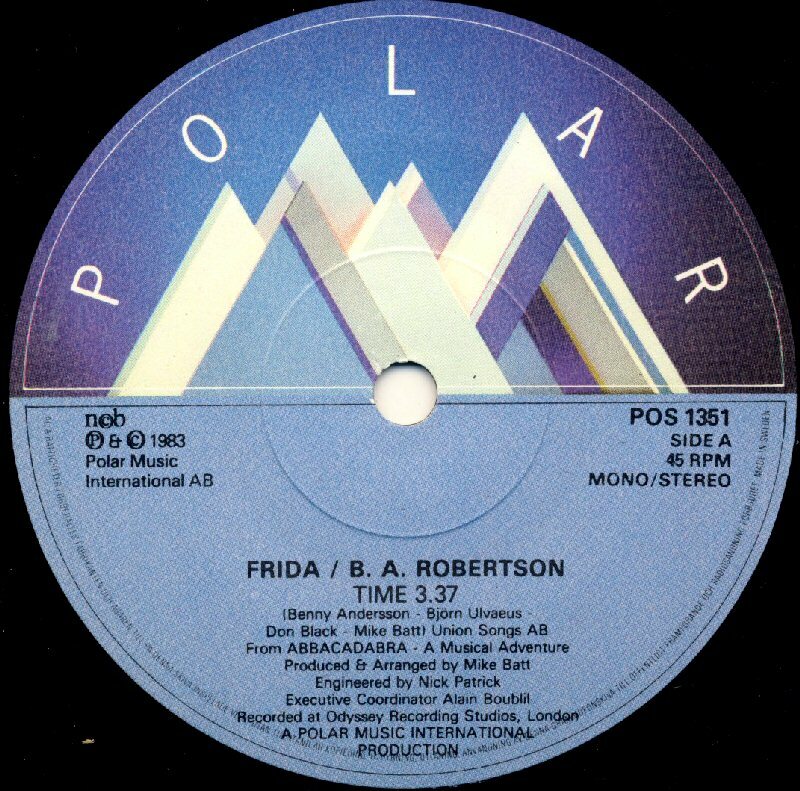 Everything was recorded in the Polar Music Studios except for the strings which were recorded in London. 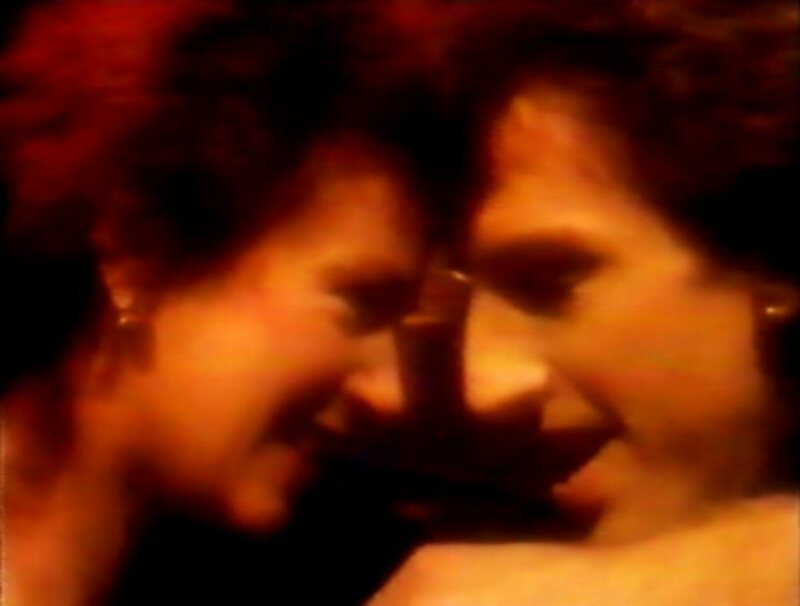 We also filmed the first two videos in England. 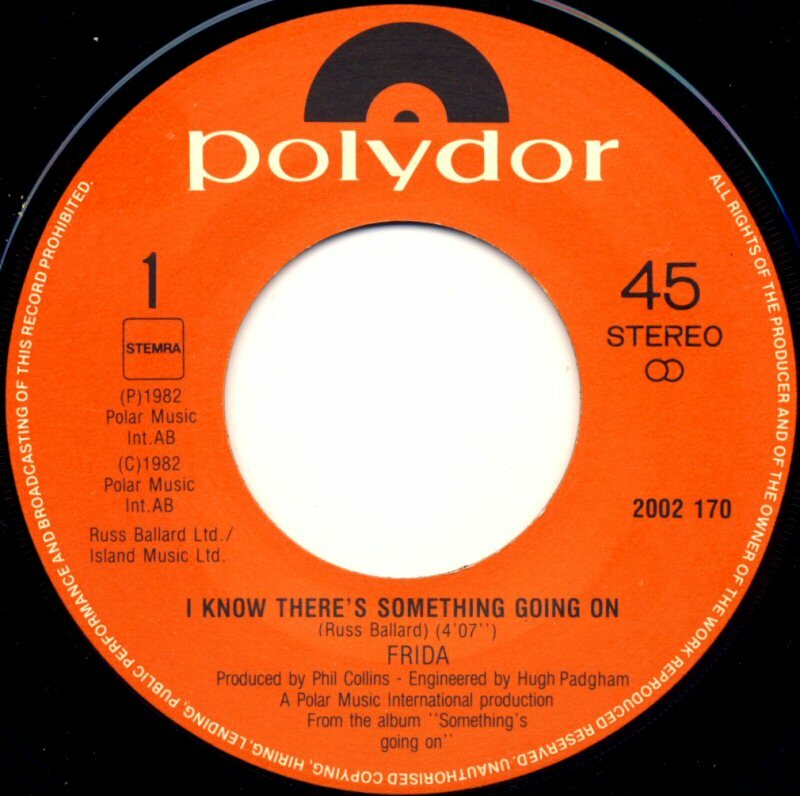 "I Know There's Something Going On" is a short film which describes the song in a way I like. 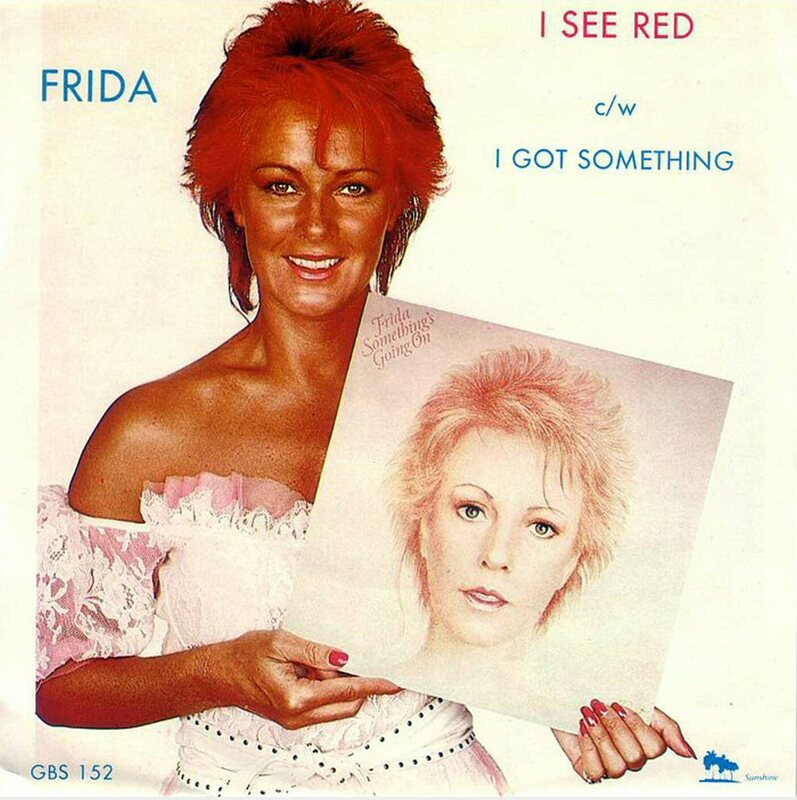 But I still prefer "I See Red" - It's more professional. 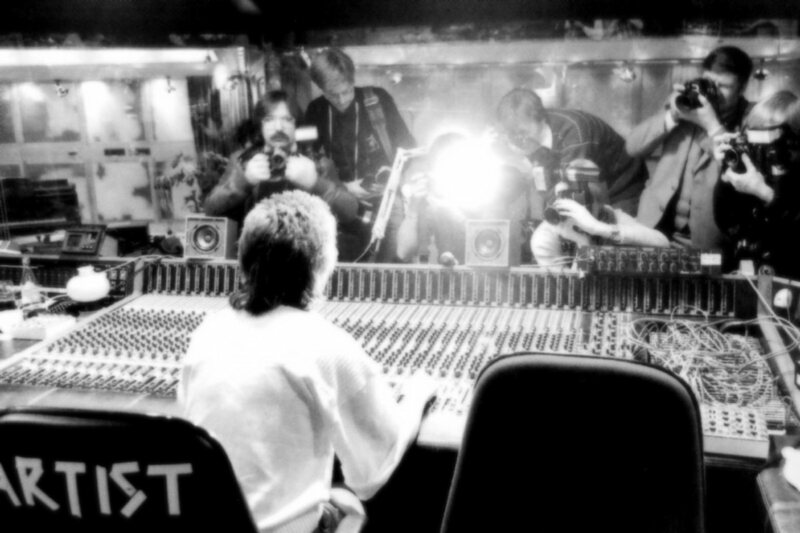 A documentary clip has been filmed too, during the recording sessions. 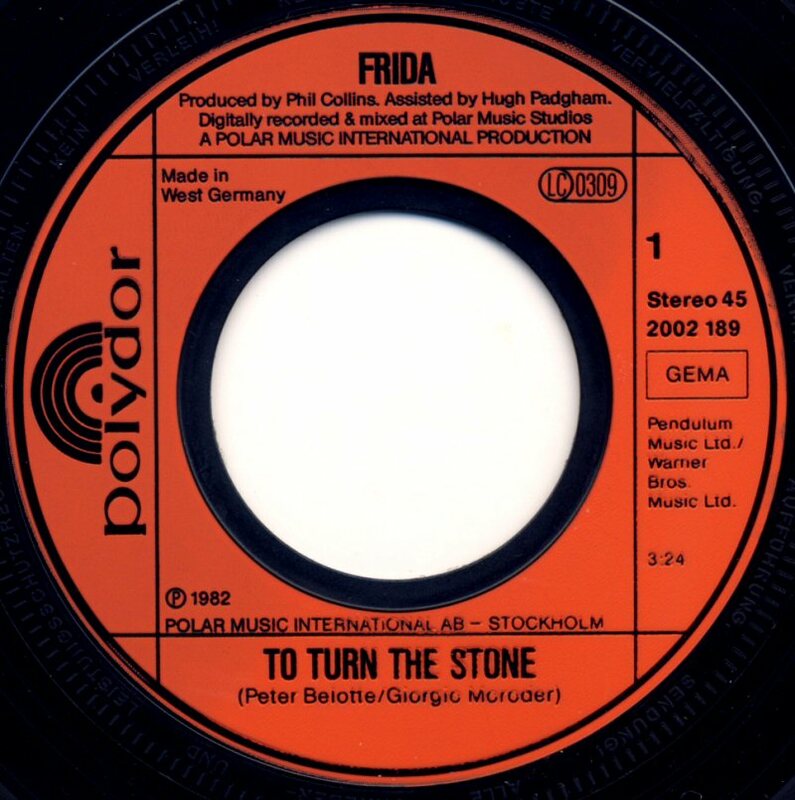 And when I went to Holland we did the video of "To Turn The Stone". 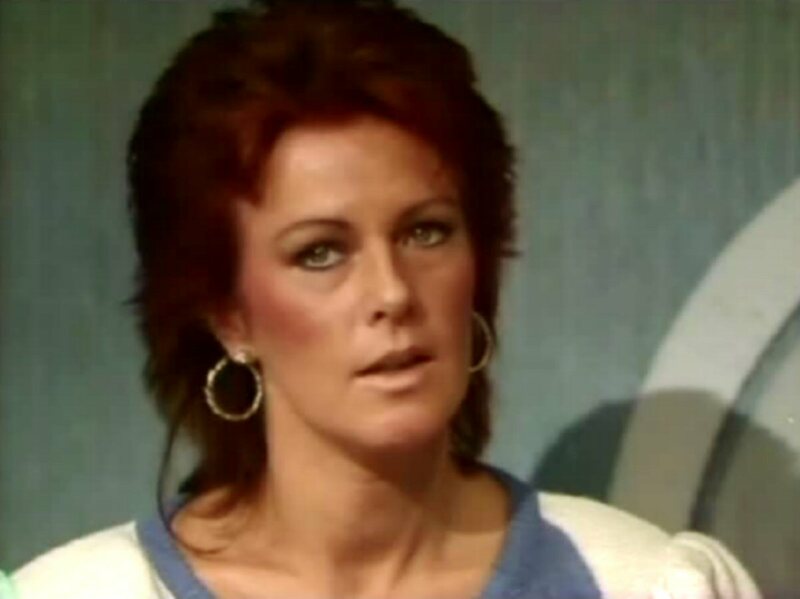 "No tour with ABBA is planned. 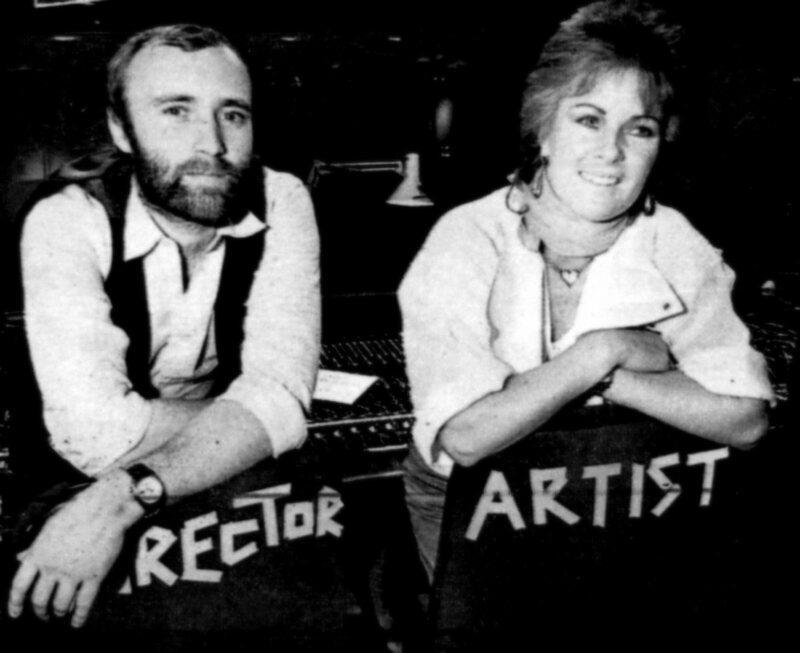 Björn and Benny are working on a musical and it will take them two years to prepare it. But on the other hand it lets Agnetha and I have time to work on solo projects." 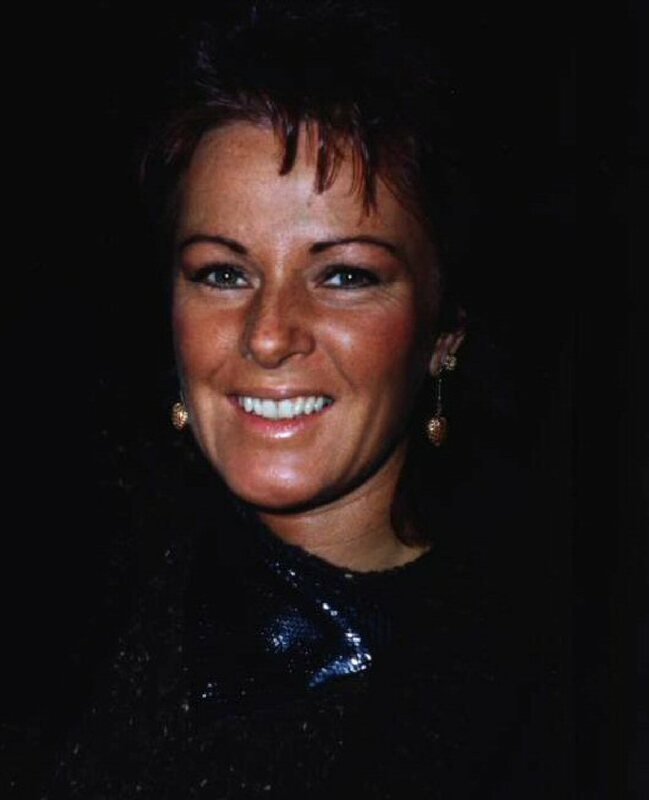 On September 29th, Frida was interviewed by Swedish tabloid "Expressen" where she said that she enjoyed her life and she wanted to live in Sweden. 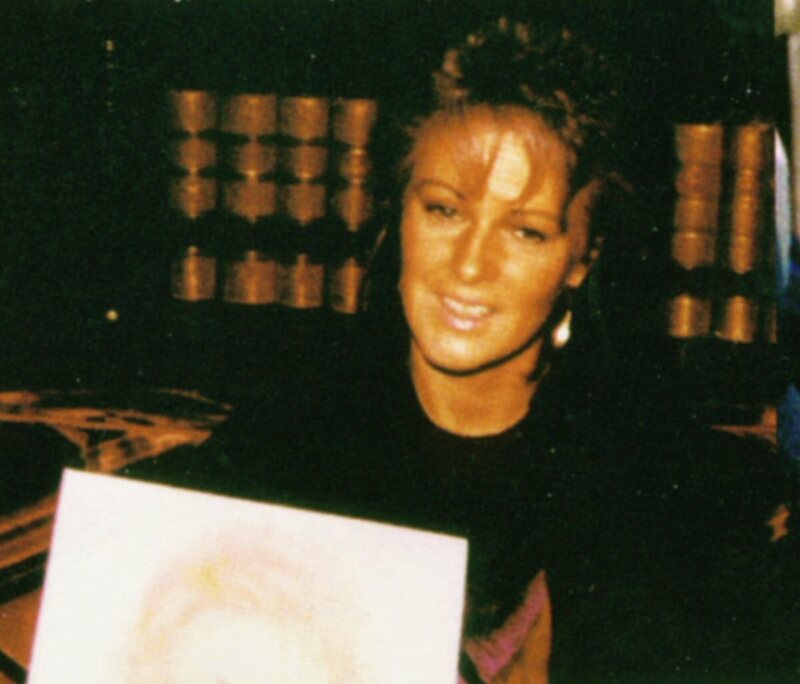 These photos appeared in several Swedish magazines during the autumn 1982. 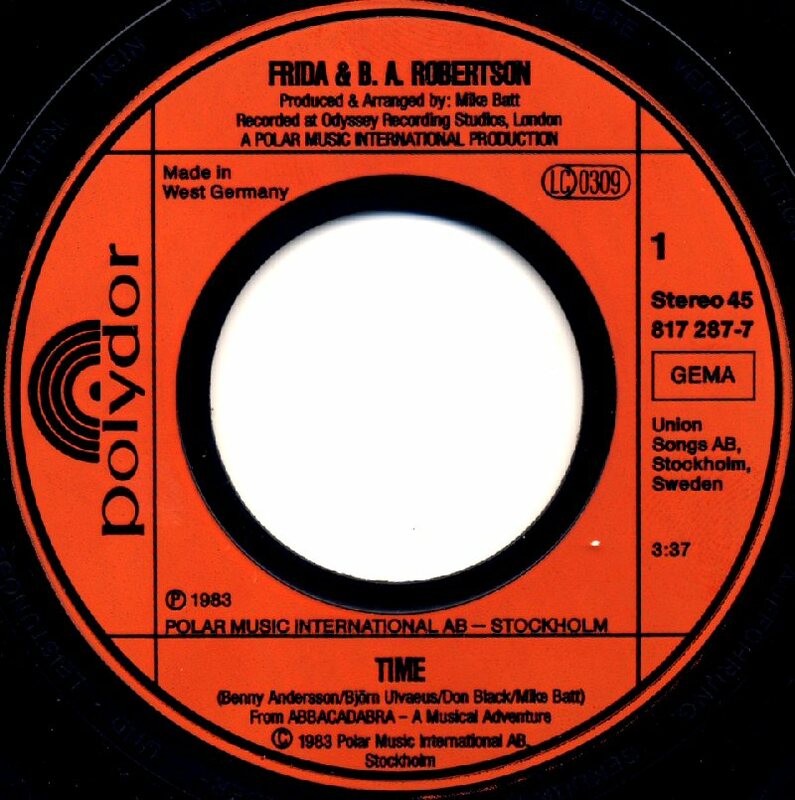 Frida opened up the Intelpost (the first version of fax) link between London and Stockholm while she was in London promoting the new LP. 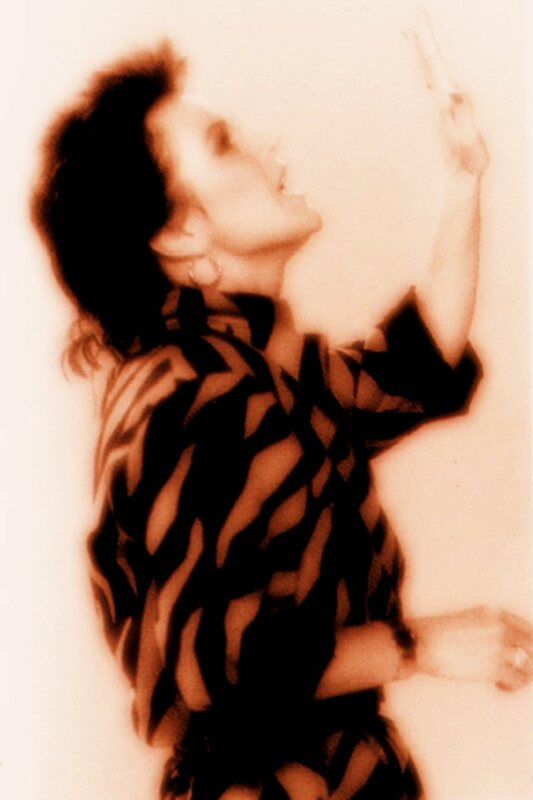 Frida said about the photo: "It was thought up by one of the photographers. 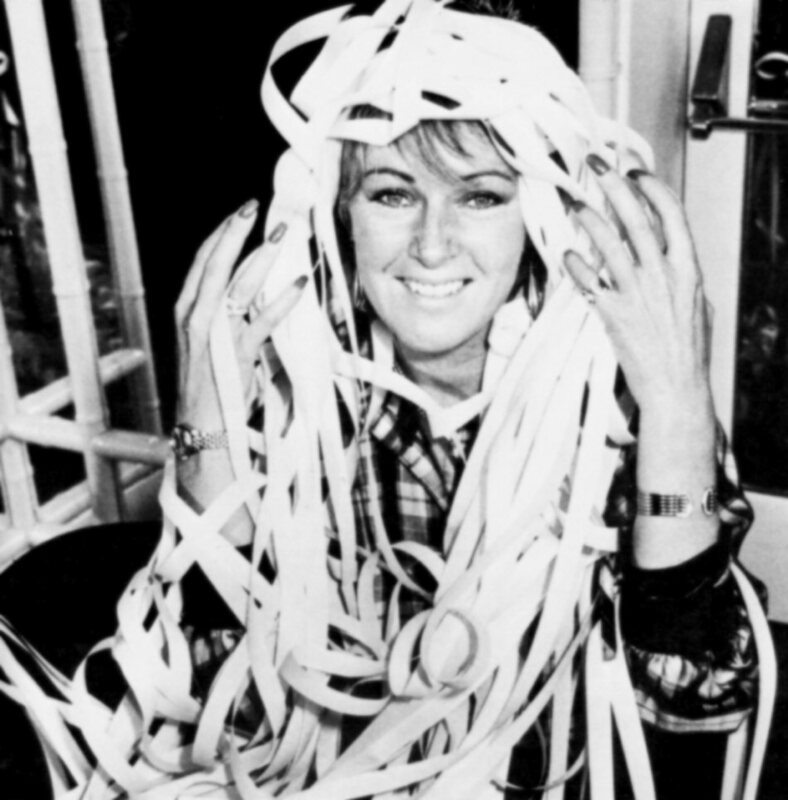 All that tape was taken from the hotel's telex room because that is the effect he wanted. 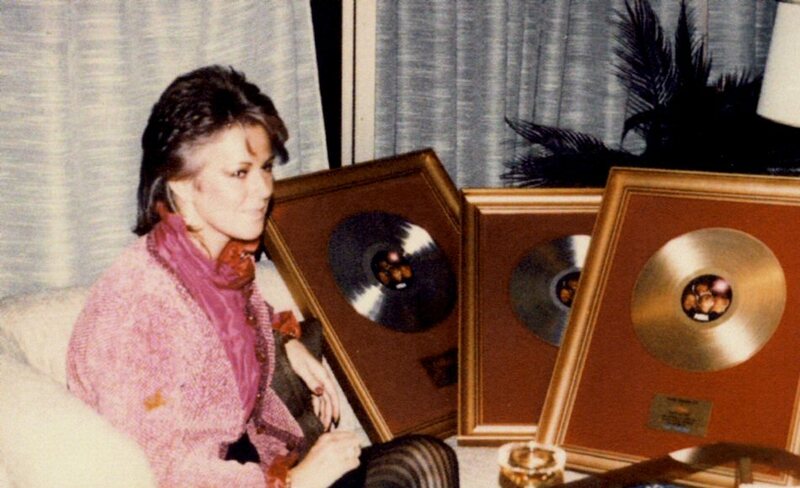 All I really had to do was hold up the copy of sheet music that was sent from Stockholm, but that just wasn't enough for this photographer!" 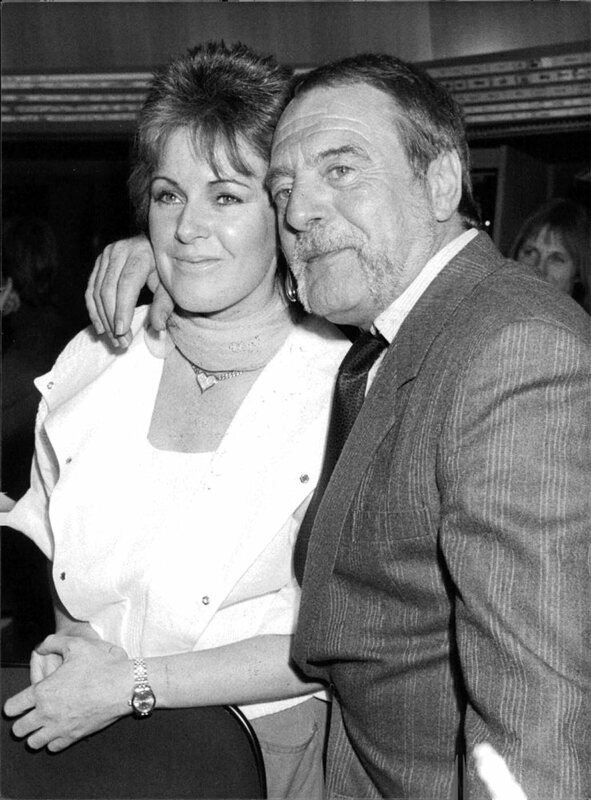 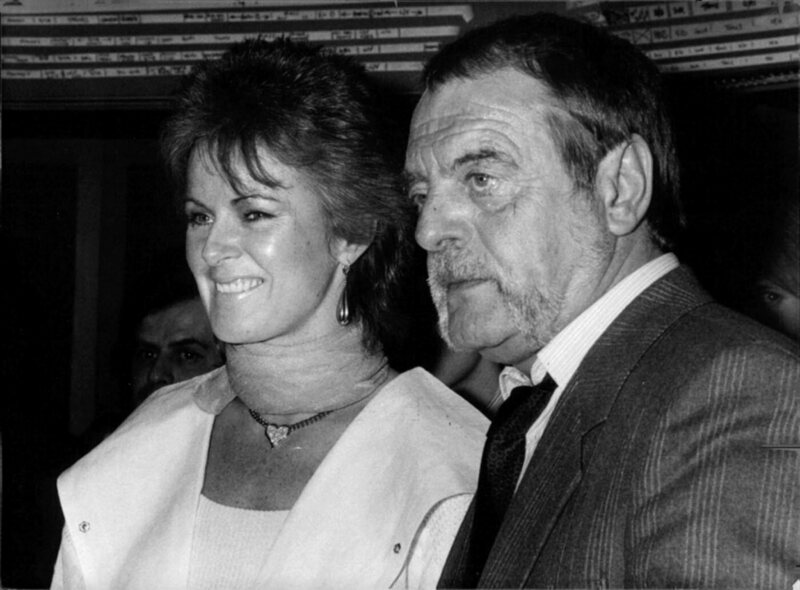 Frida talked not so much about her private life after the divorce from Benny but the press found out very quickly that she had a new relationship with a business man Bertil "Bobo" Hjert. 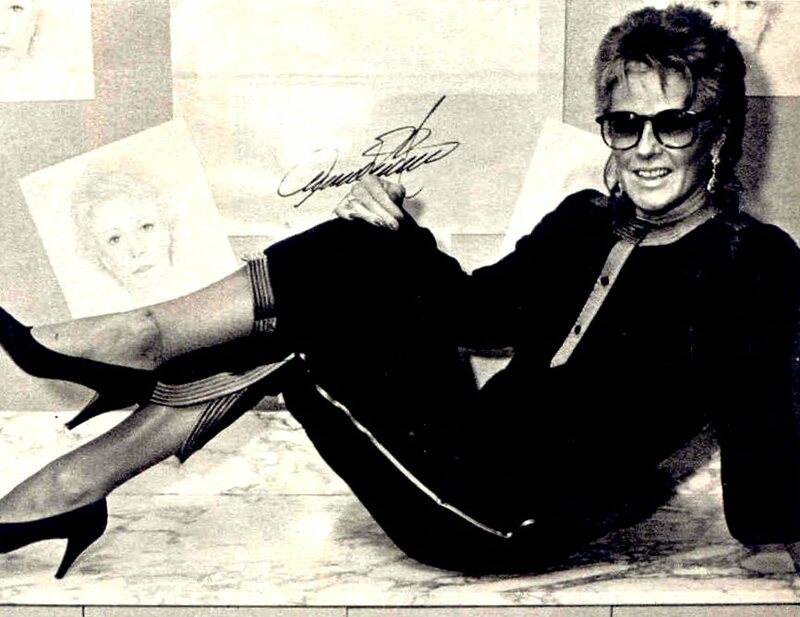 Bertil was boss for the Swedish company "Scandecor" which produced posters, calendars, cards and books. 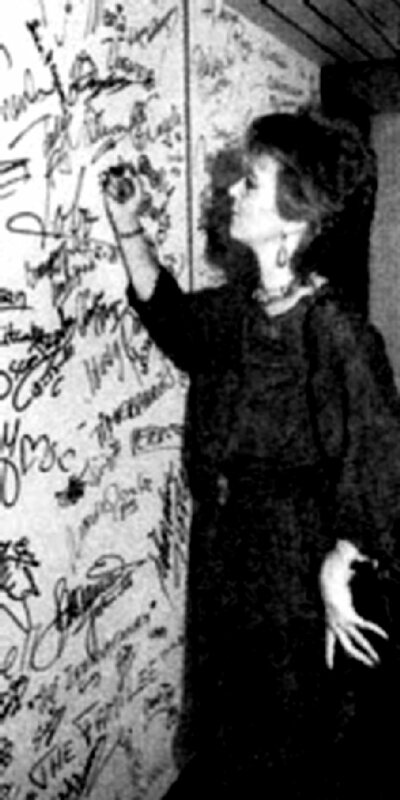 "Scandecor" sponsored the youth monthly "Clic" as well. 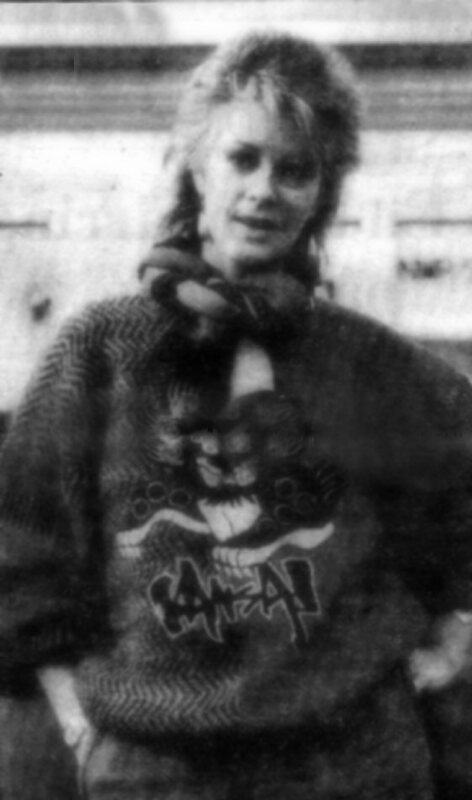 Frida appeared on the cover of the very first issue of "Clic" in September 1981. 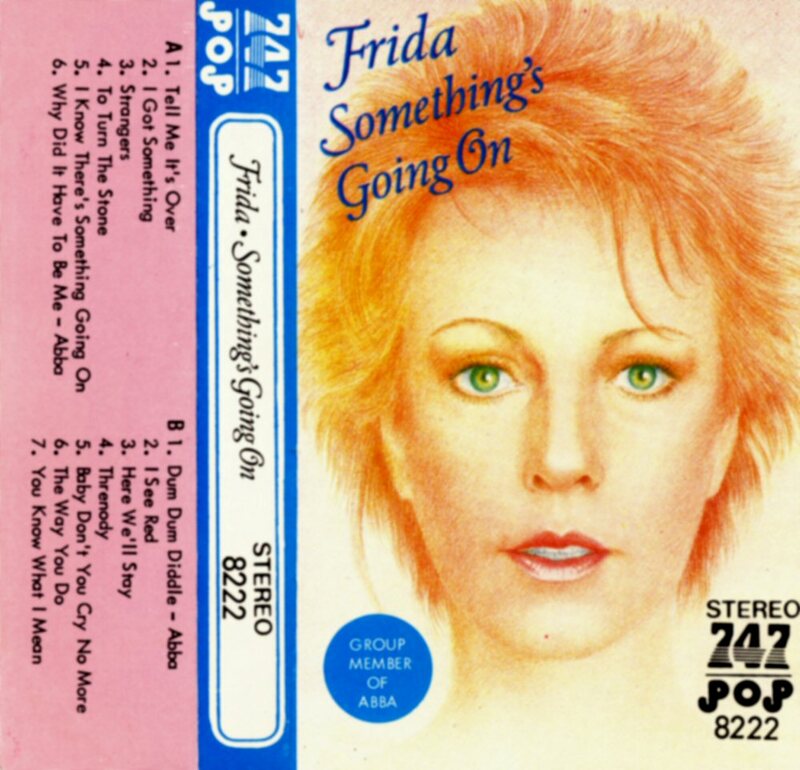 The album "Something's Going On" was very successful in USA and on October 23rd Frida came to New York on a promotional visit. 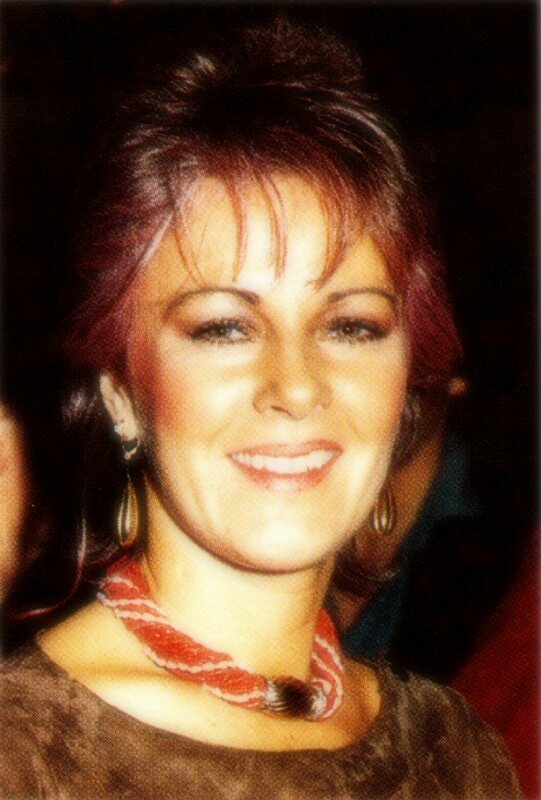 She stayed in NY for one week and she participated in TV shows as "Live at Five" and "Good Morning America". 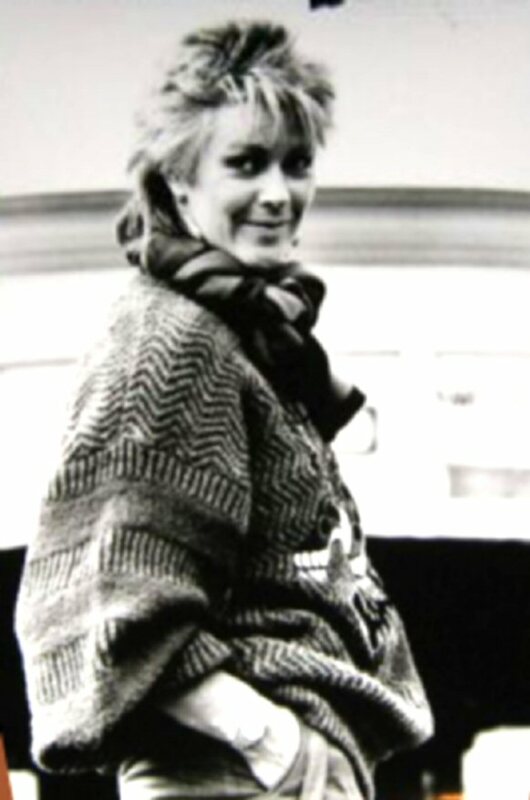 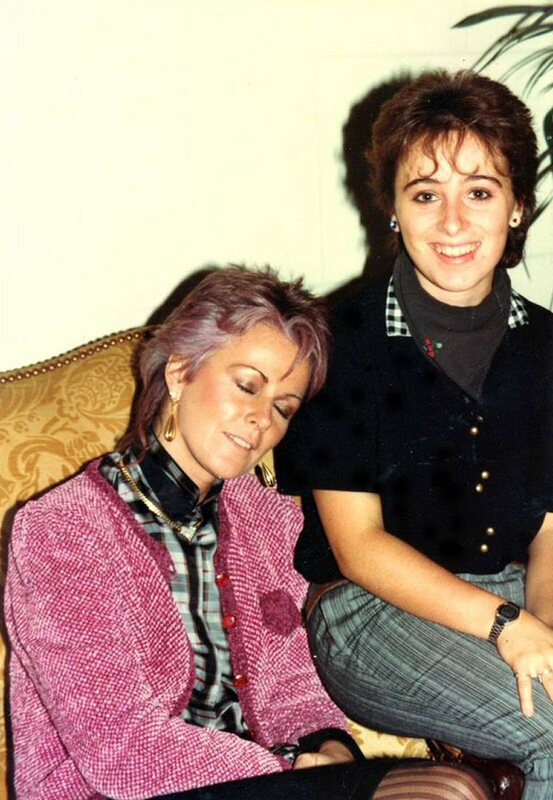 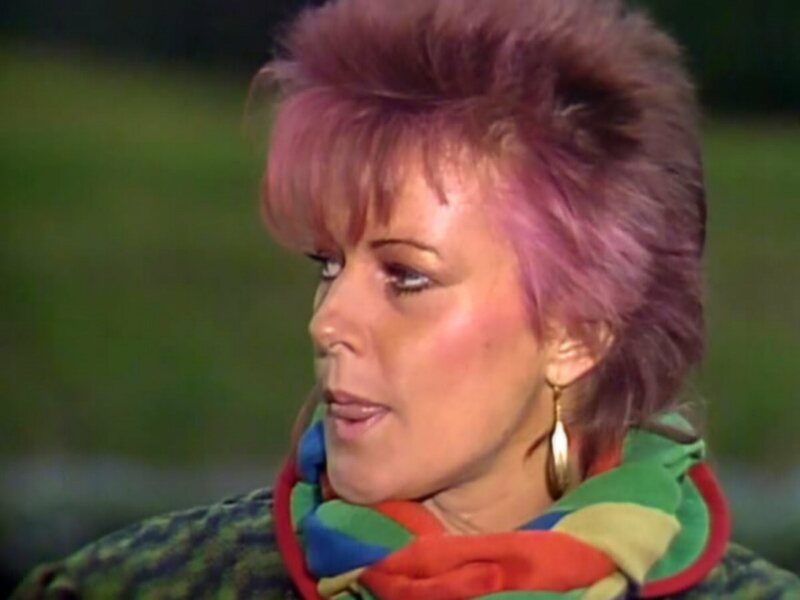 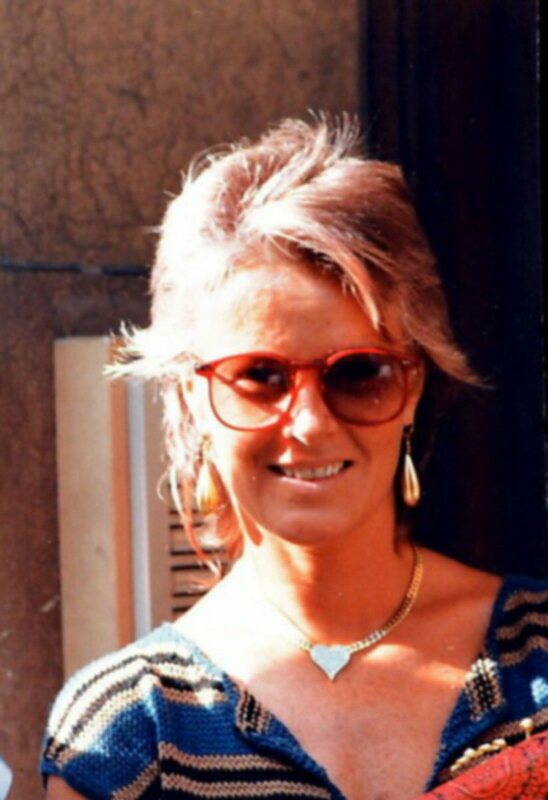 Frida left Sweden officially on November 27th, 1982 and moved to Great Britain. 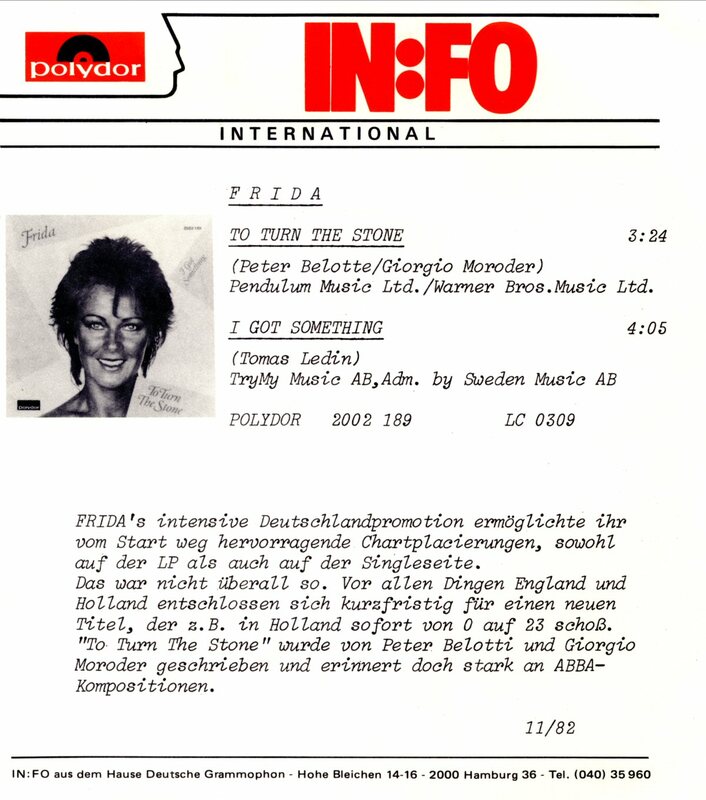 The second single from the album "To Turn The Stone"/"I Got Something" was released at the end of 1982 and became a minor success in several countries in Europe. In West Germany the single was released in December 82 and it reached #39 on German hit list. 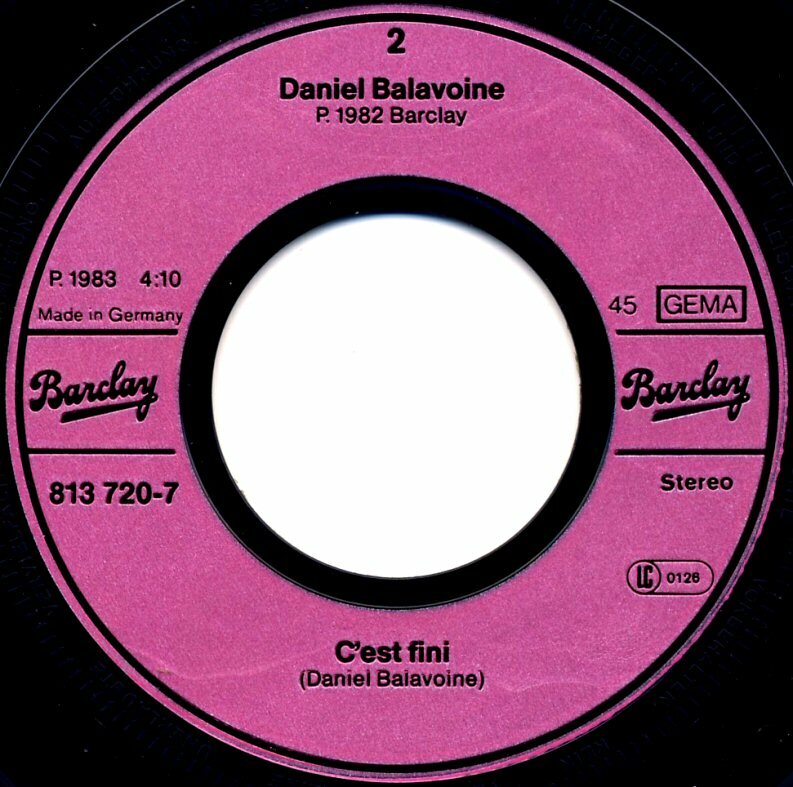 In France the single topped at #33. 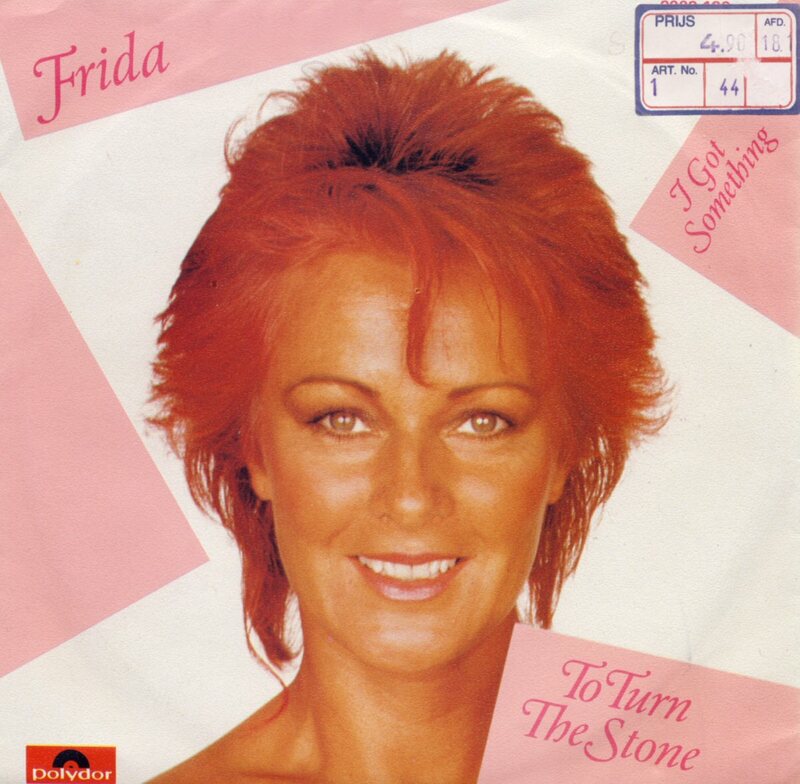 "To Turn the Stone" was more successful in Belgium and Holland where it reached #8 respective #6. 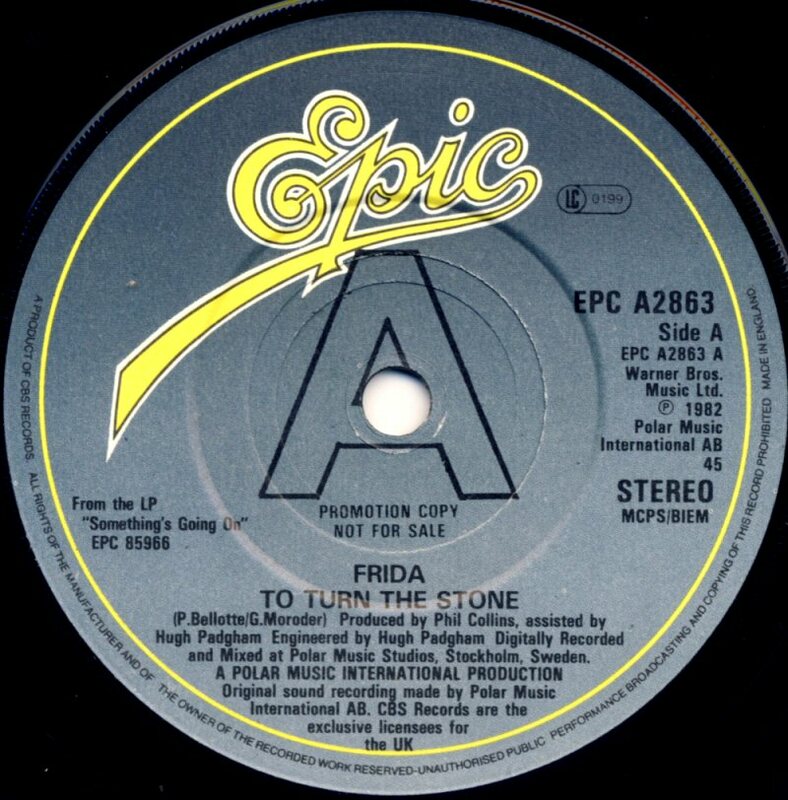 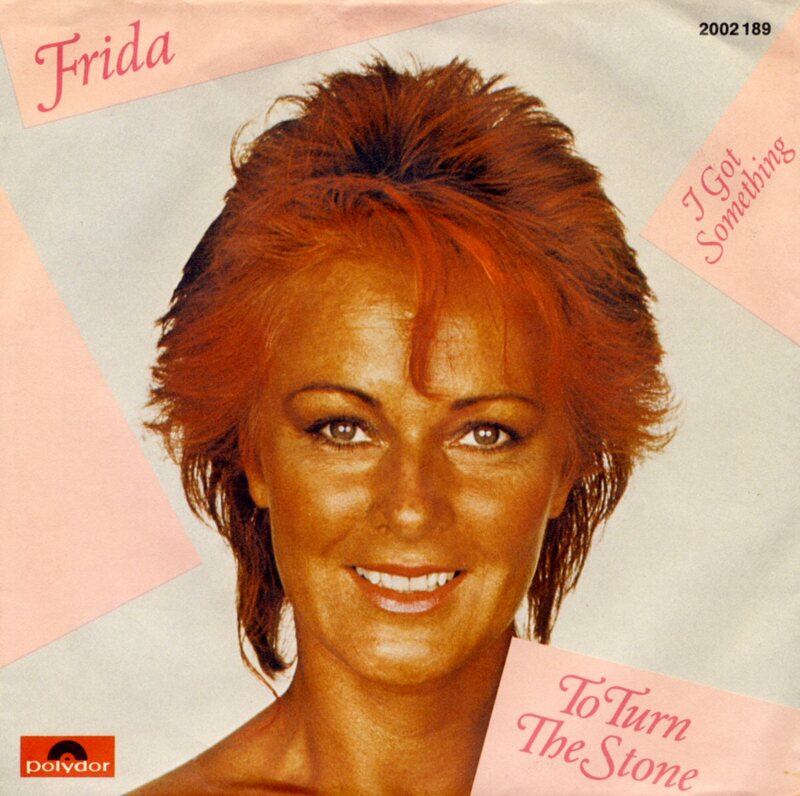 The UK issue of the single "To Turn The Stone" is probably the rarest Frida single from this period as it was released only in limited edition at the beginning of December 1982. 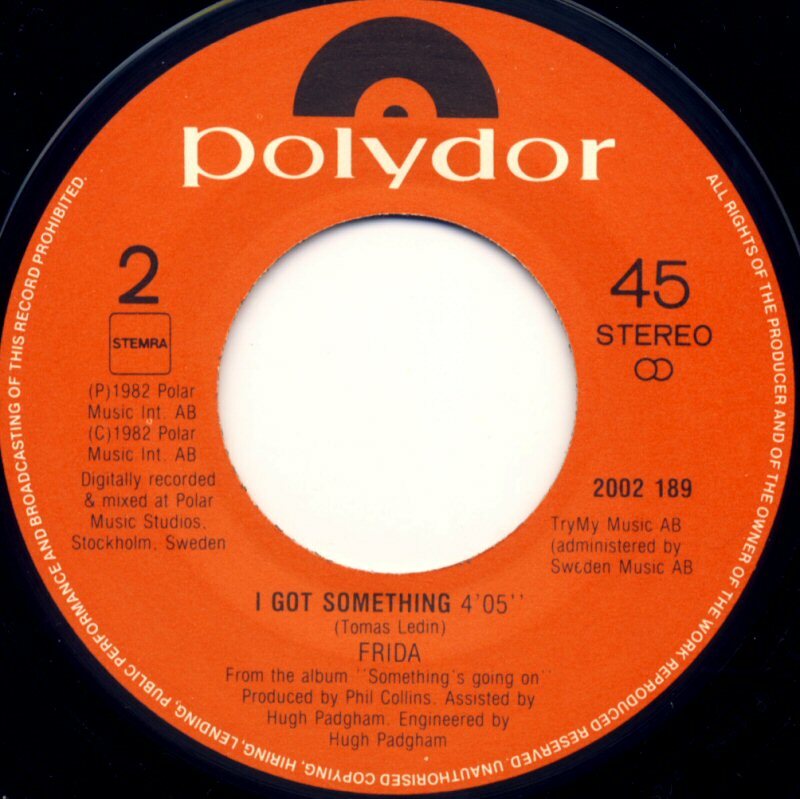 The promo version of the single was sent to radio stations and DJs and the first issue of it to shops. 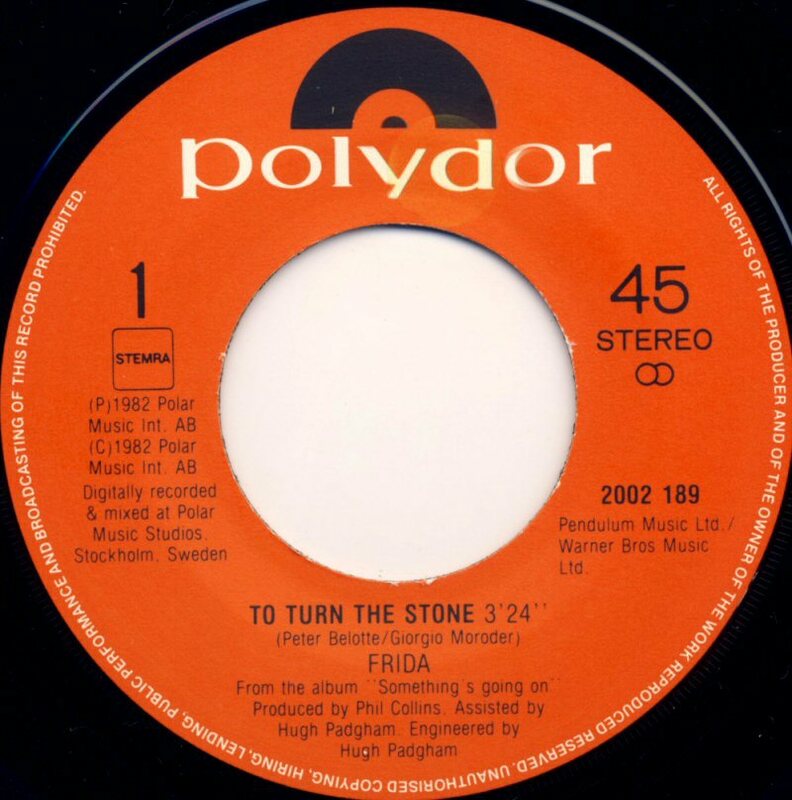 But "To Turn the Stone" did not make the British chart and the single was finally deleted which makes it to a big rarity today. 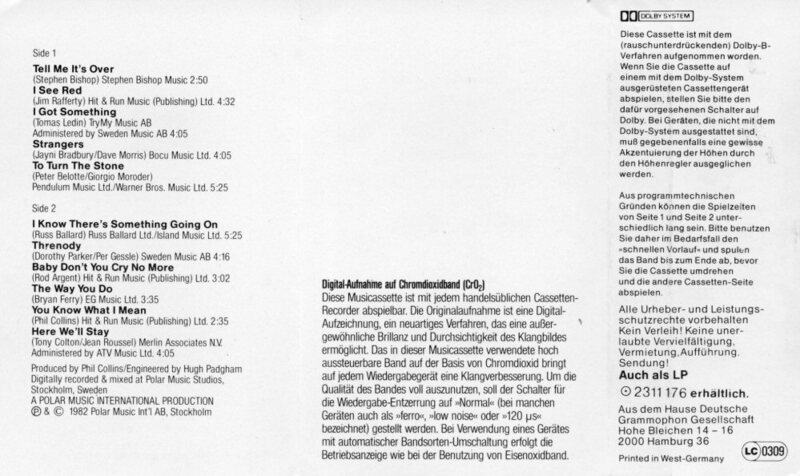 The cover was different to the German and Dutch releases. 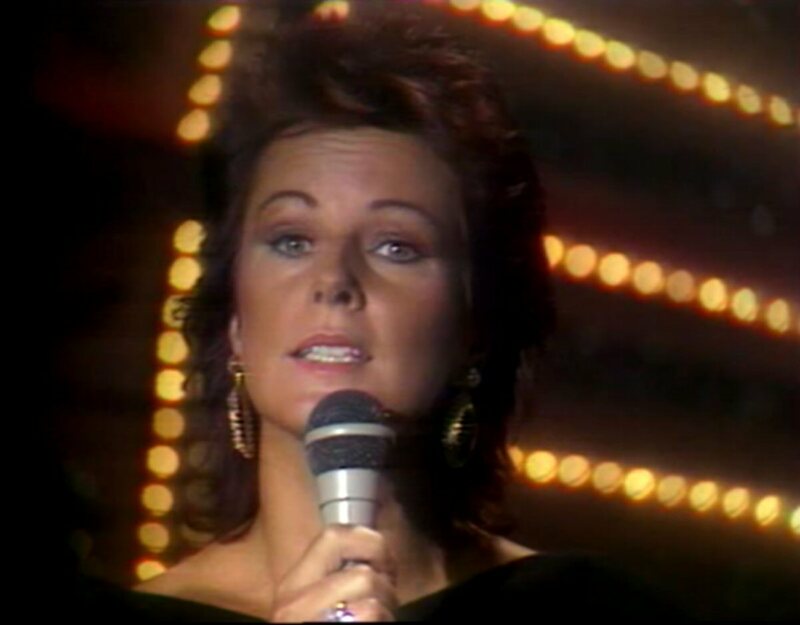 On December 23rd, Frida appeared on Swedish TV. 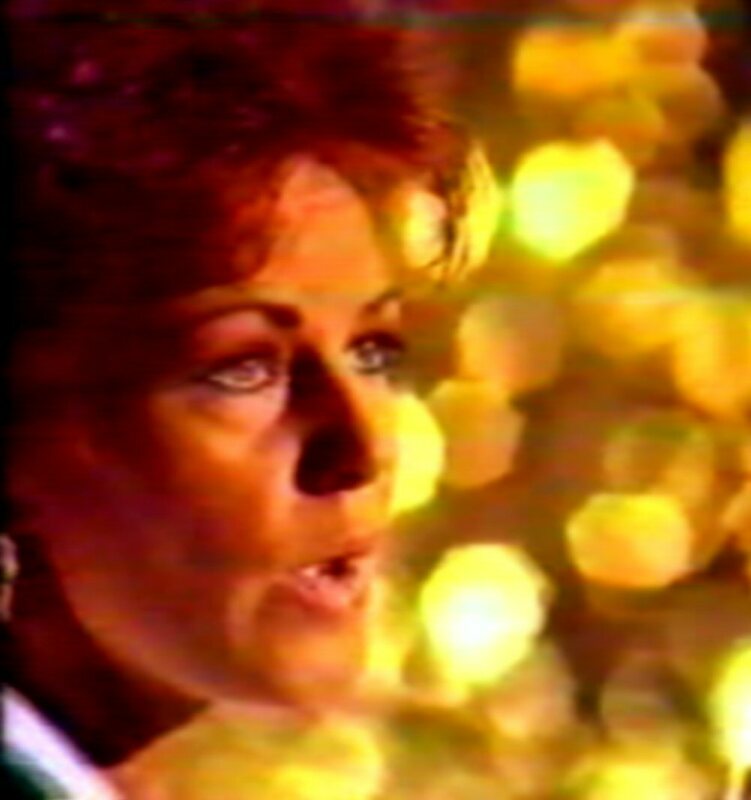 She performed "You Know What I Mean" on the TV special "Channel 3" . 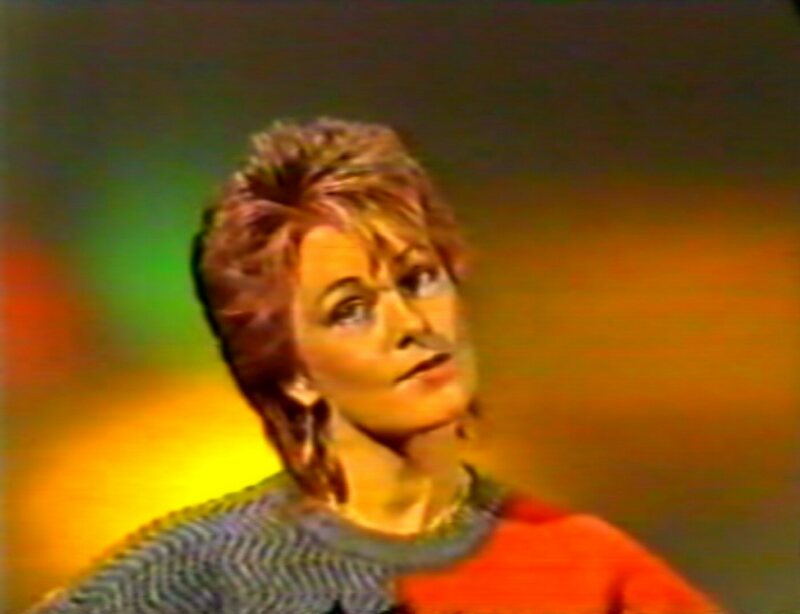 She was even interviewed by the show host. 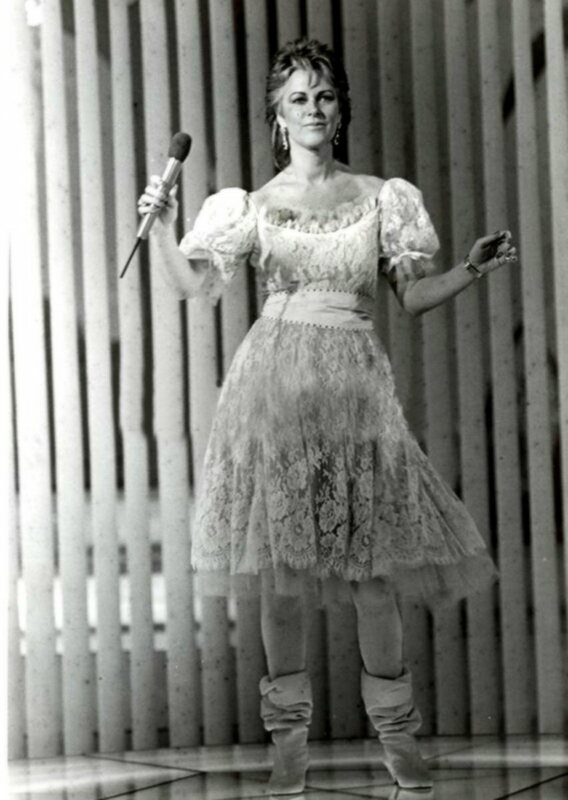 She was talking about singing and being famous. 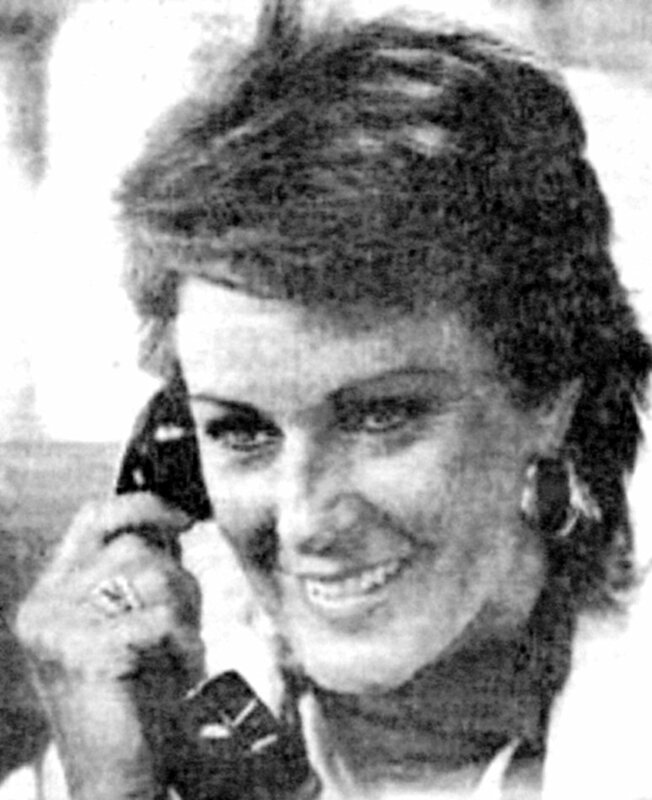 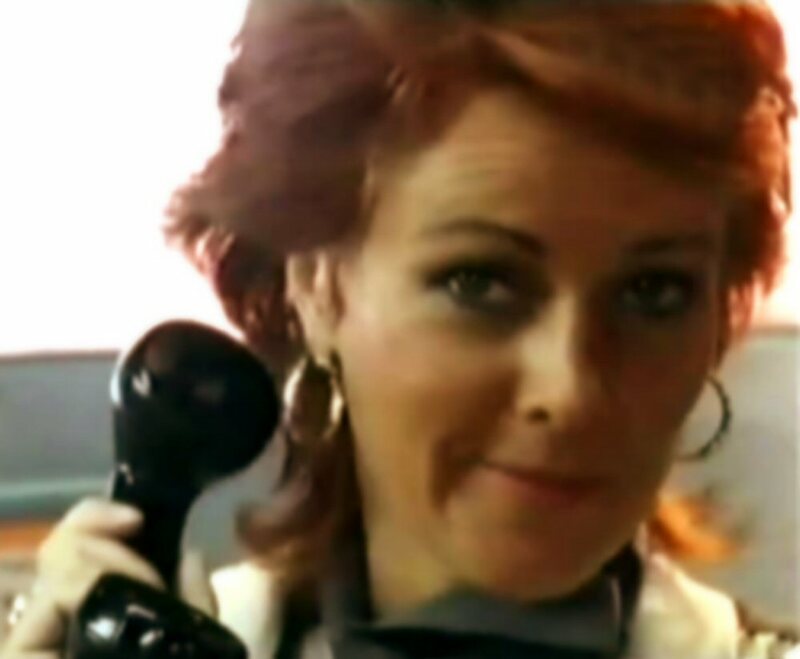 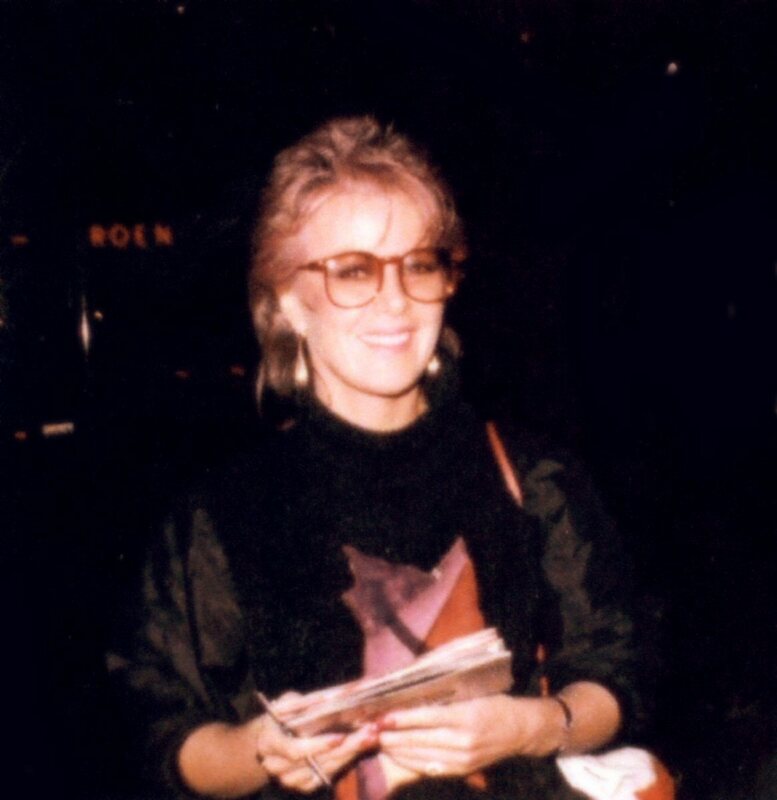 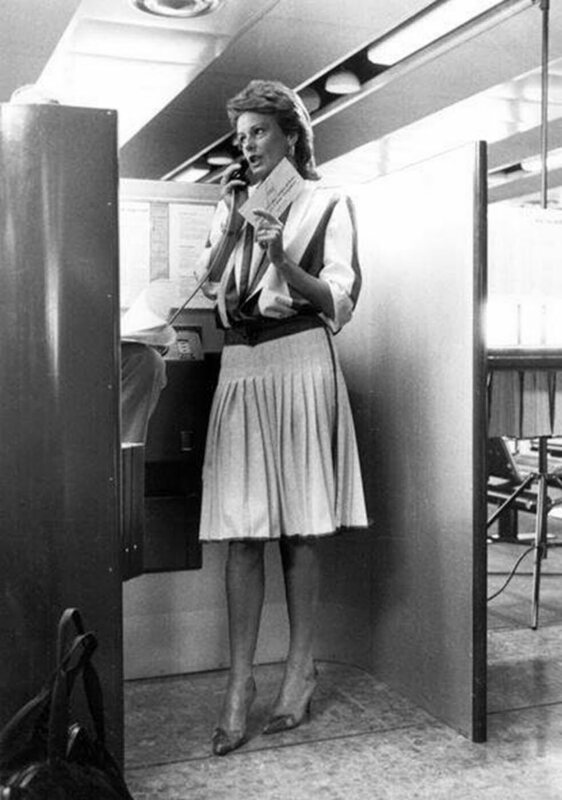 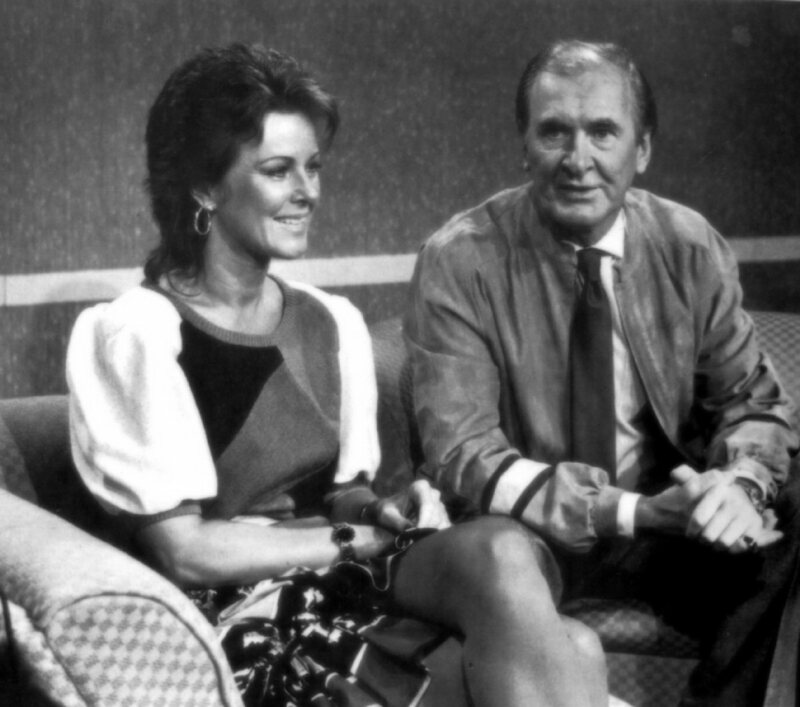 It was her last TV appearance in 1982. 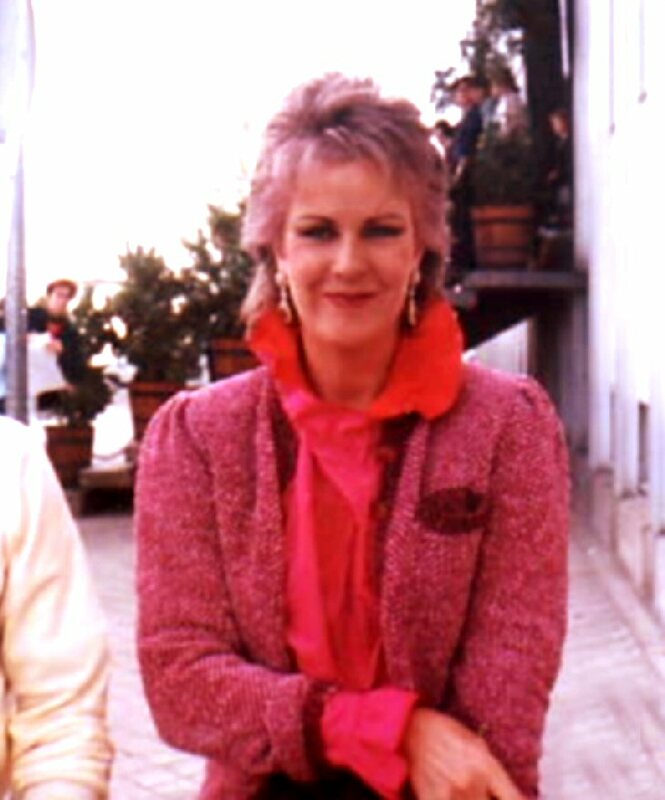 She was even interviewed by Italia press and posed for several photo sessions. 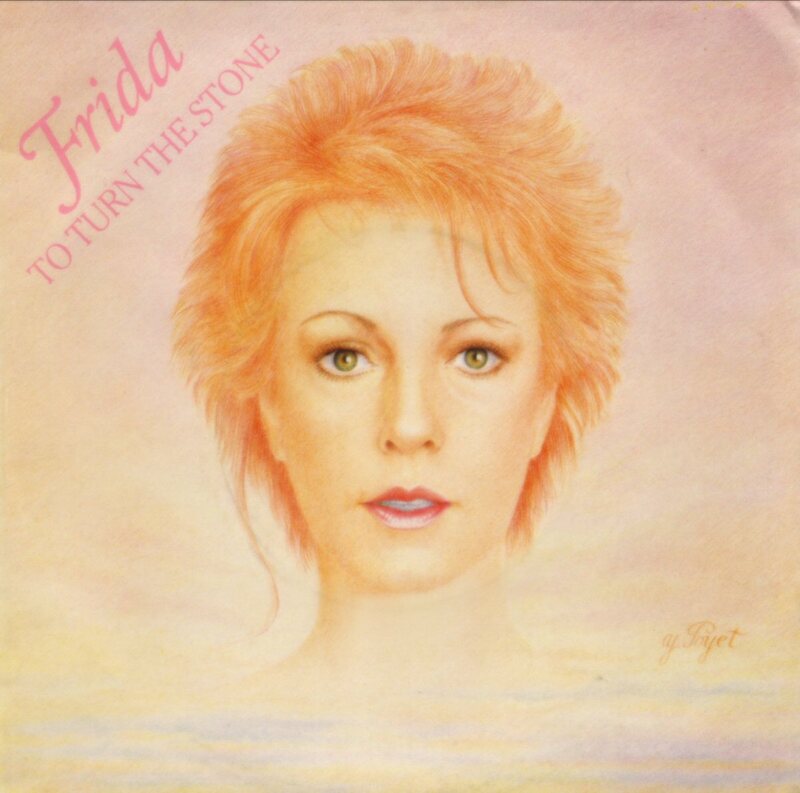 The new single "To Turn The Stone" was promoted on German TV on March 7th, 1983 in the TV special "Vorsicht Musik". 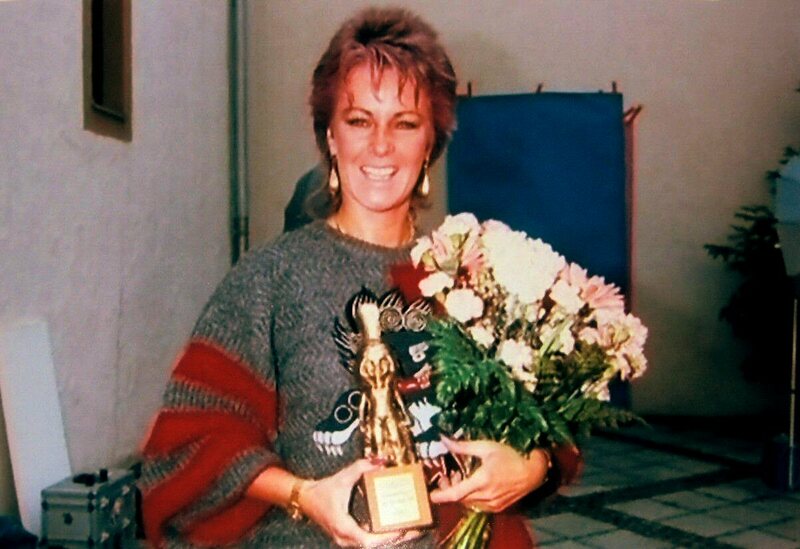 Frida received the "Bravo" Otto-statue being the third female singer of the year 1982 in West Germany. 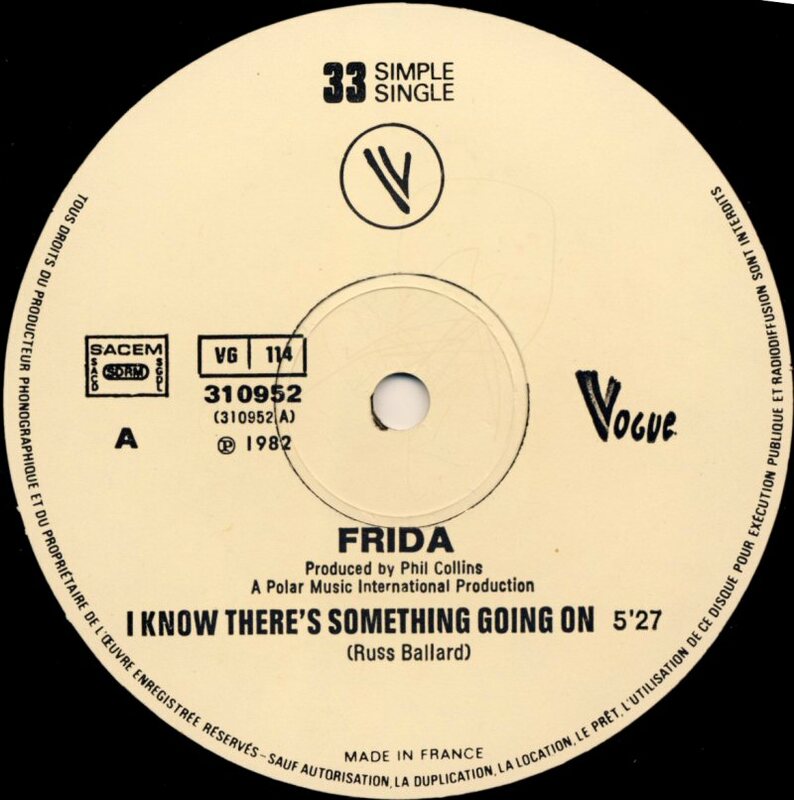 On March 16th Frida were in Geneve where she performed "Here We'll Stay" and "I Know There's Something Going On" on Swiss TV. 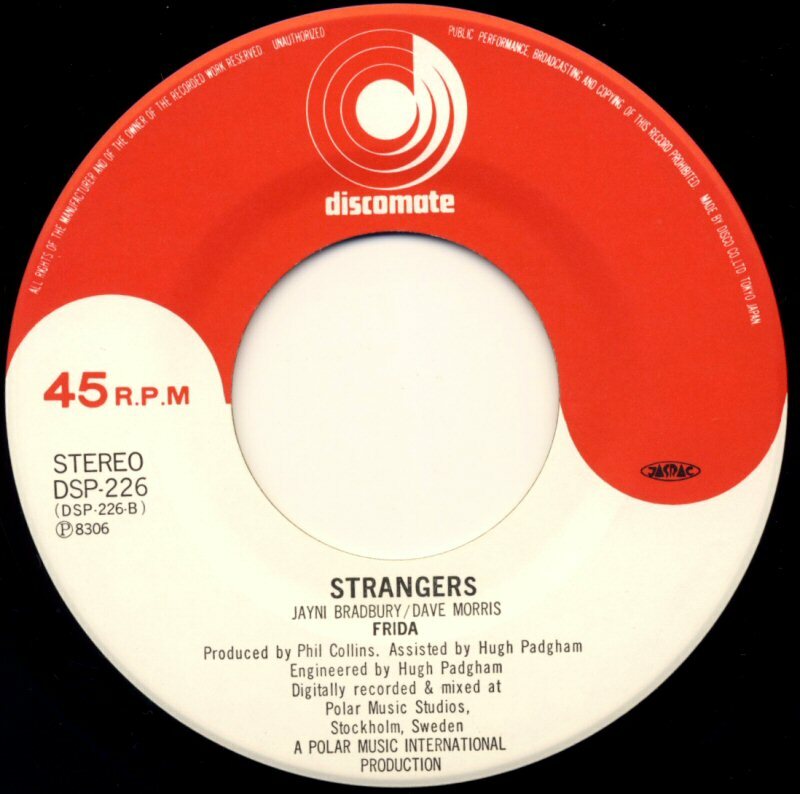 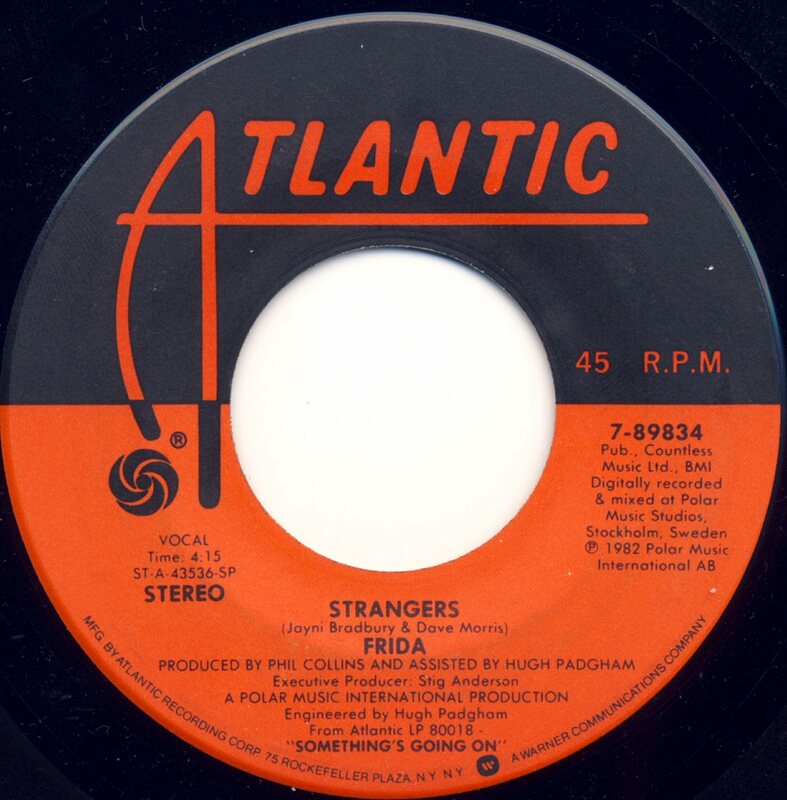 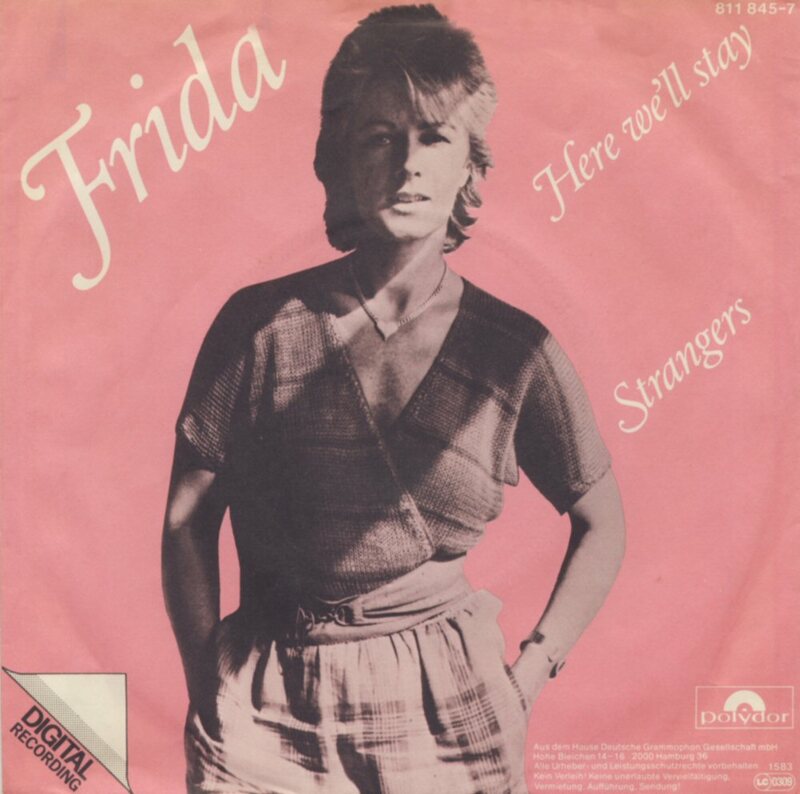 The last single from "Something's Going On" featured "Here We'll Stay" b/w "Strangers". 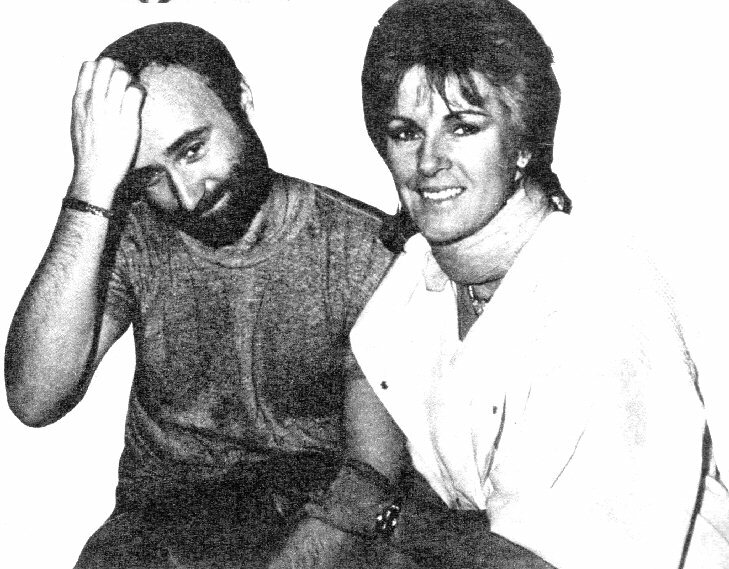 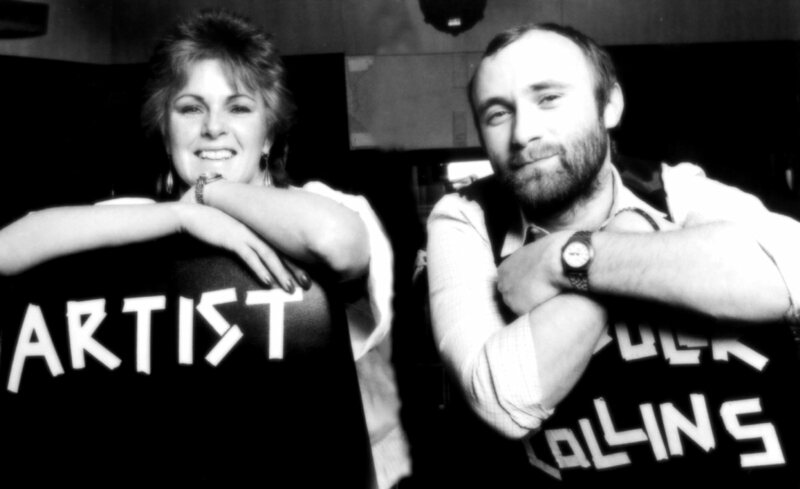 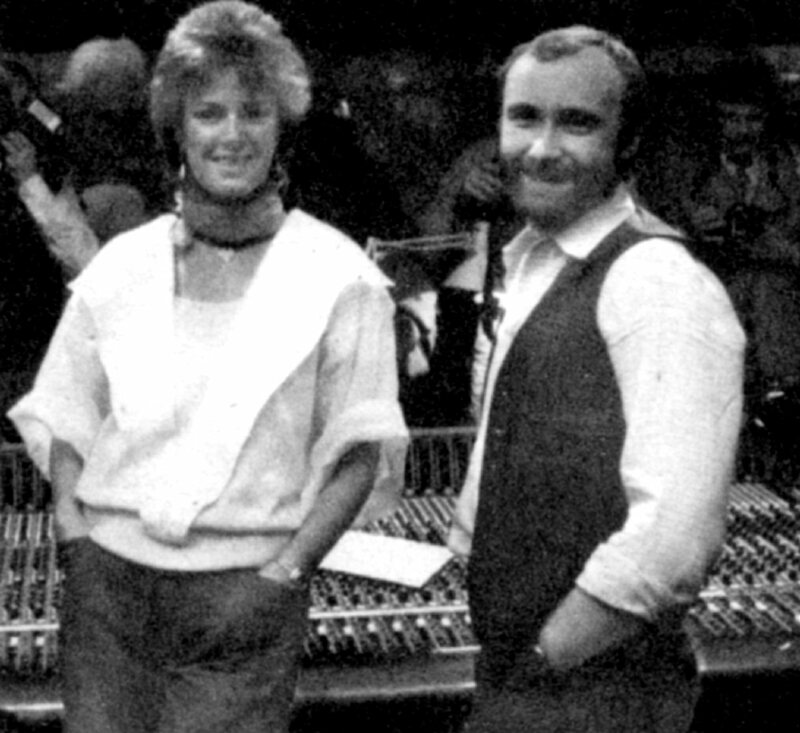 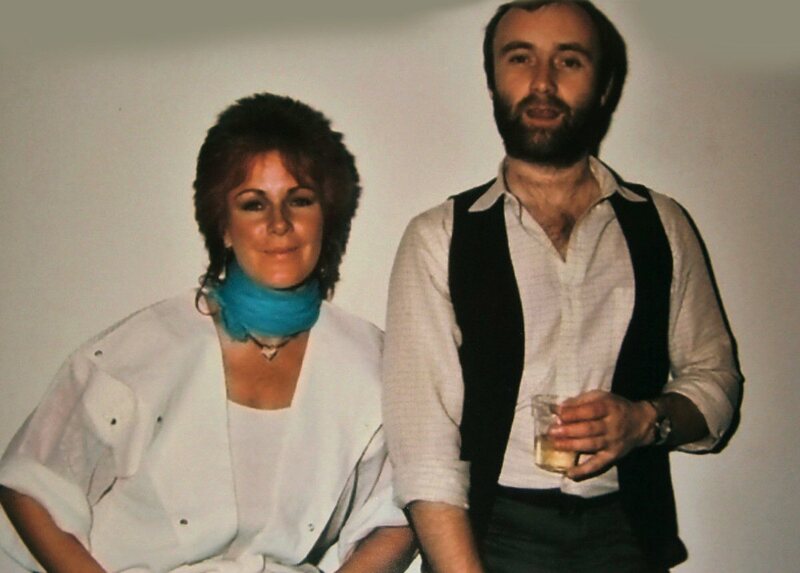 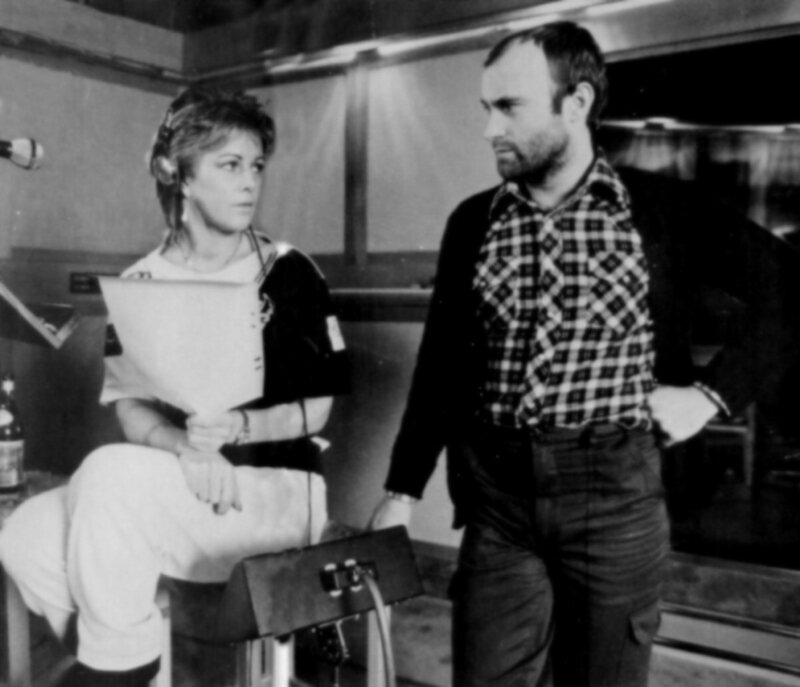 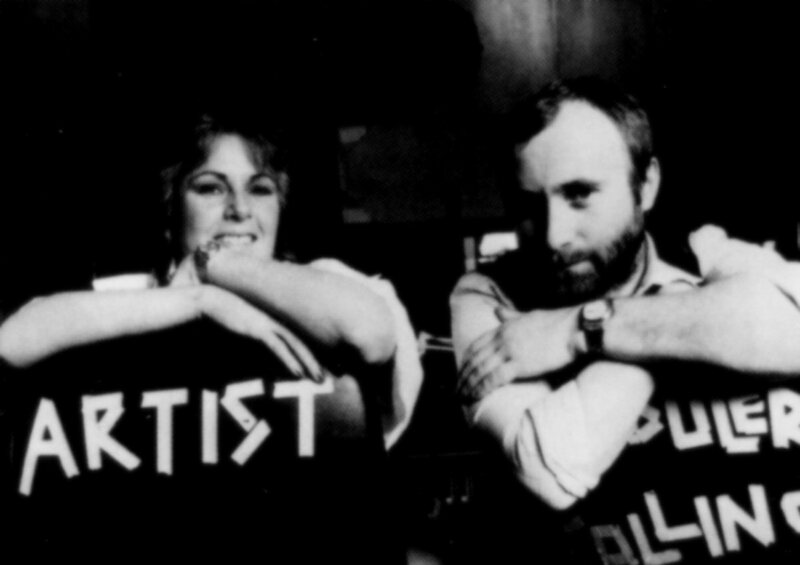 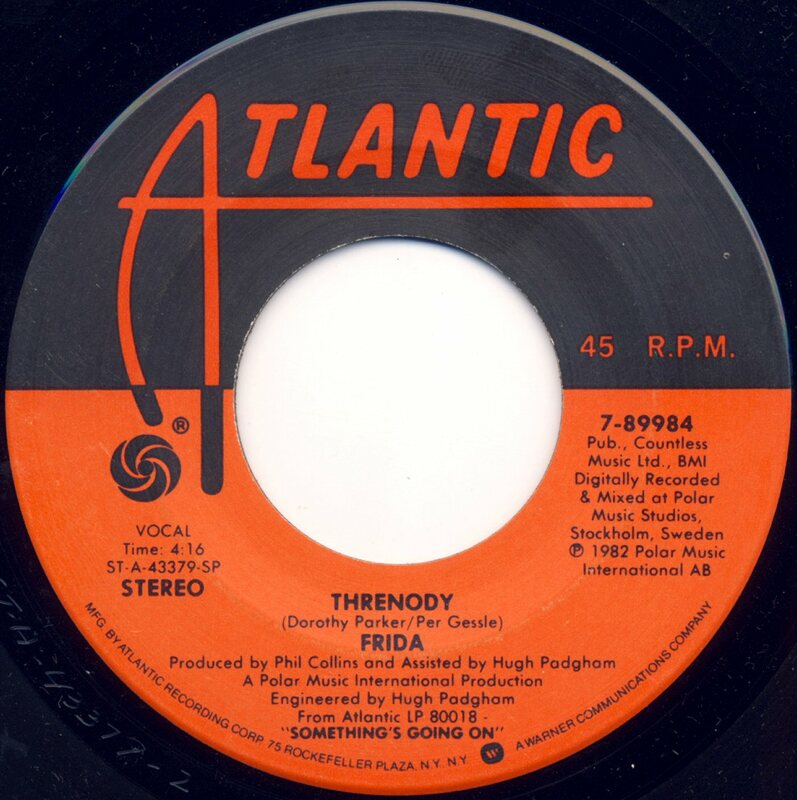 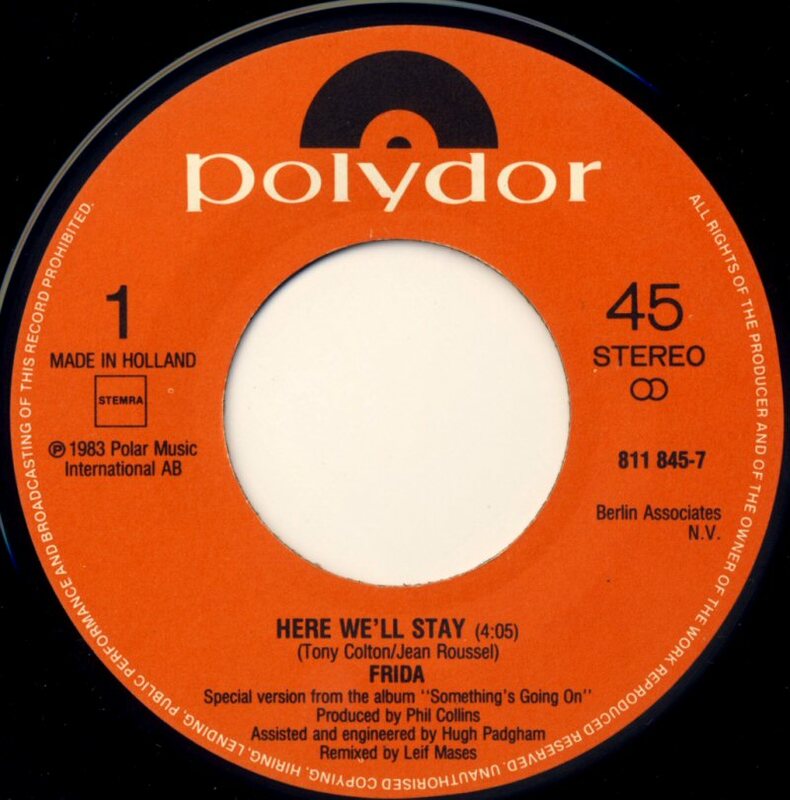 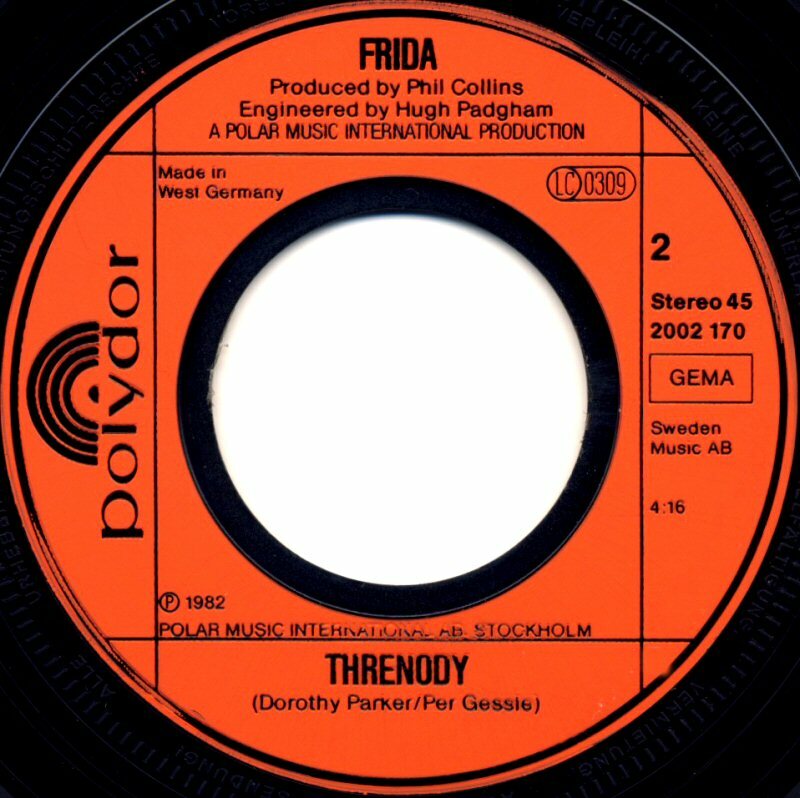 The LP version of "Here We'll Stay" was performed by Frida and Phil Collins but before the single release it had been decided that Frida would re-record the song alone. Collins was on the way to start his own solo career and he did not want to cause confusion singing on Frida's solo single. 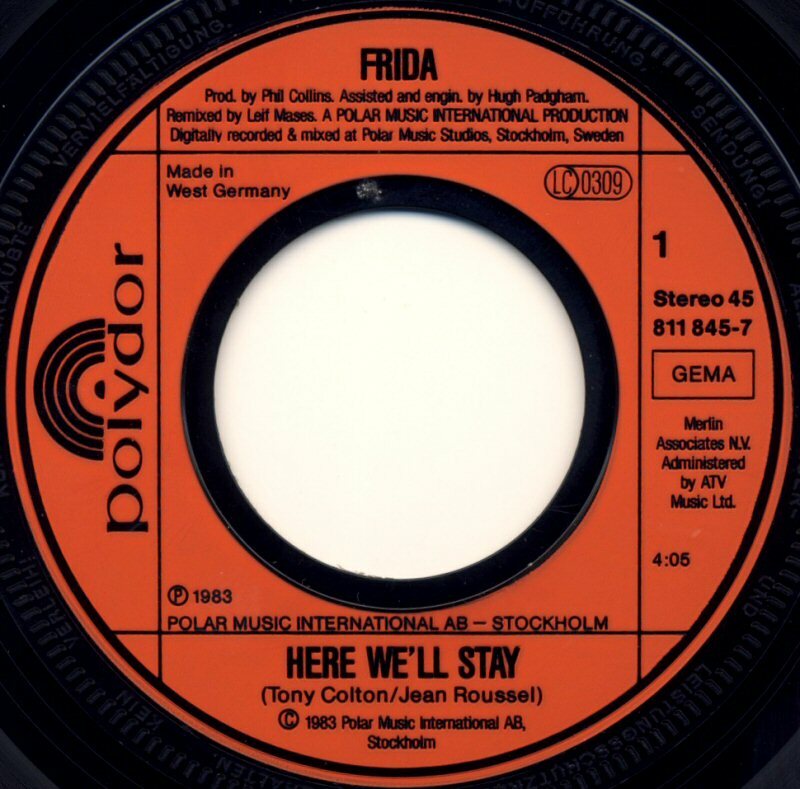 "Here We'll Stay" did not enter the Swedish chart "Kvällstoppen". 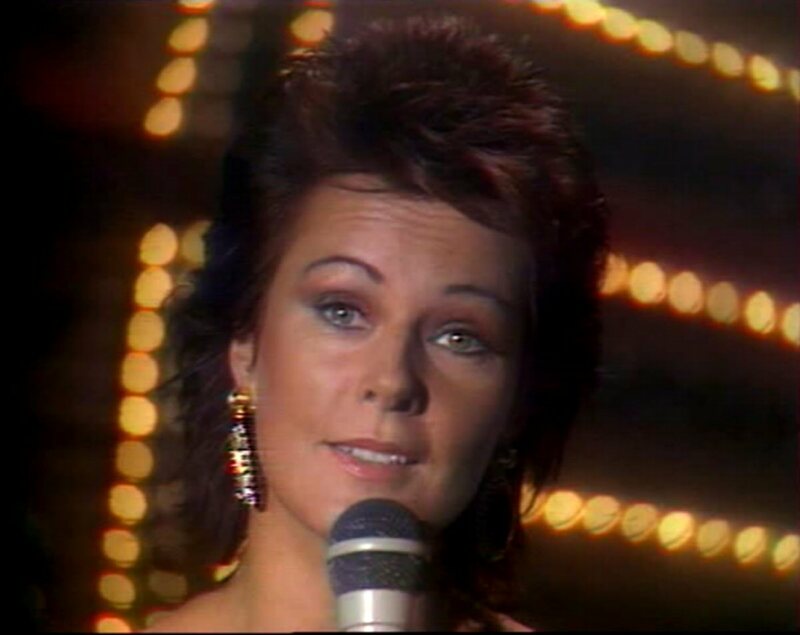 The other chart "Svensktoppen" did not exist between 1982 and 1984. 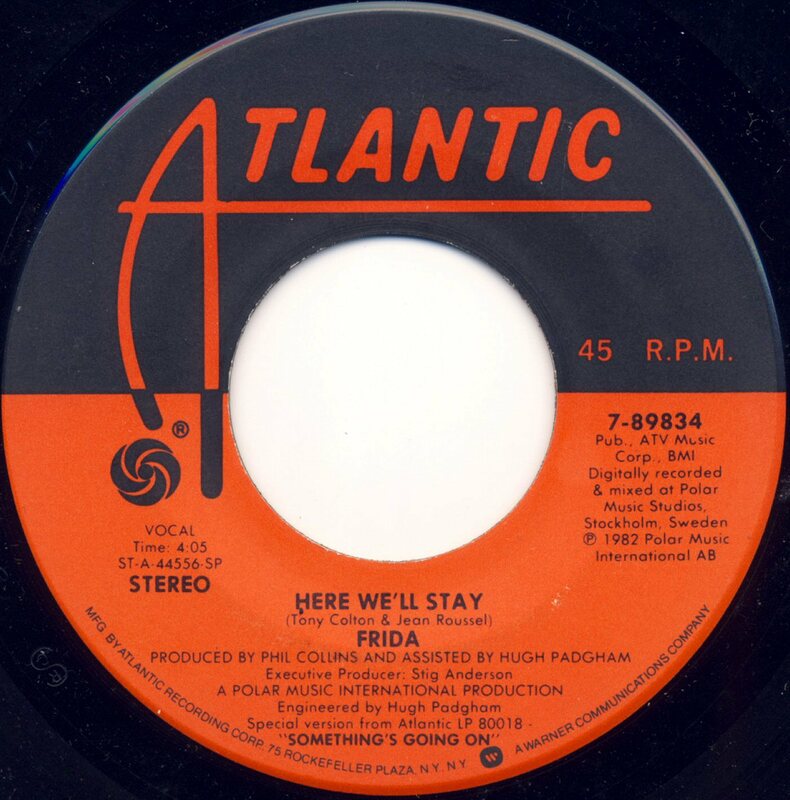 "Here We'll Stay" appeared briefly on the British chart in June 1983 where it reached #100. 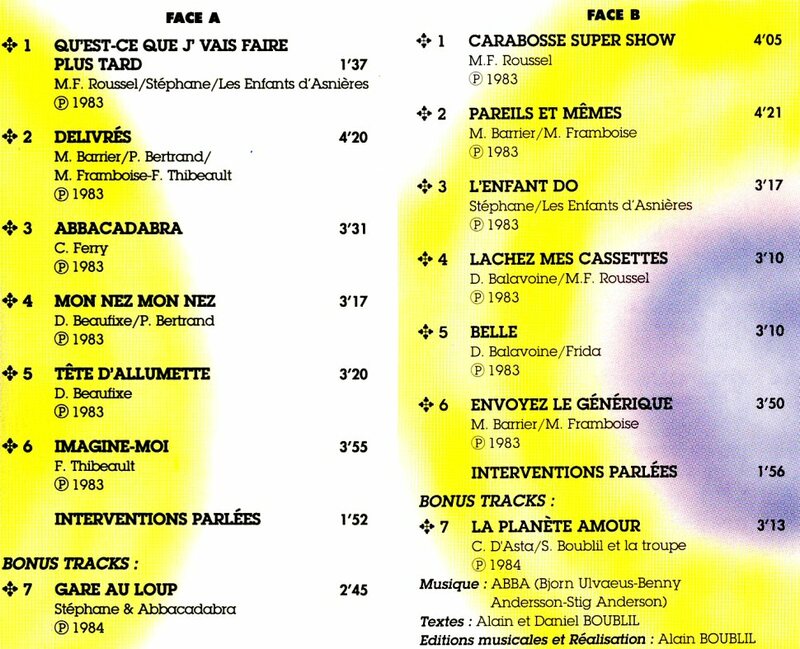 In France the single was relatively more successful peaking at #34. 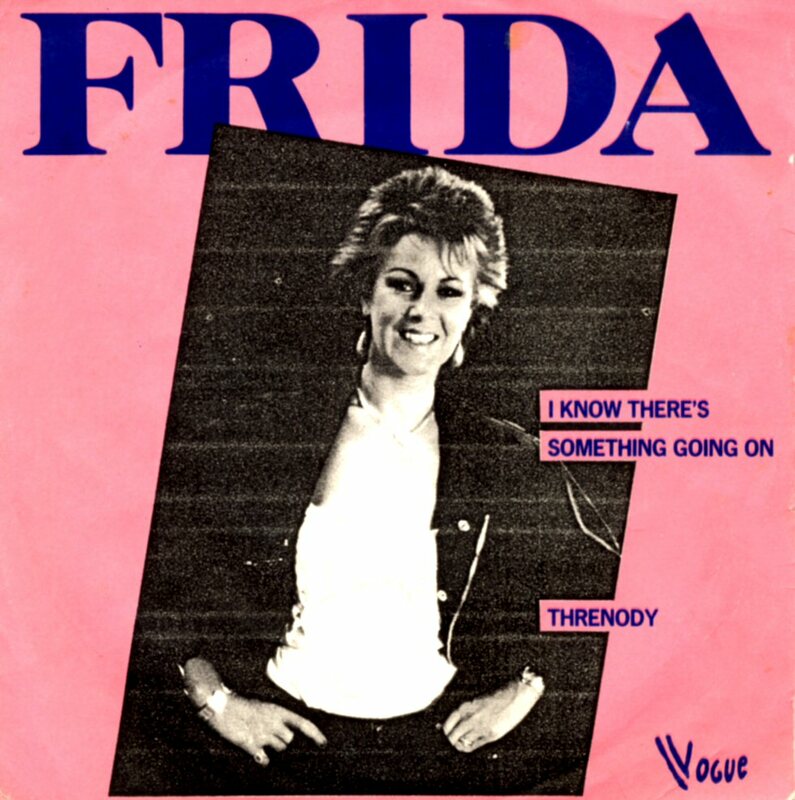 In Holland the single entered the chart on May 7th, 1983 where it stayed for 3 weeks peaking #34. 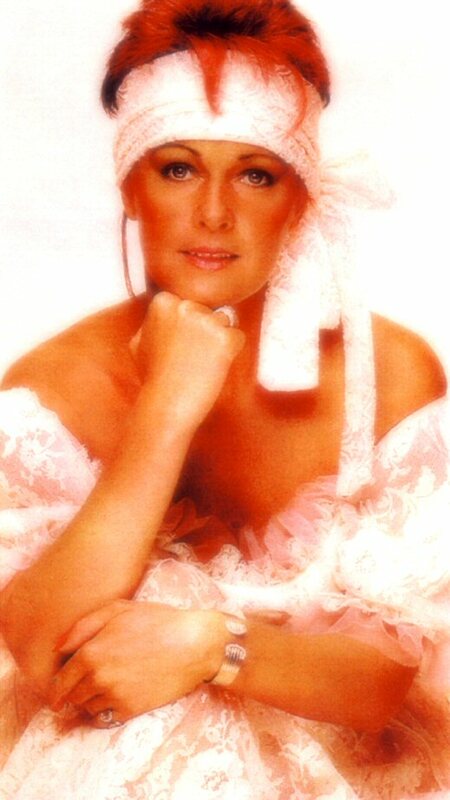 In USA the single peaked at #102. 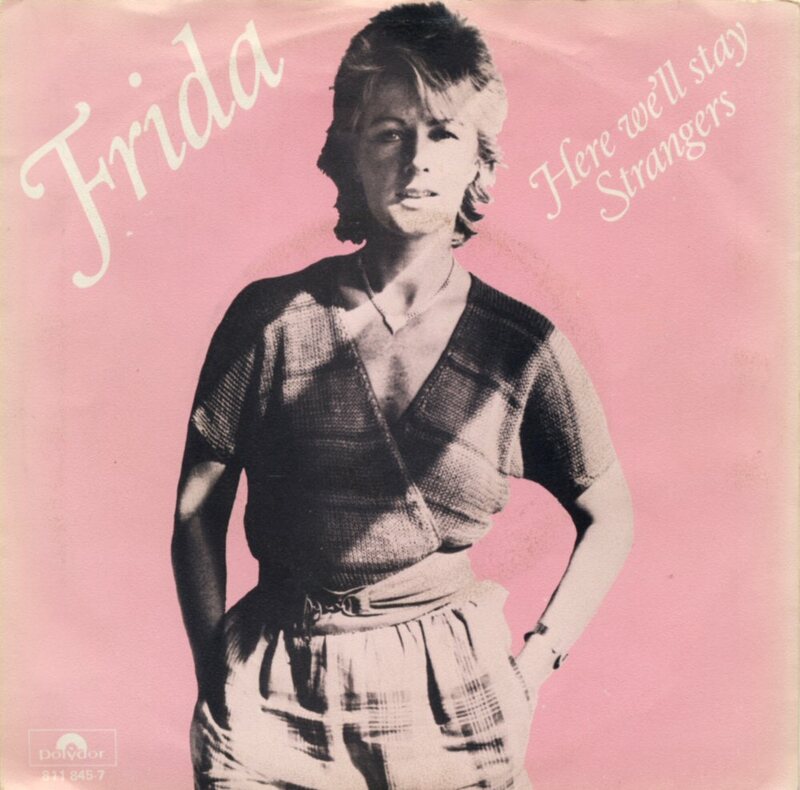 Frida promoted "Here We'll Stay" on German TV in Köln on April 26th, 1983. 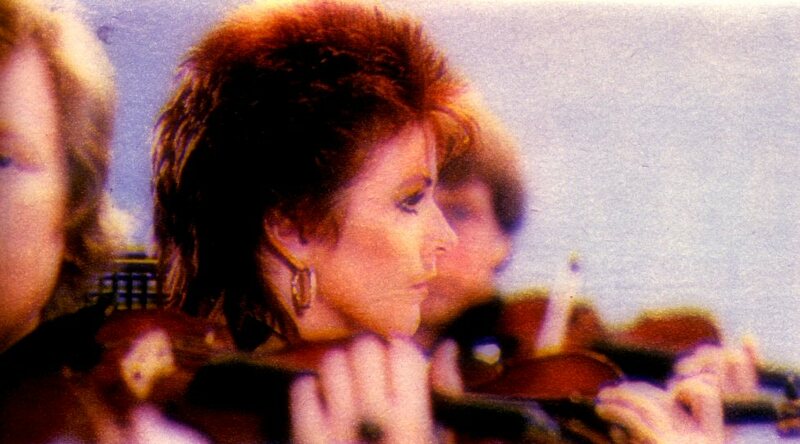 In France she promoted "Here We'll Stay" the day after the appearance on German TV, in the show "Cadence 3". 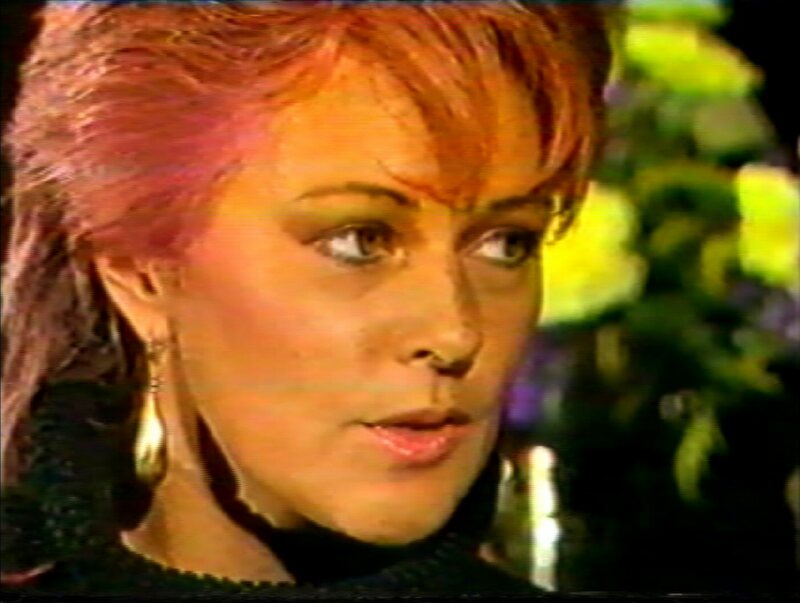 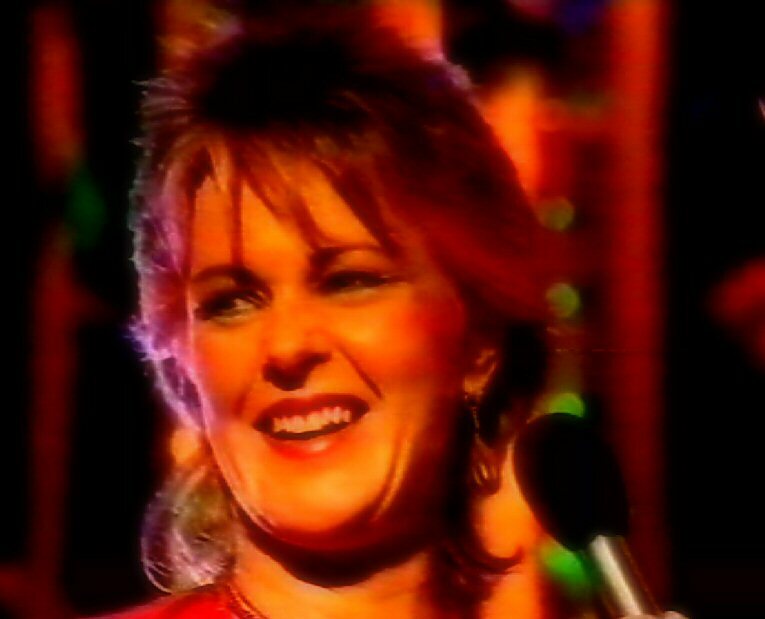 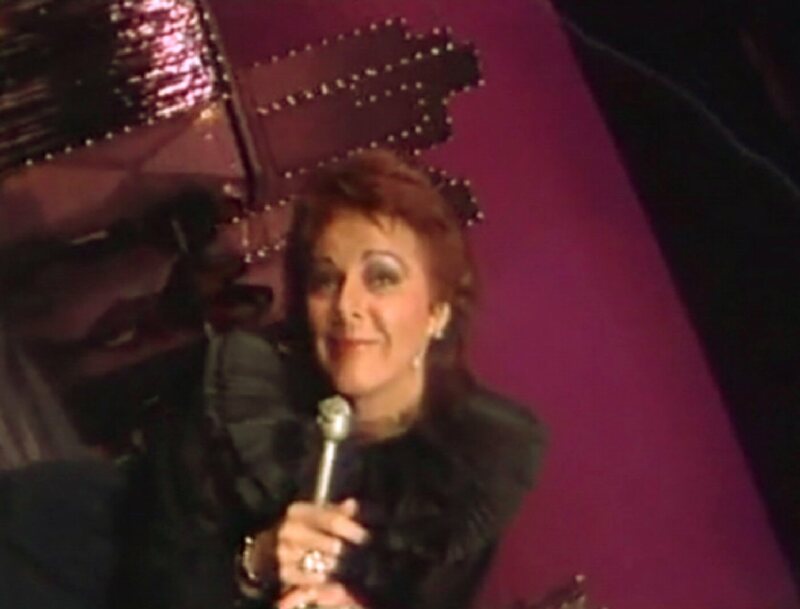 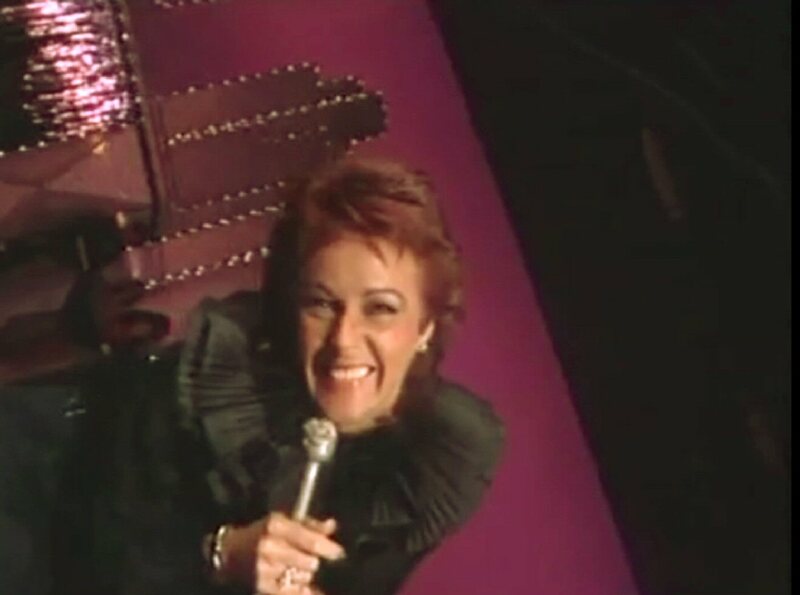 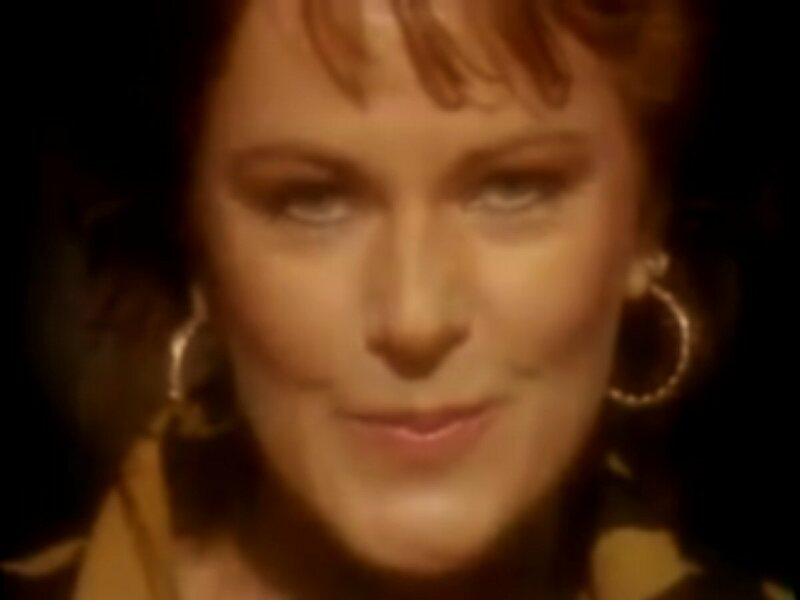 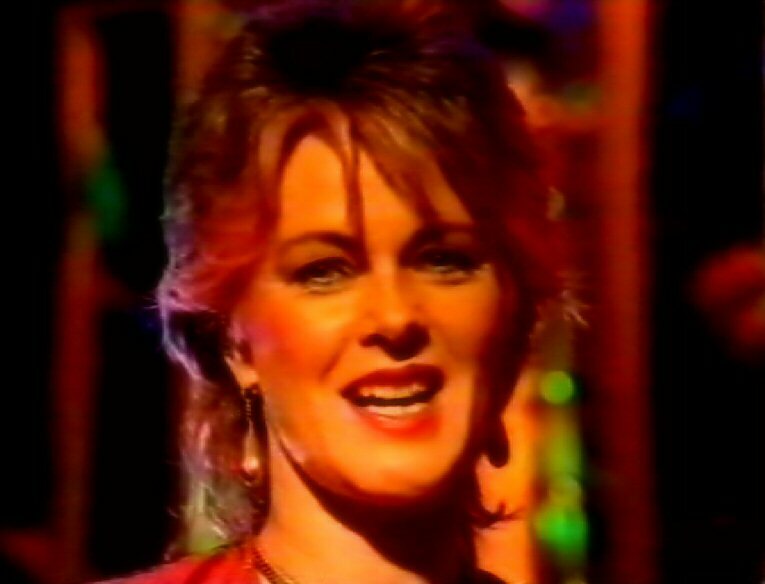 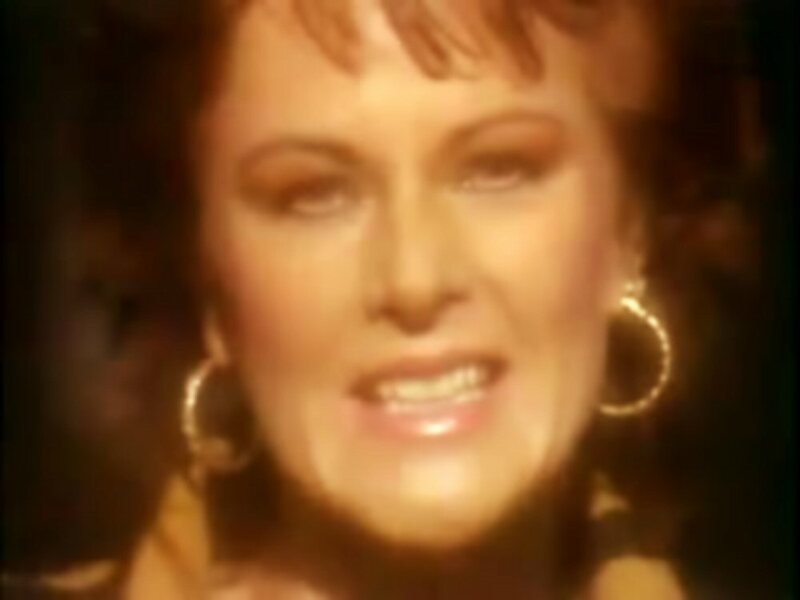 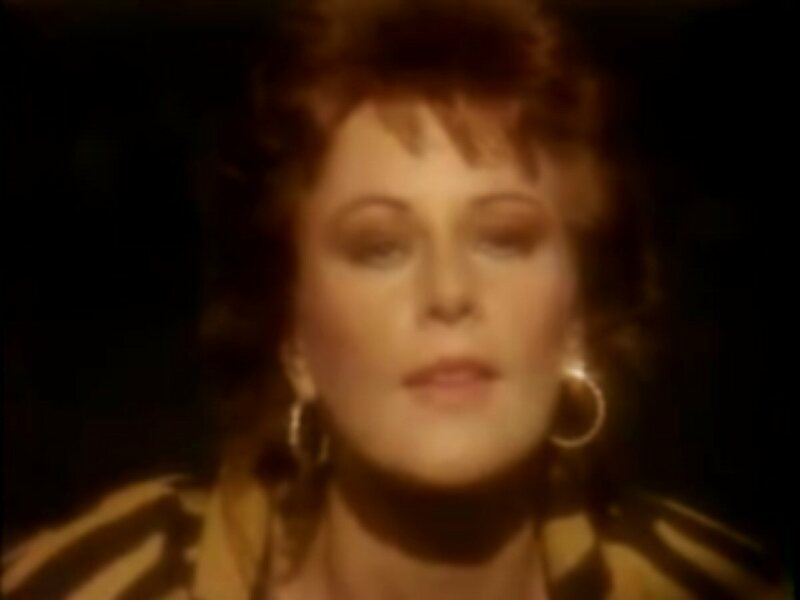 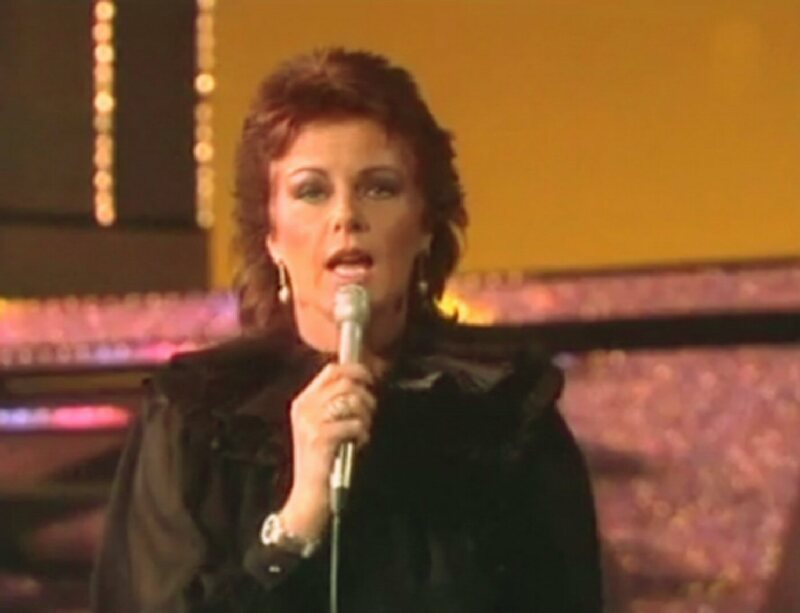 On June 4th, 1983 Frida appeared in the German TV show "Einer wird gewinnen" where she performed "Here We'll Stay" and "I Know There's Something Going On". 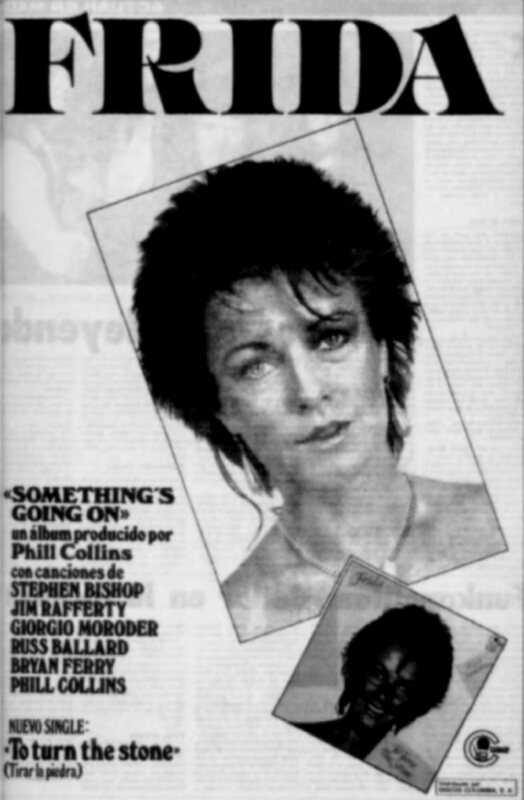 It was the final TV appearance promoting the album "Something's Going On". 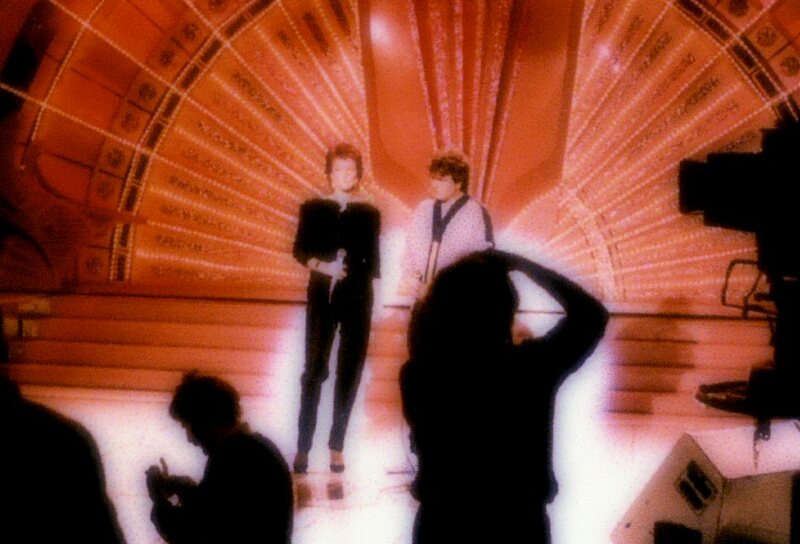 Actually there were two different videos filmed for the promotion of the single "Here We'll Stay" The first one was filmed in Stockholm on April 25th, 1983 - it was directed by Lasse Hallström and it would be released as the official promotional video. 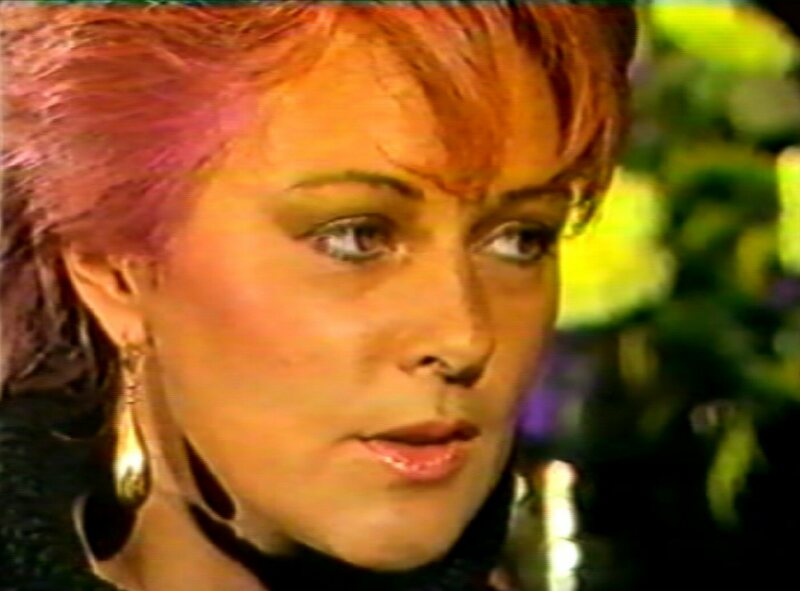 The second one - the Casino video - which is quite unknown featured Frida sitting at the roulette and several extras playing it. 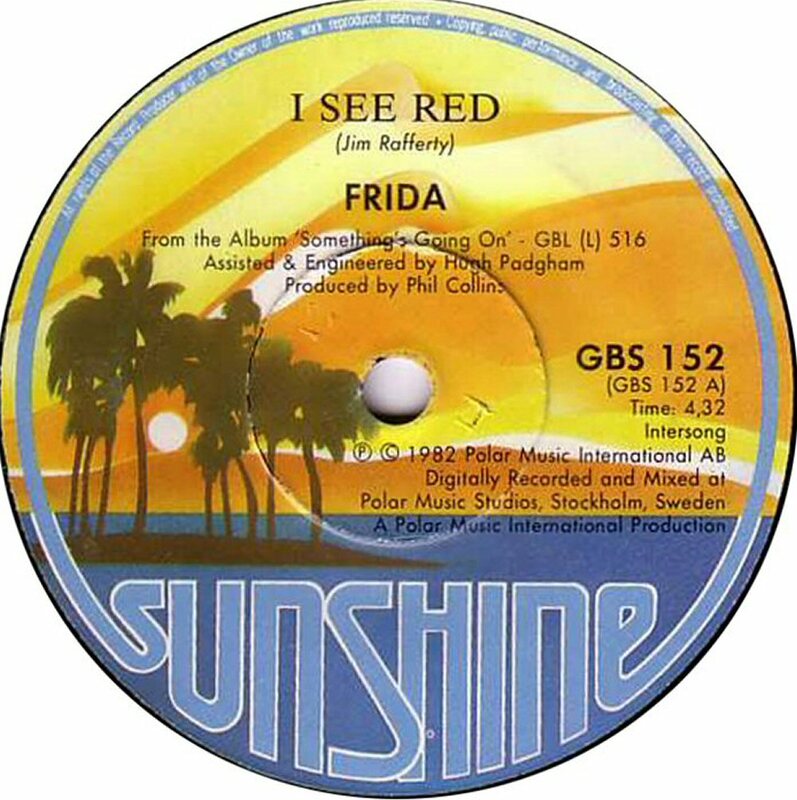 "I See Red" was chosen as a next single in South Africa. 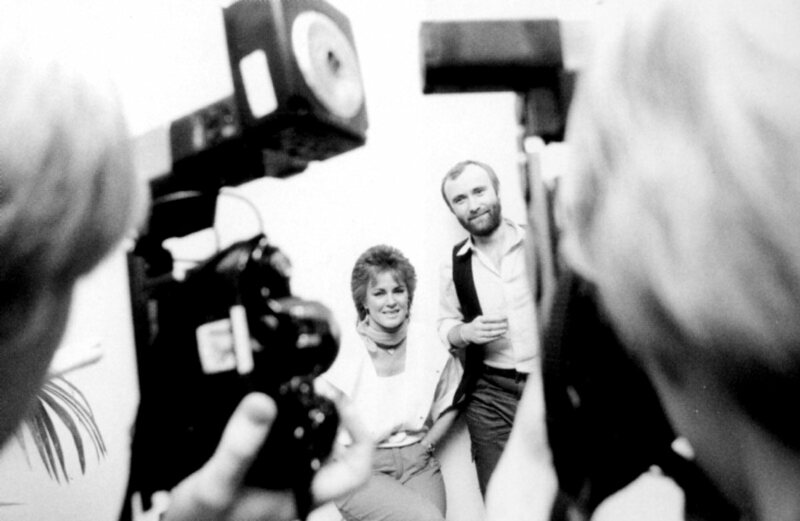 Even a promotional video was filmed. 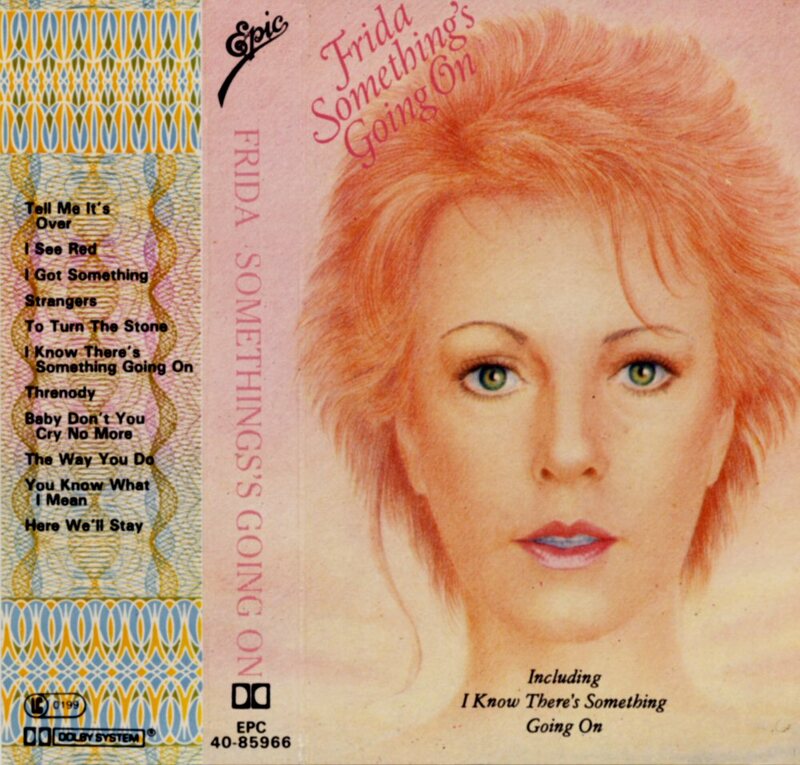 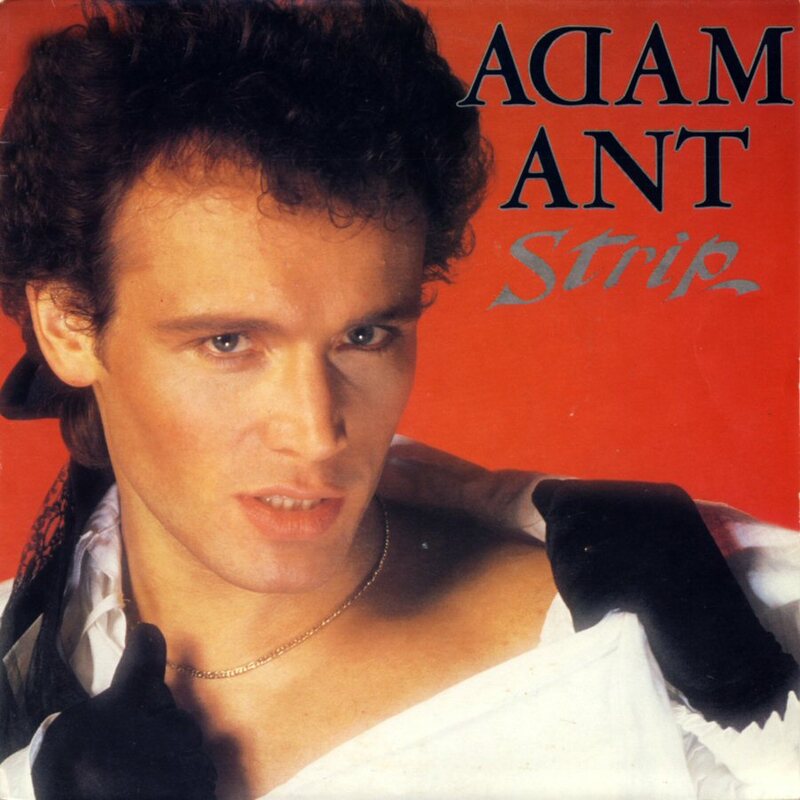 When the "Something's Going On" gang met each other in Stockholm again one more later it was almost sure that even Frida would join the company and do something in project started by the British pop star of the 1980s Adam Ant. 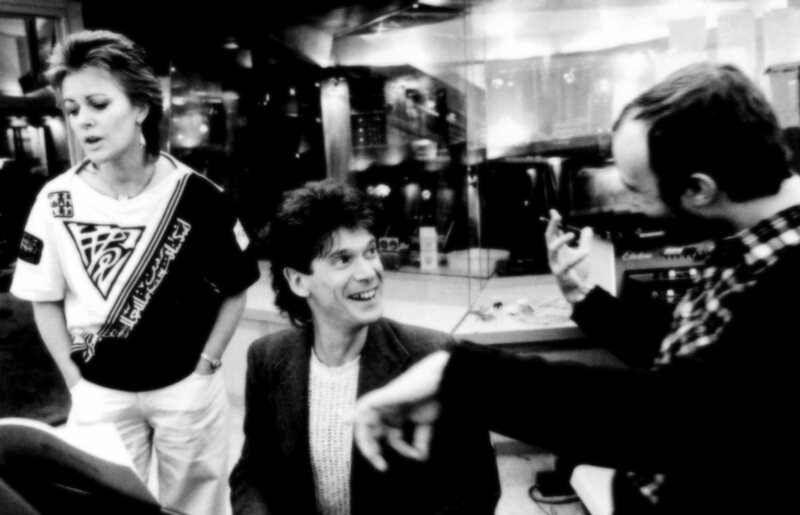 Ant came to Stockholm in order to record his new solo album including two songs produced by Phil Collins and Hugh Padgham. 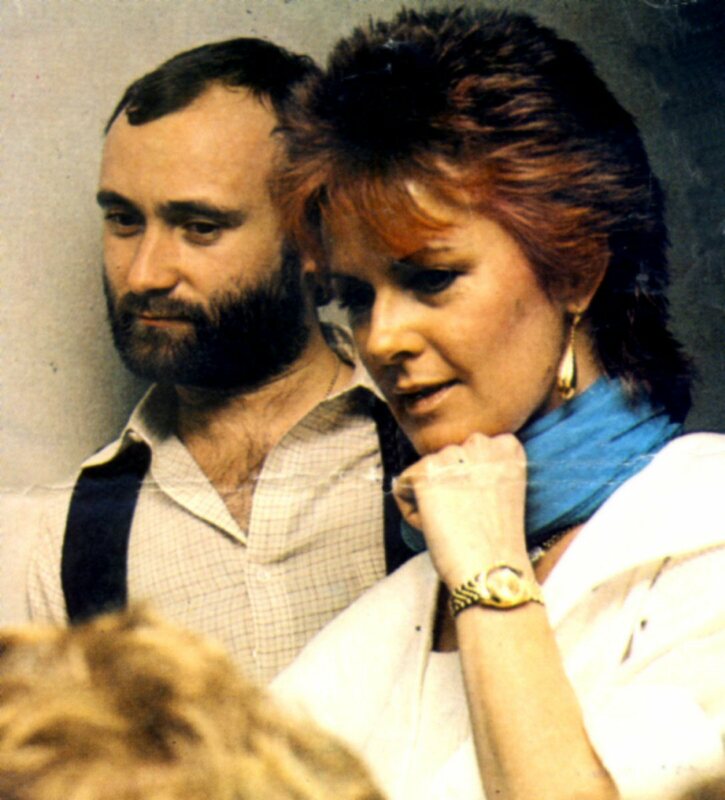 Collins played even drums on two tracks and Michael B. Tretow mixed 8 of 10 songs on the album and the ABBA-musician Rutger Gunnarsson played on the title track "Strip". 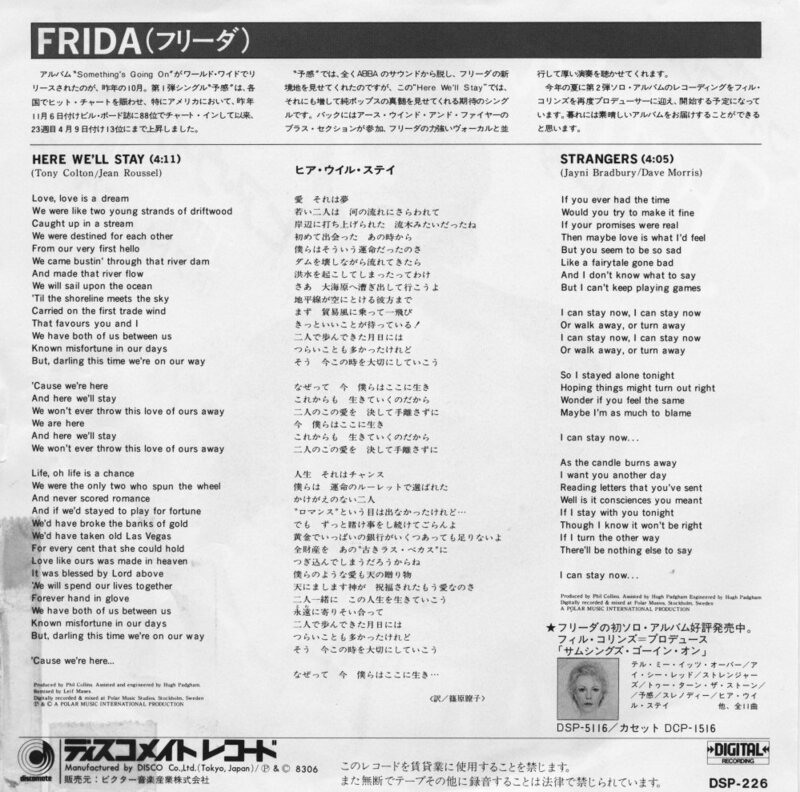 Frida appeared in "Strip" with a speaking part. 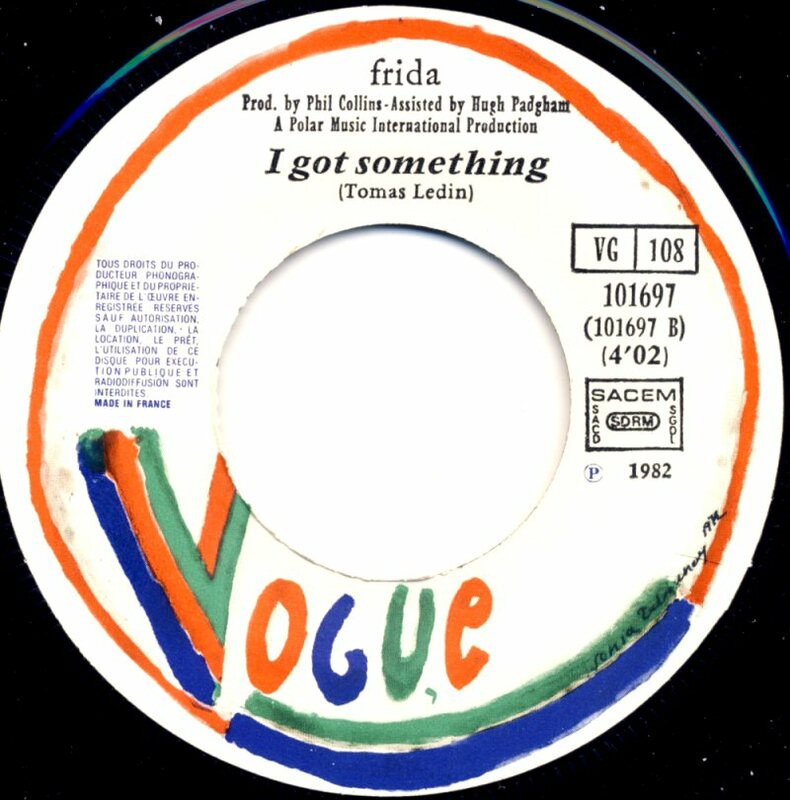 Frida's part: "It's at times like this, the great heaven knows/that we wish we had, not so many clothes/so lets loosen up, with a playful tease/like all lovers did through the centuries." 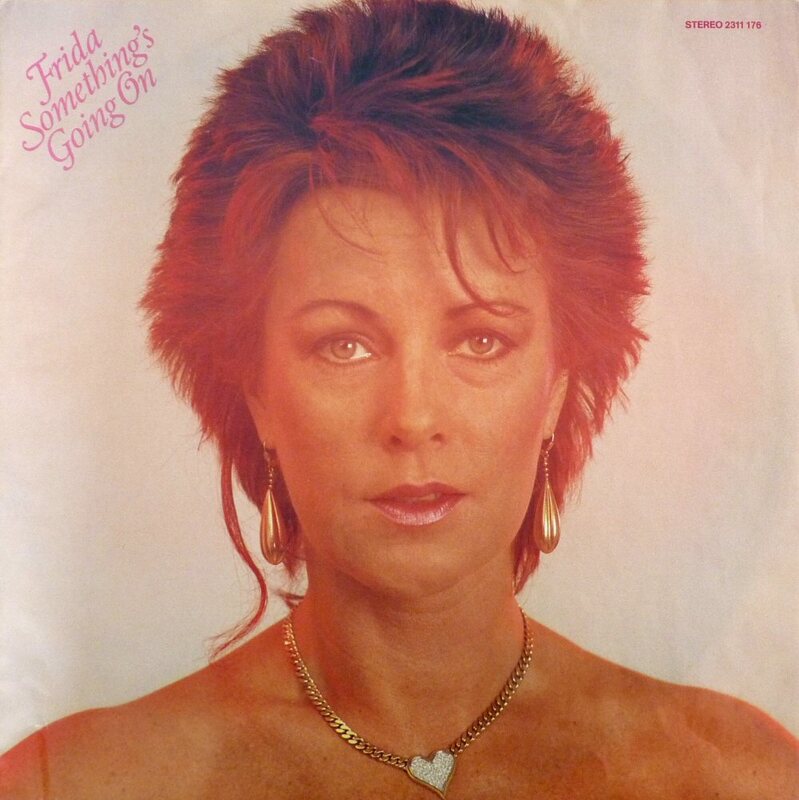 ...and the single "Strip" in December the same year. 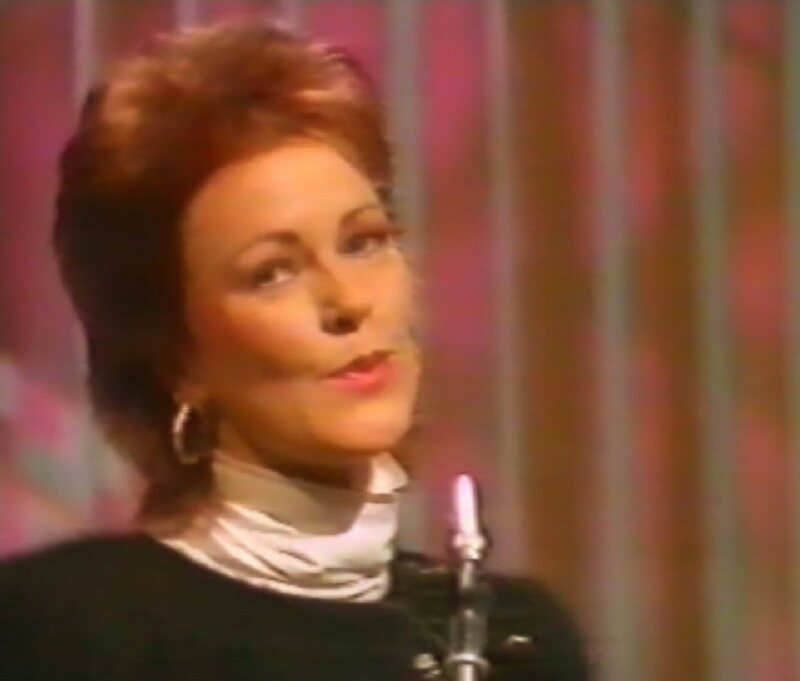 Frida appeared on the TV-special "Gäster hos Hagge" (Hagge's guests). 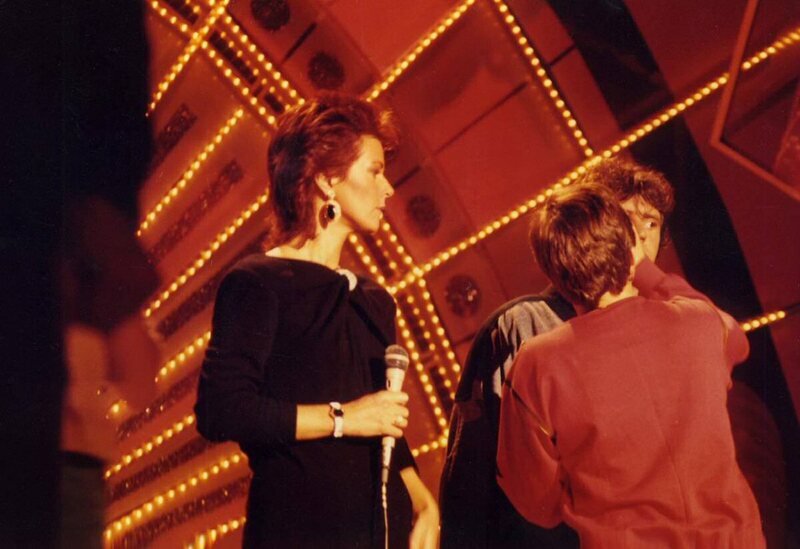 The show was recorded on May 5th, 1983. 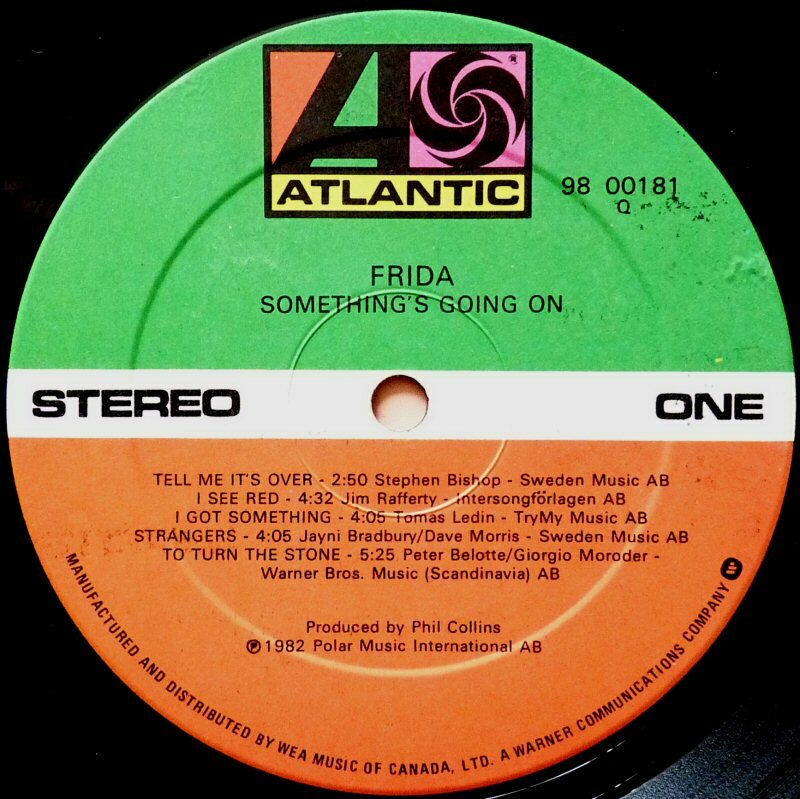 Frida had just come back from a world wide promotion of her solo album "Something's Going On" and she seemed to be very tired. 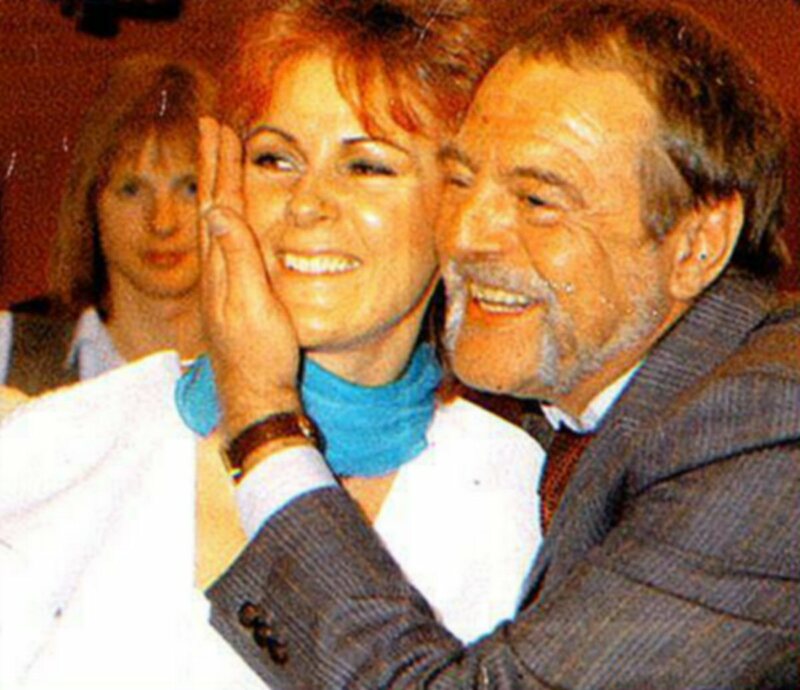 Hagge Geigert remembers this programme in his book "Gäster hos Hagge" which was issued in 1989. 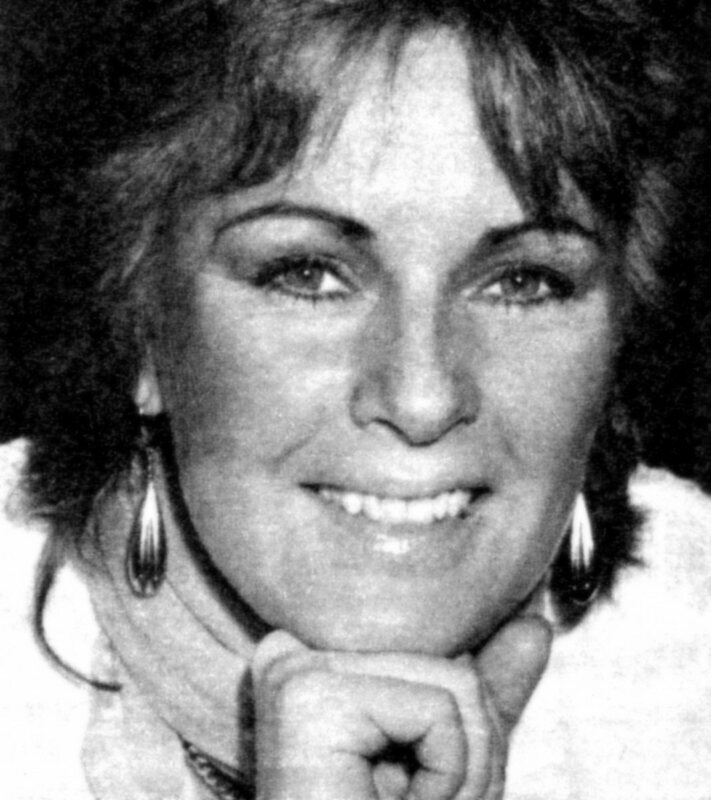 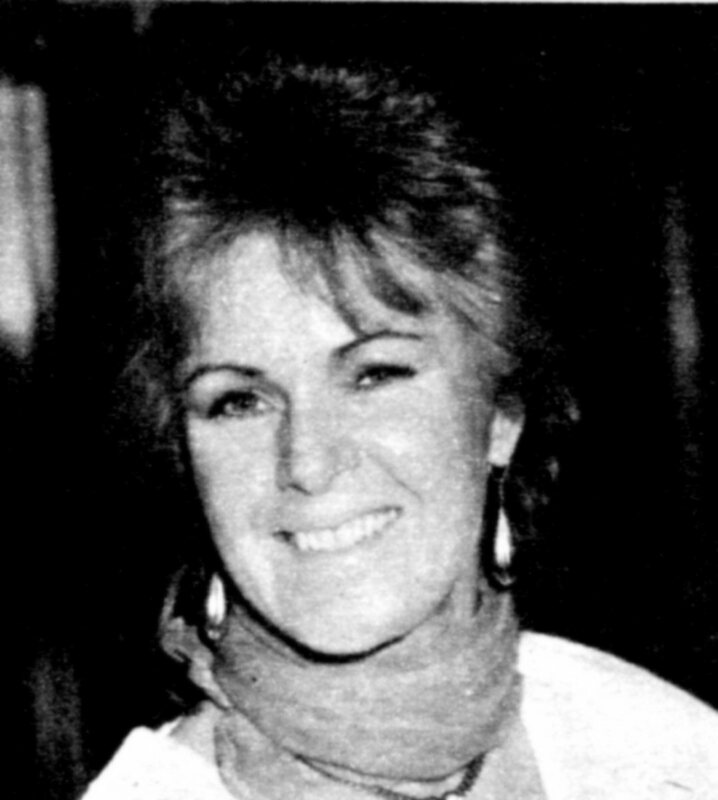 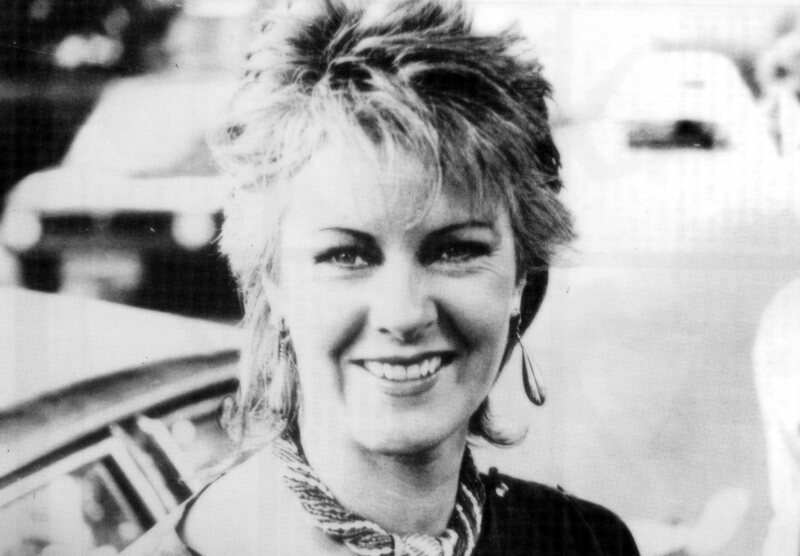 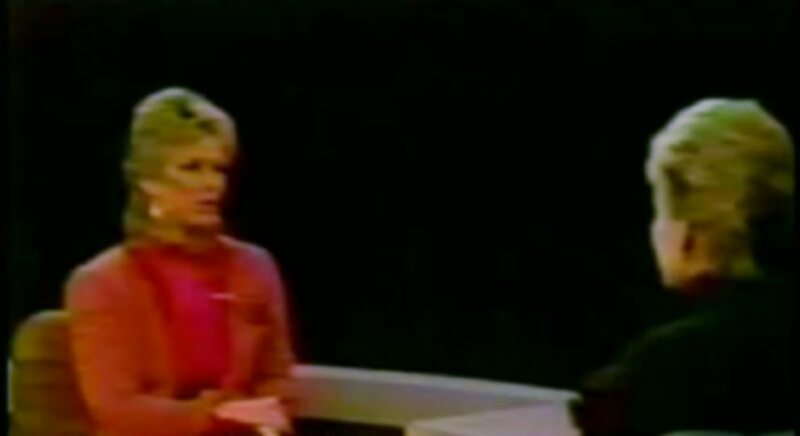 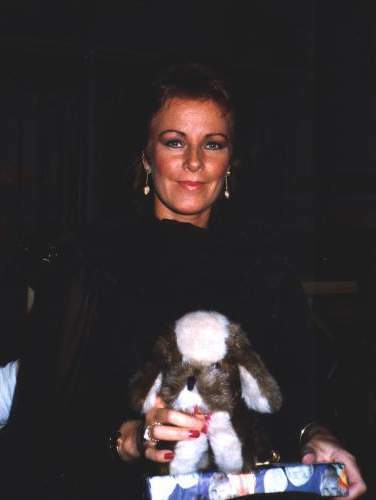 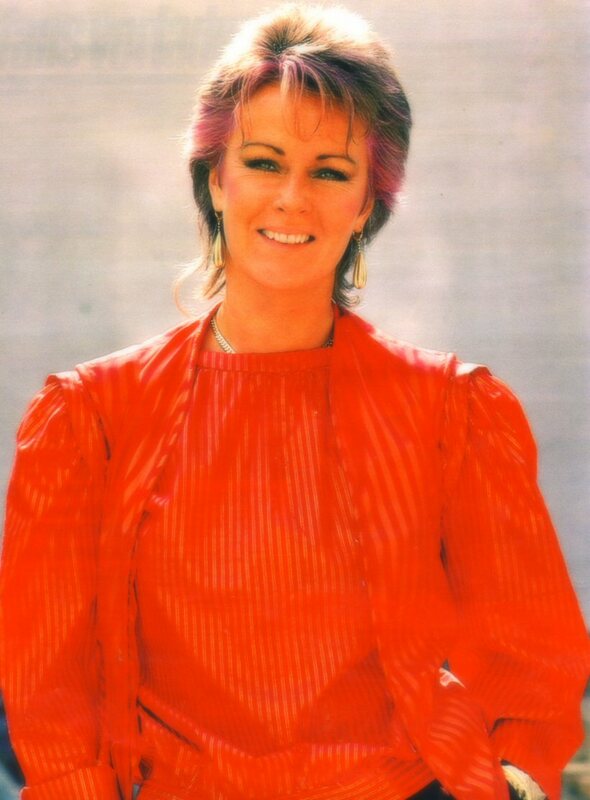 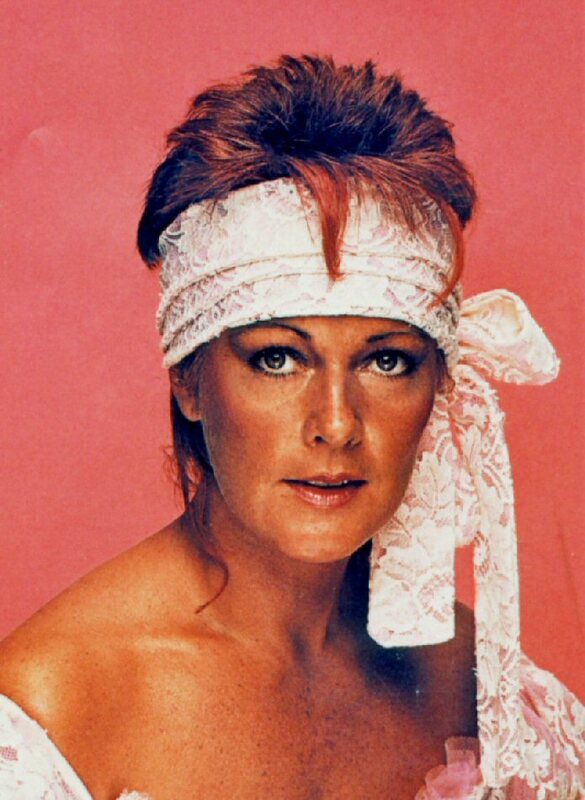 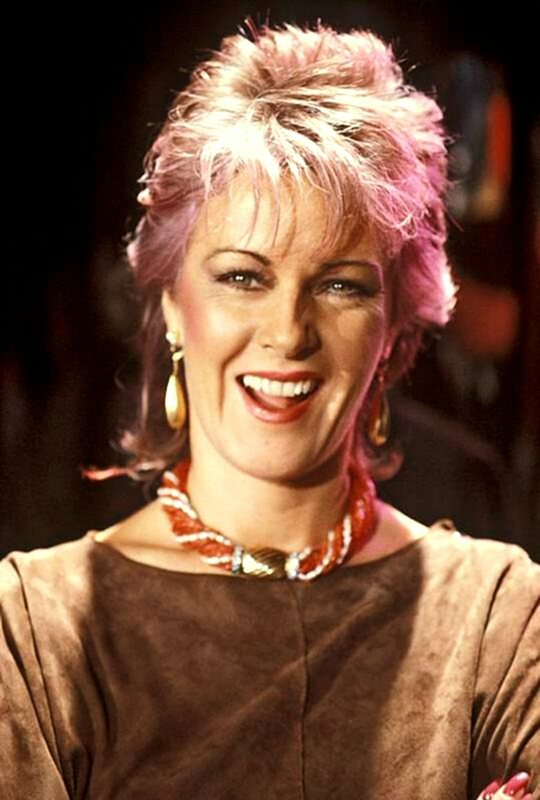 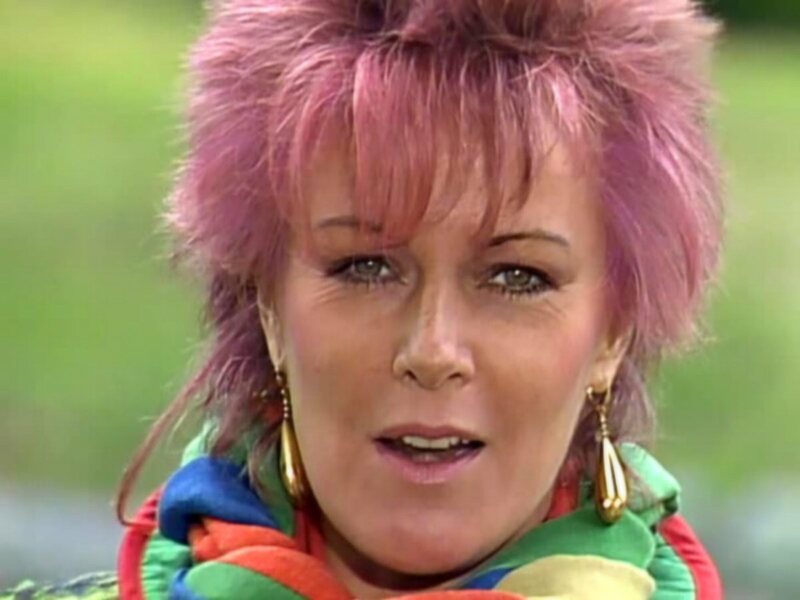 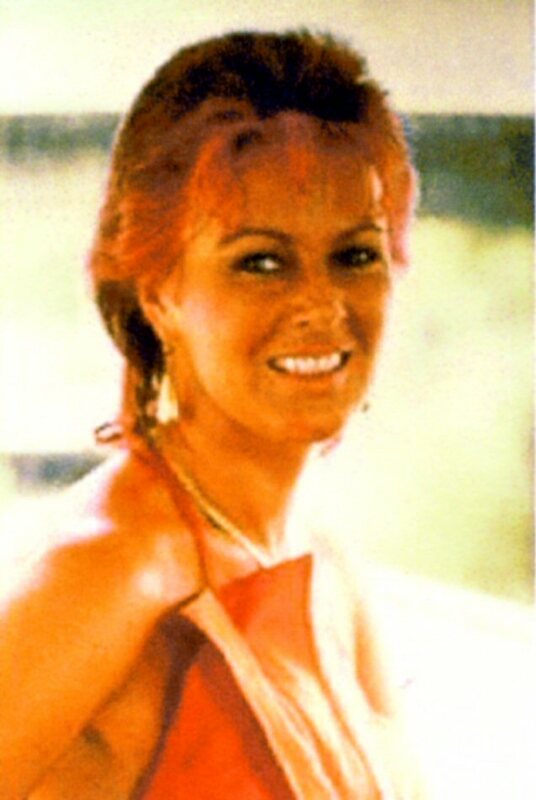 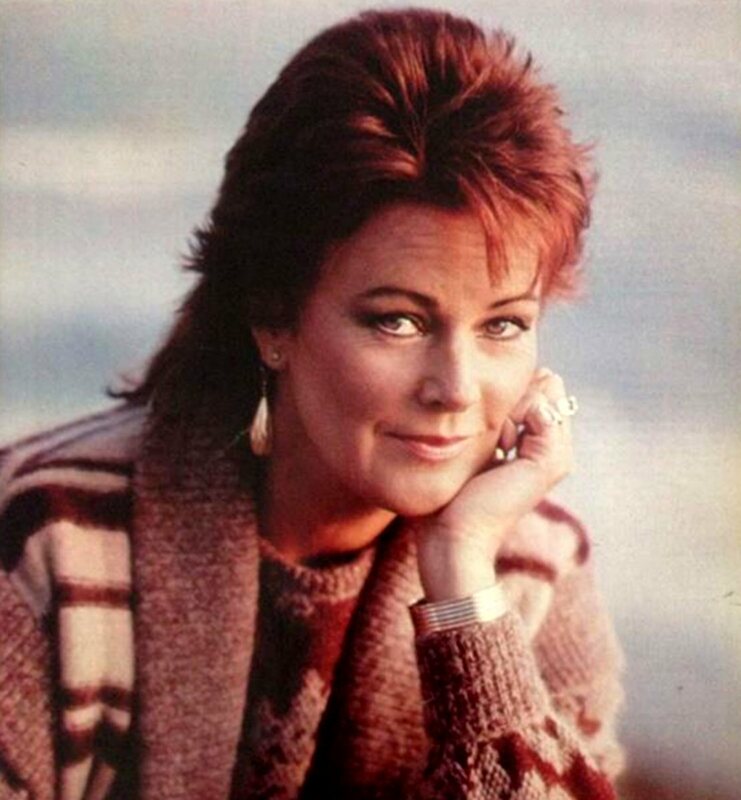 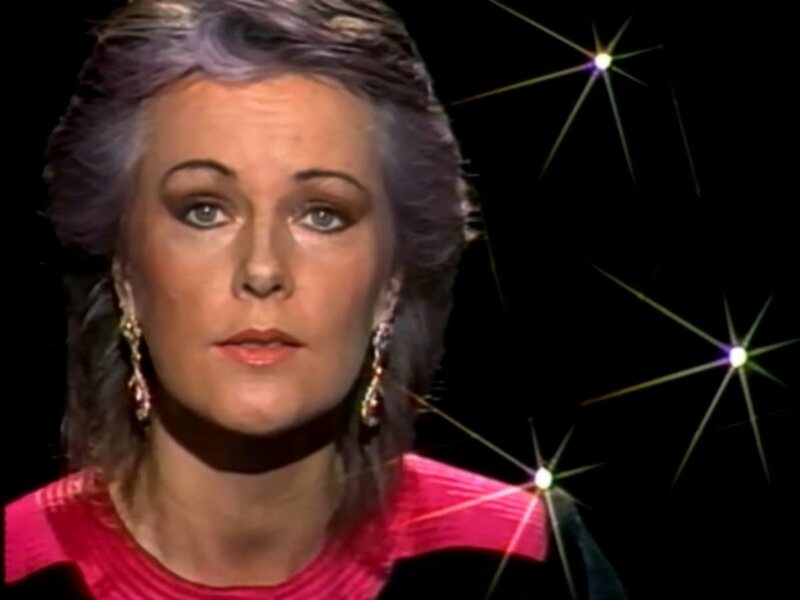 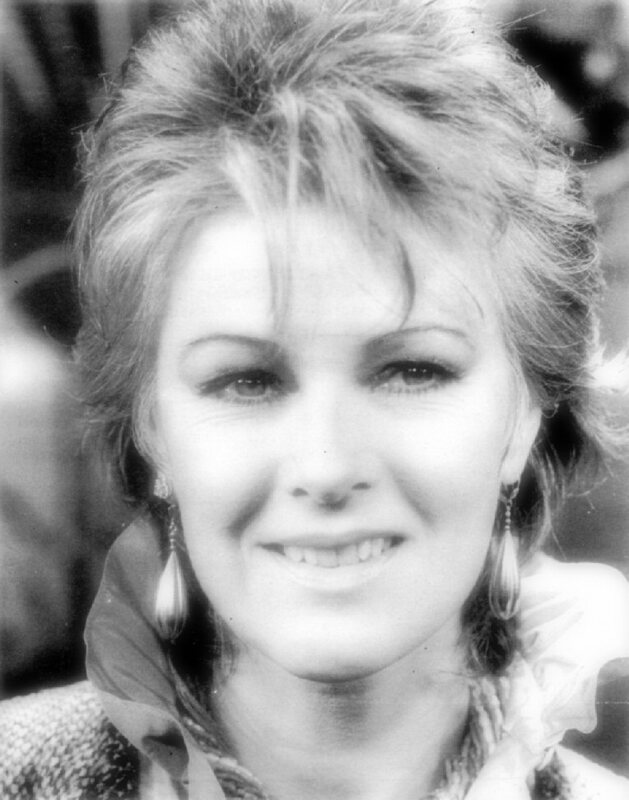 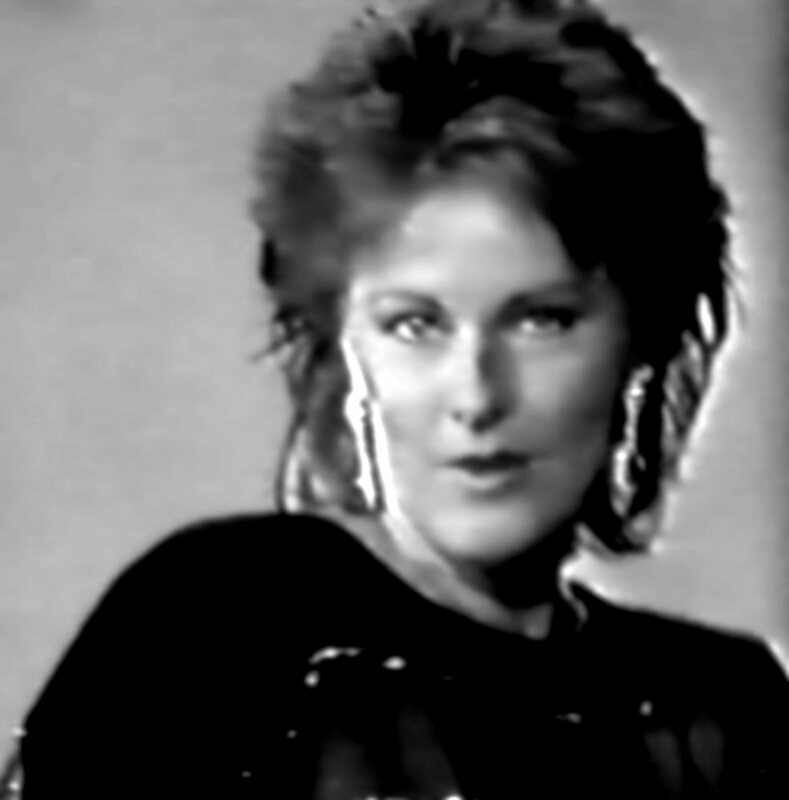 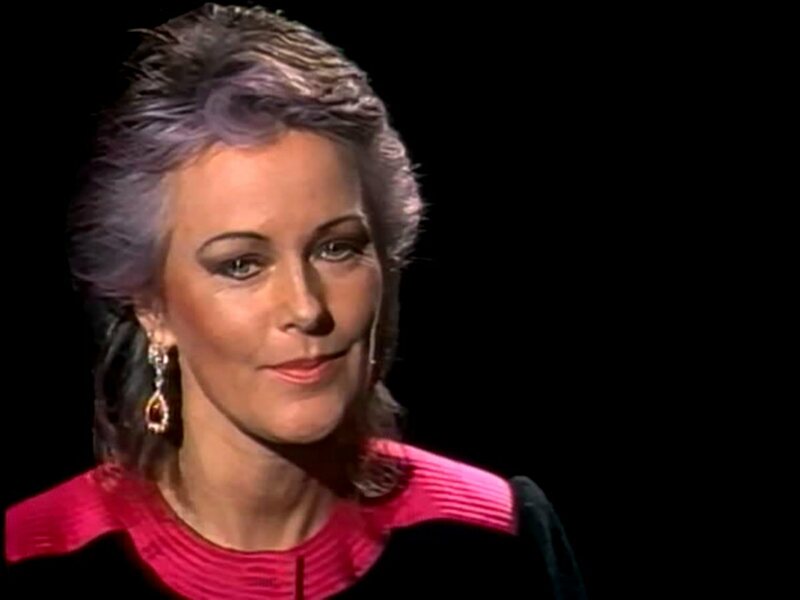 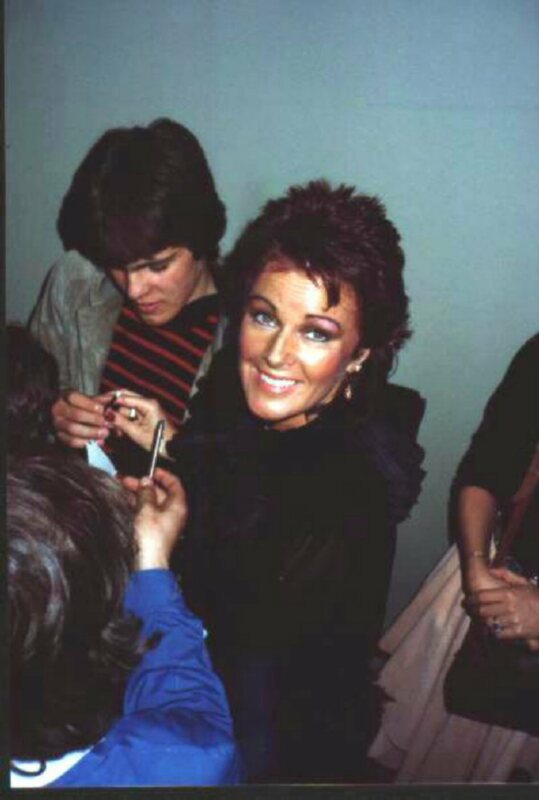 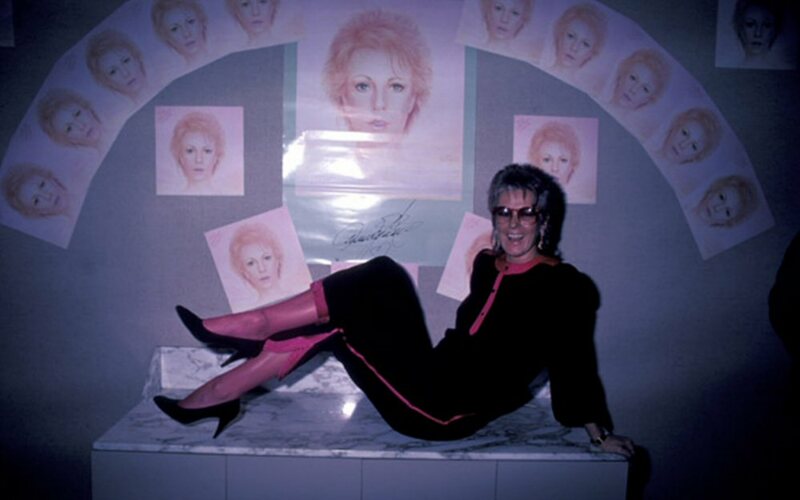 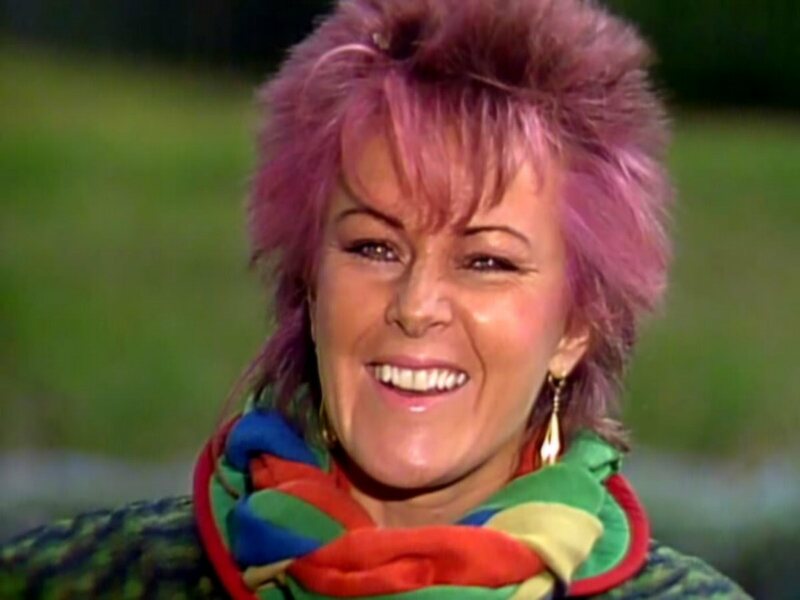 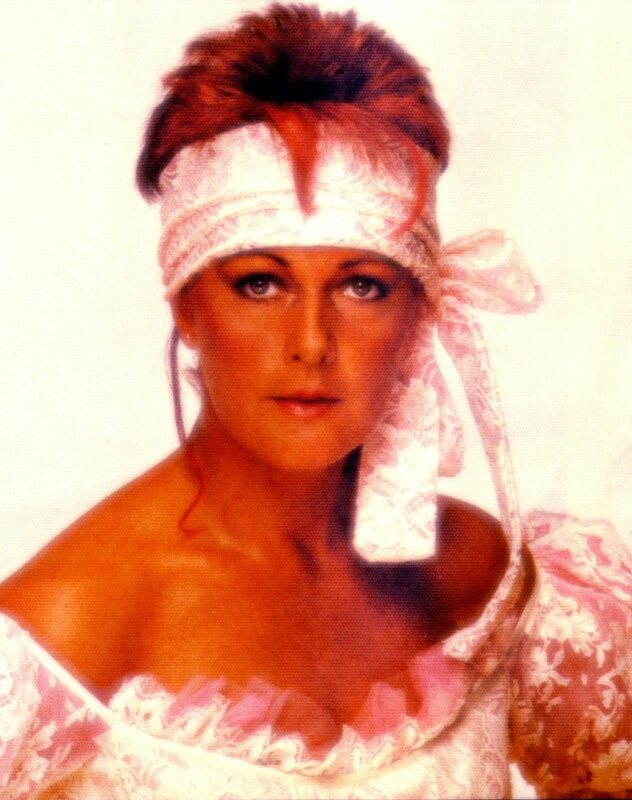 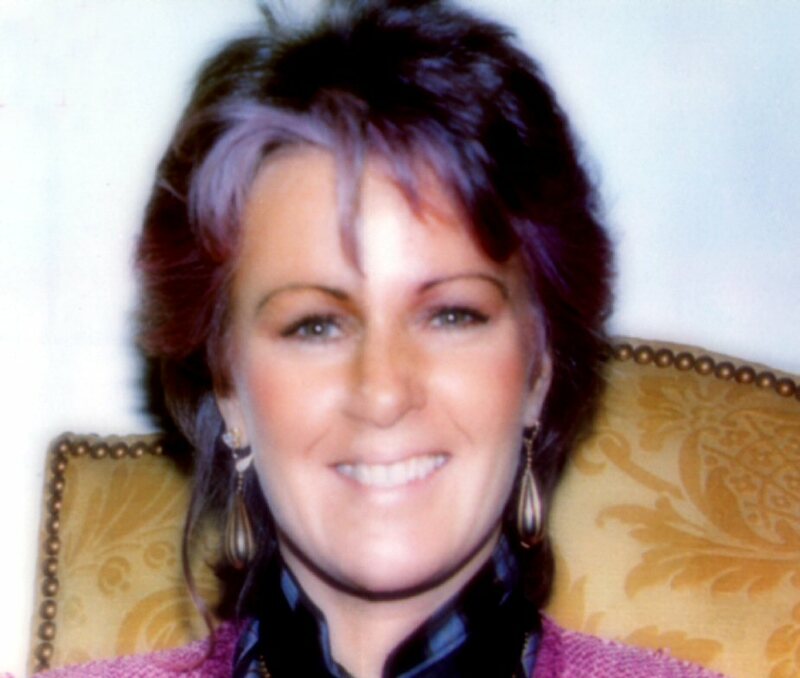 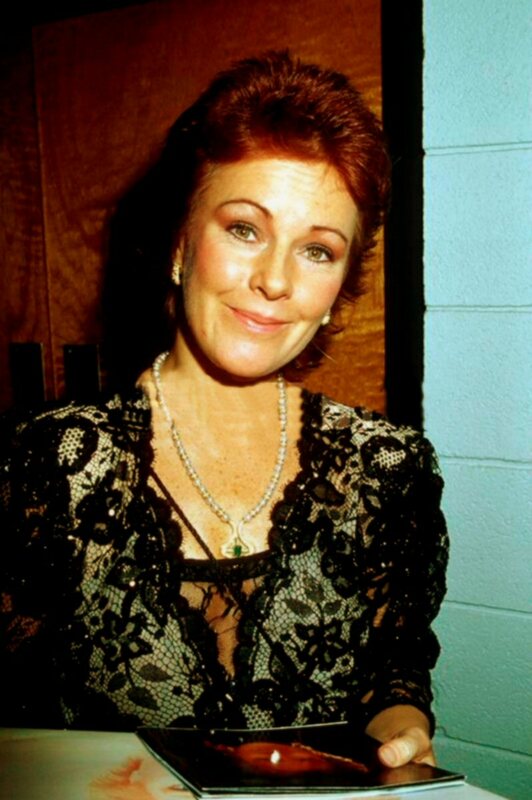 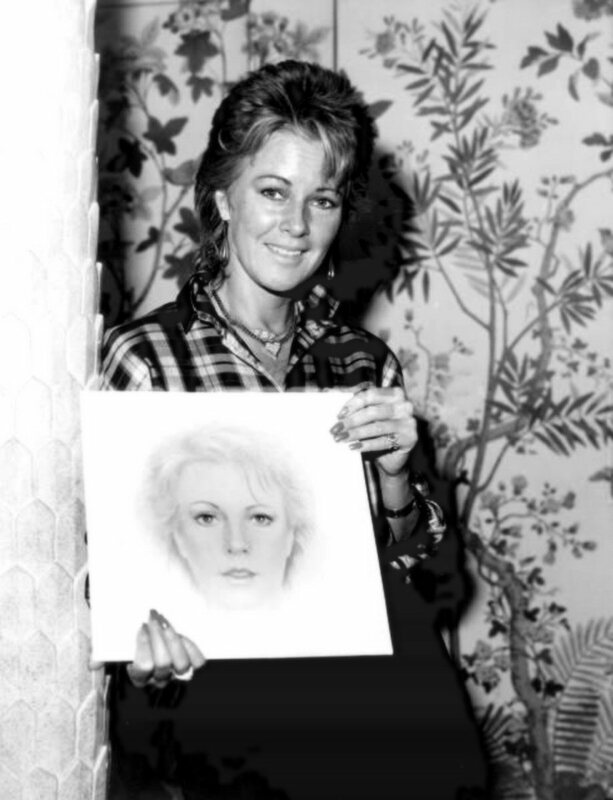 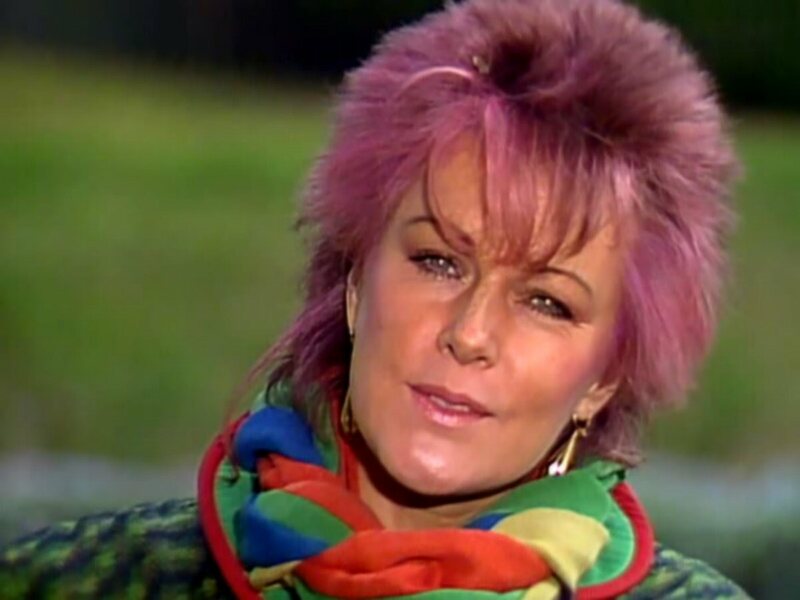 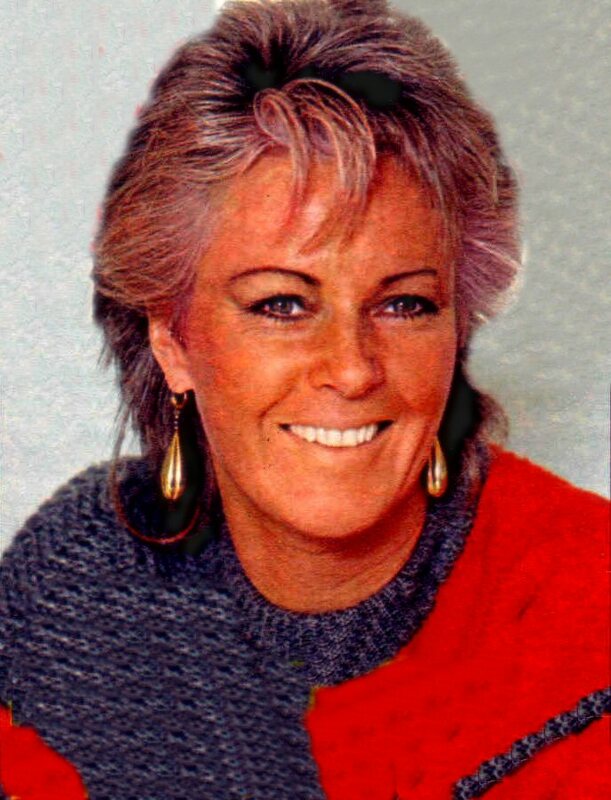 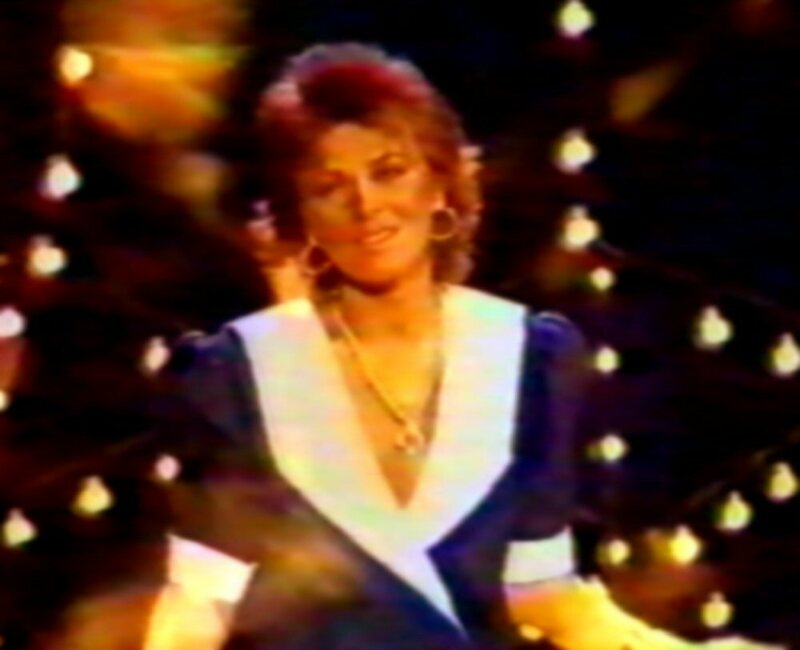 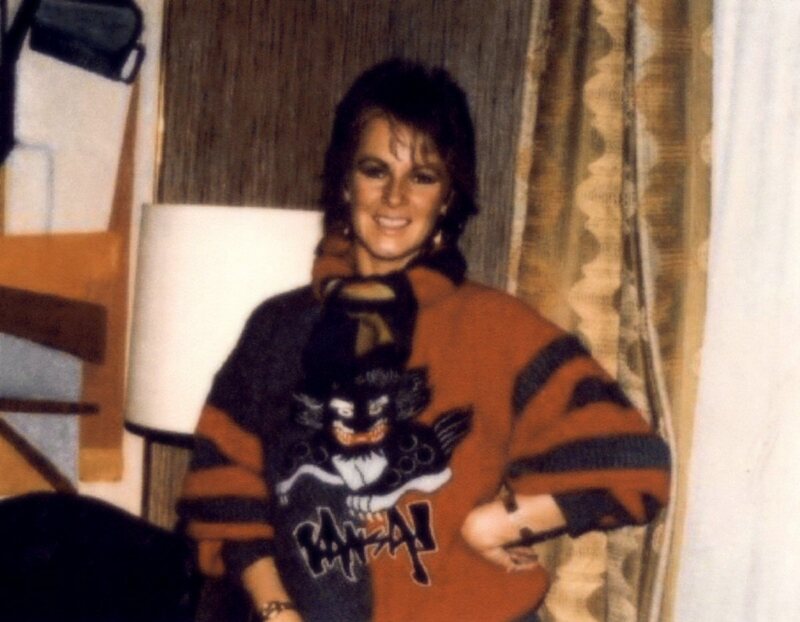 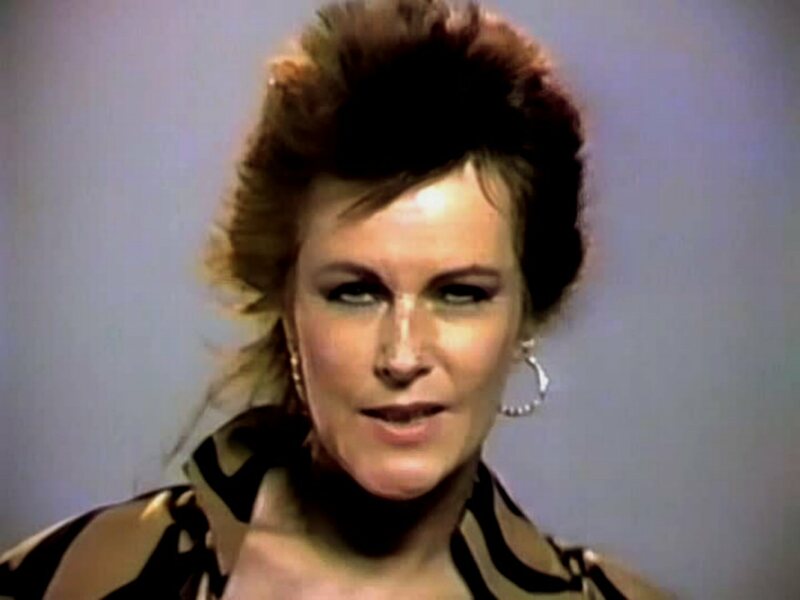 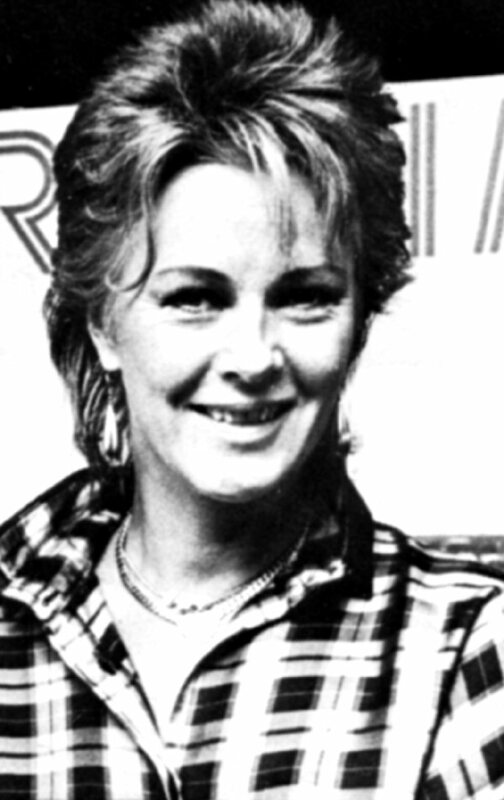 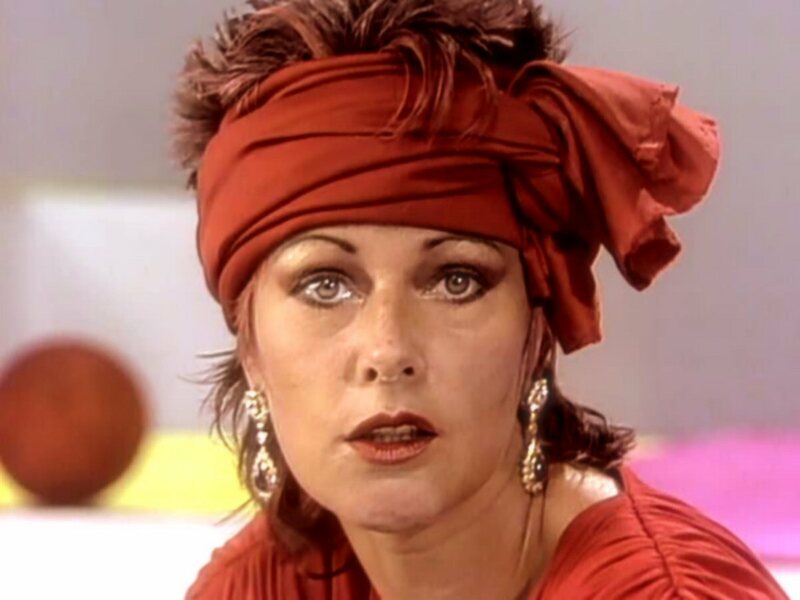 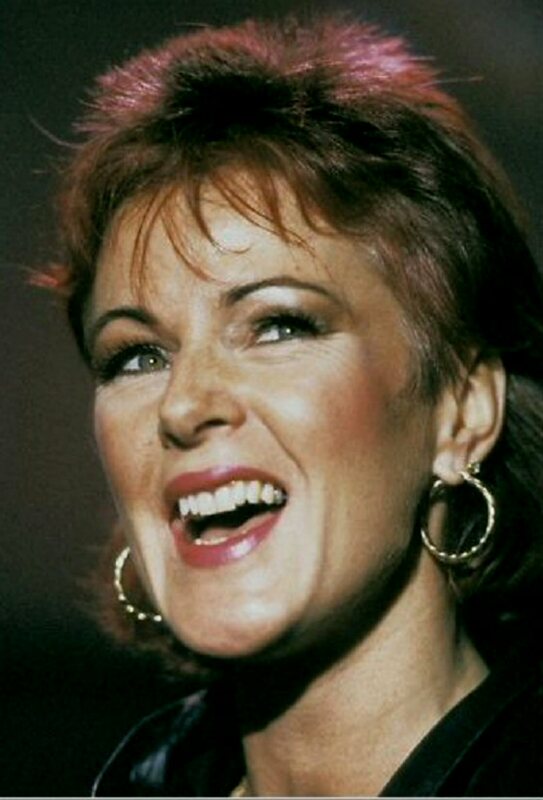 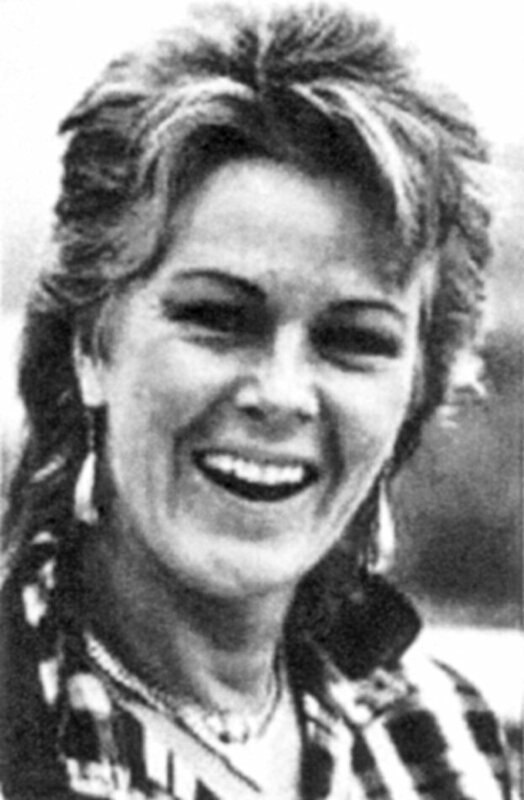 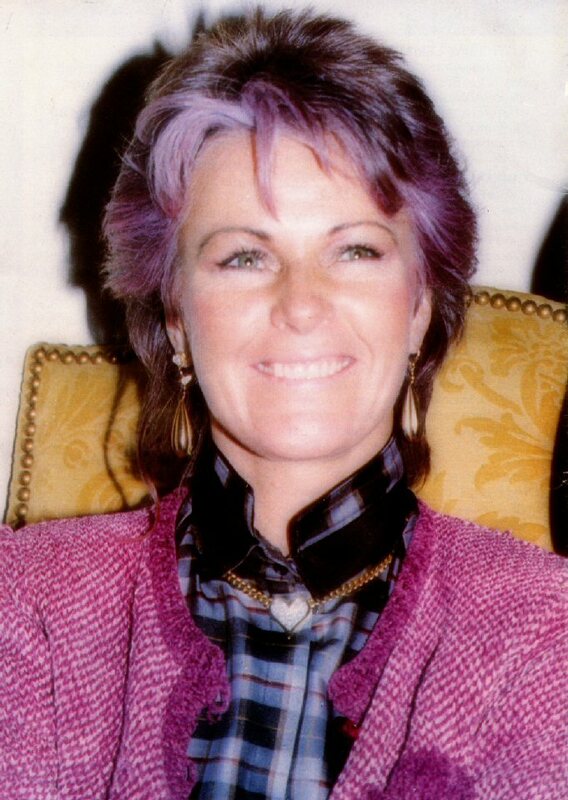 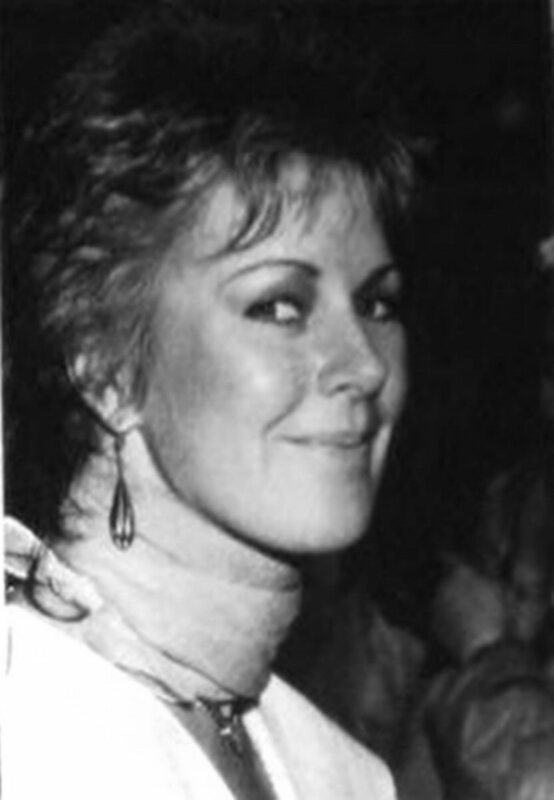 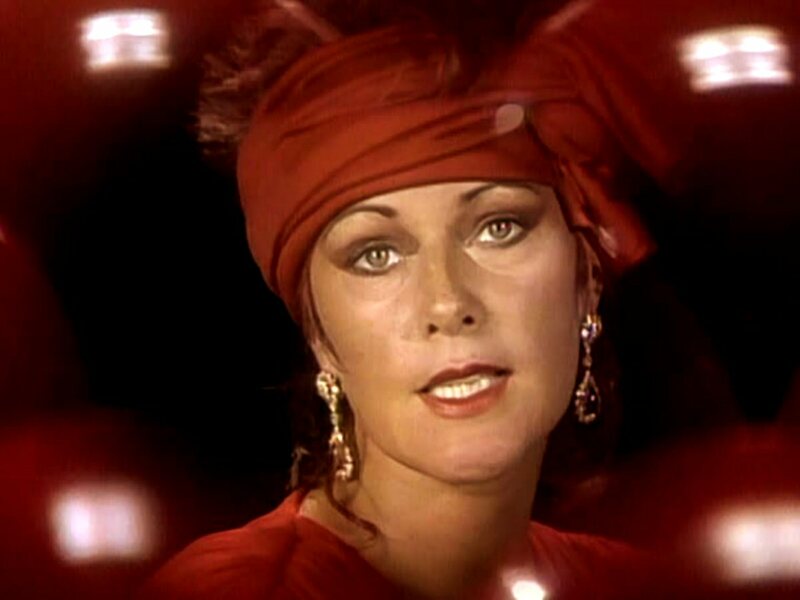 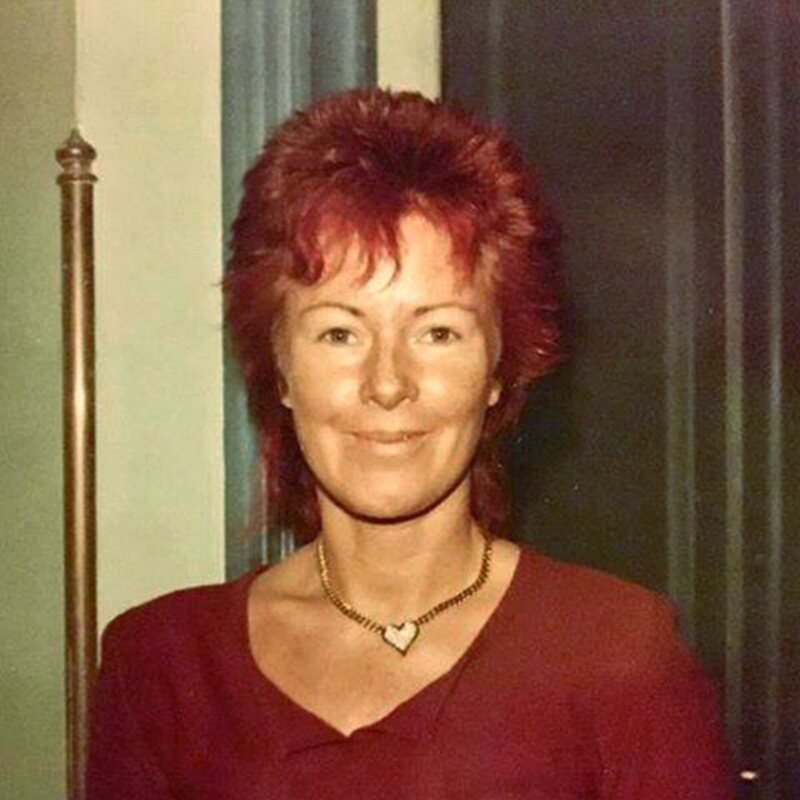 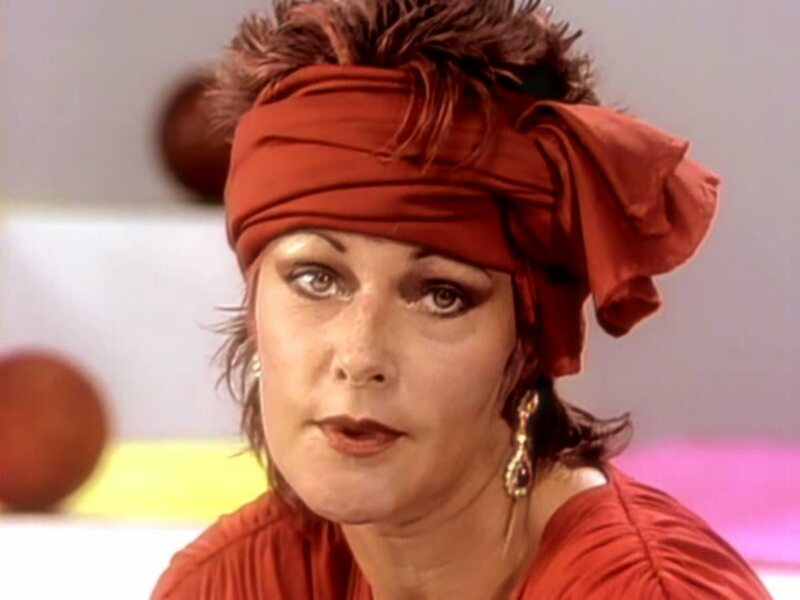 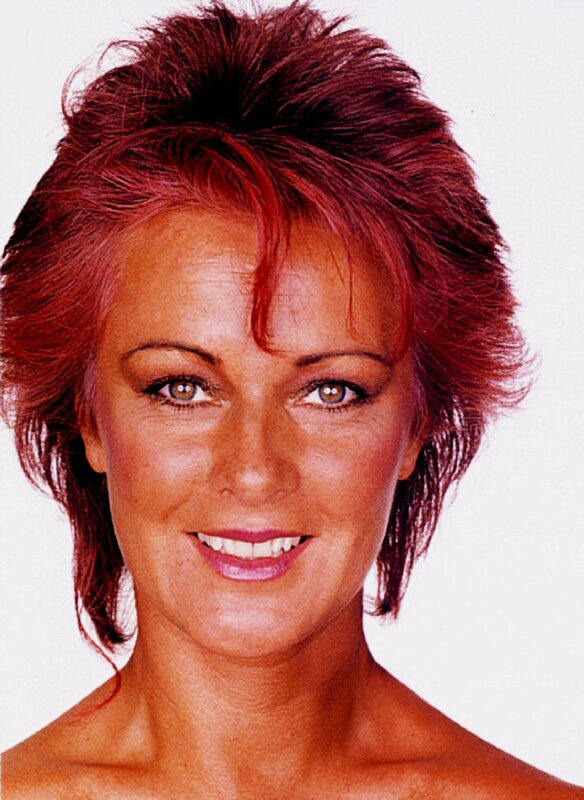 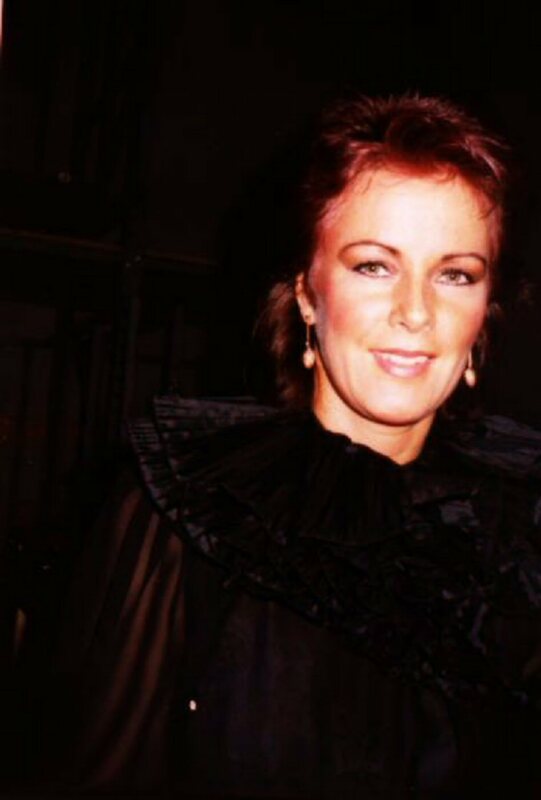 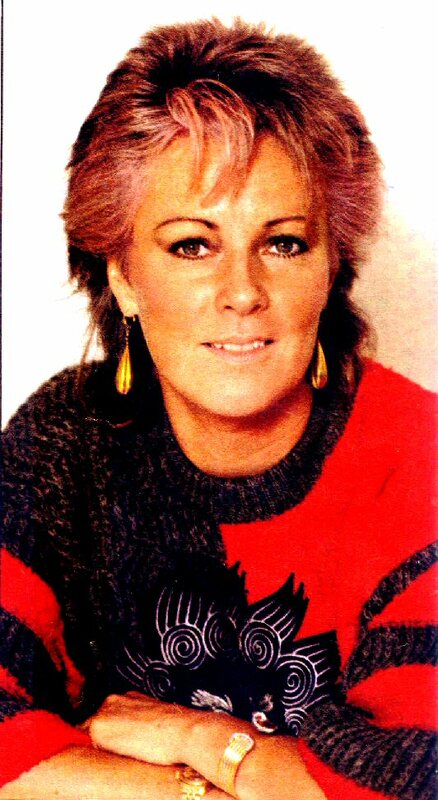 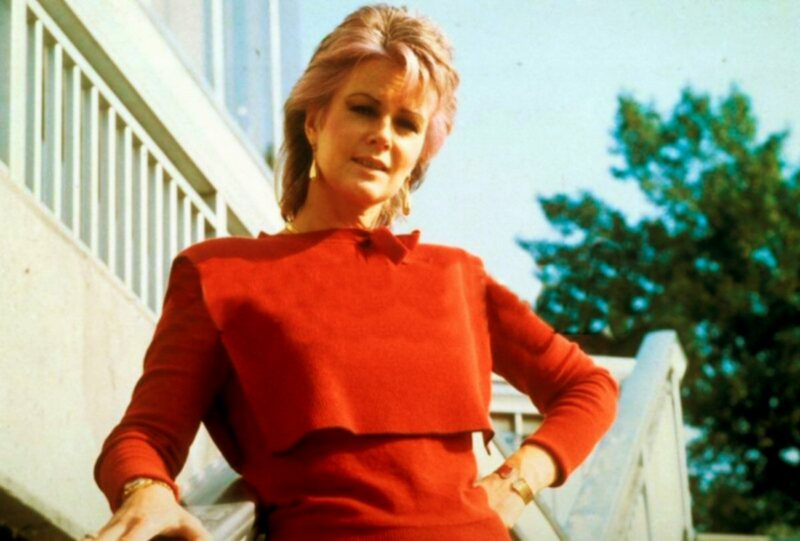 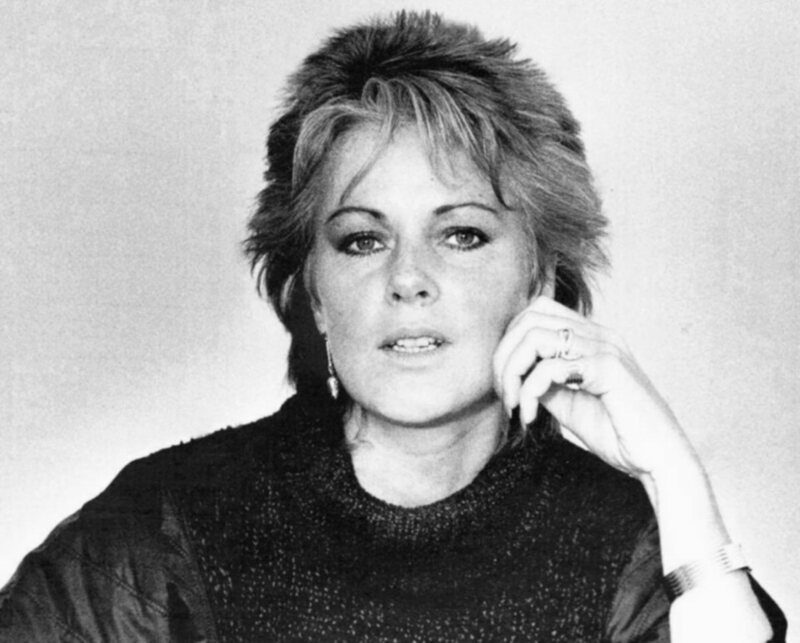 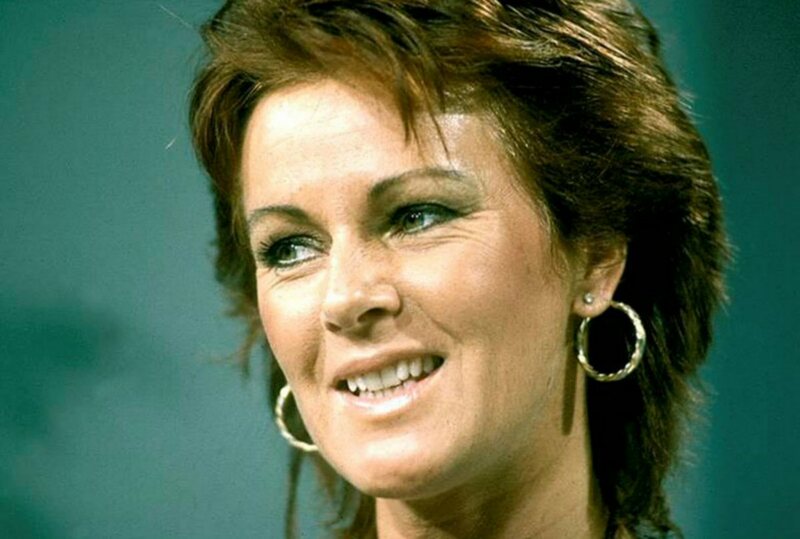 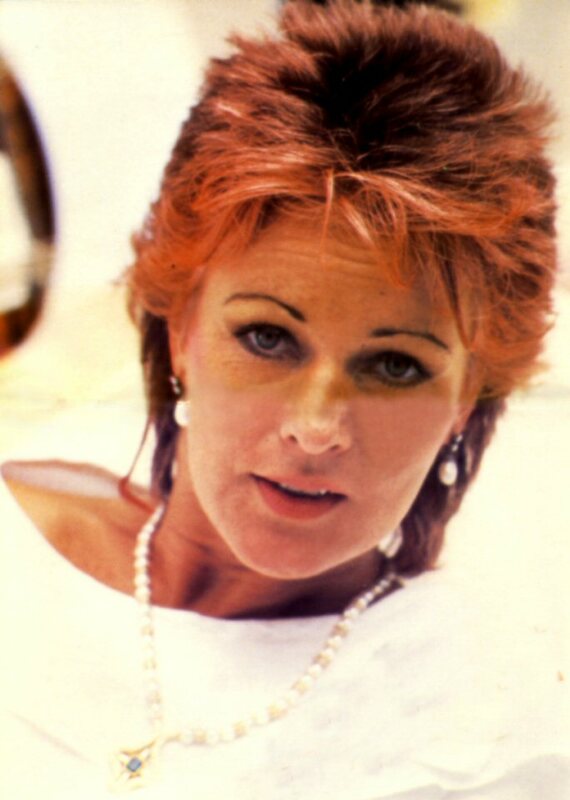 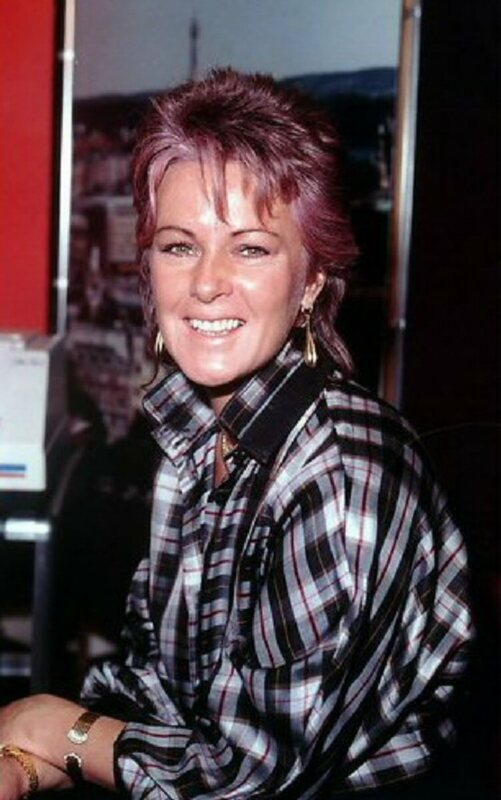 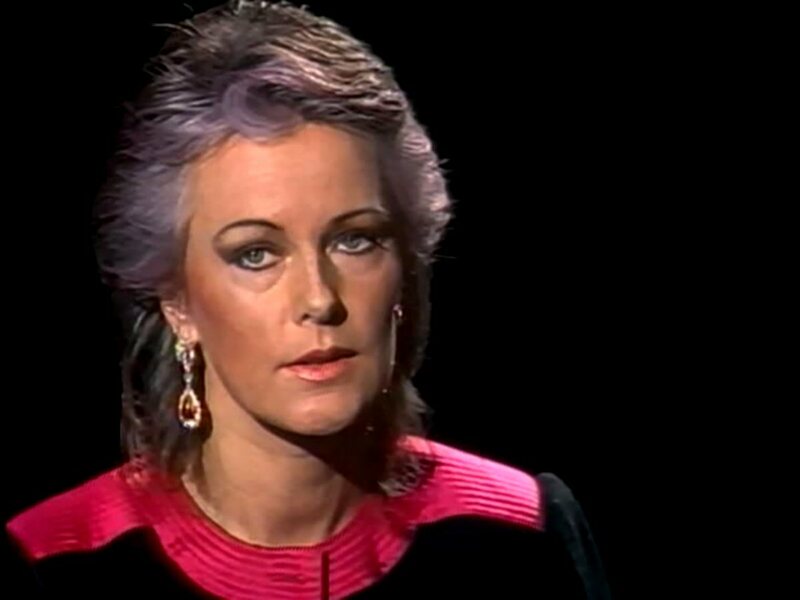 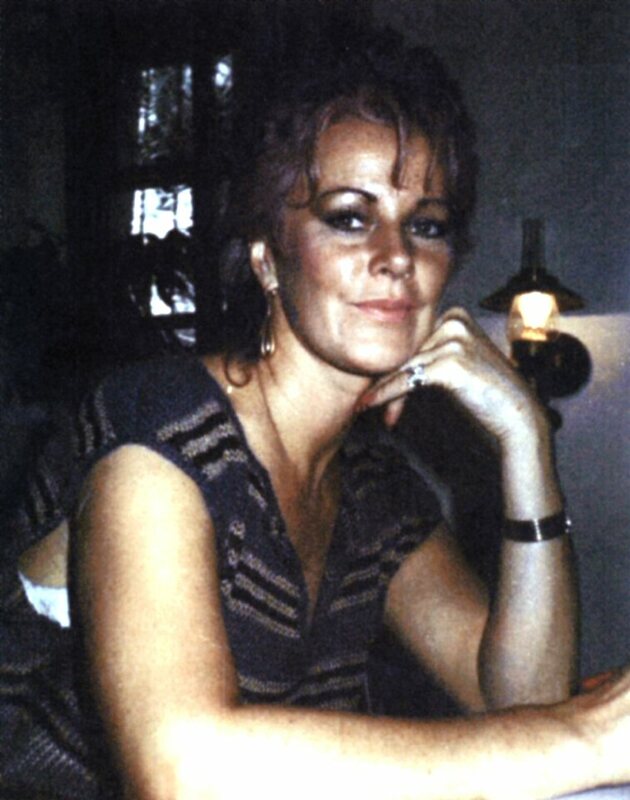 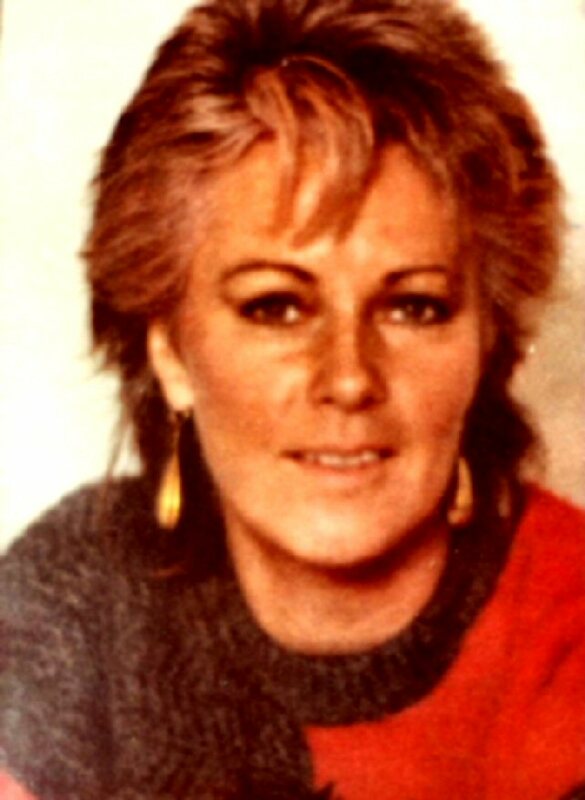 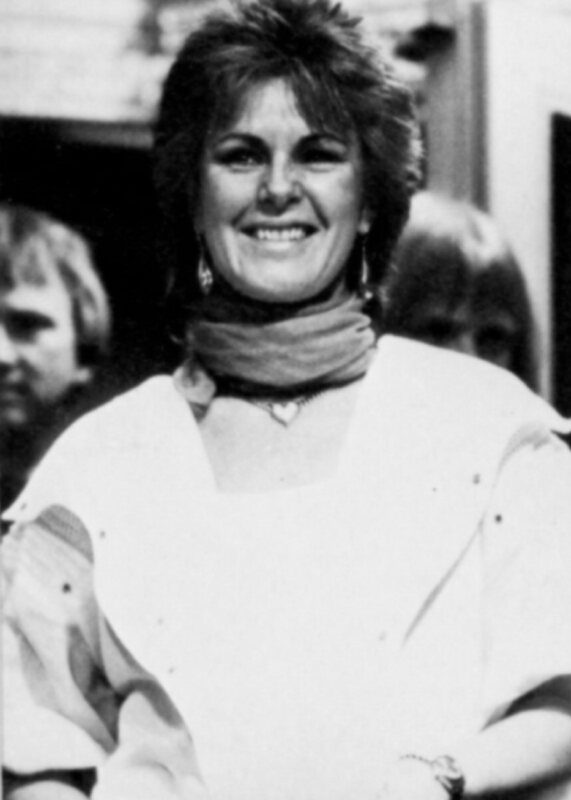 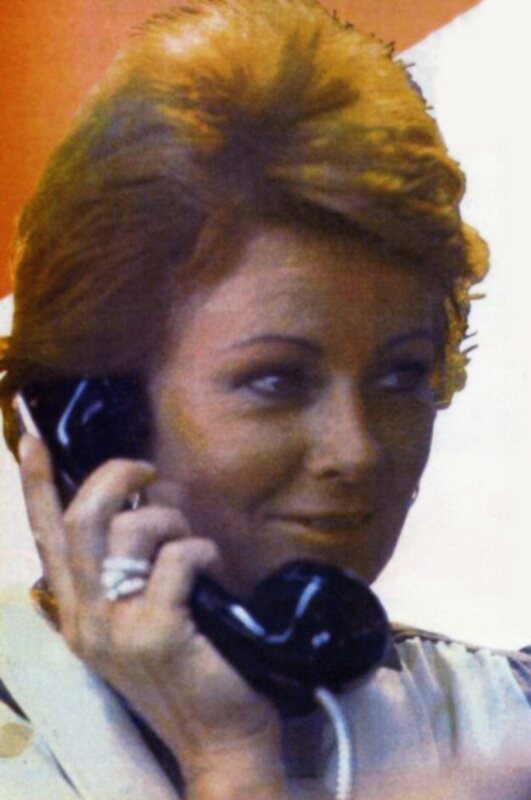 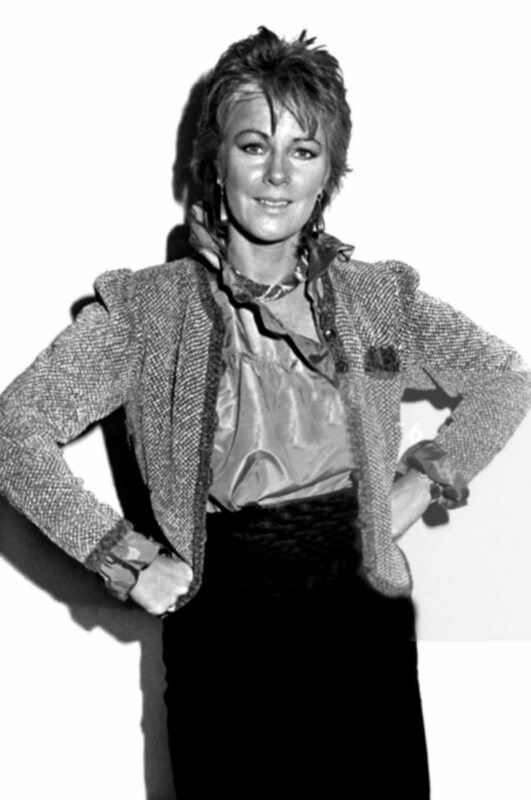 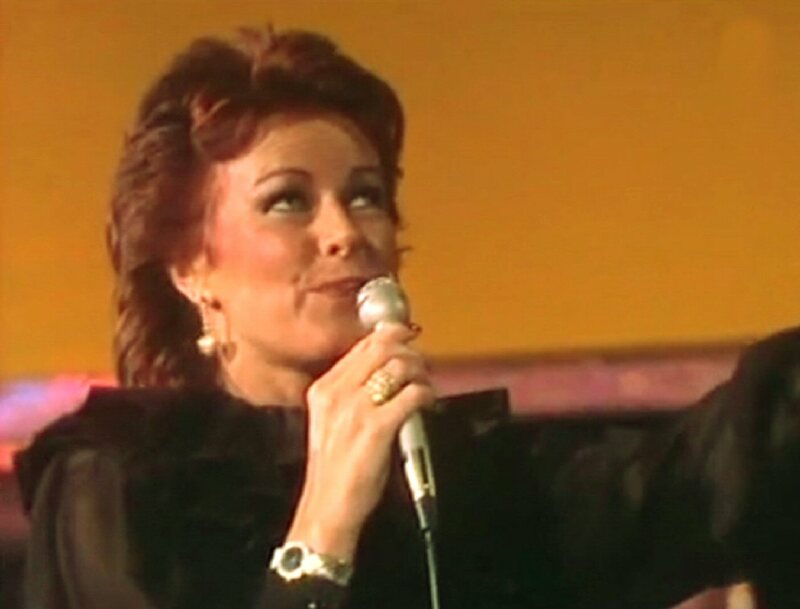 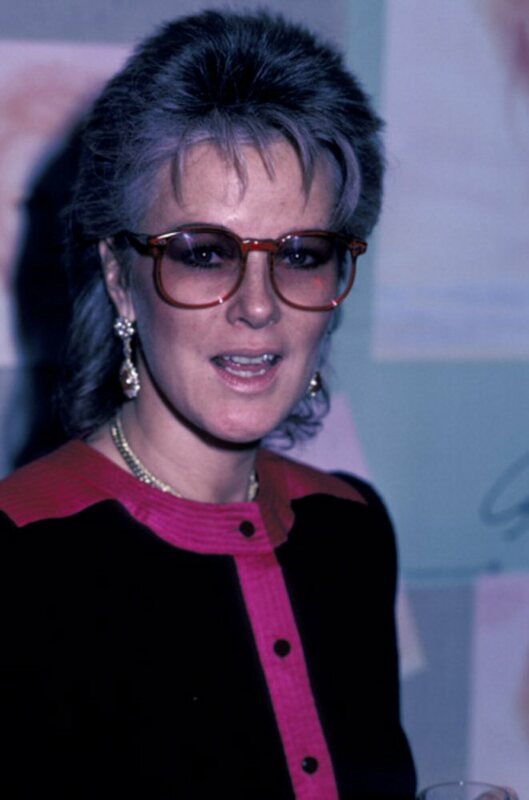 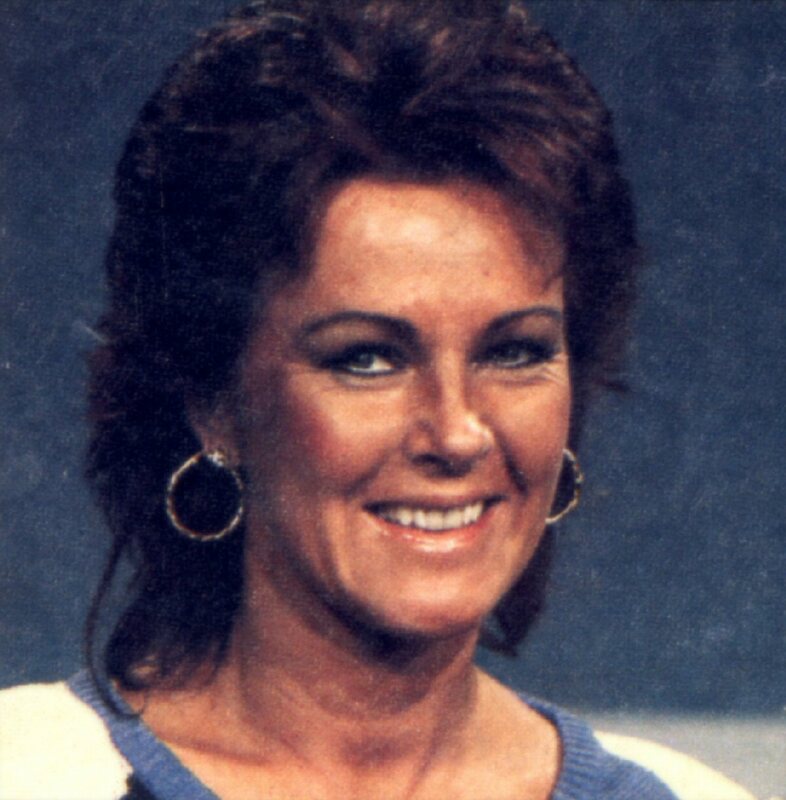 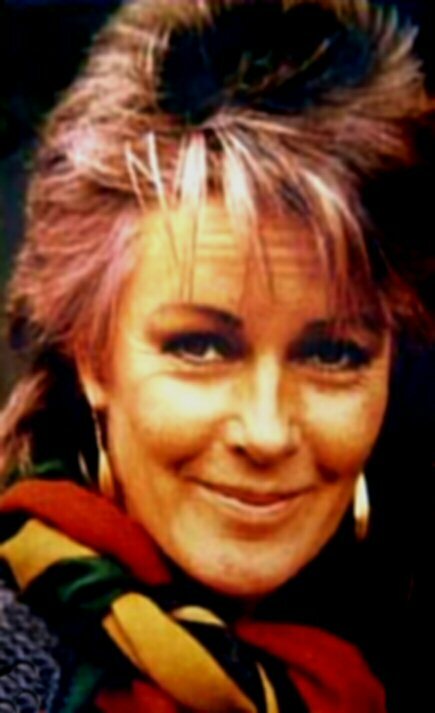 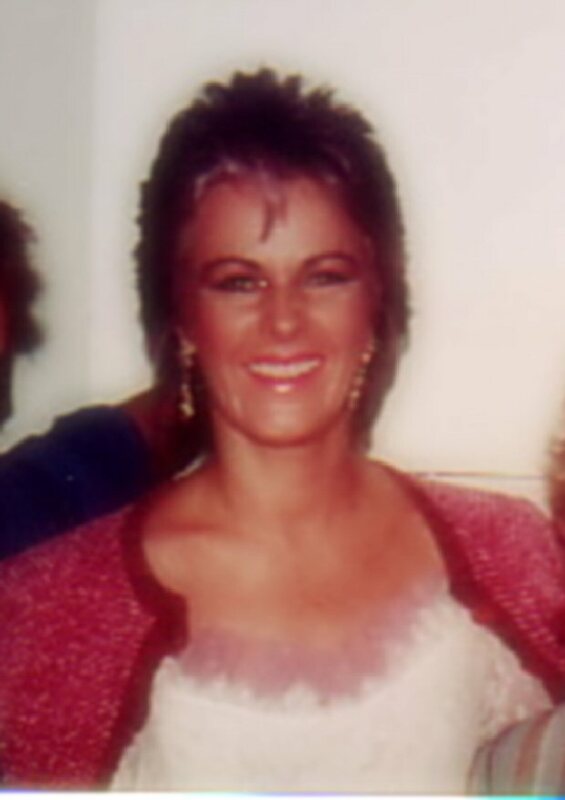 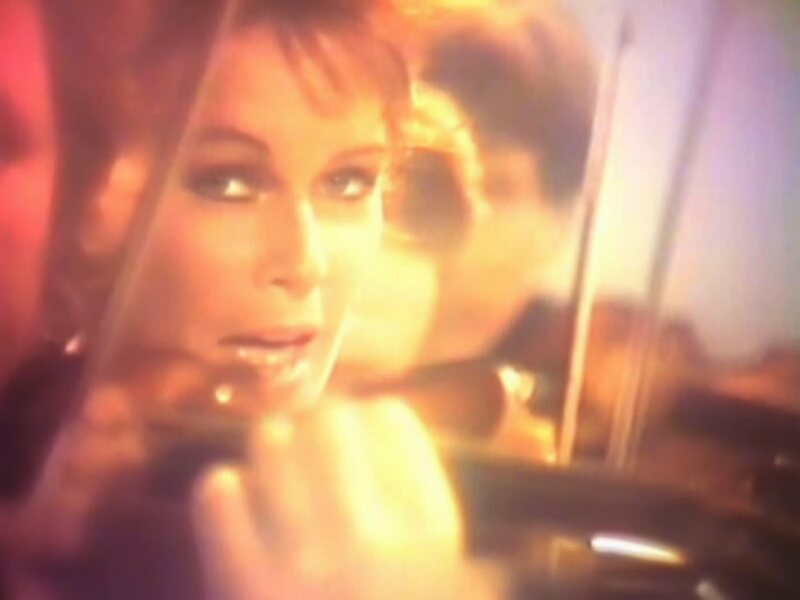 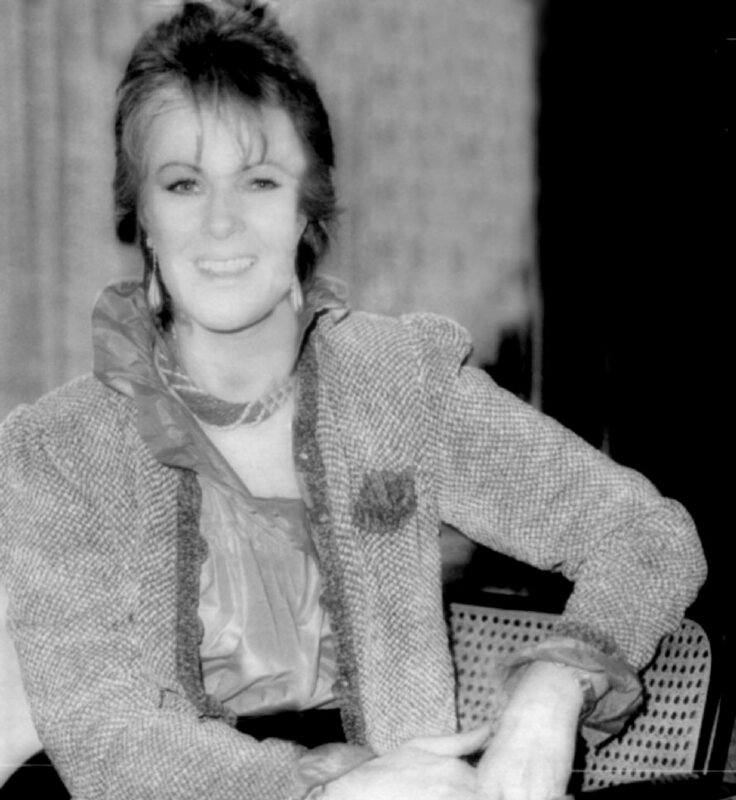 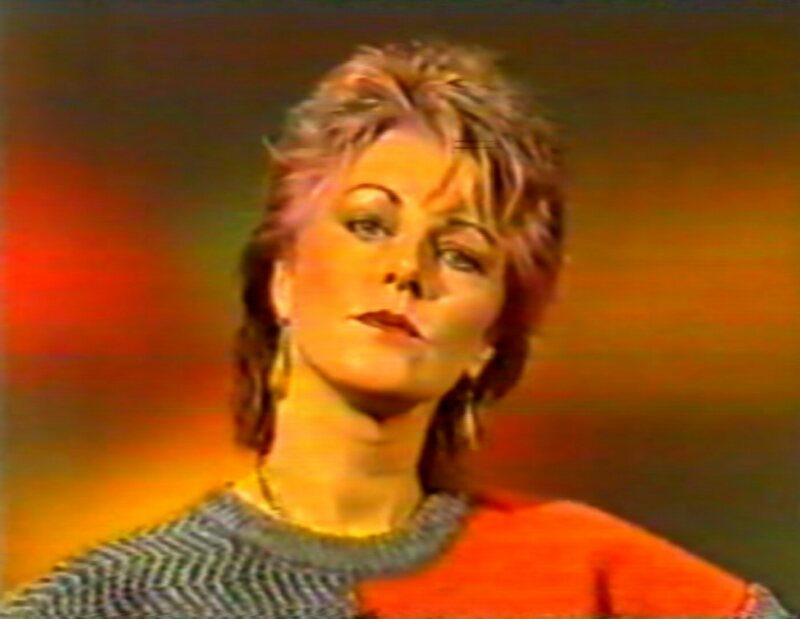 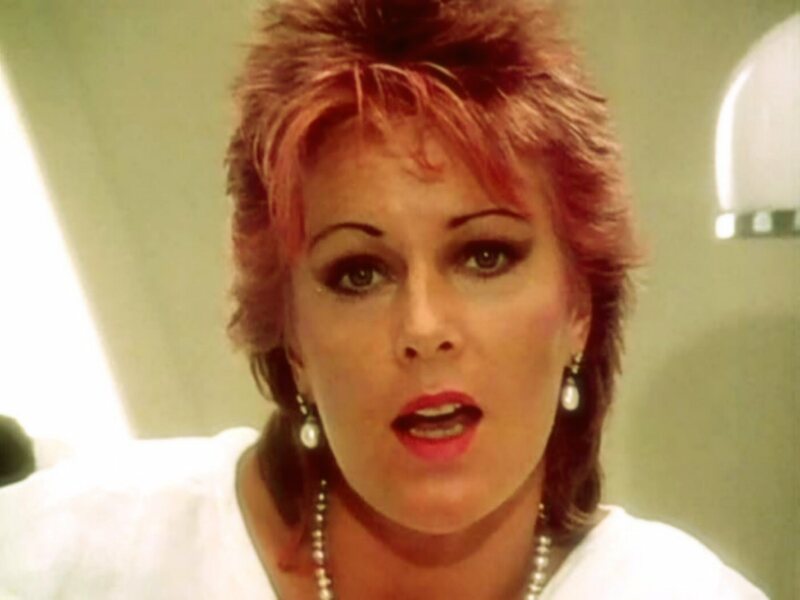 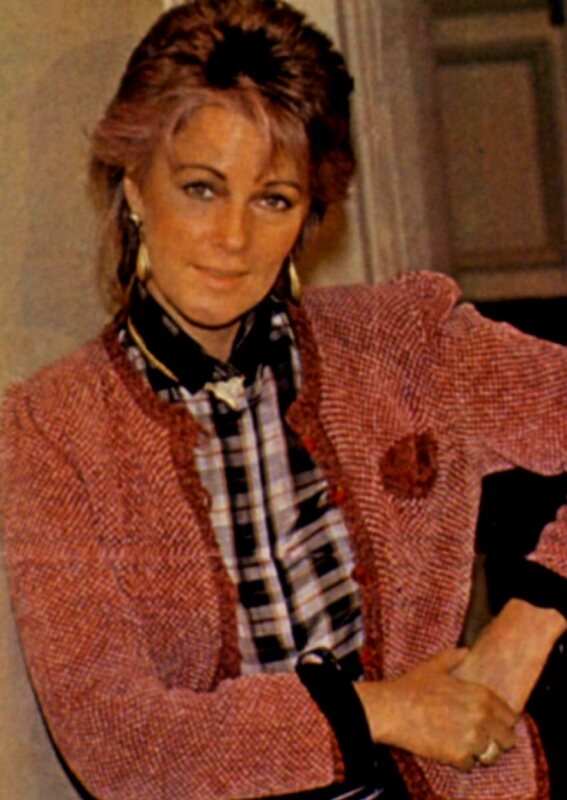 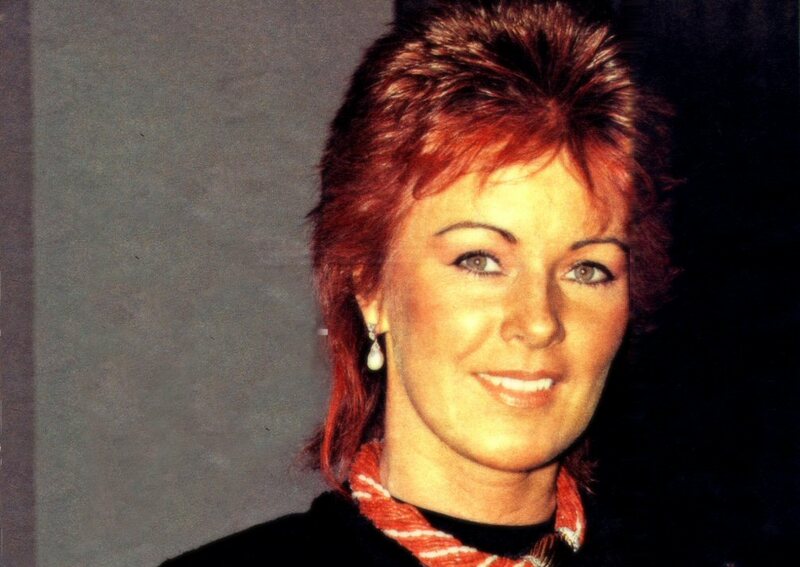 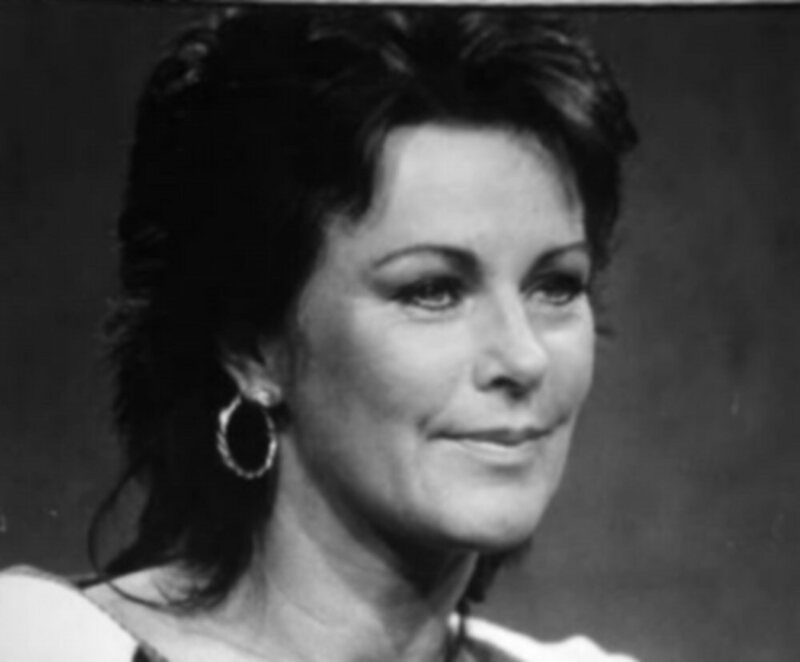 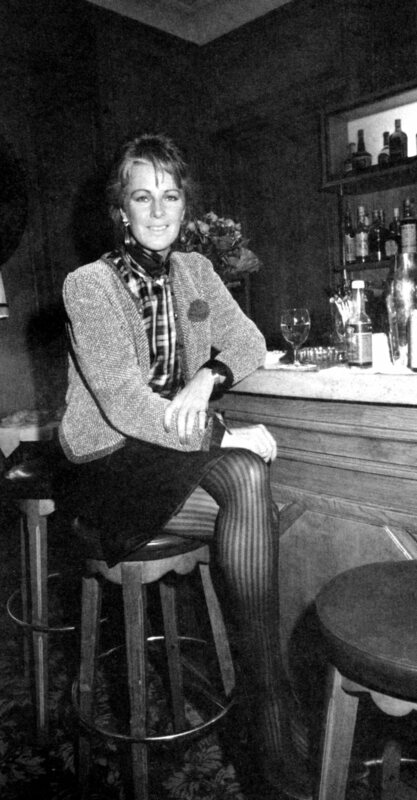 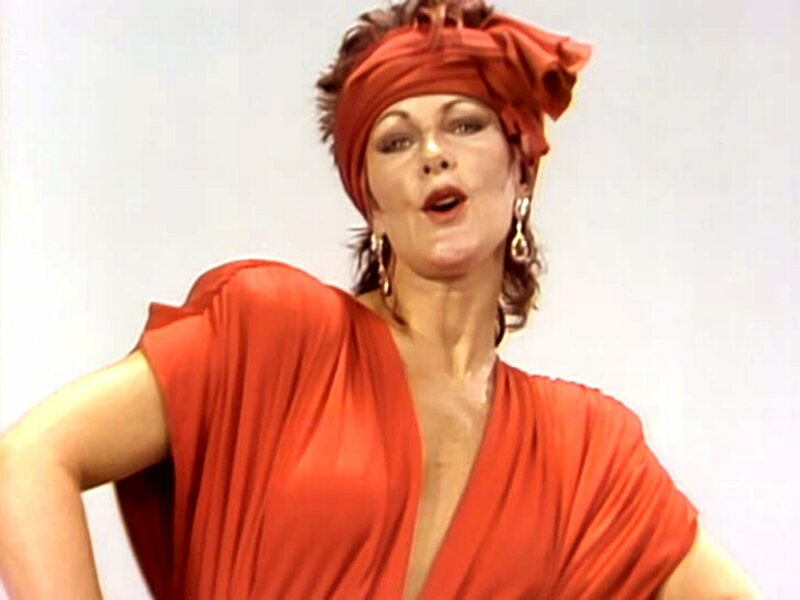 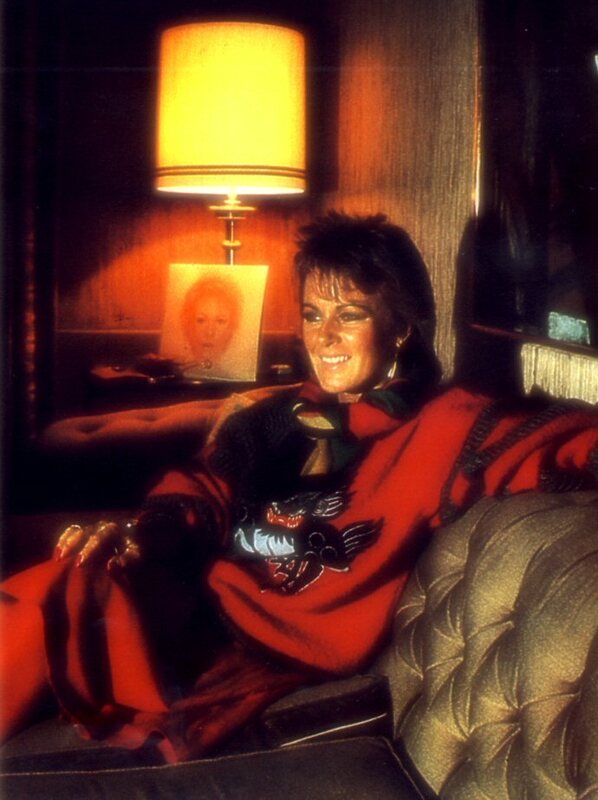 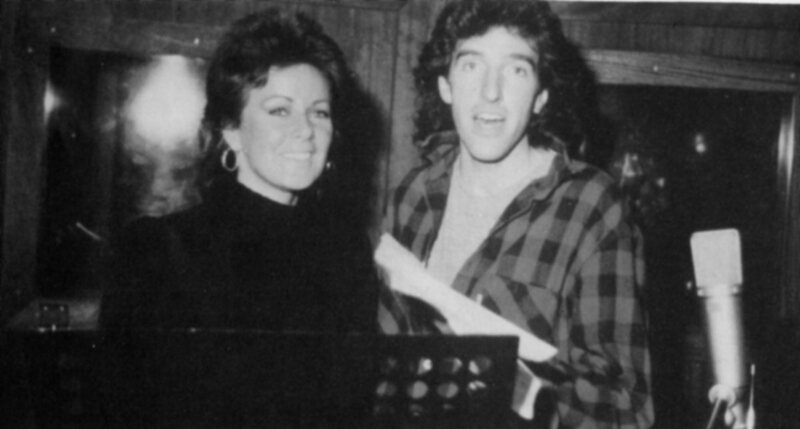 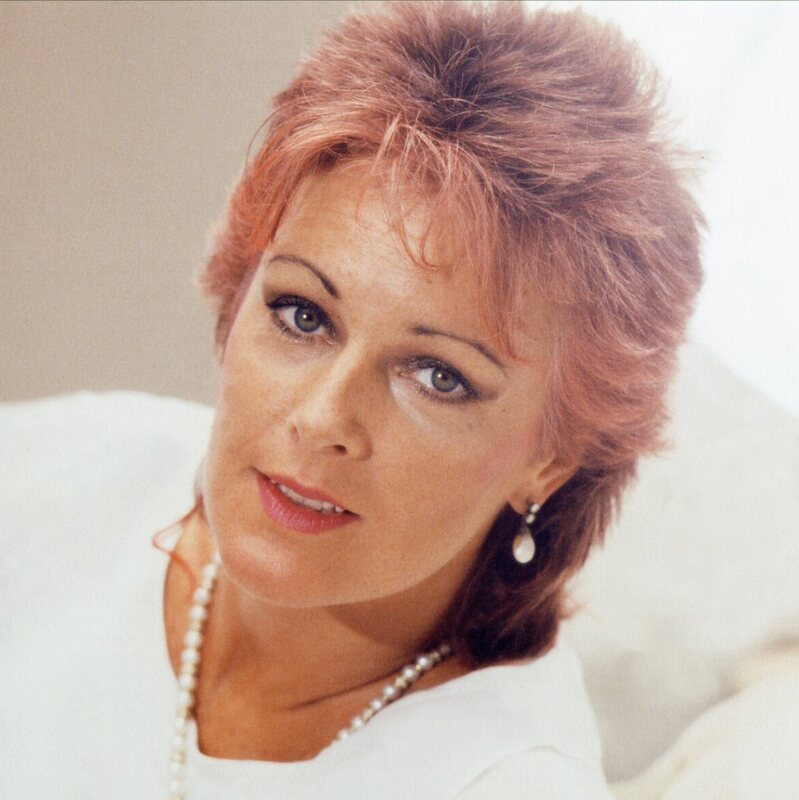 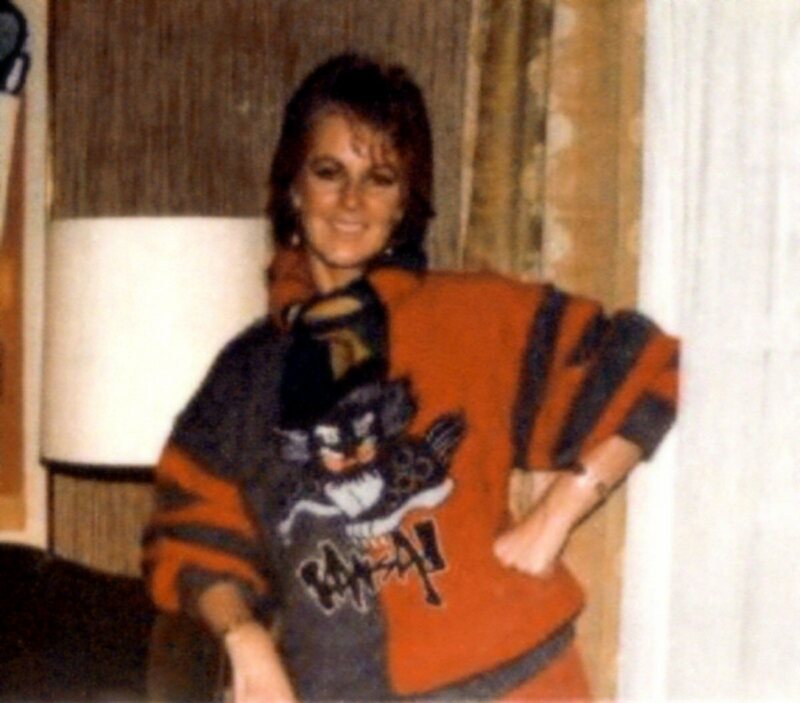 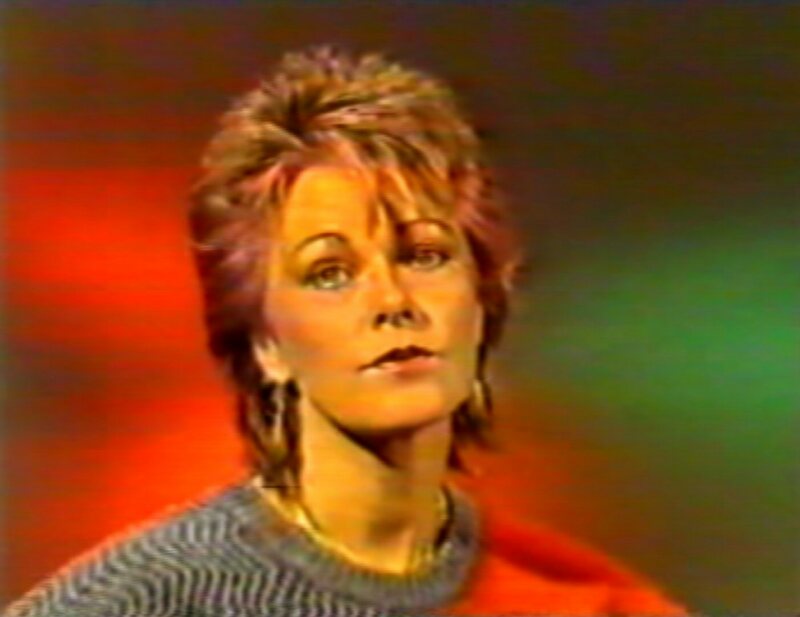 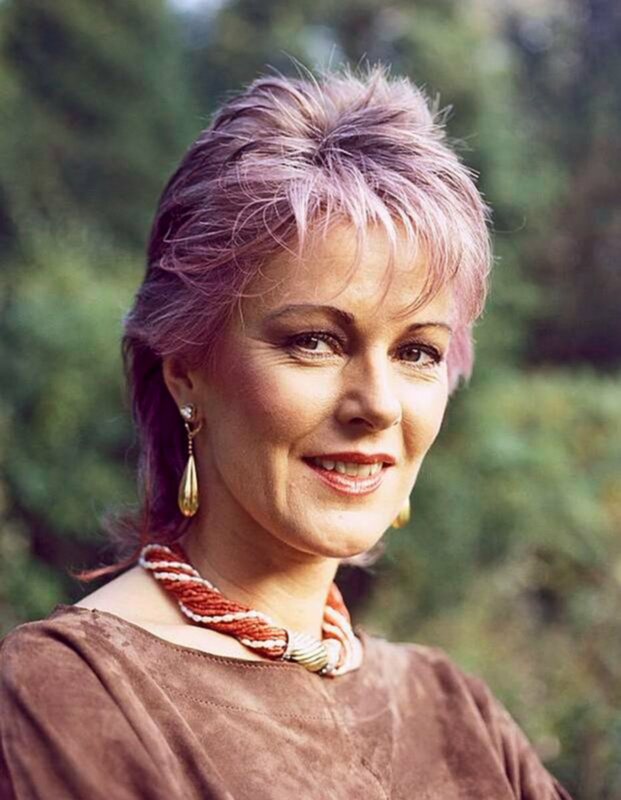 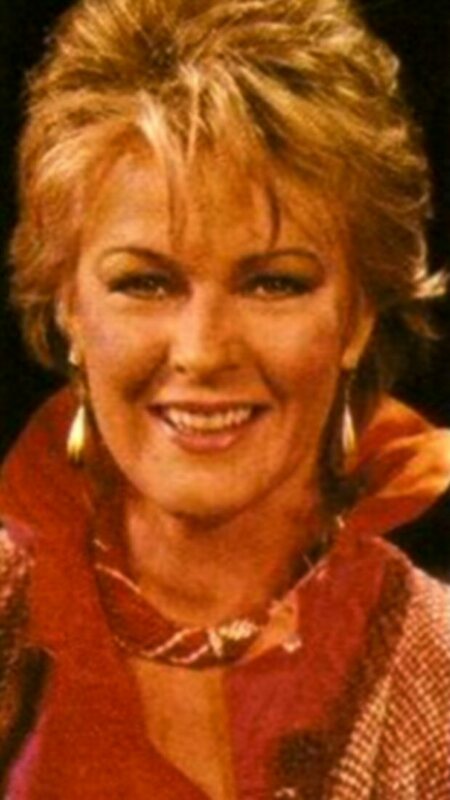 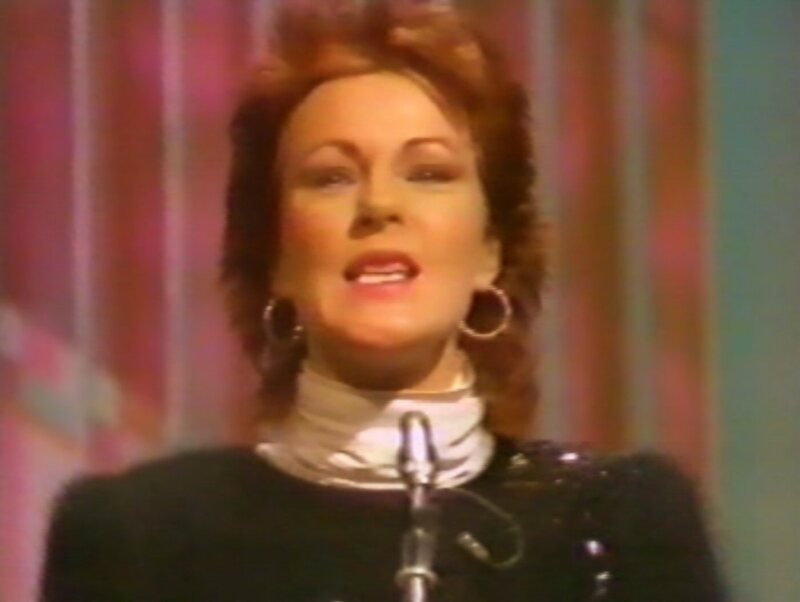 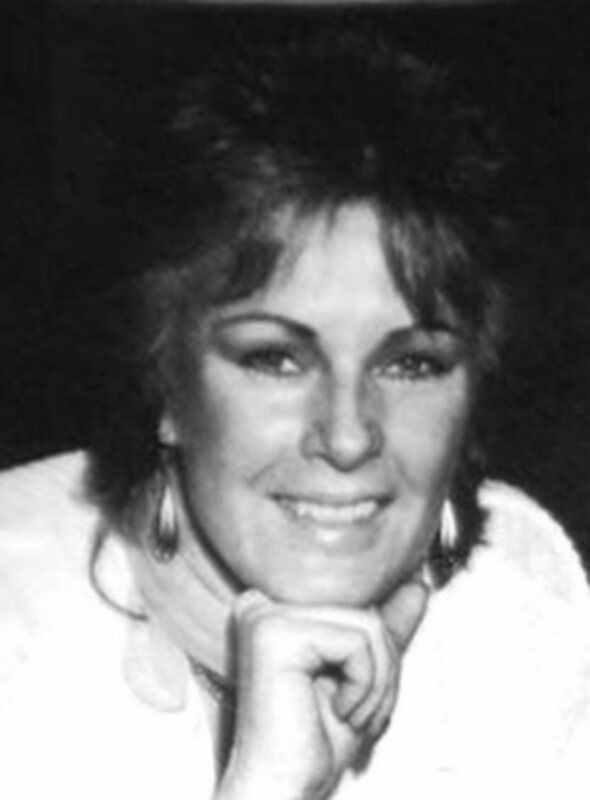 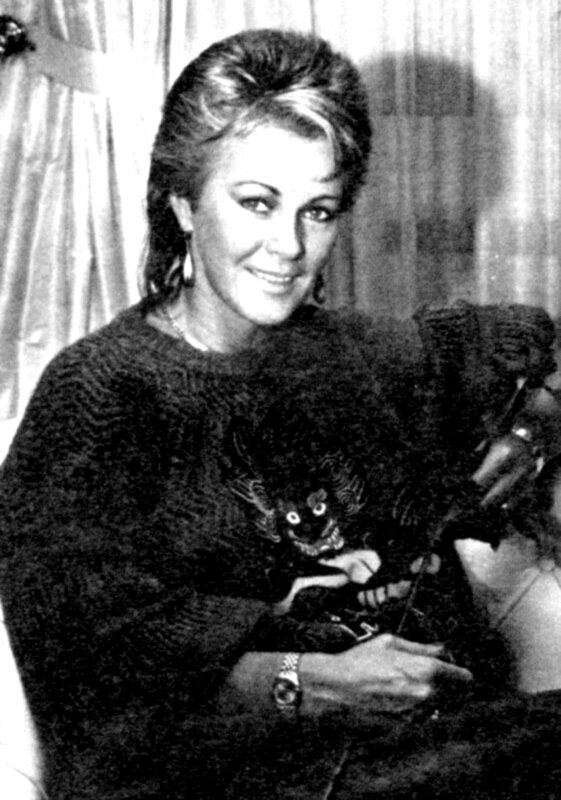 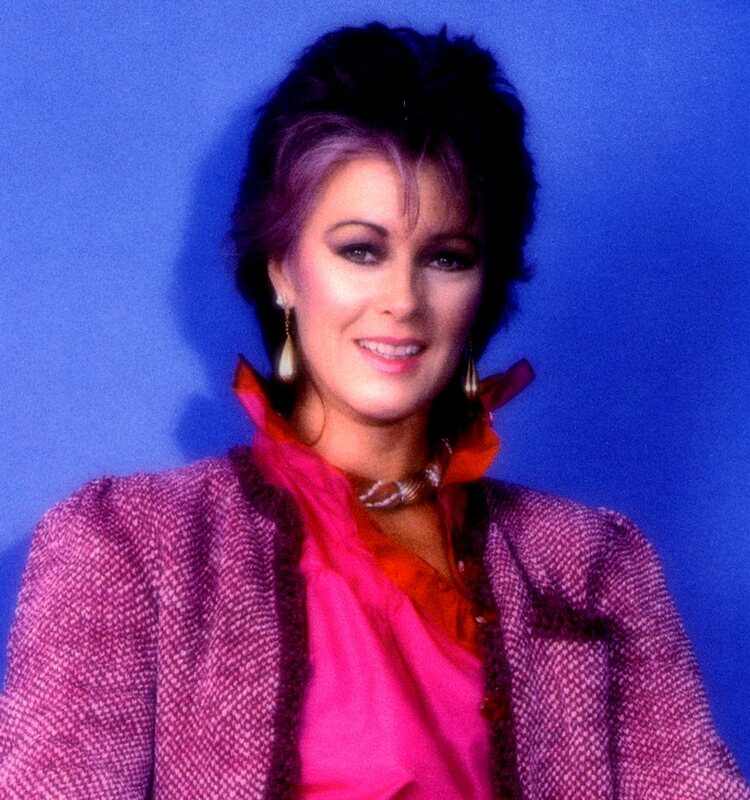 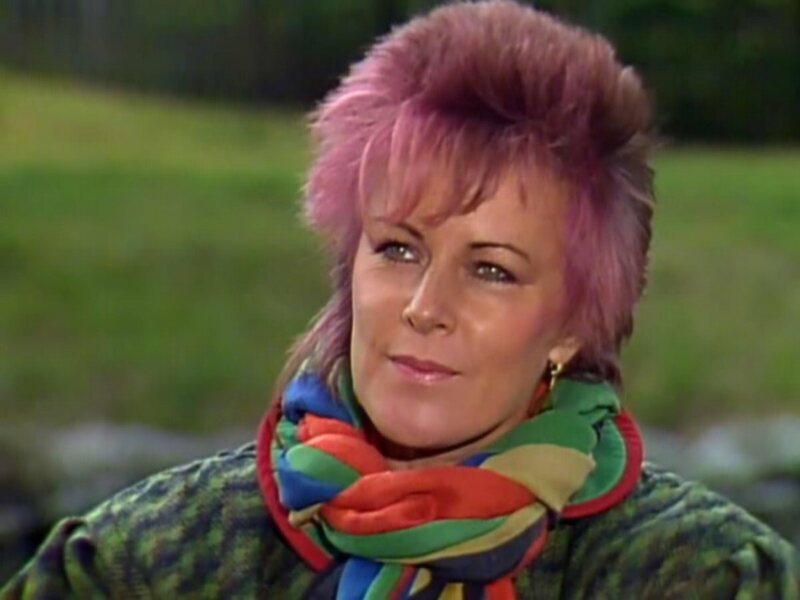 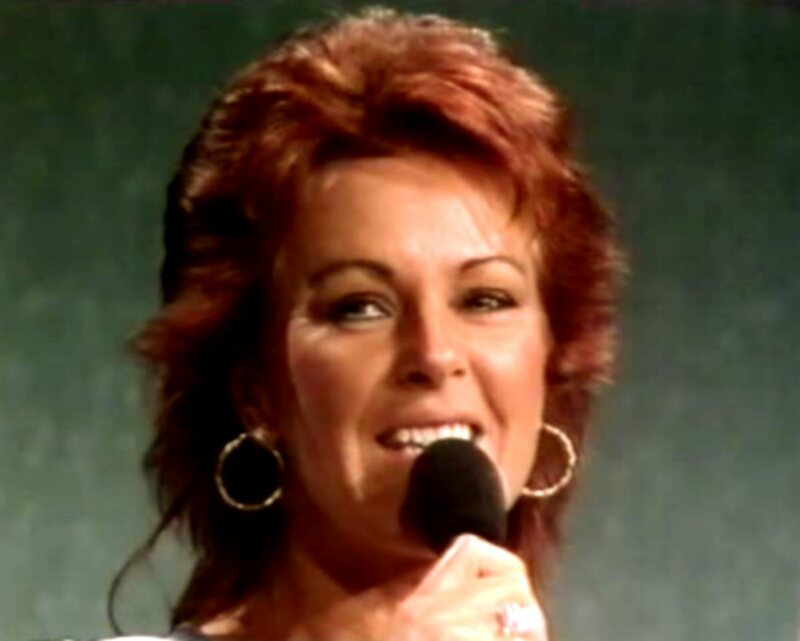 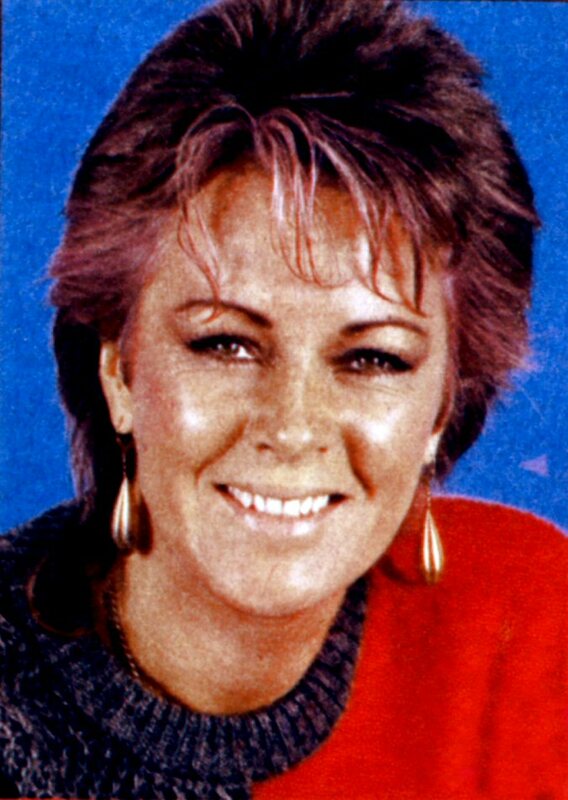 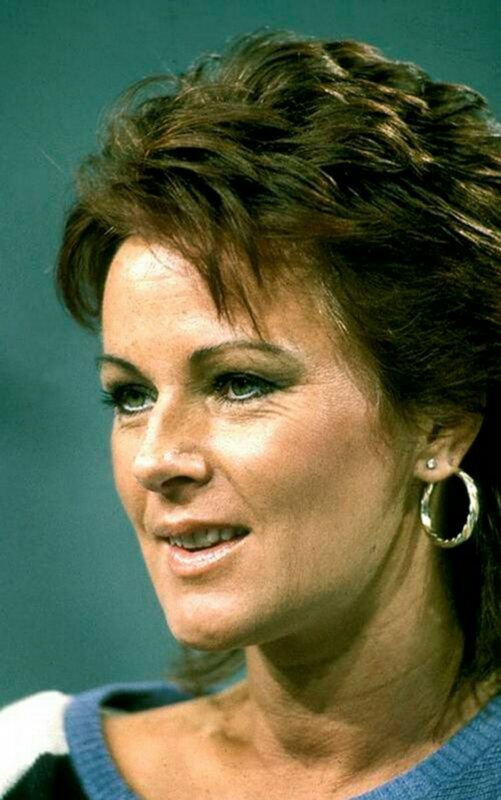 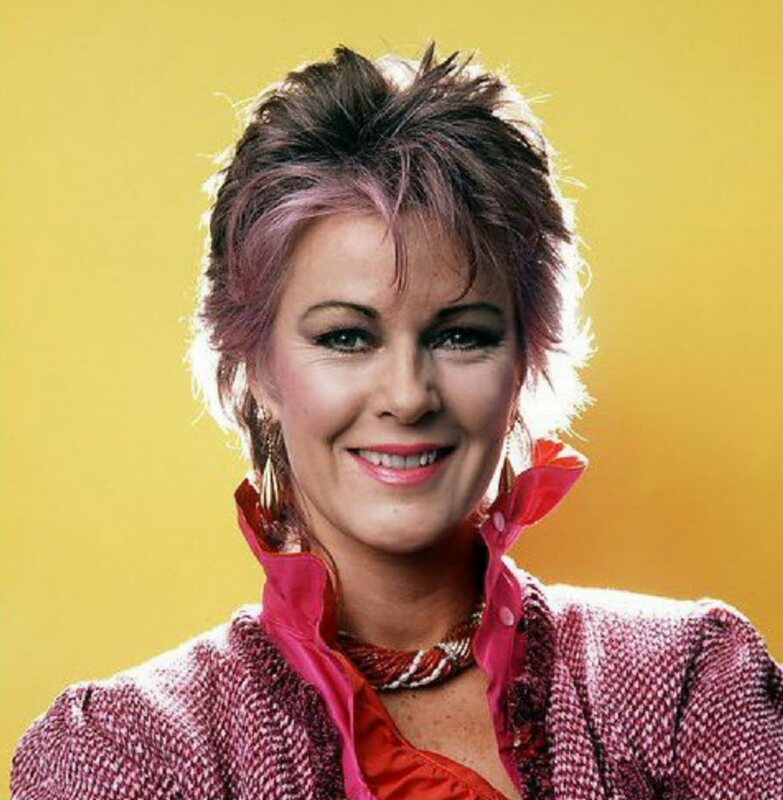 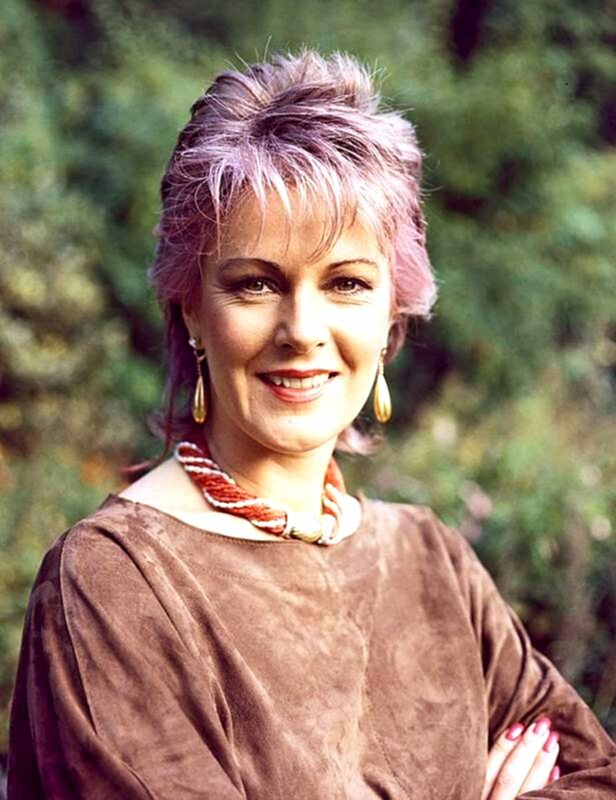 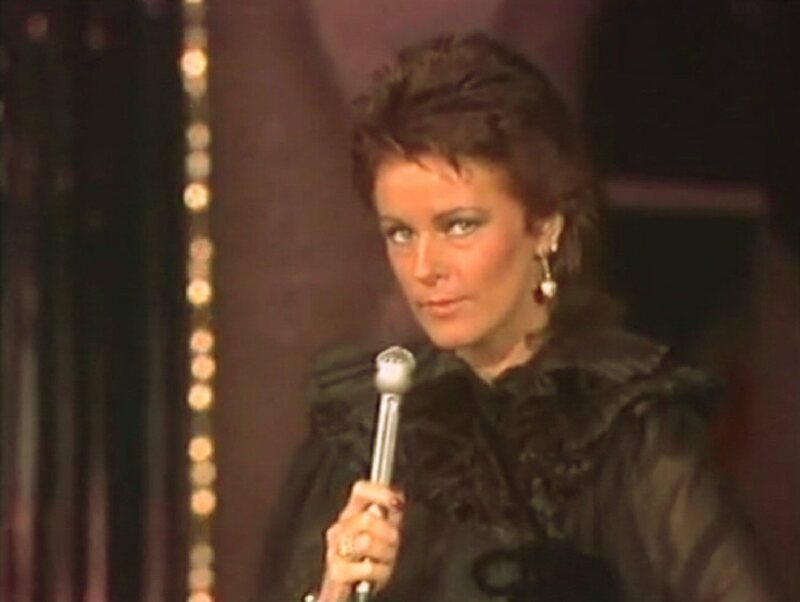 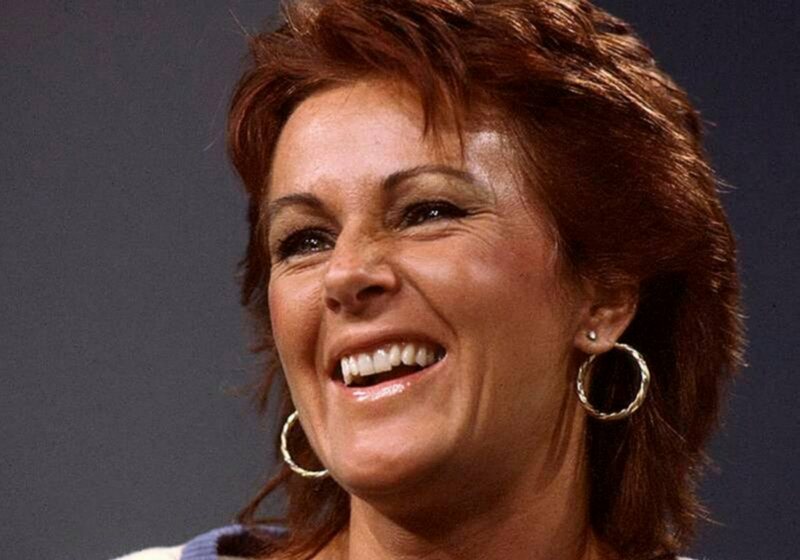 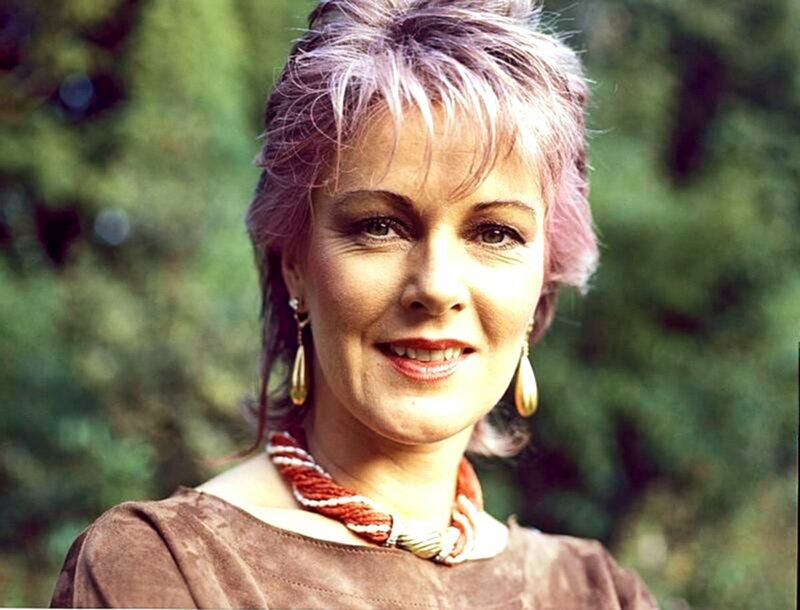 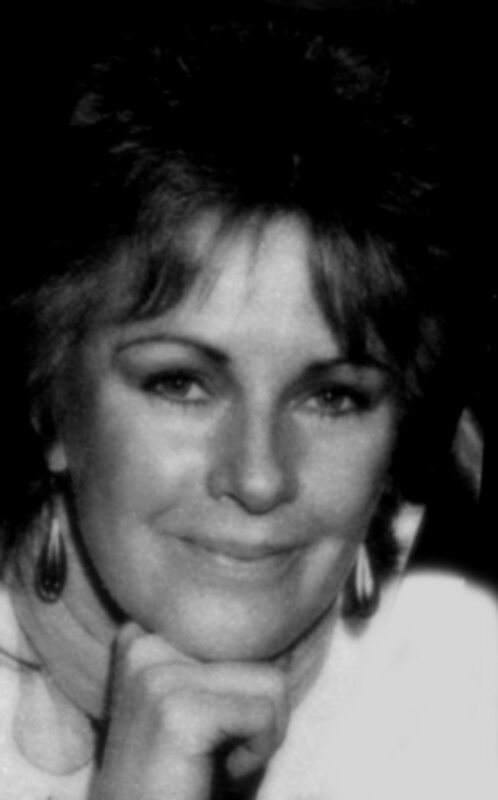 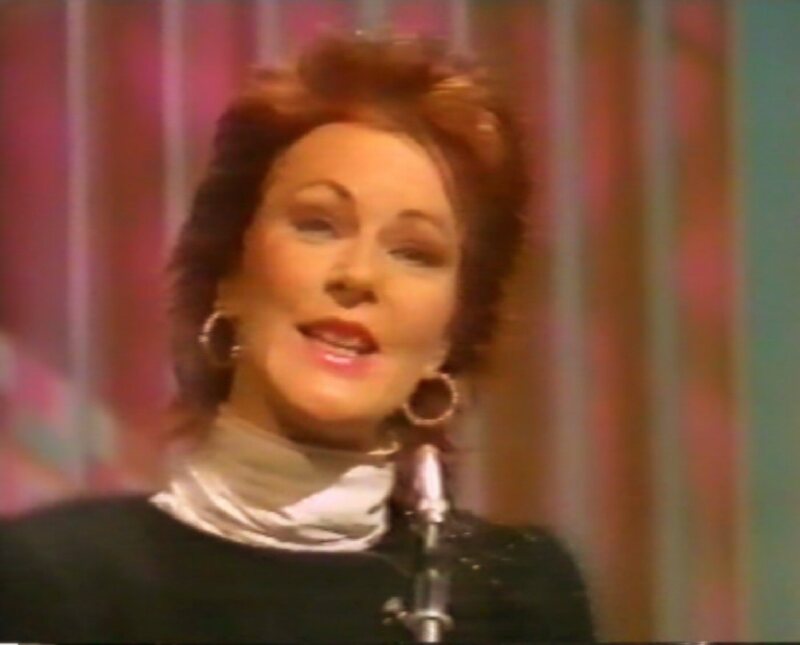 "Guest in my show was Anni-Frid Lyngstad, who has a strange first name and Norwegian surname as she comes from Norway. 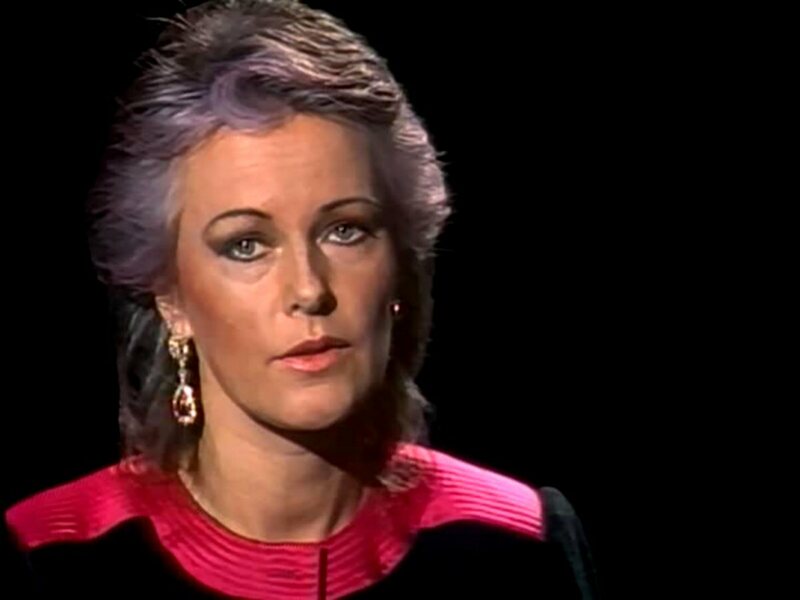 I knew that she would talk about it but I was really surprised when she started talking about her father, German soldier who was in Norway during under the Second World War and then he disappeared. 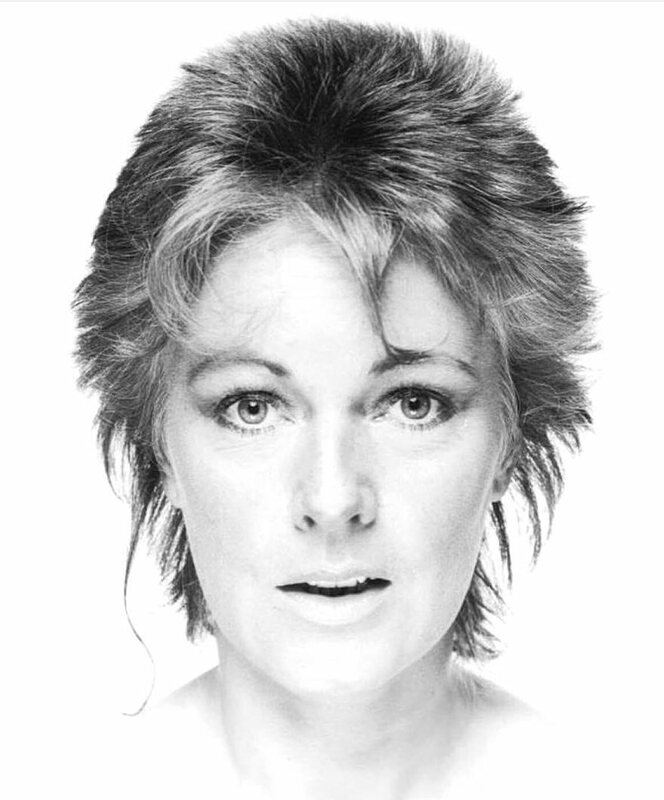 At the end of the war he went home to Germany and Anni-Frid did not hear from him. 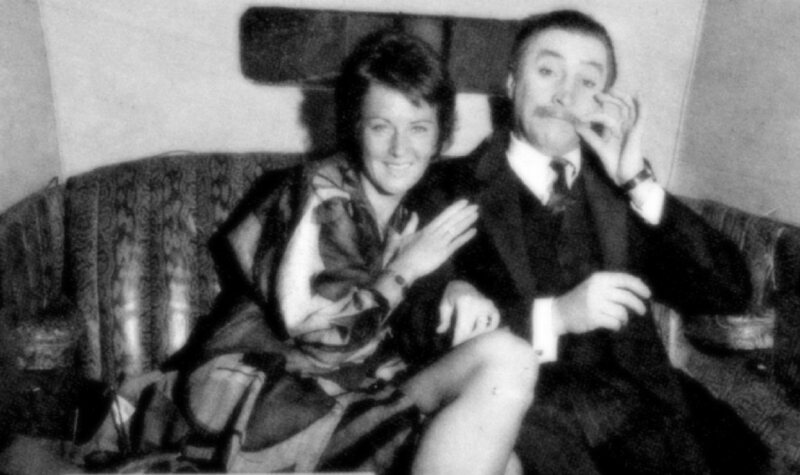 He did not know that he had a daughter until 30 years later when they met each other. 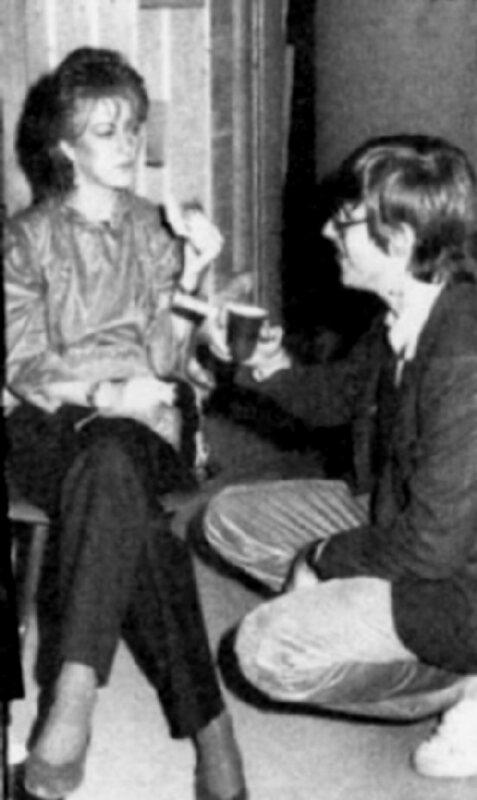 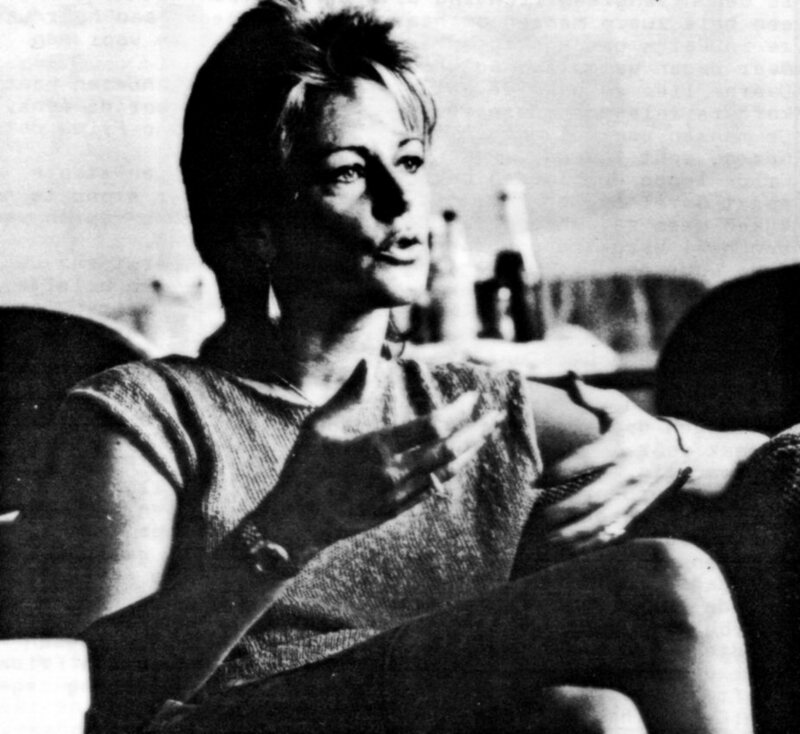 Anni-Frid was talking about the meeting which was both exciting and touching. 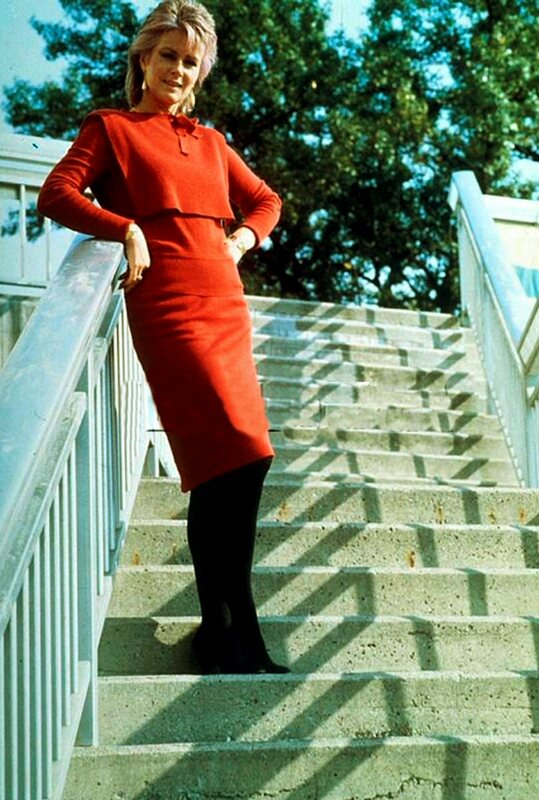 I also remember that she had a very strange skirt - a kind of balloon which looked like it could lift any time. 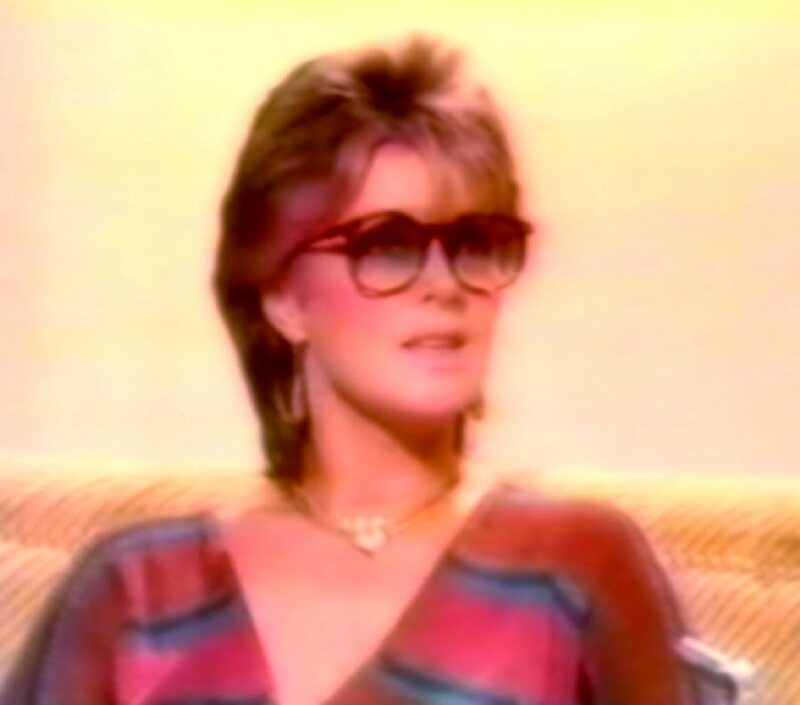 She had humor and intelligent answers. 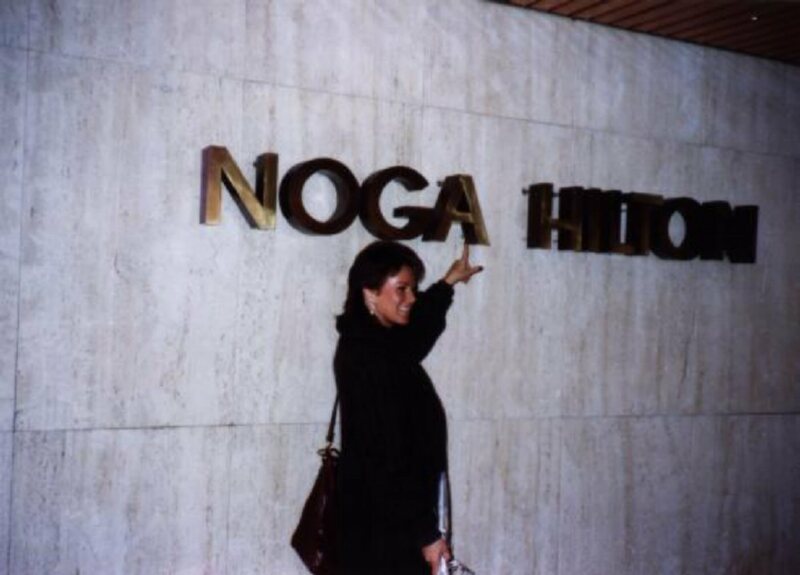 She was very self-confident. 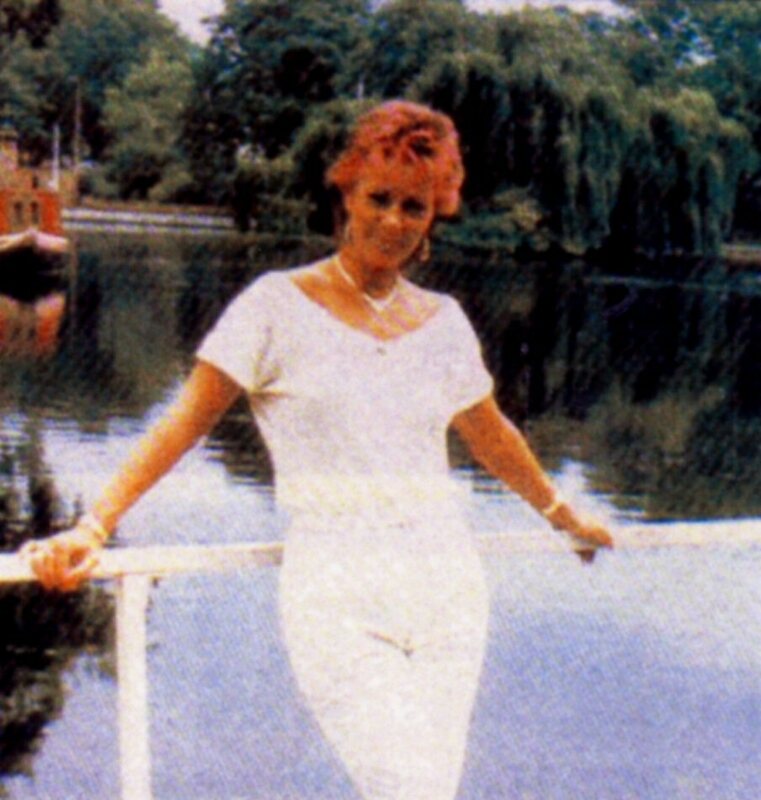 She had just travelled around the world promoting her first international solo album. 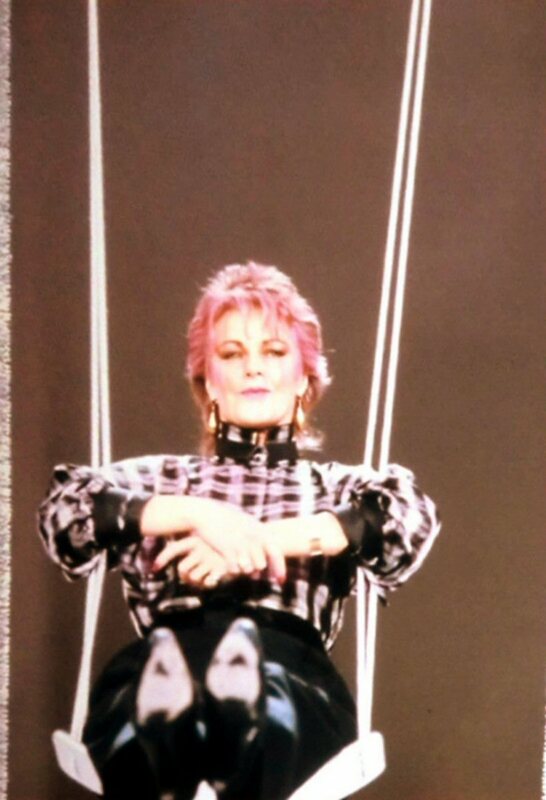 It was fun that she wanted to ask my strange questions as well as to do strange things in the studio. 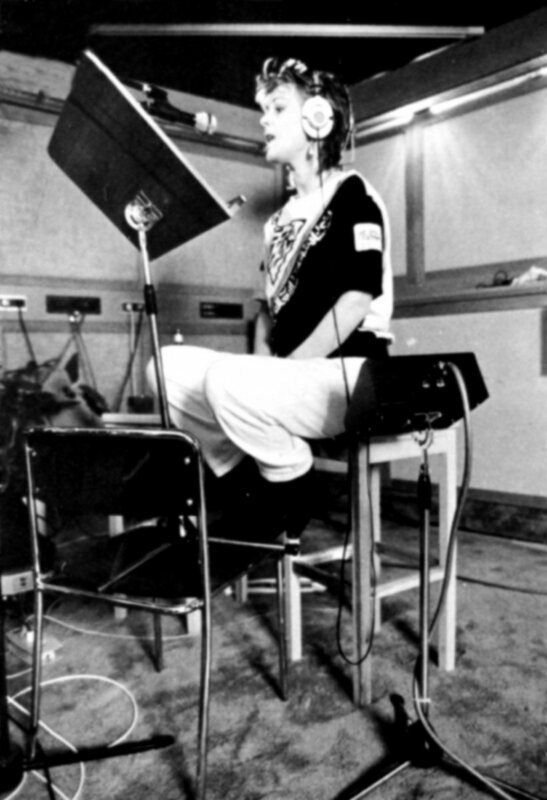 She sang as well and she sounded very good without complicated backgrounds." 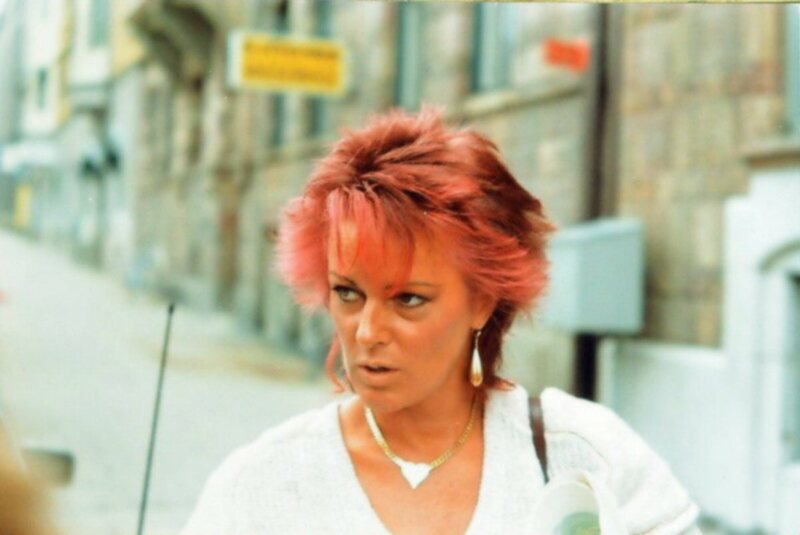 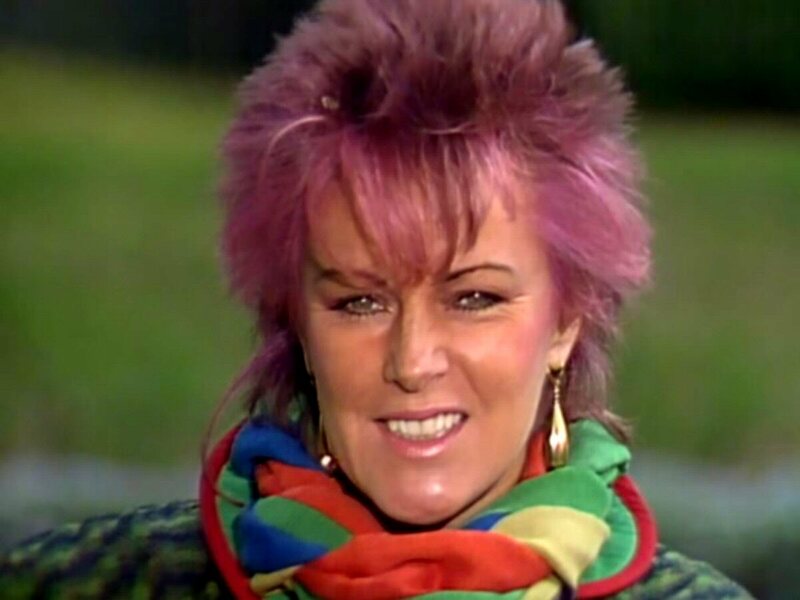 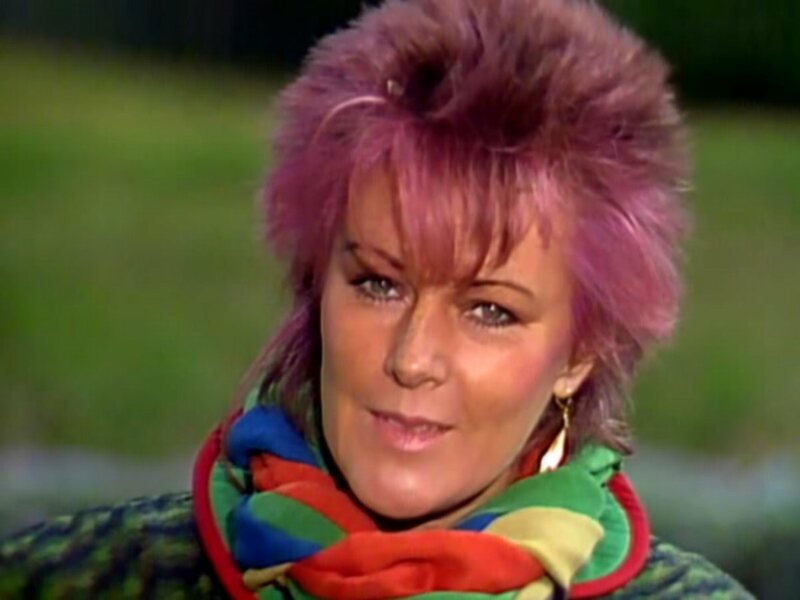 In summer and autumn 1983 Frida worked as an actress during filming of an episode film "Jokerfejs" (The Joker face) co-written by Swedish comedian Magnus Härenstam. 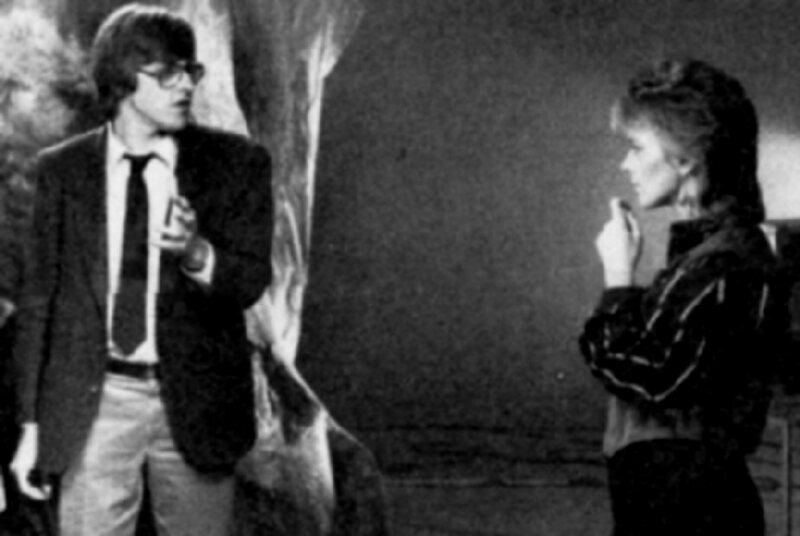 The film's length was 61 minutes and it contained 12 funny stories/sketches. 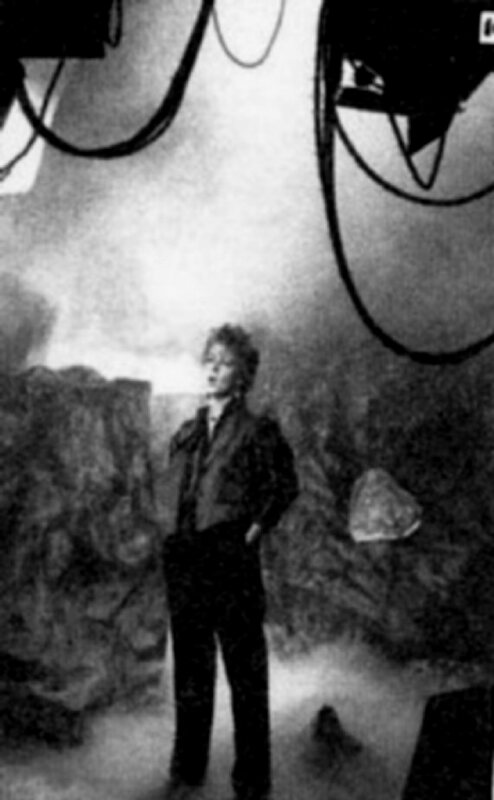 "Jokerfejs" had its premiere in Stockholm on February 10th 1984. 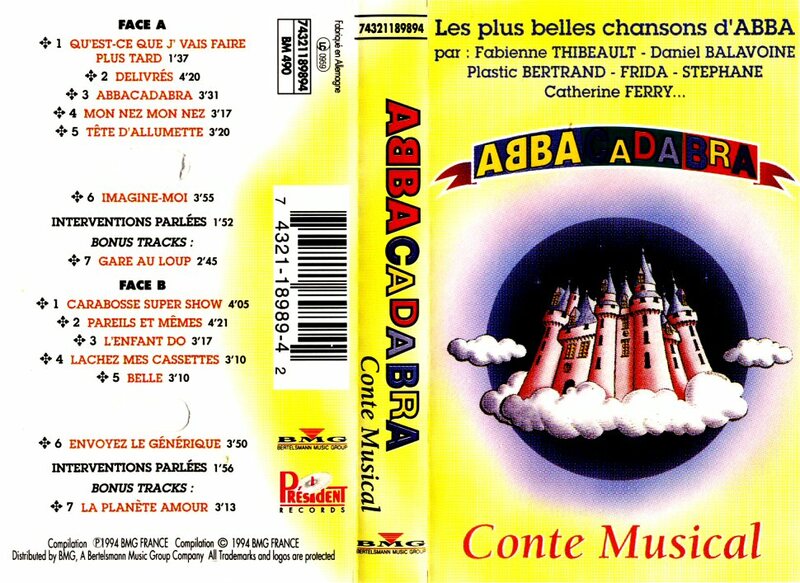 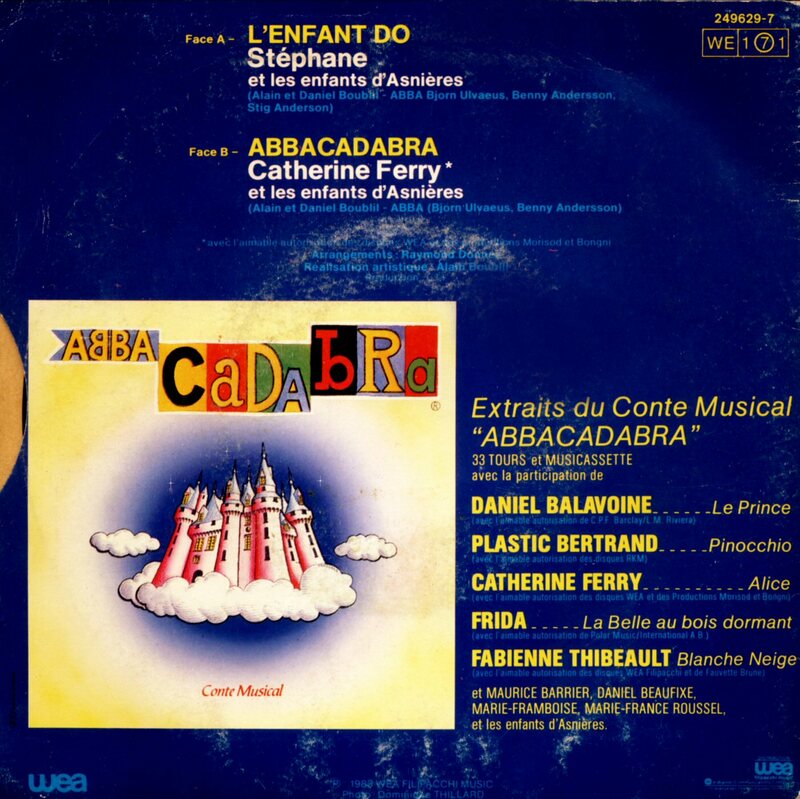 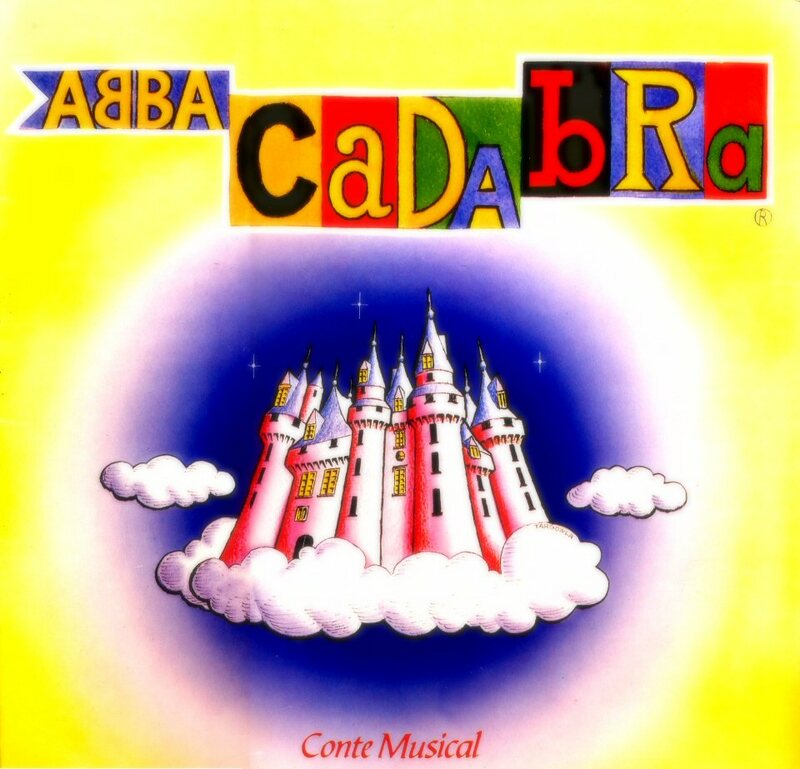 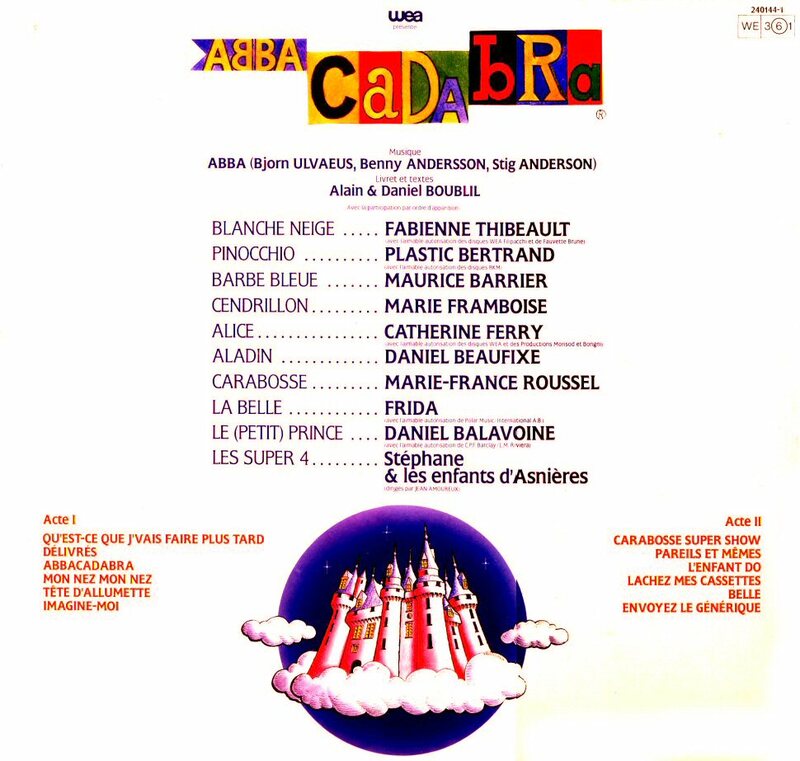 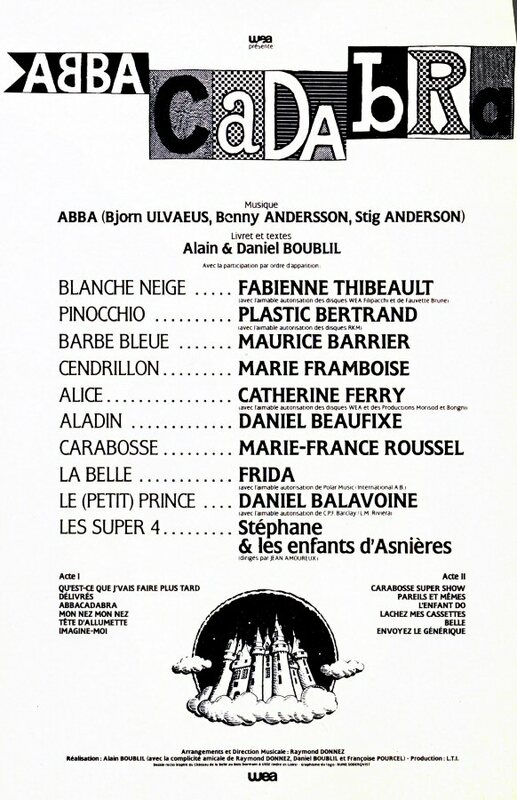 The idea of using ABBA's music for a fairy-tale musical came from the group's representatives in France and Belgium - Alain Boublil and Roland Kruger. 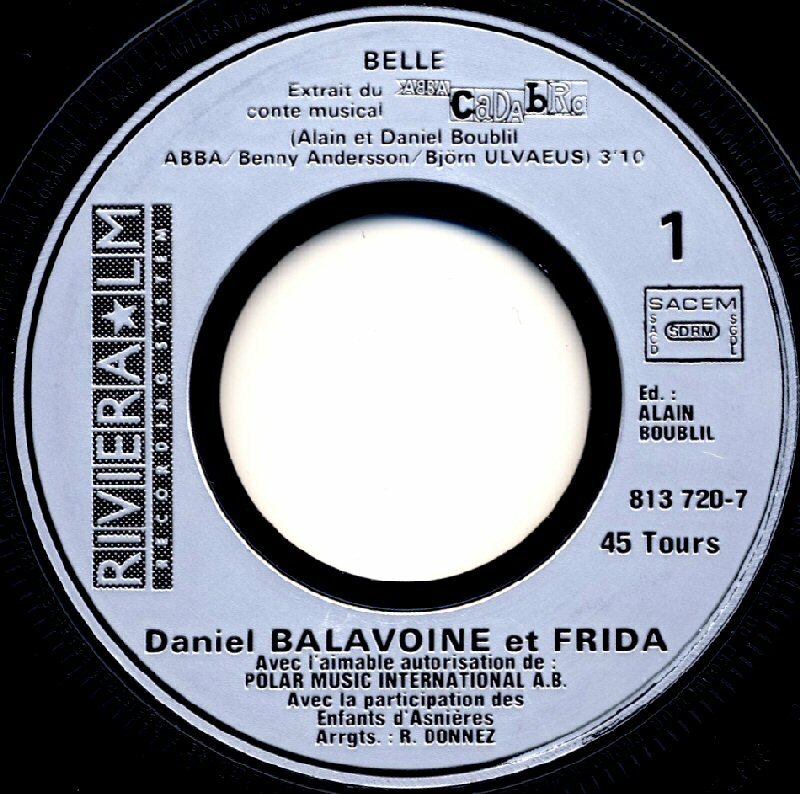 Alain drafted in writer Daniel Boublil (no relation) to help him write new lyrics and as Alain was already well known in France for his production of two previous musicals - "Les Miserables" and "La Revolution Francaise" the attention of the French public was virtually guaranteed. 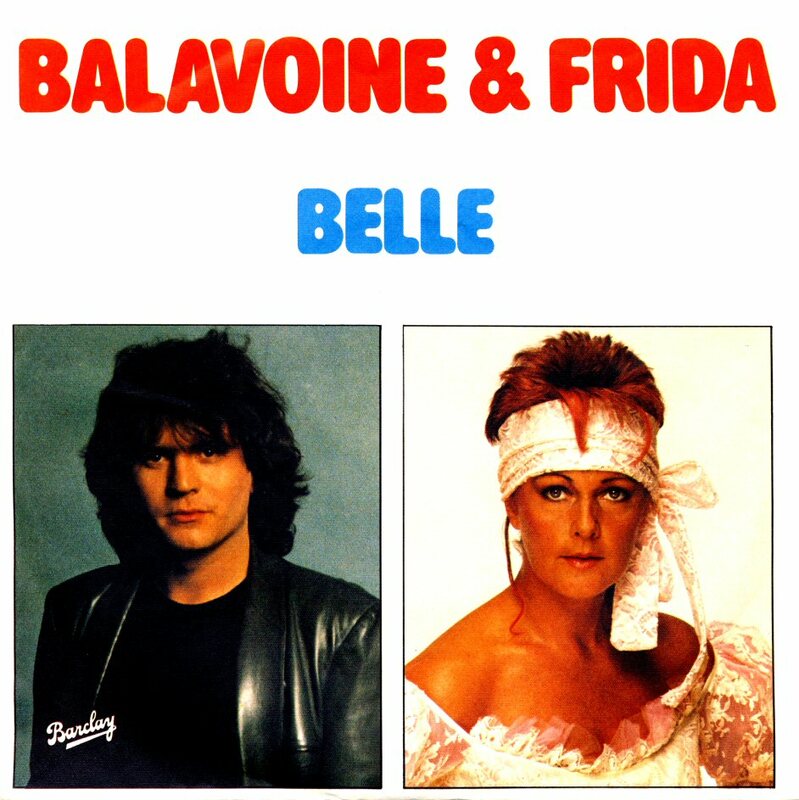 The single "Belle" featuring Frida and Daniel Balavoine was quite successful in France where it the hit chart in December 1983 reaching #15. 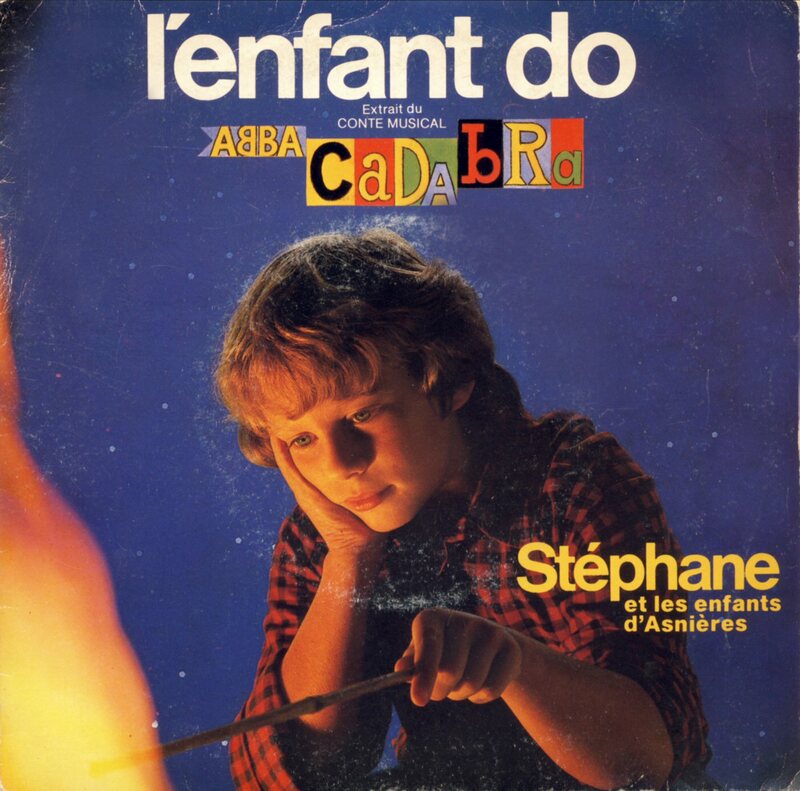 Another single promoting the album was "L'enfant do" (Fernando) b/w "Abbacadabra" (Take a Chance On Me). 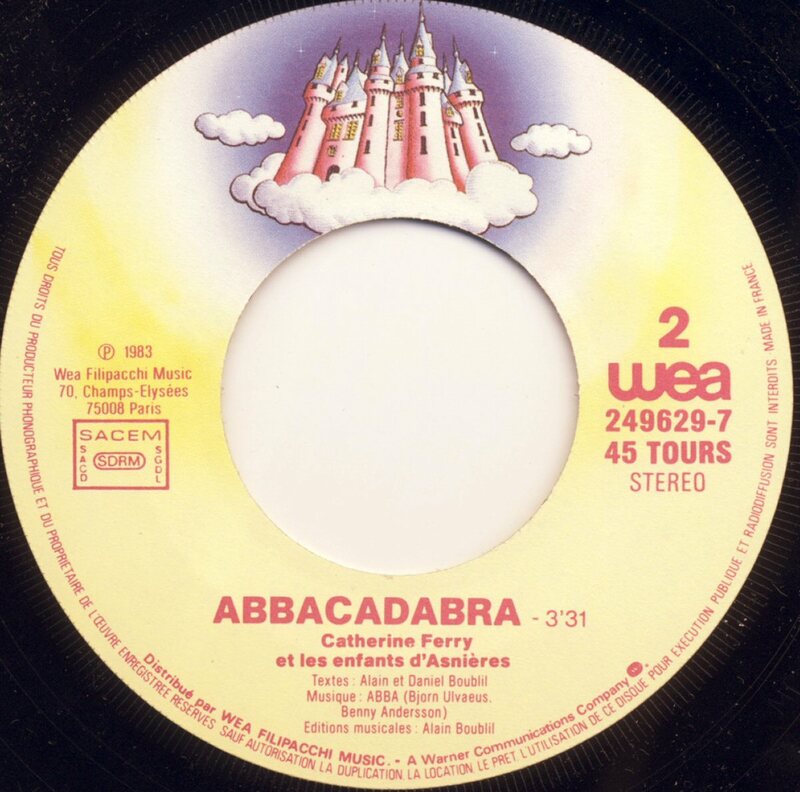 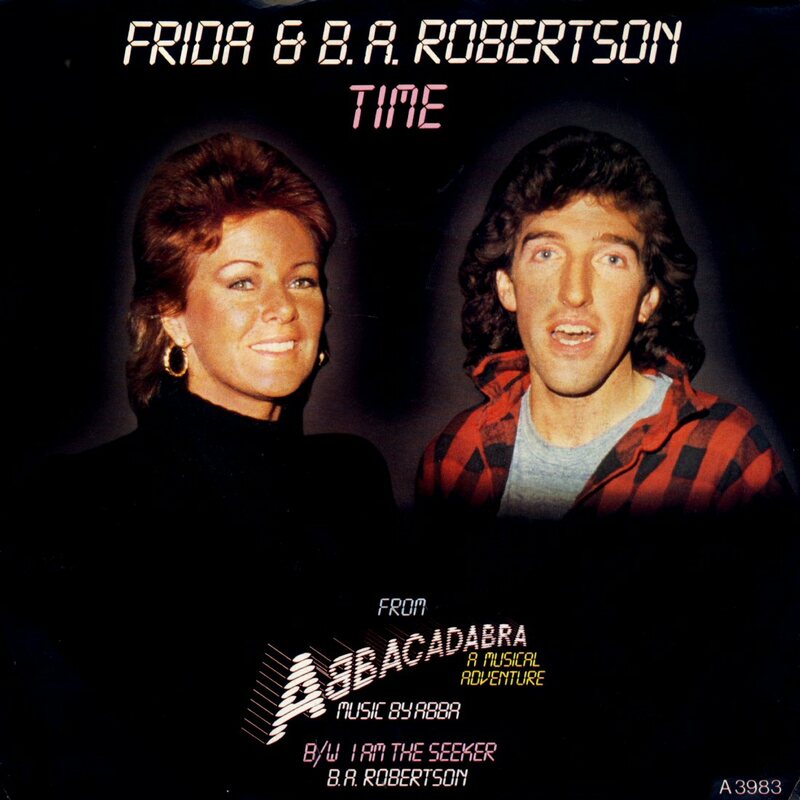 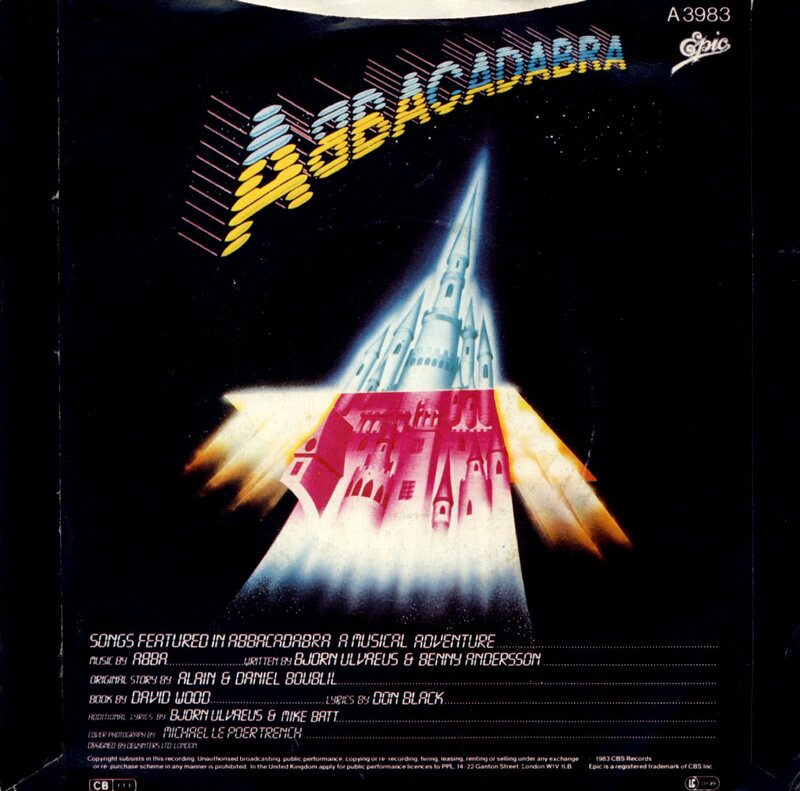 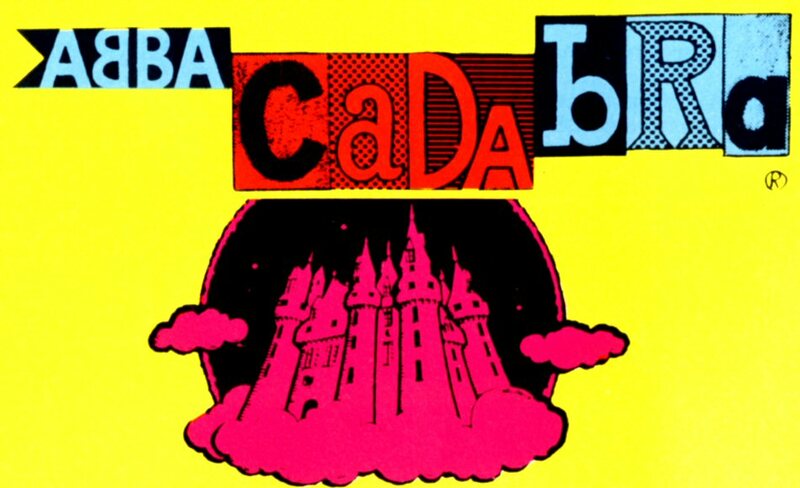 The album "Abbacadabra" was released in France in 1983. 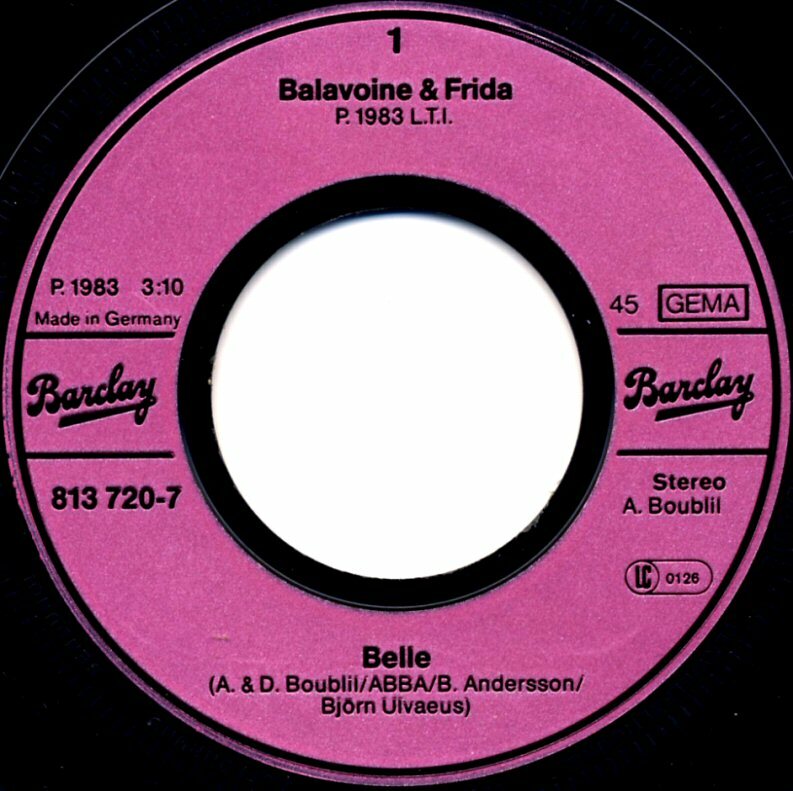 The first 1983 edition of the album featured 12 songs including "Belle" with Frida and Balavoine. 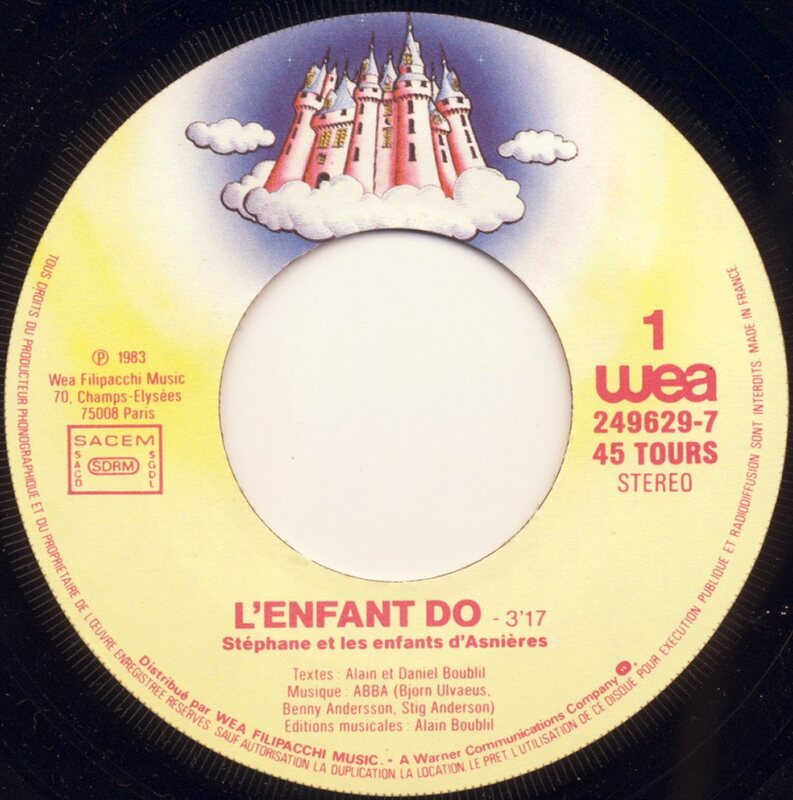 A new edition of the album which was released one year later contained even two bonus tracks: "Gare au loup" (Waterloo) and "La planete amour" (Lay All Your Love On Me) which had been recorded in 1984. 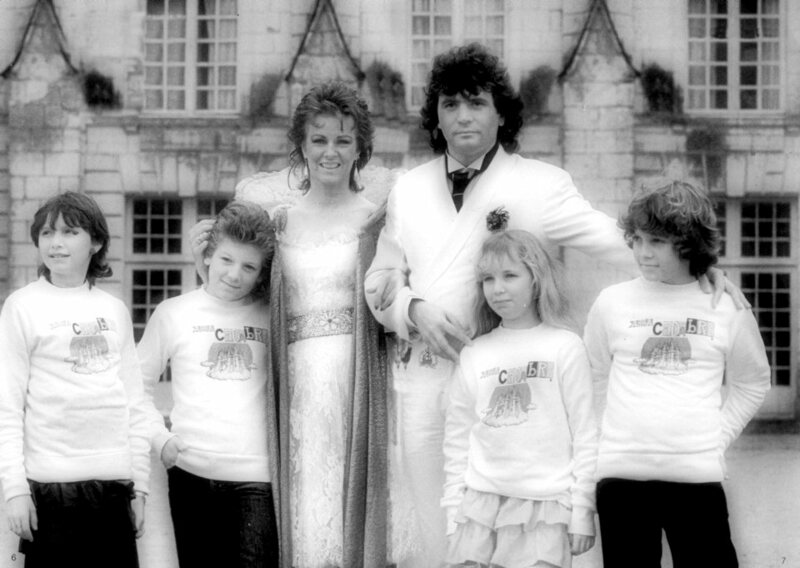 Promotional video was filmed at the Castle of Ussé in the western France. 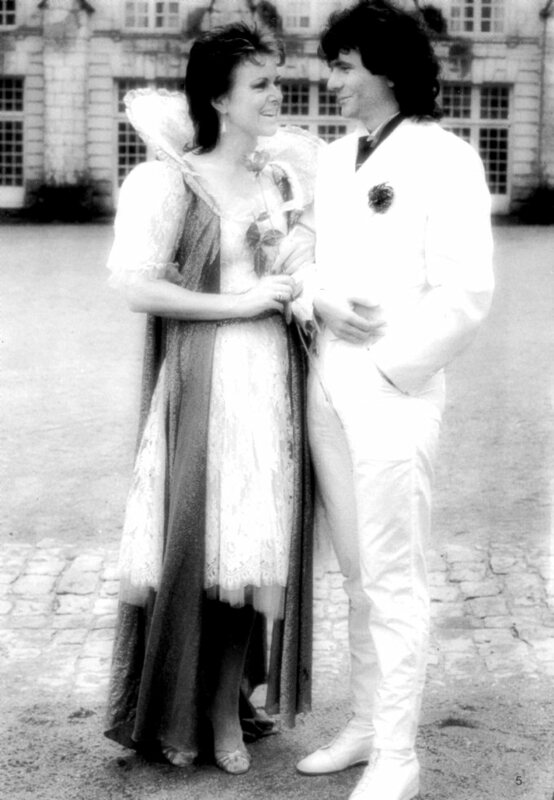 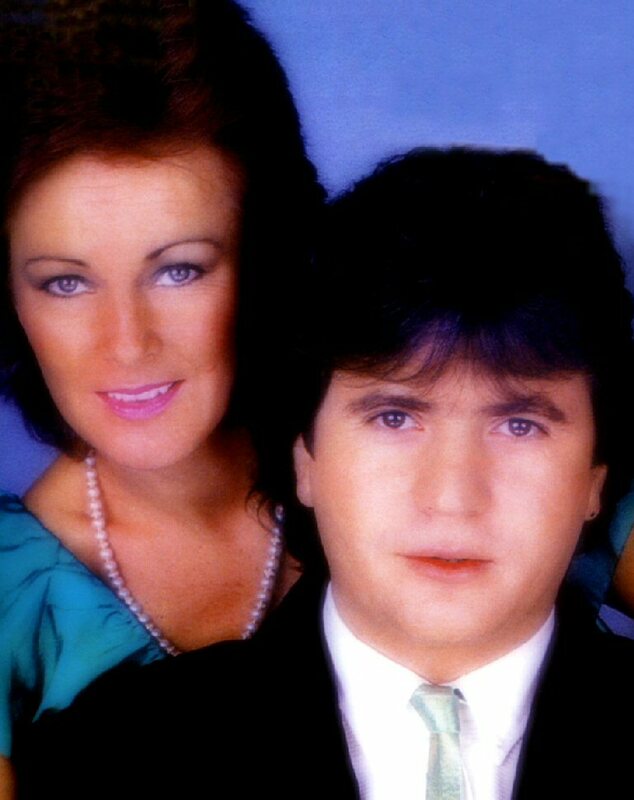 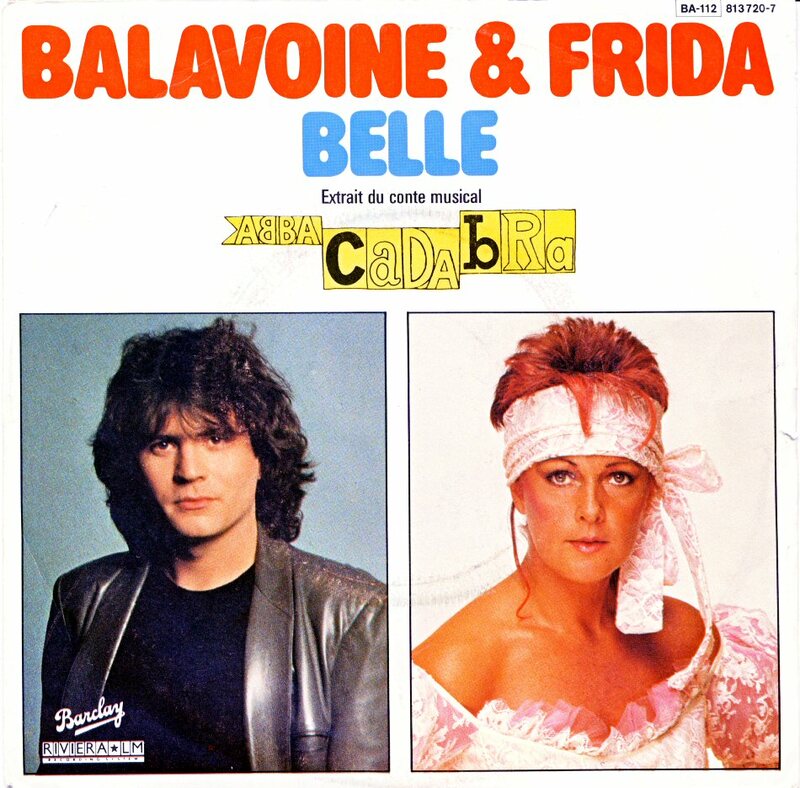 Frida and Daniel Balavoine promoted the single in the TV show Champs-Elysées which was broadcasted on 17 September 1983. 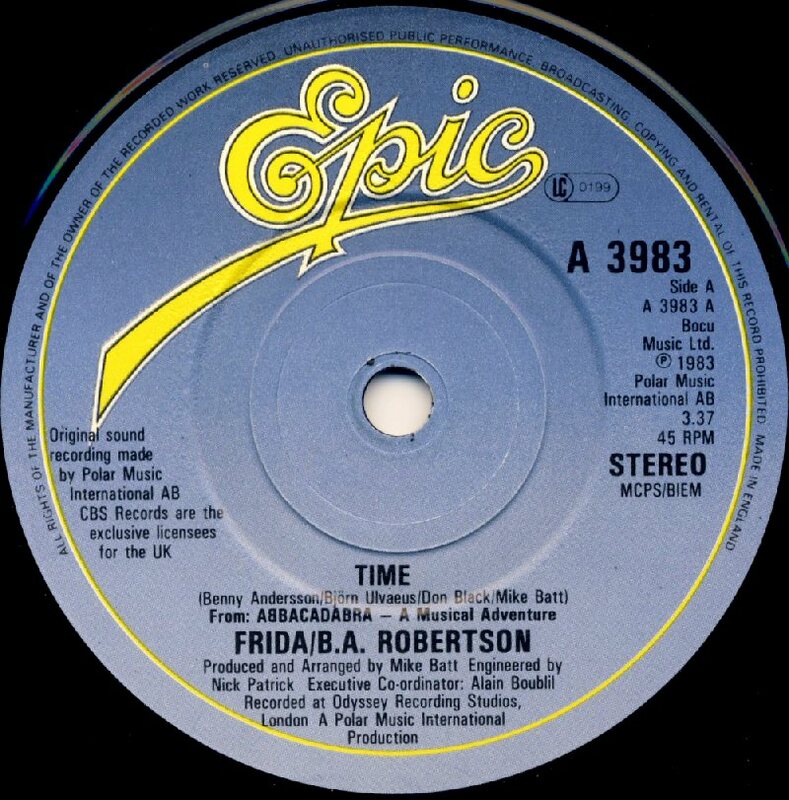 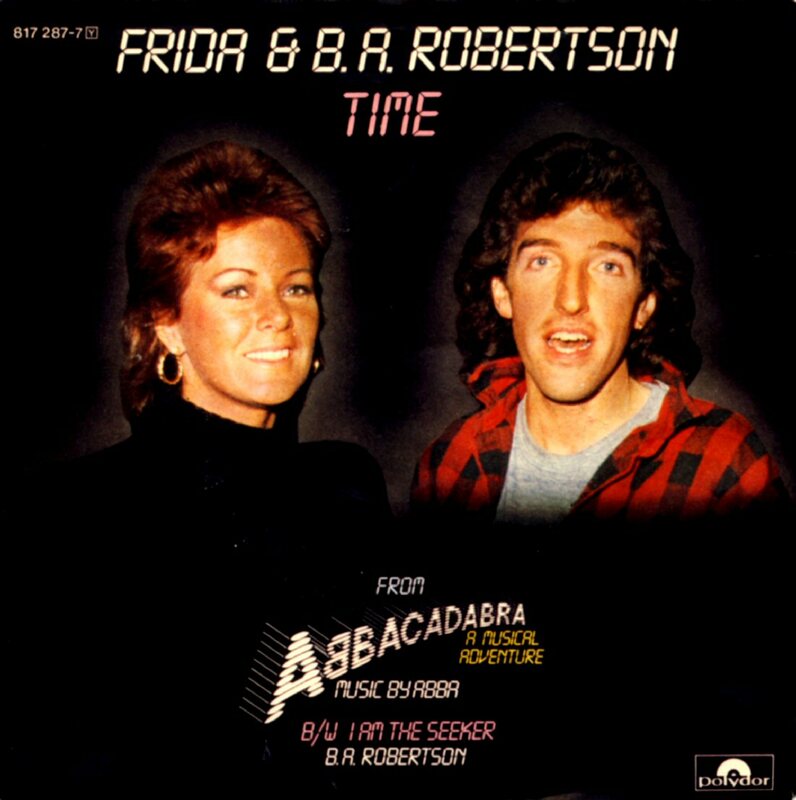 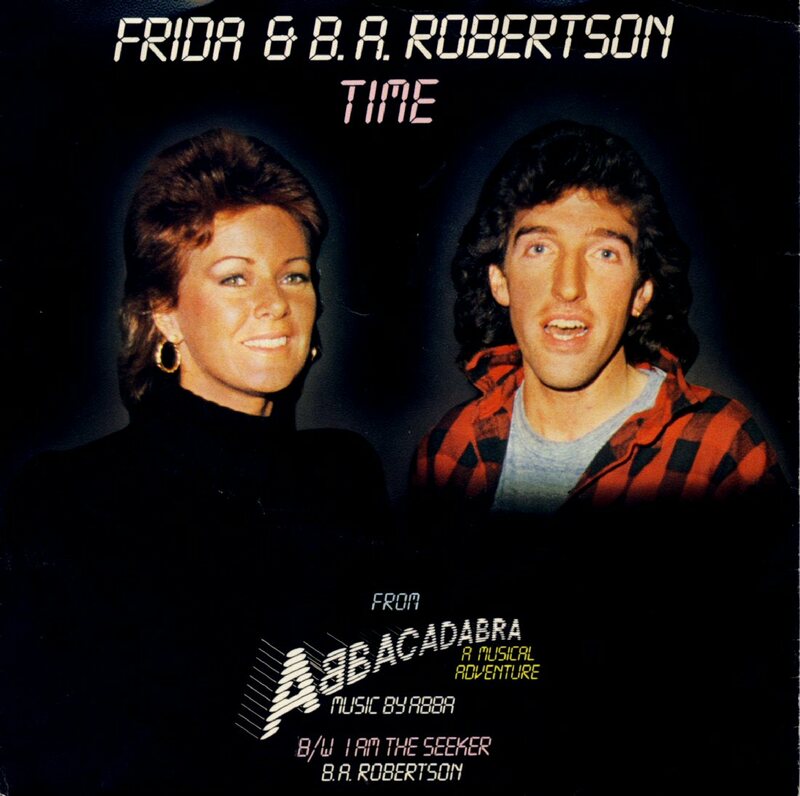 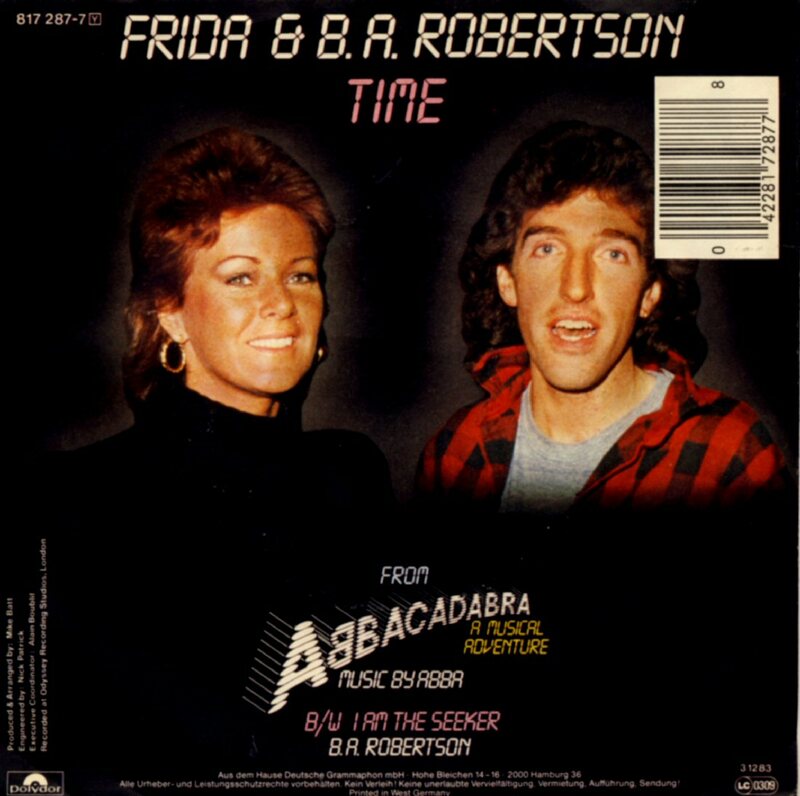 The single "Time" featuring Frida and B.A. 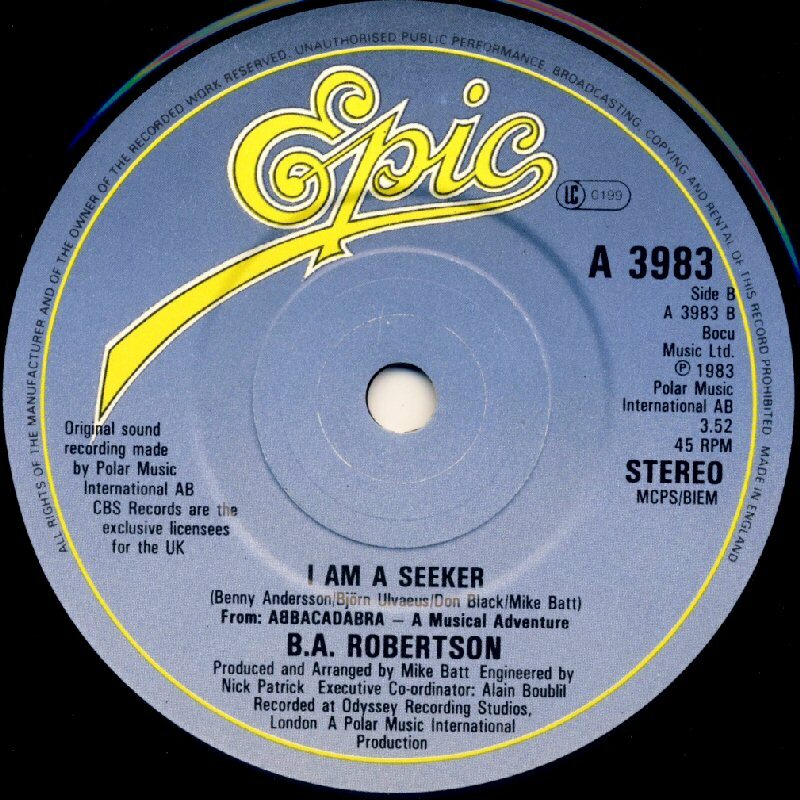 Robertsson entered the British chart on 17 December 1983 where it stayed for 5 weeks reaching #45. 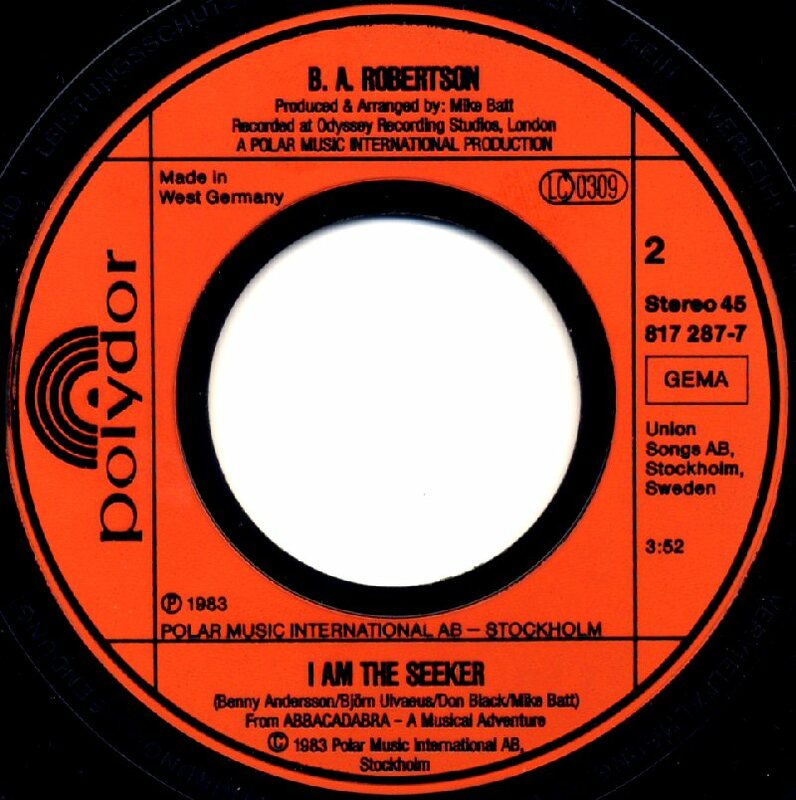 "I Am The Seeker" performed by B.A. 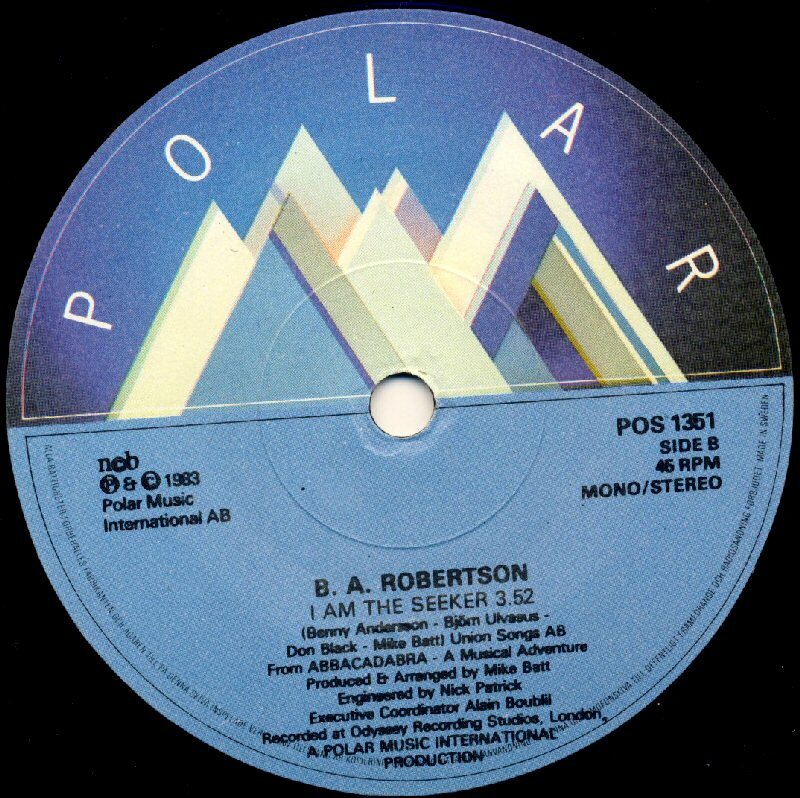 Robertsson on the B side was a new song written by Björn and Benny. 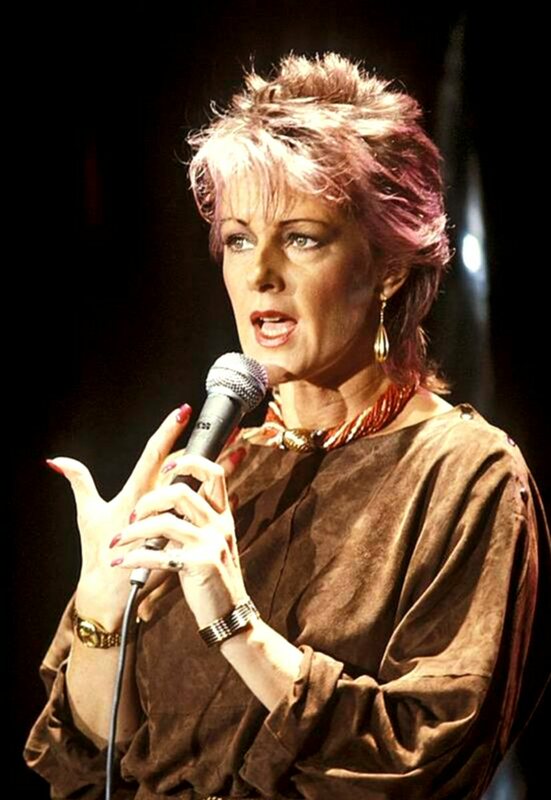 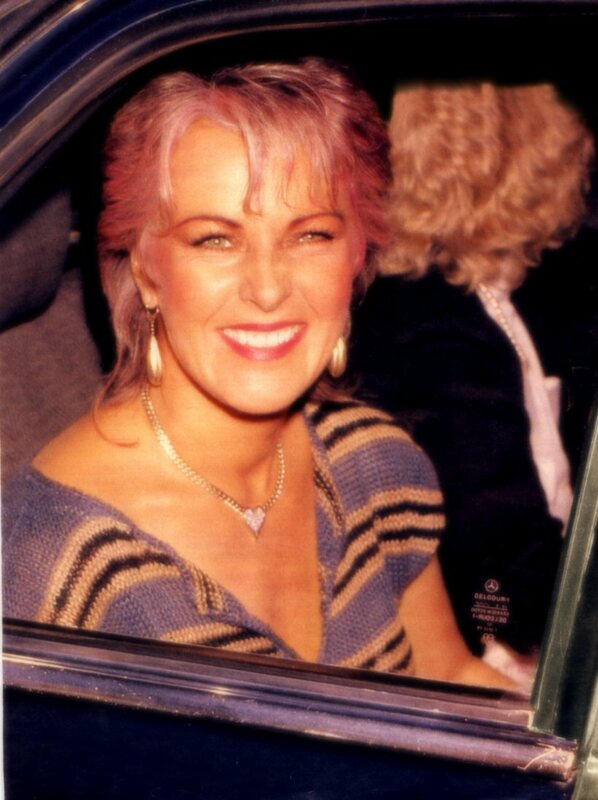 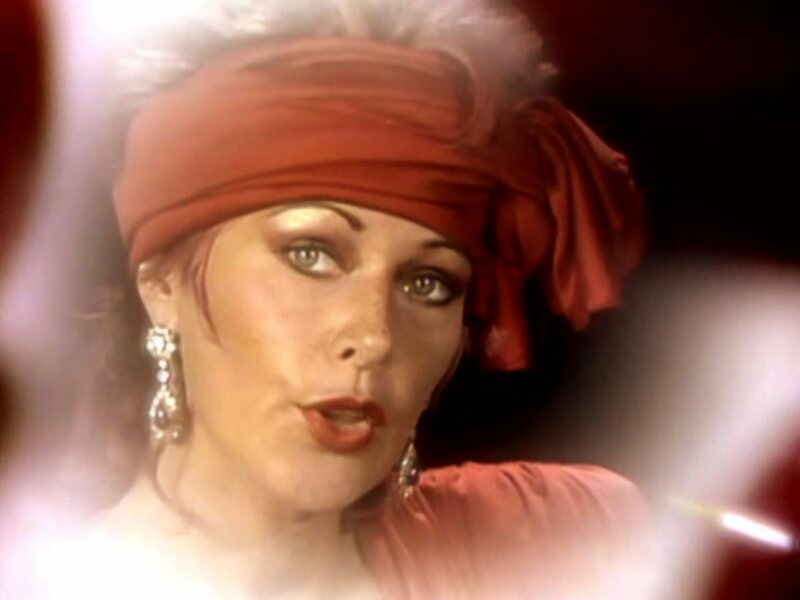 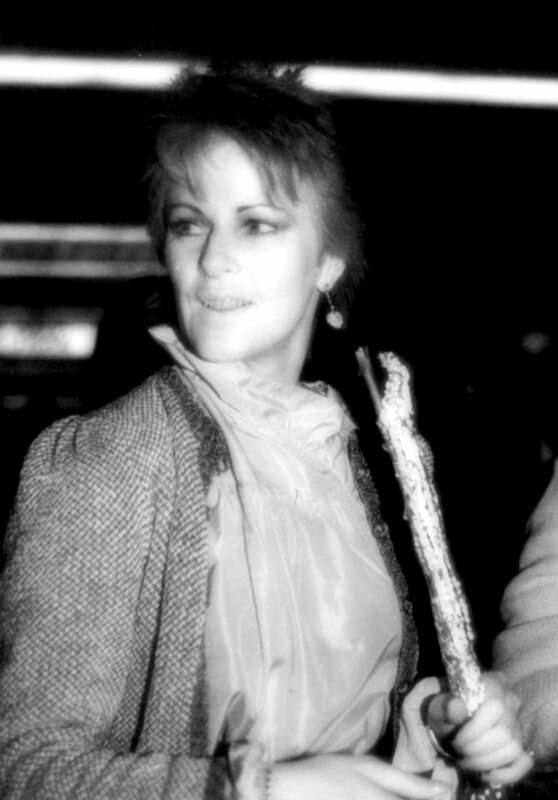 No LP release was planned in Great Britain but one more single "Like An Image Passing By" featured Elaine Paige would be released later in 1984. 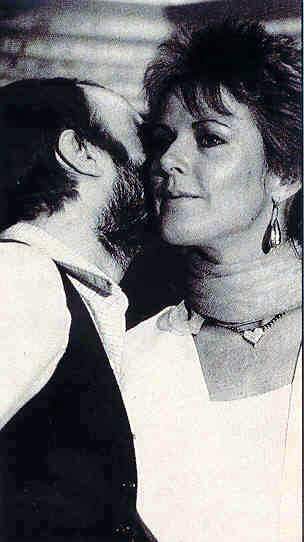 Frida and B.A. 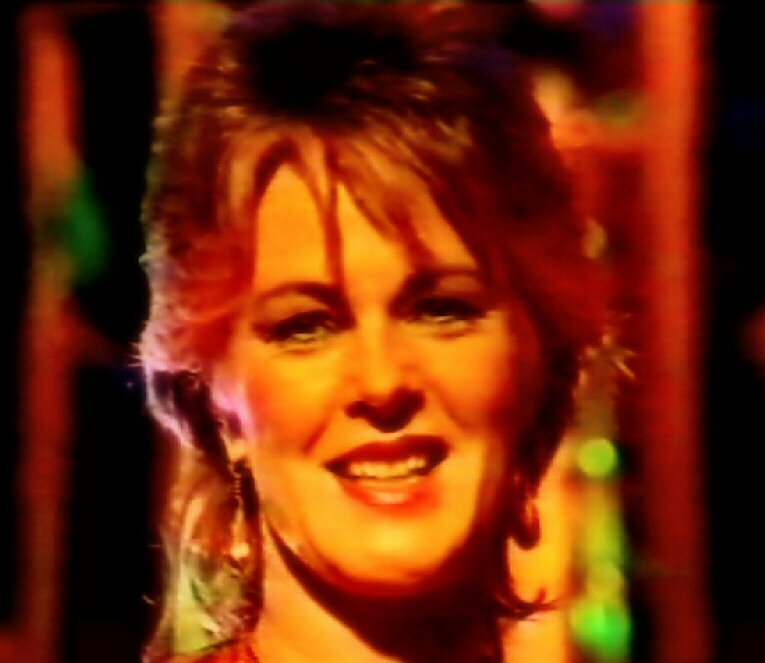 made some TV promotion for the single in the UK. 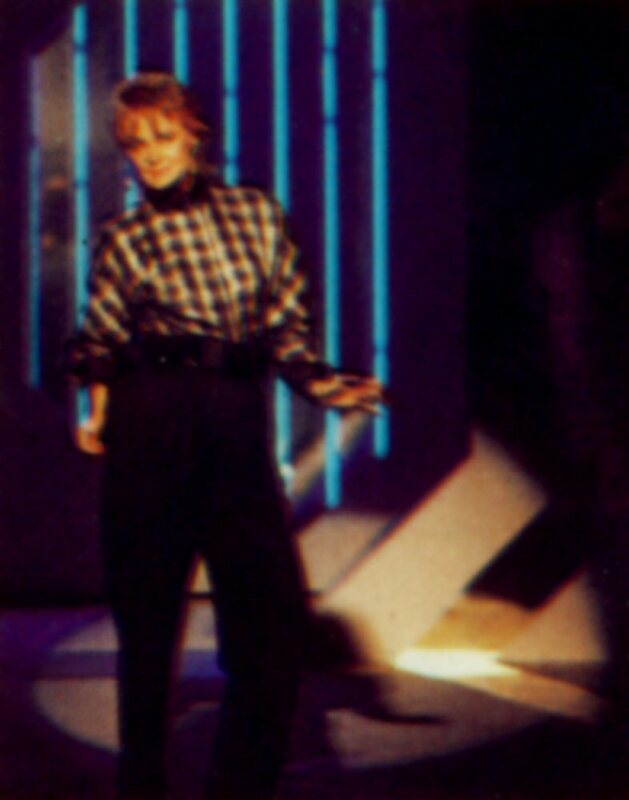 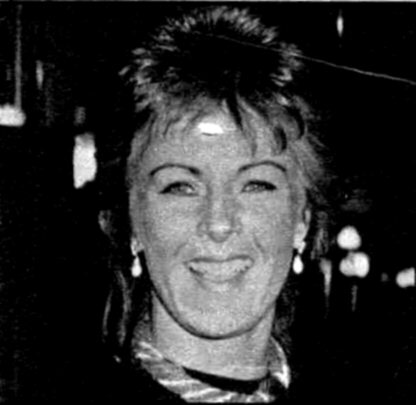 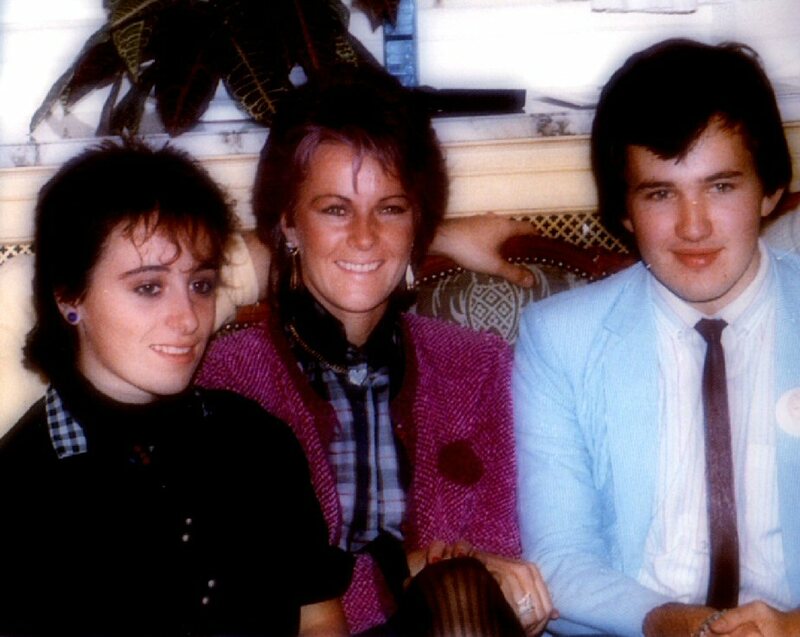 Among others they appeared in the Russell Harty Show in the UK in November 1983. 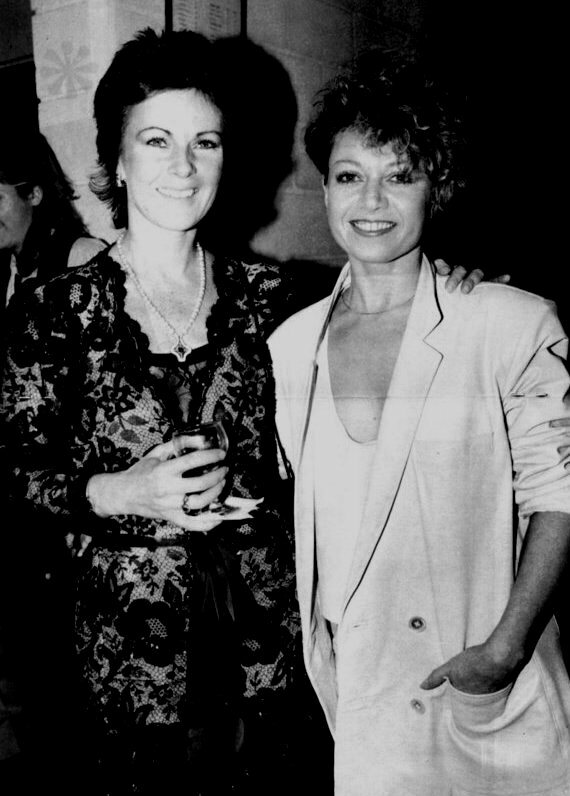 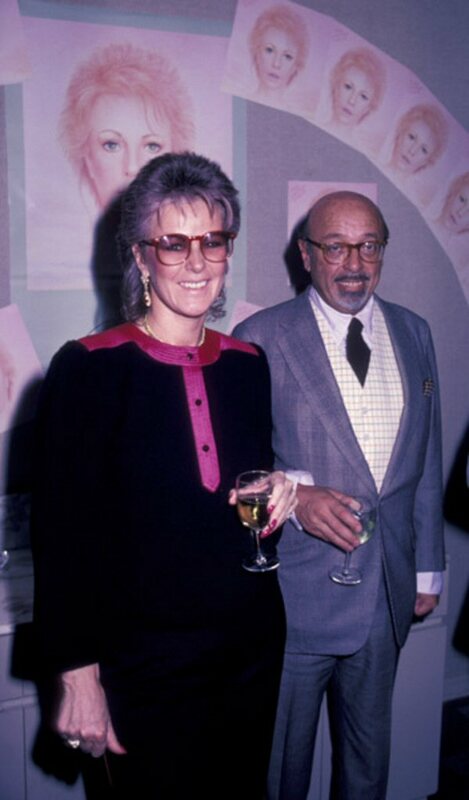 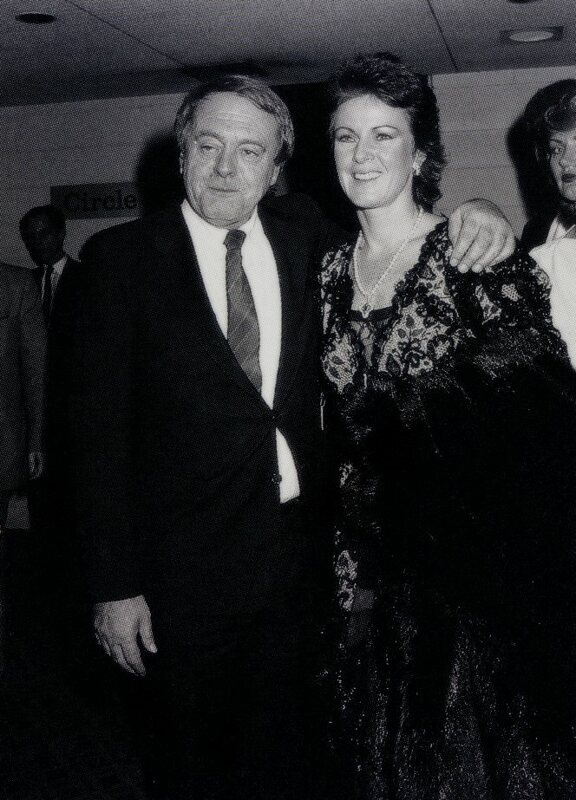 In the middle of December 1983 Frida with her friend Bertil Hjert and Stikkan Anderson attended the premiere of "Abbacadabra" at the Lyric Theatre in London. 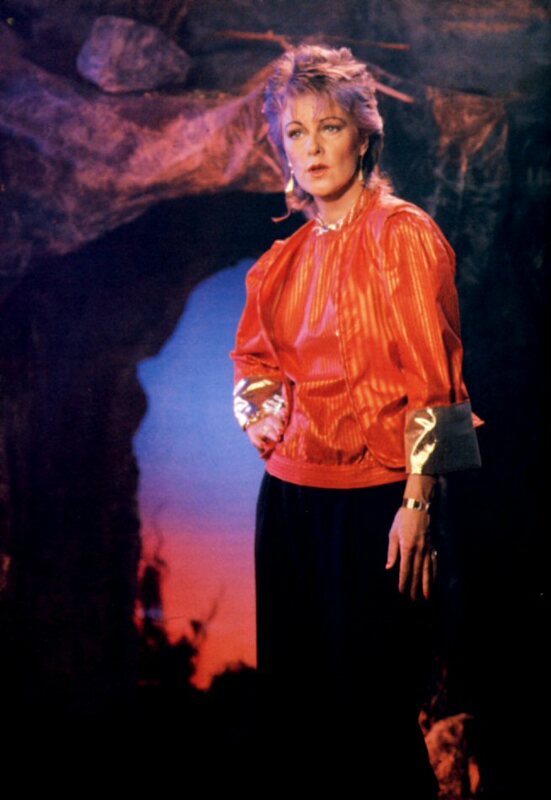 The musical ran only one month.